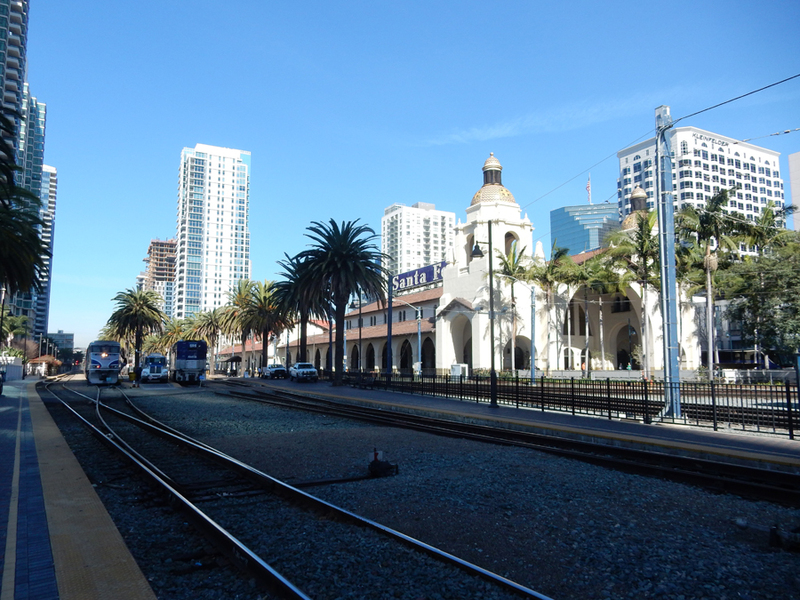 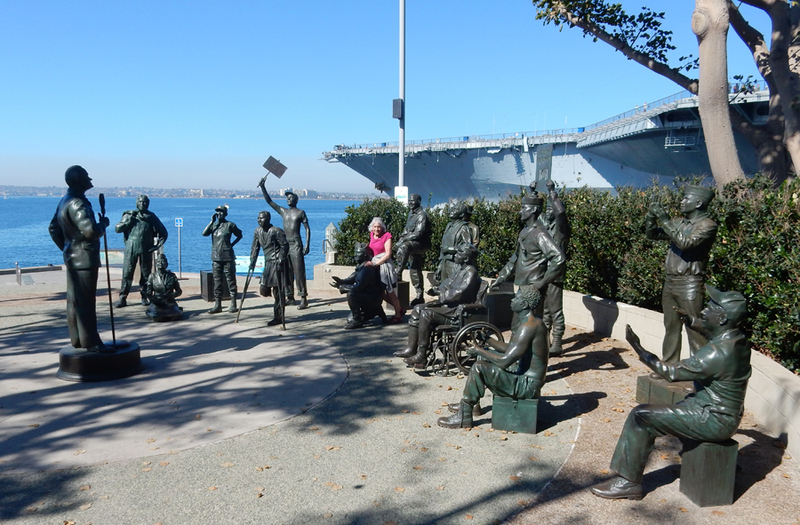 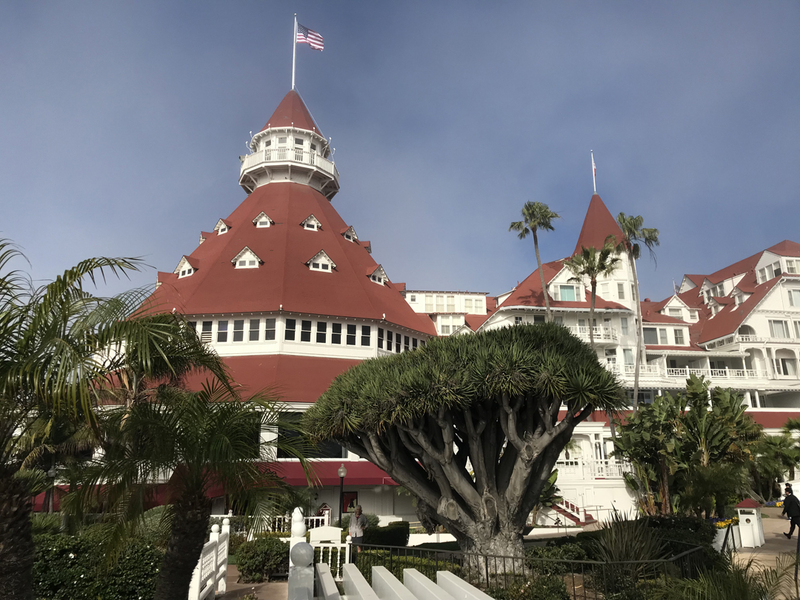 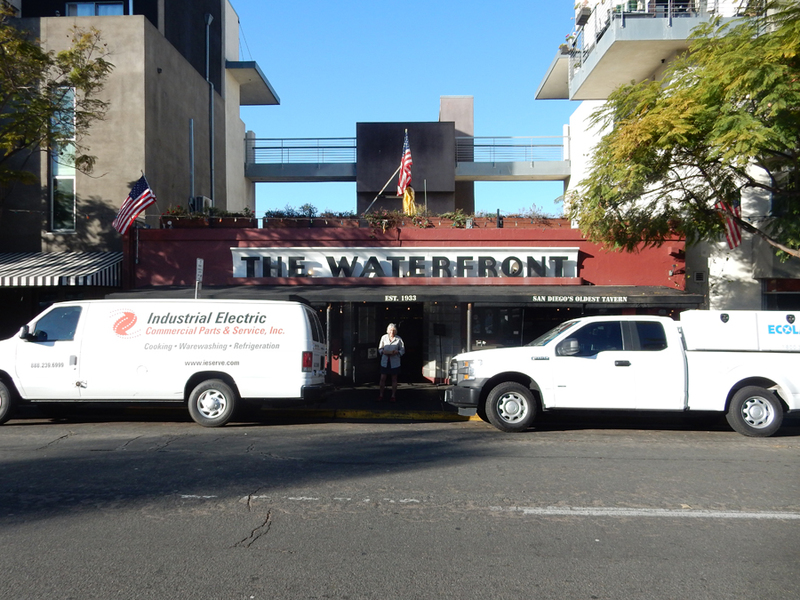 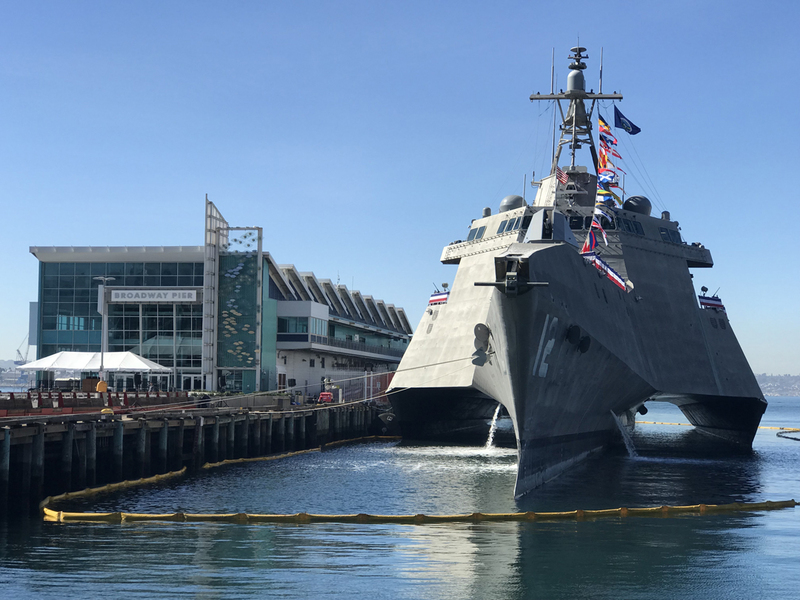 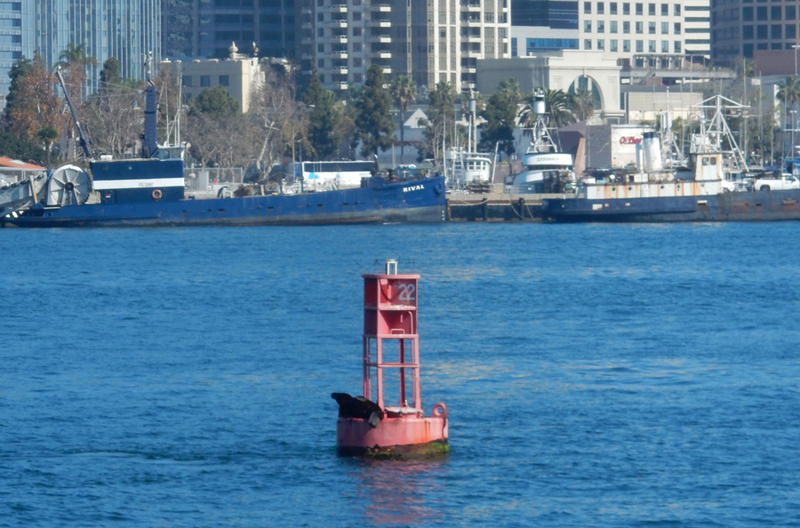 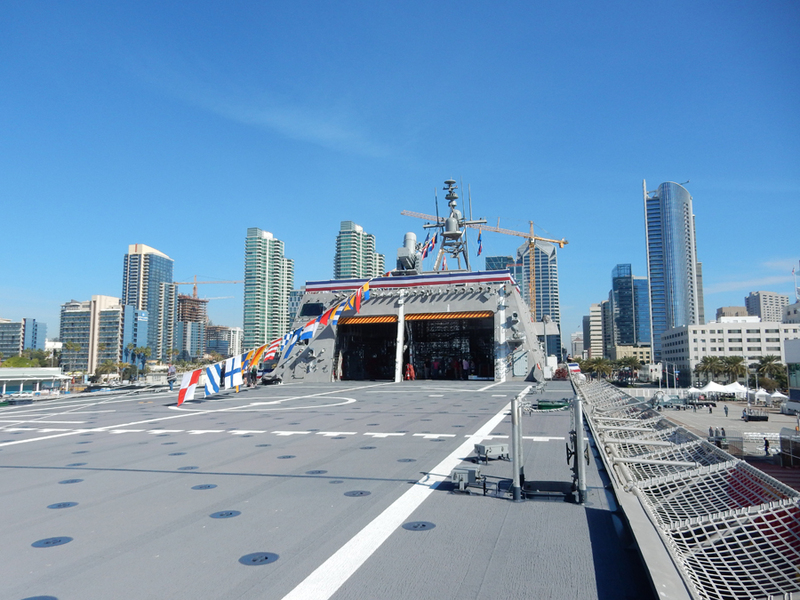 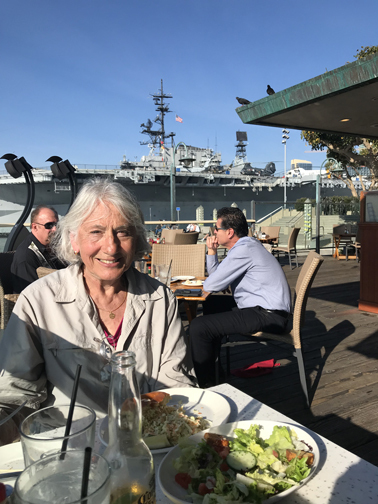 2/1 Th – Breakfast at the Waterfront Restaurant – San Diego’s Oldest Tavern. 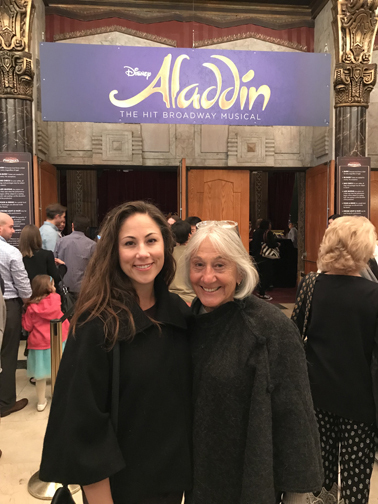 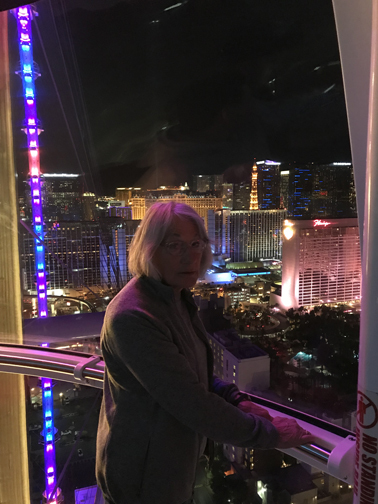 “Supermoon” (also a Blue Moon) above Helen’s head! 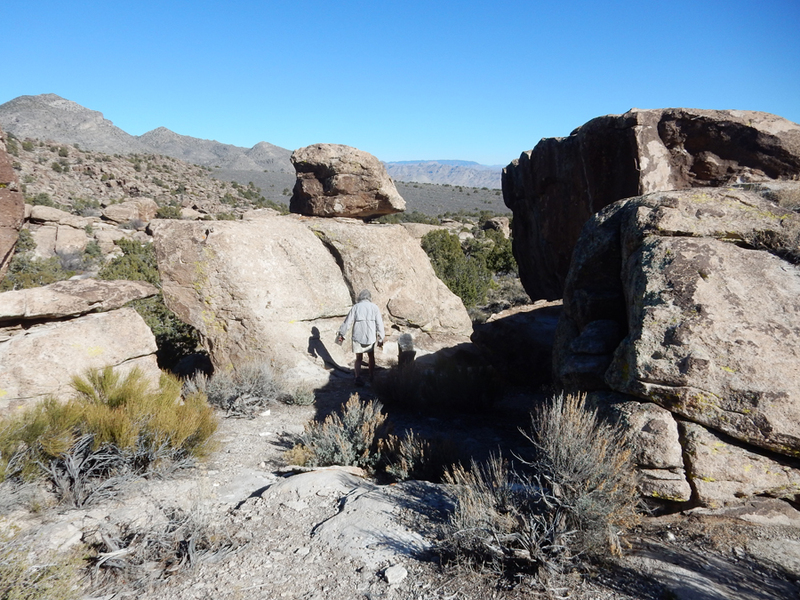 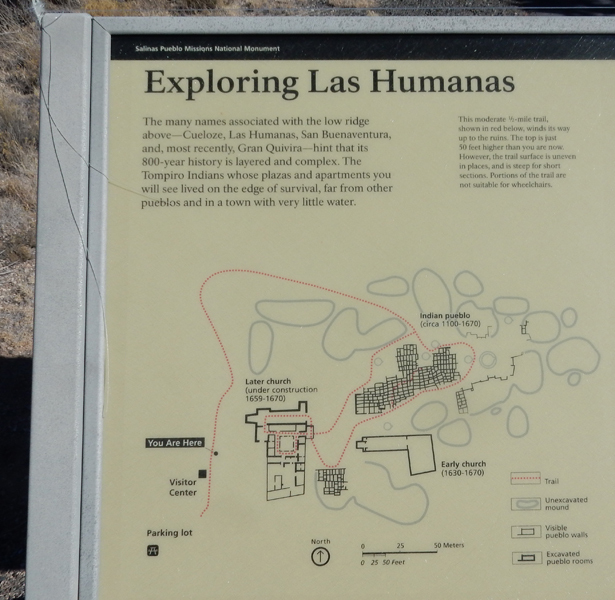 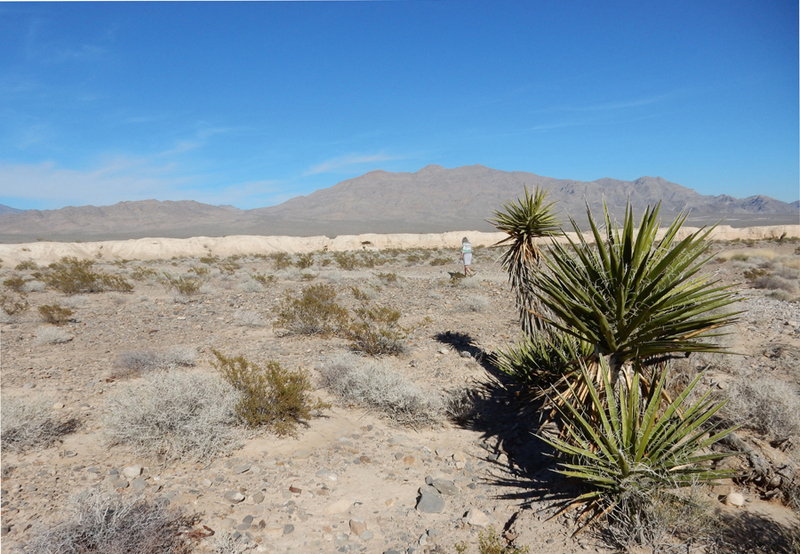 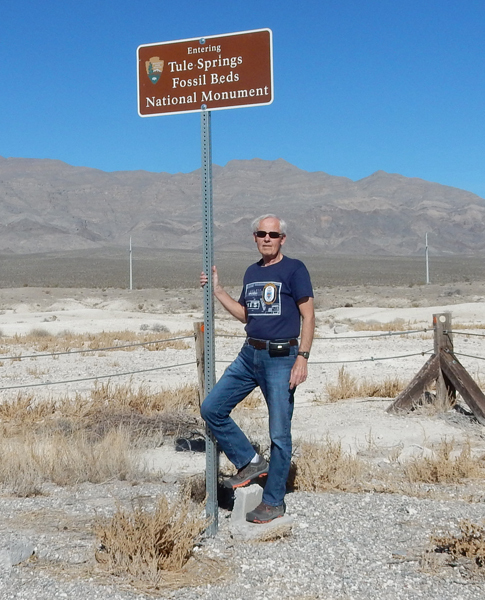 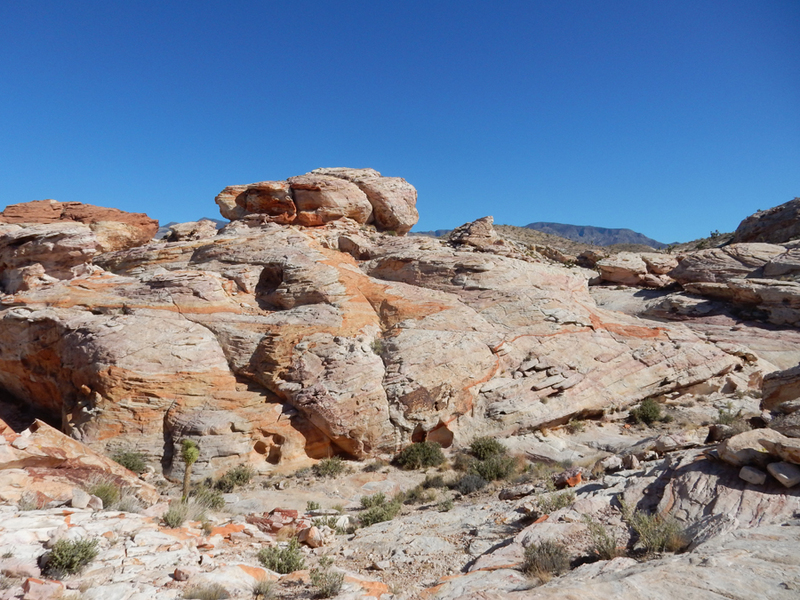 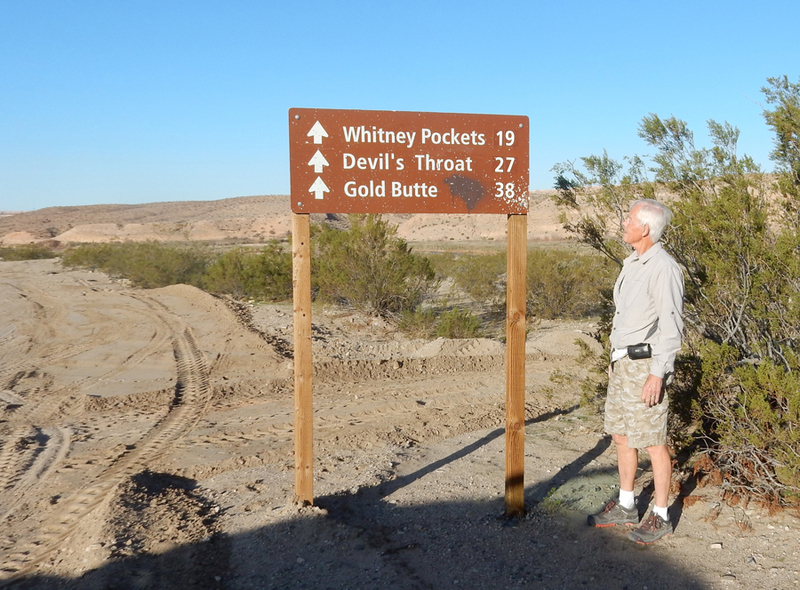 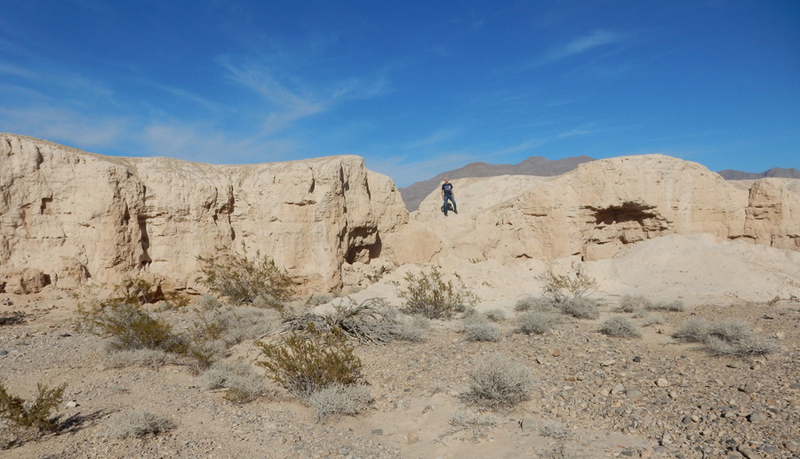 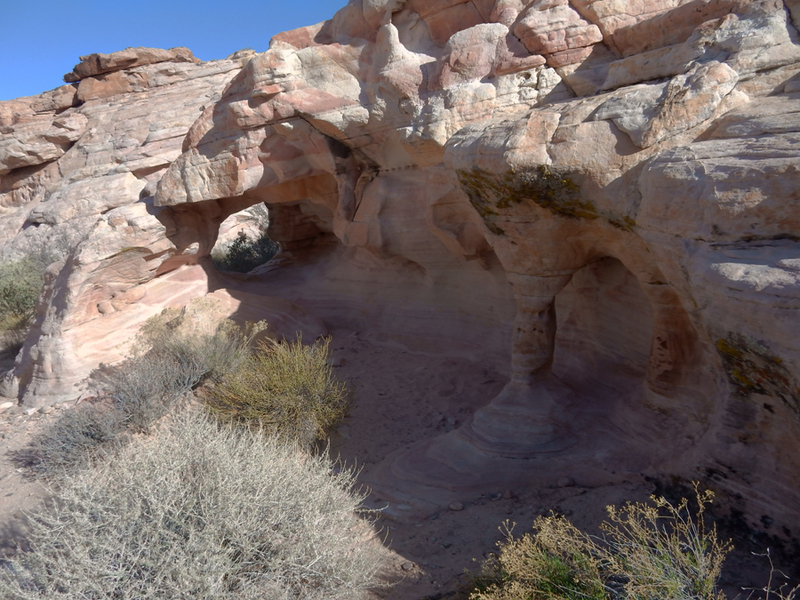 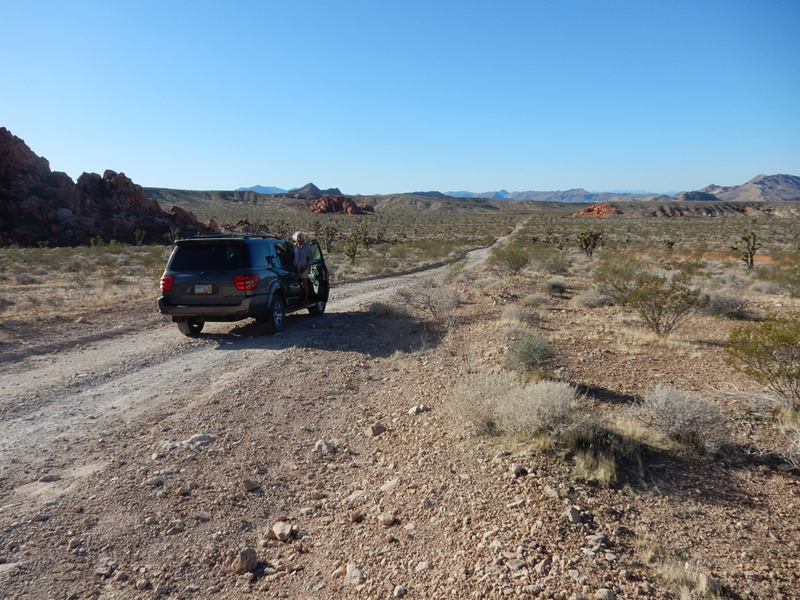 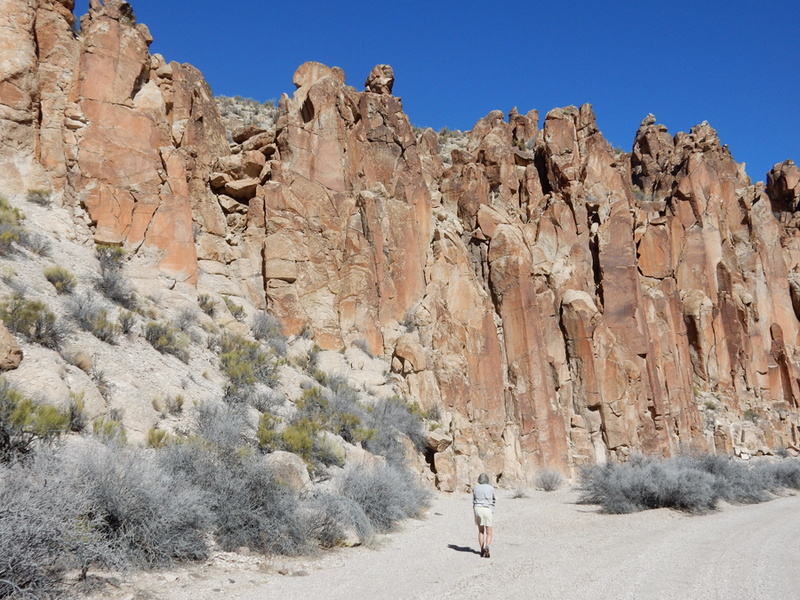 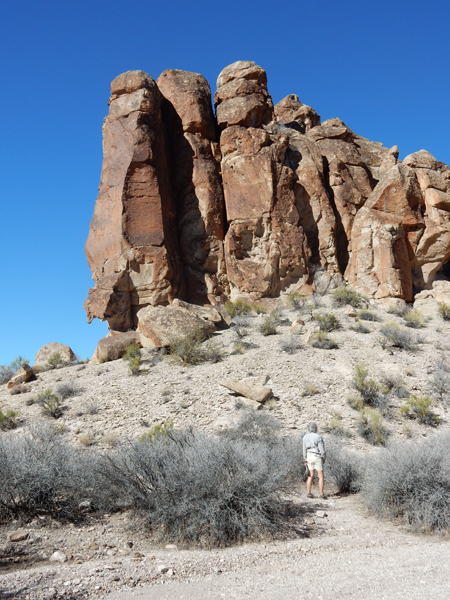 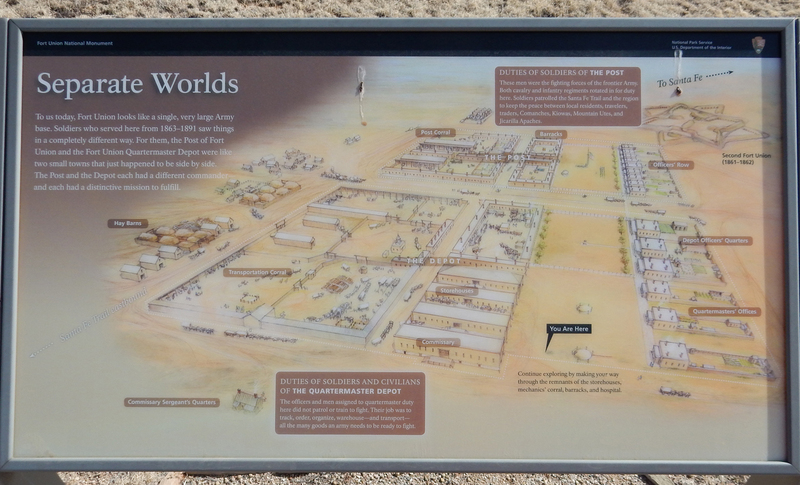 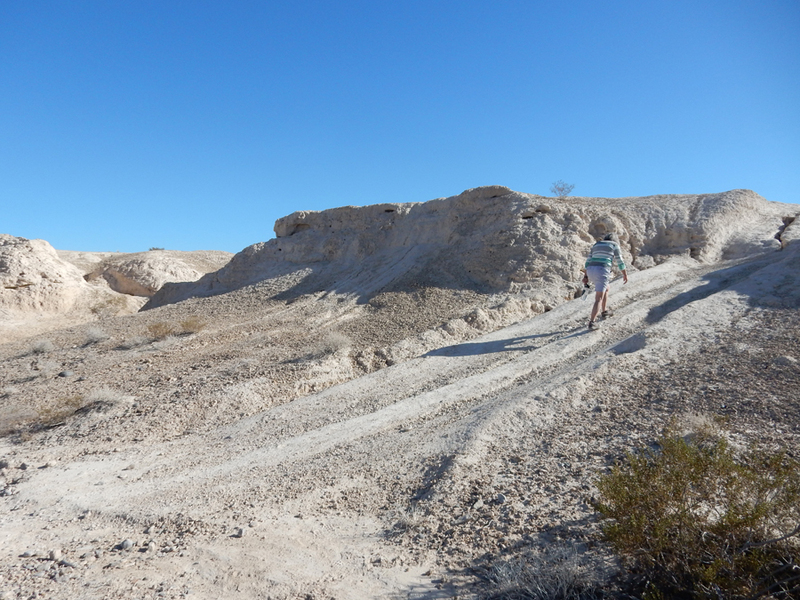 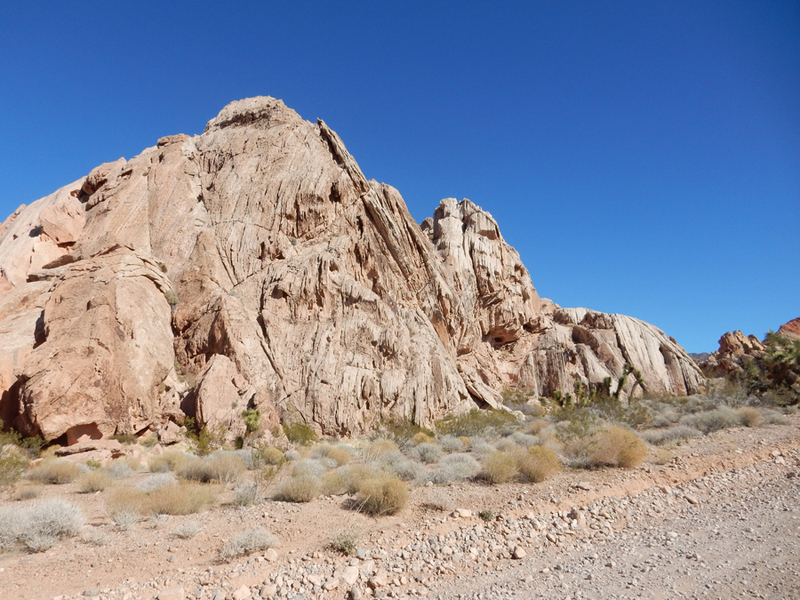 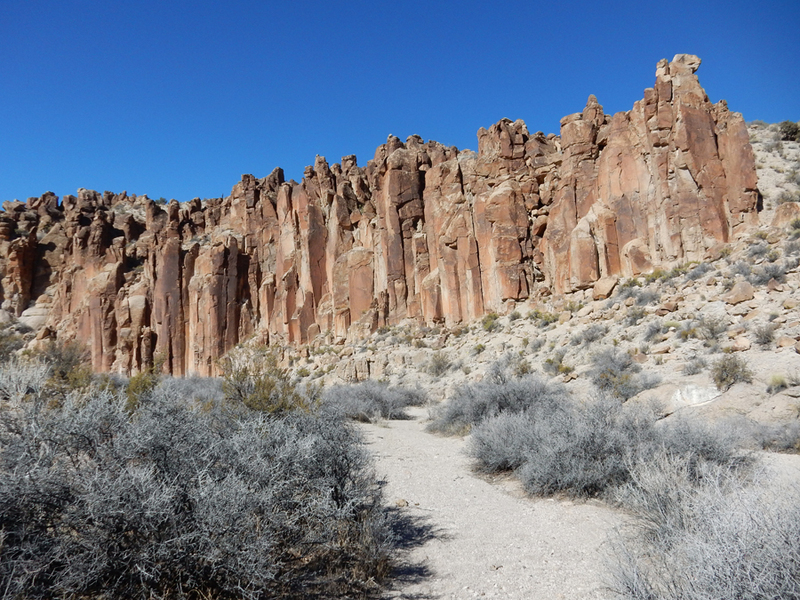 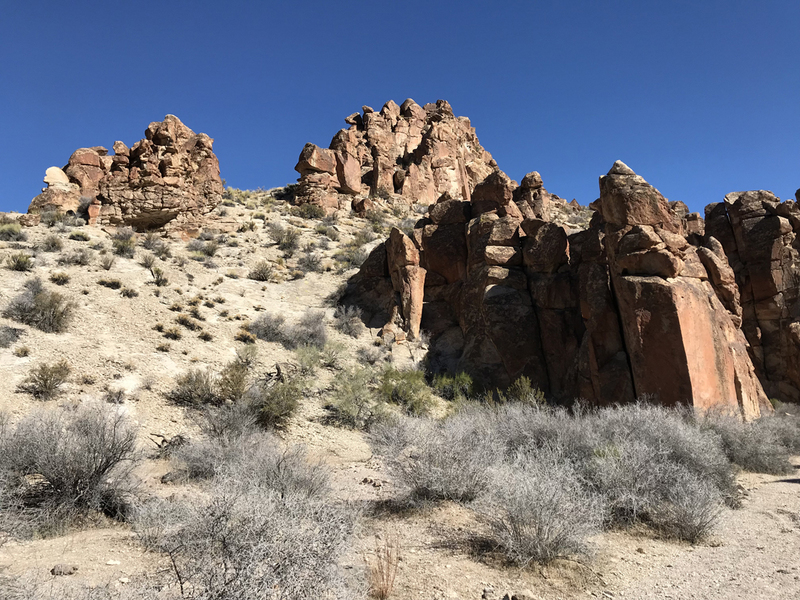 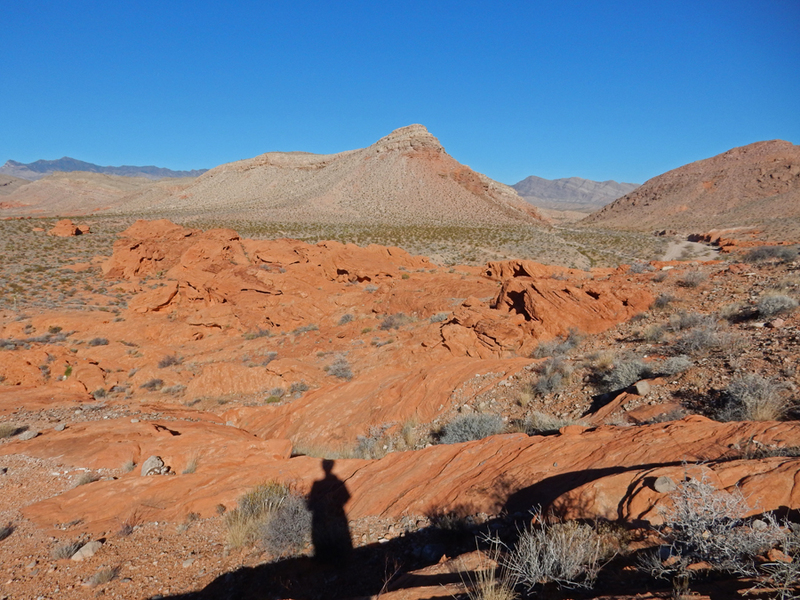 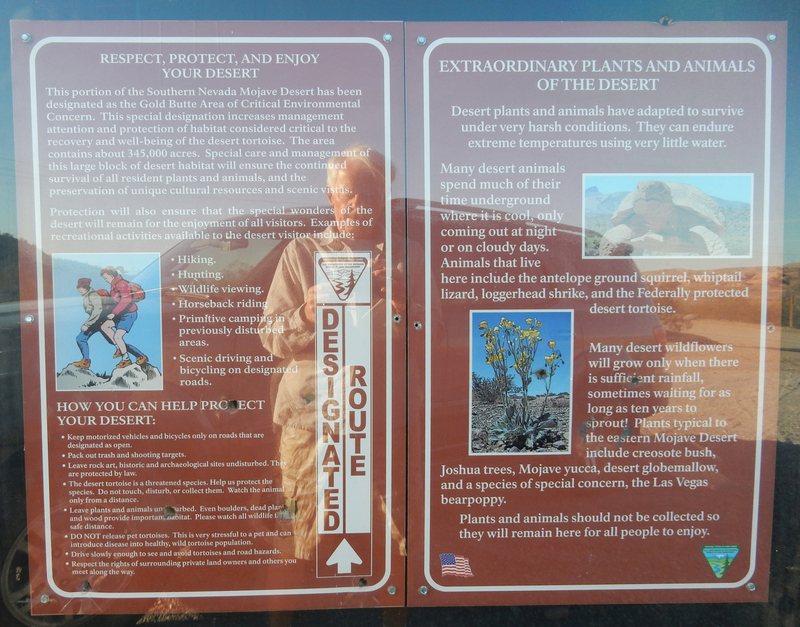 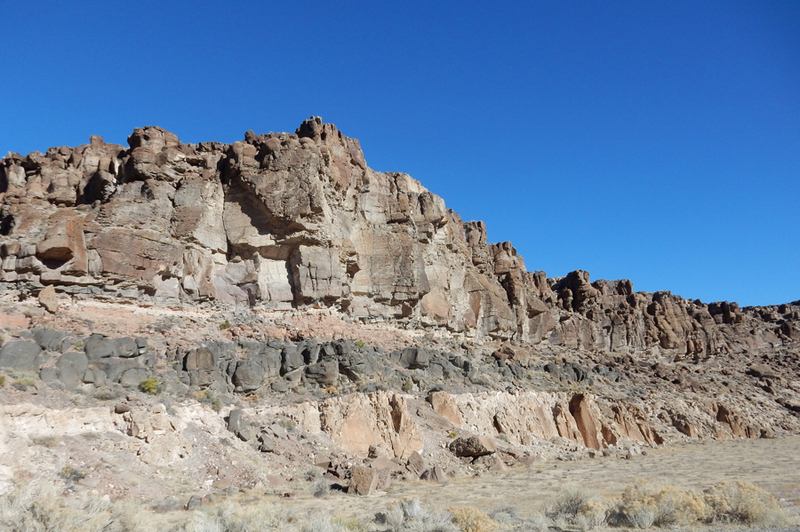 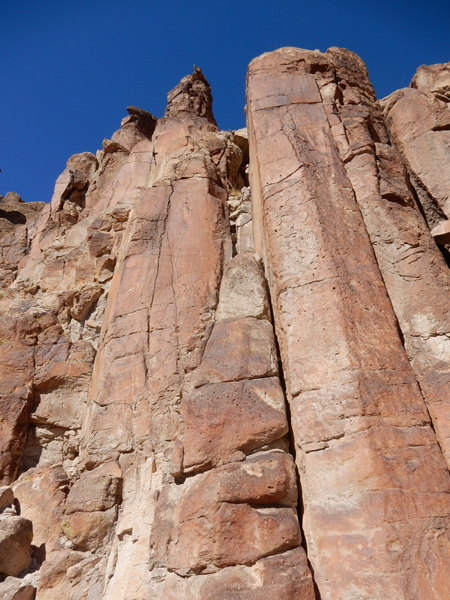 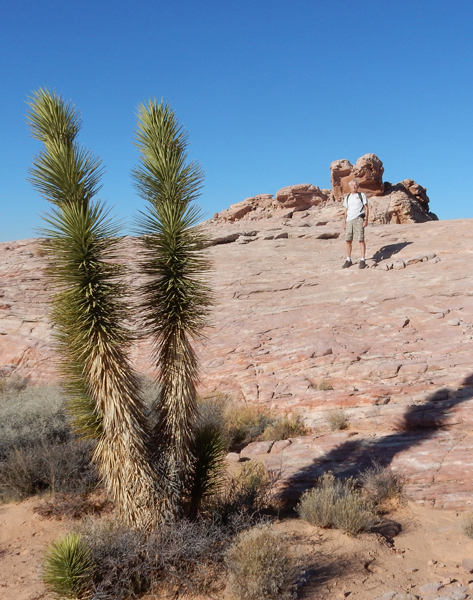 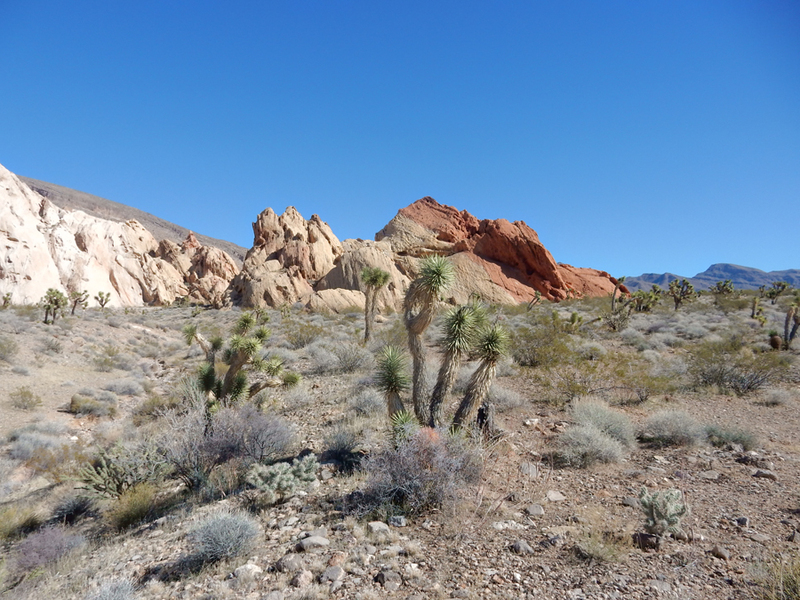 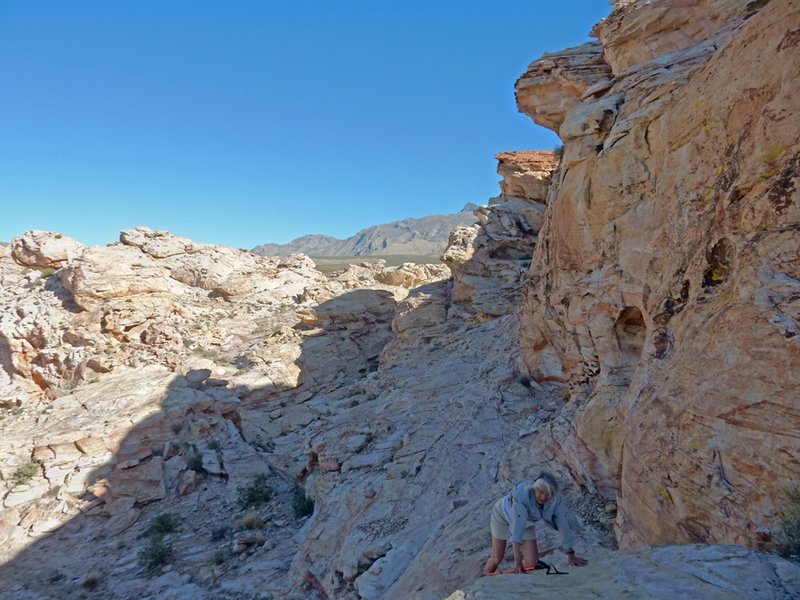 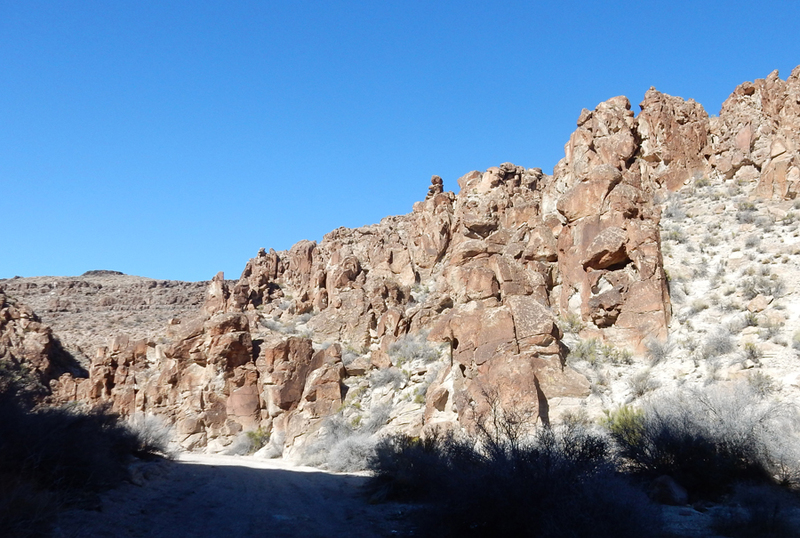 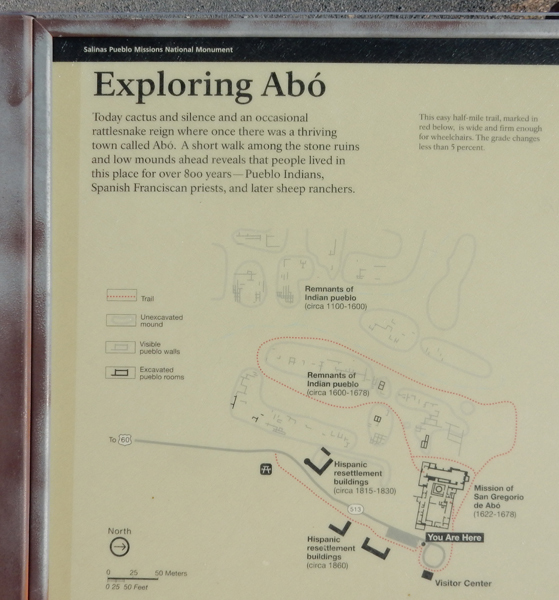 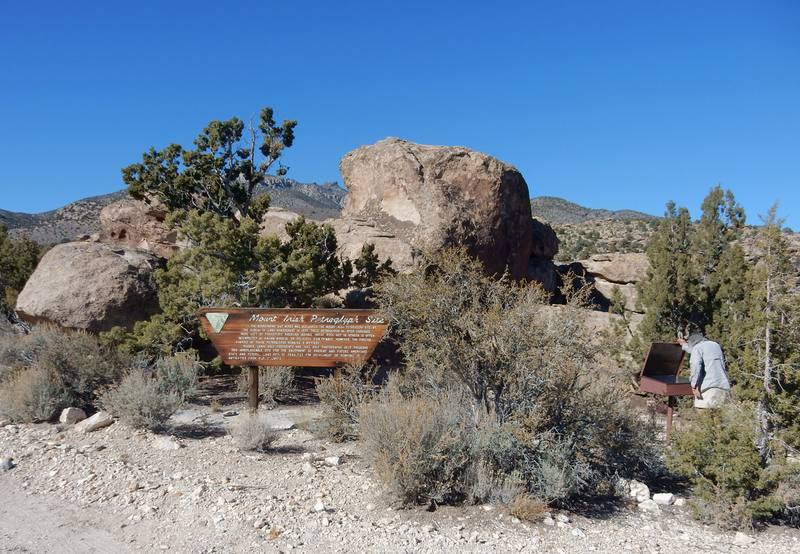 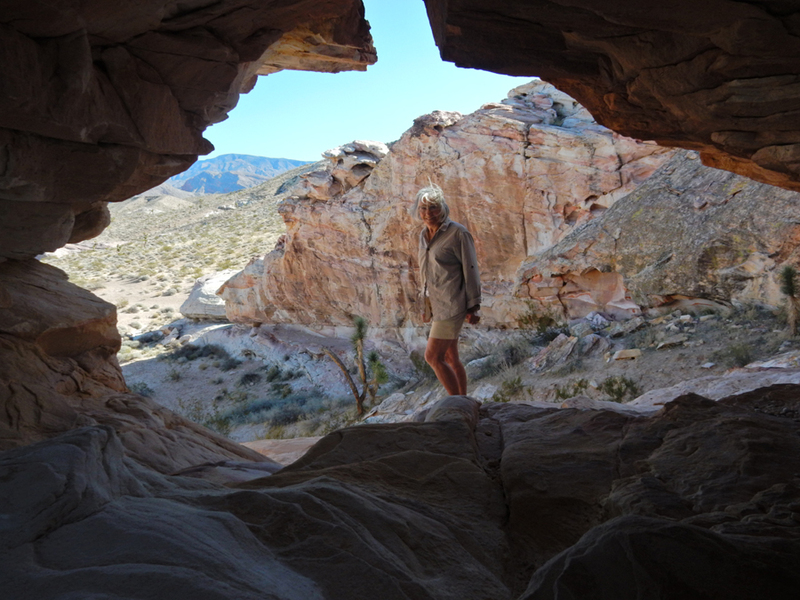 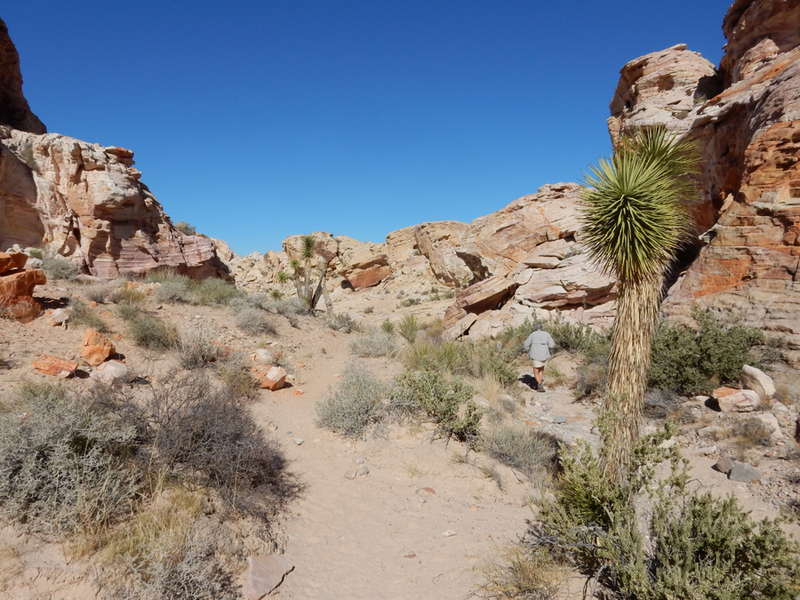 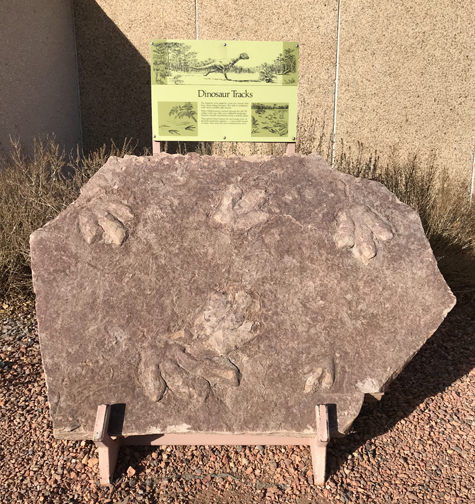 2/5 M – 4hrs to Tule Springs Fossil Beds National Monument 20 miles north of the Las Vegas strip. 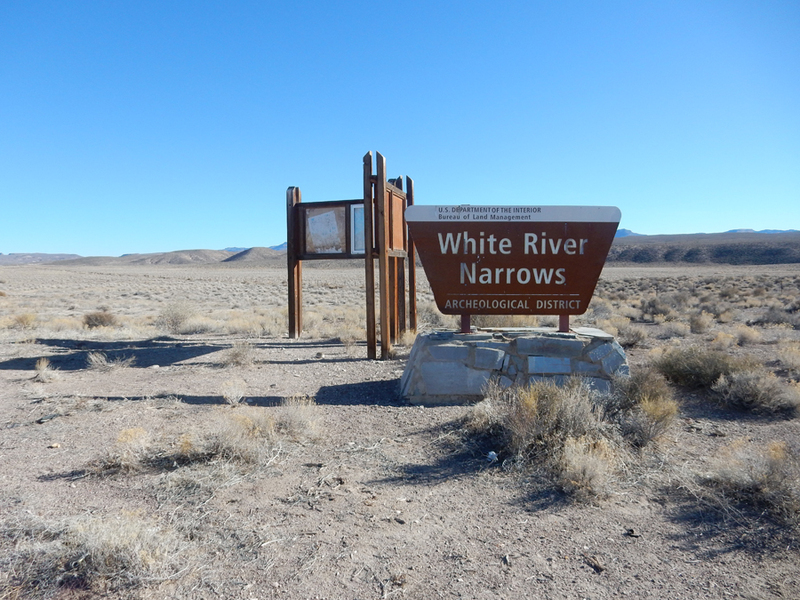 This is a new (2014) BLM NM. 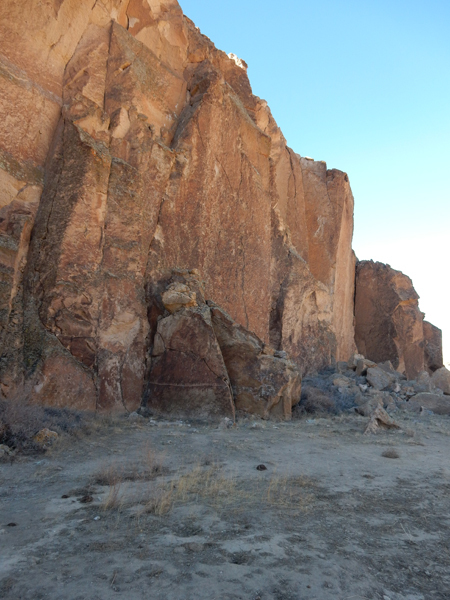 Archaeologists have removed mammoth, lion and camel fossils from this area. 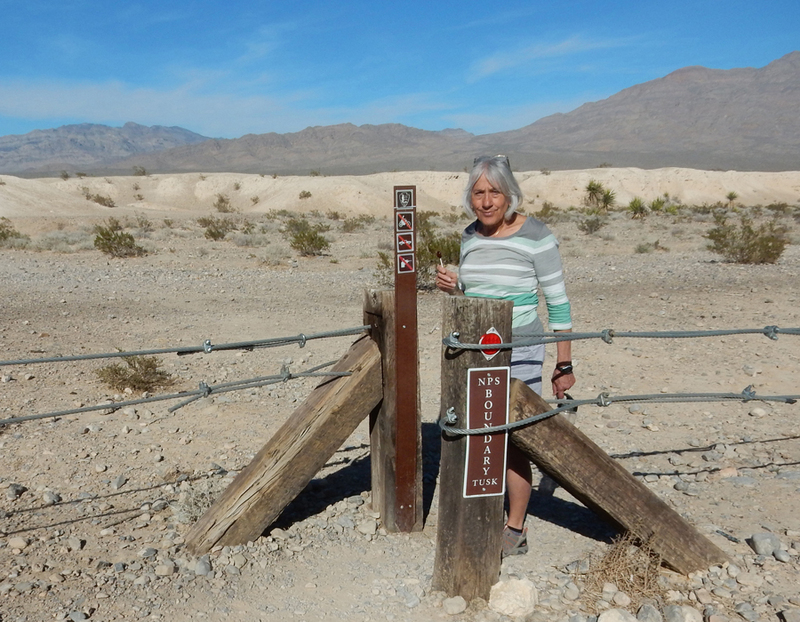 We like Tootsie Pops – always take water! 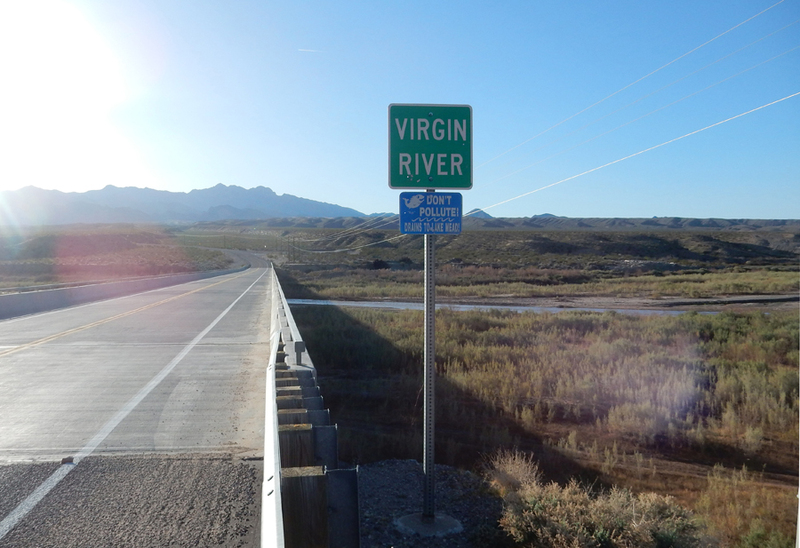 To be honest, there is not much there. 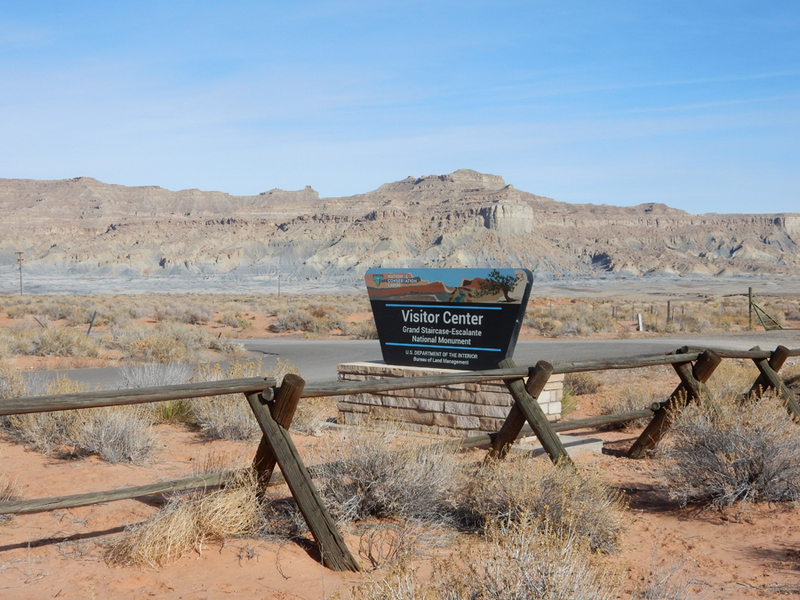 I would not recommend going until they have a Visitor Center. 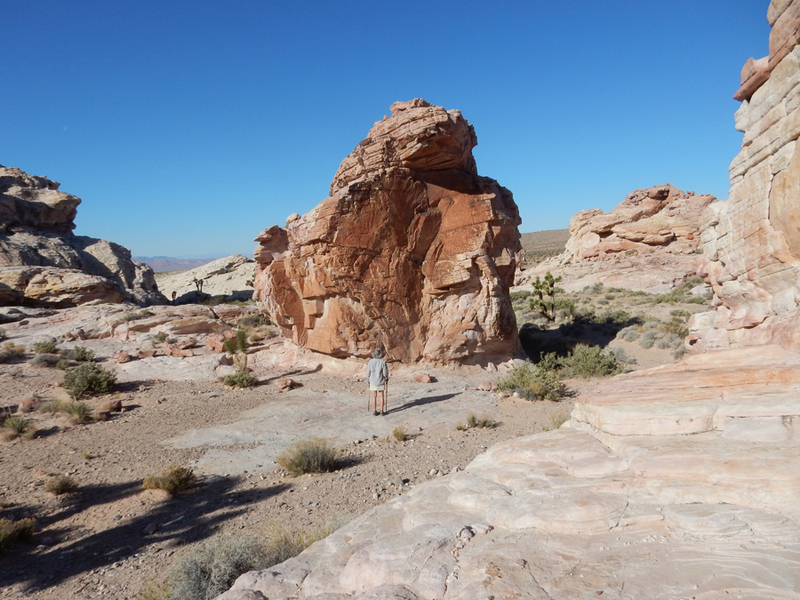 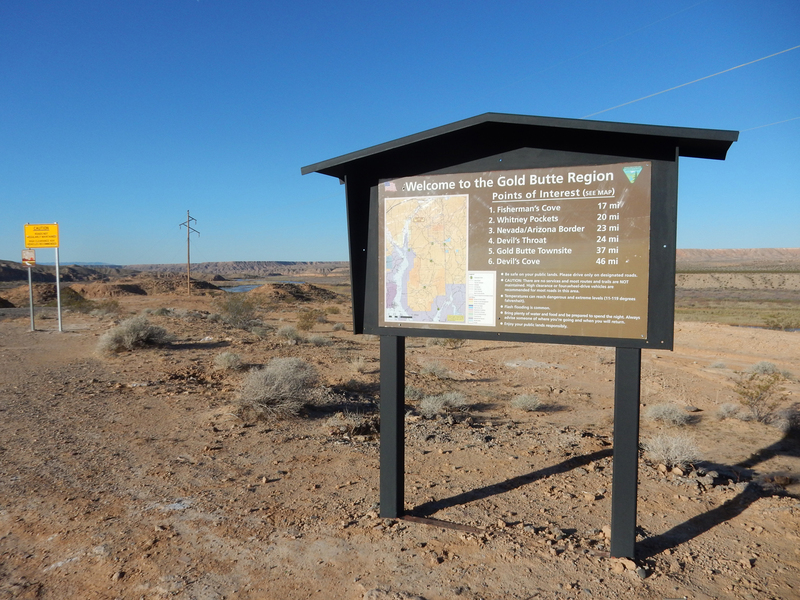 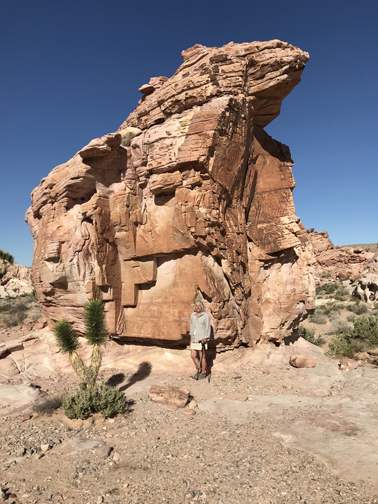 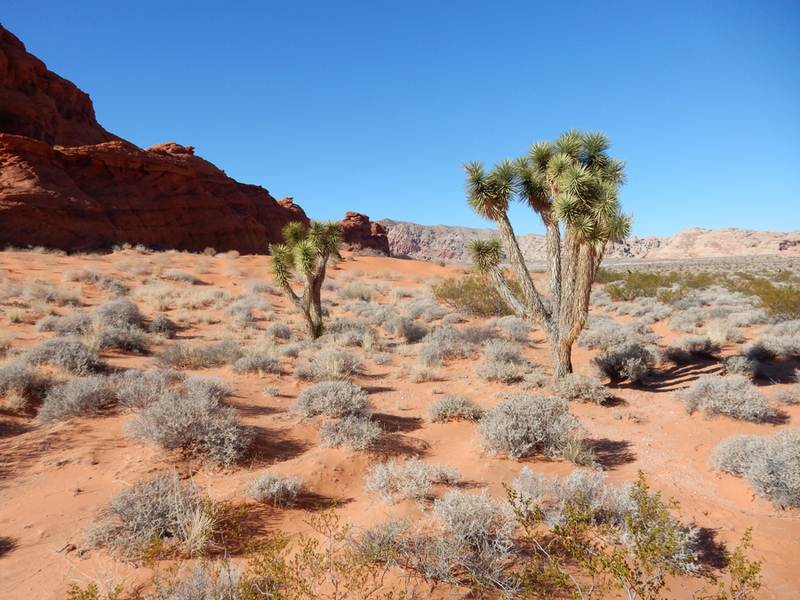 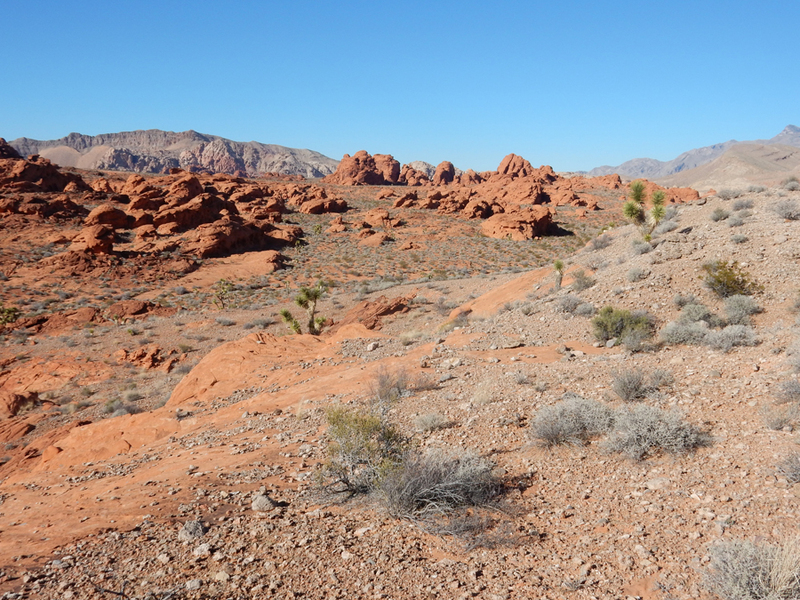 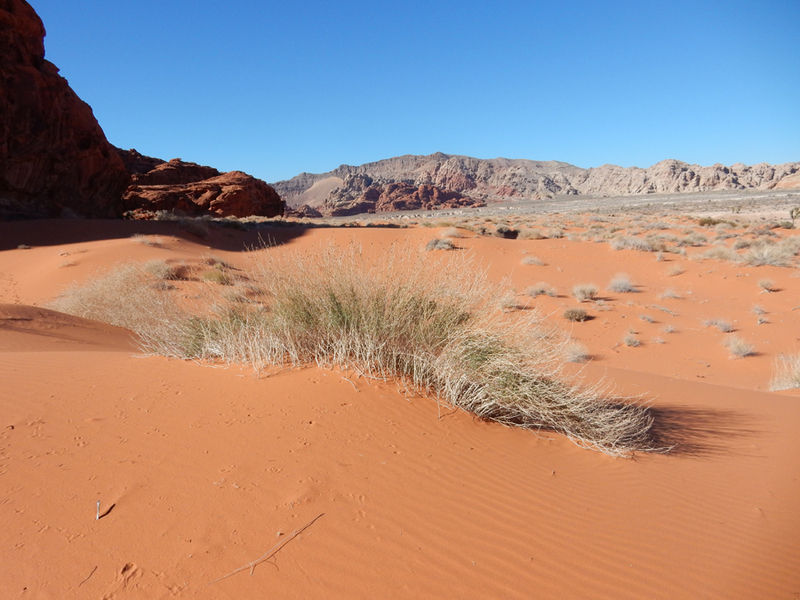 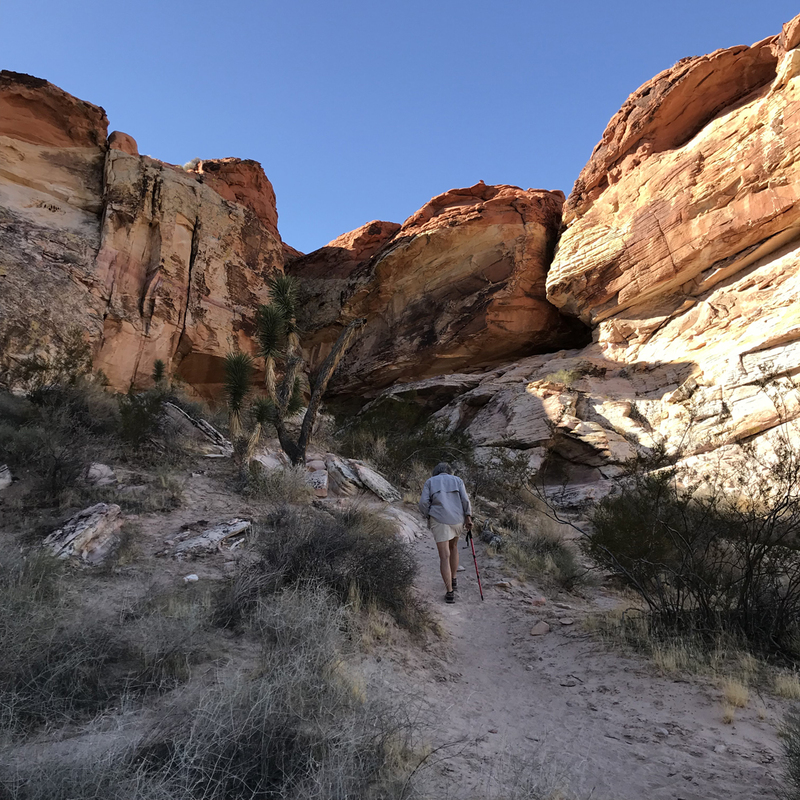 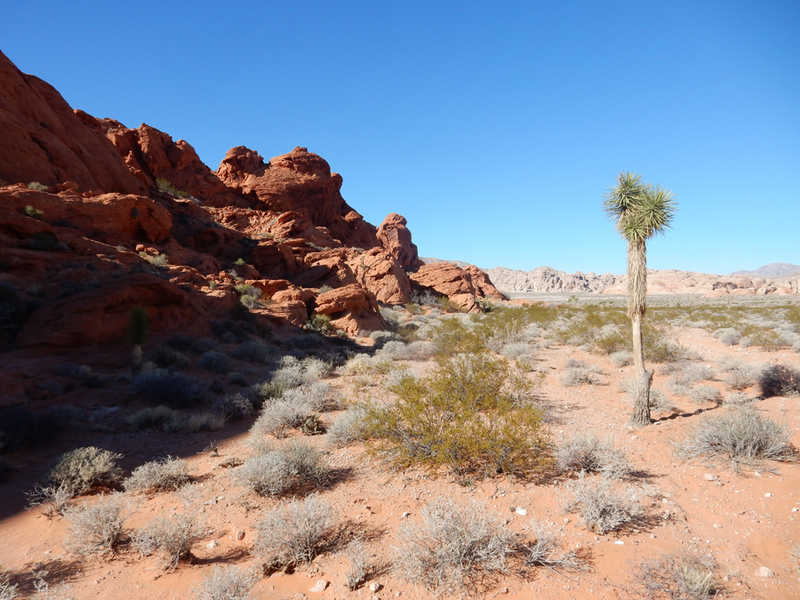 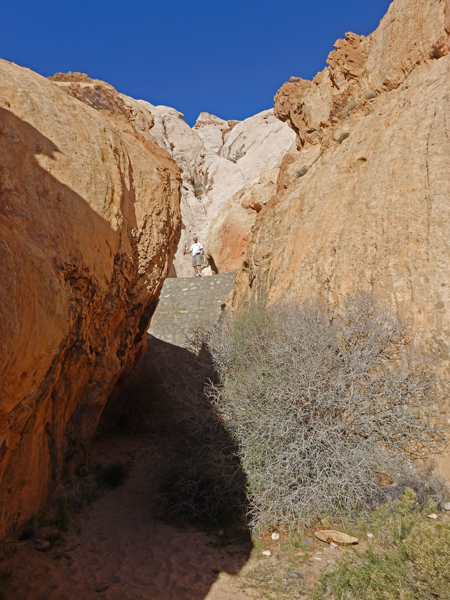 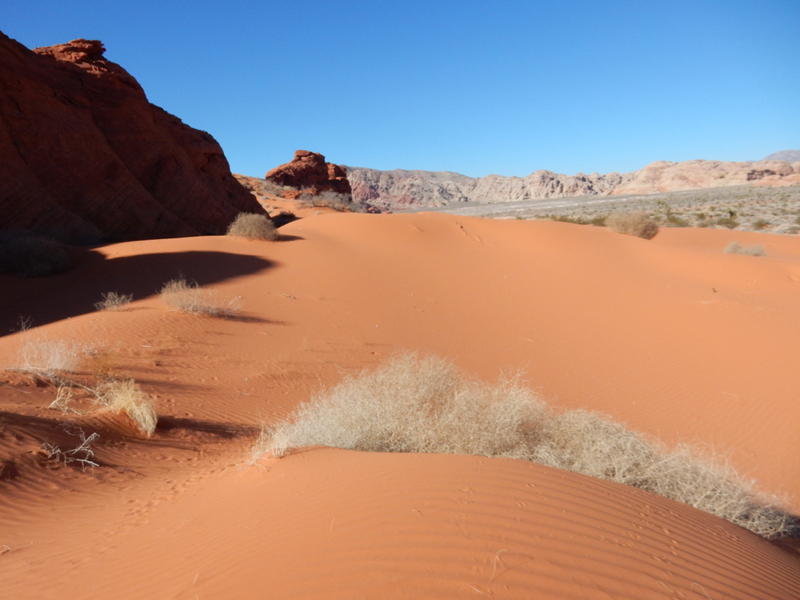 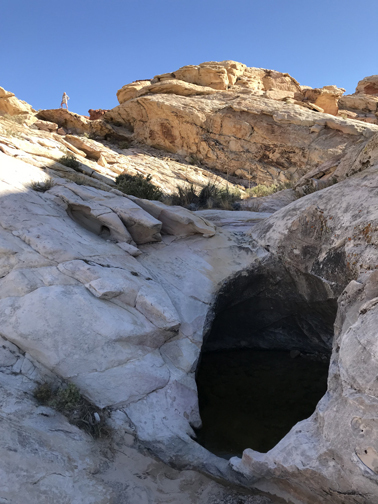 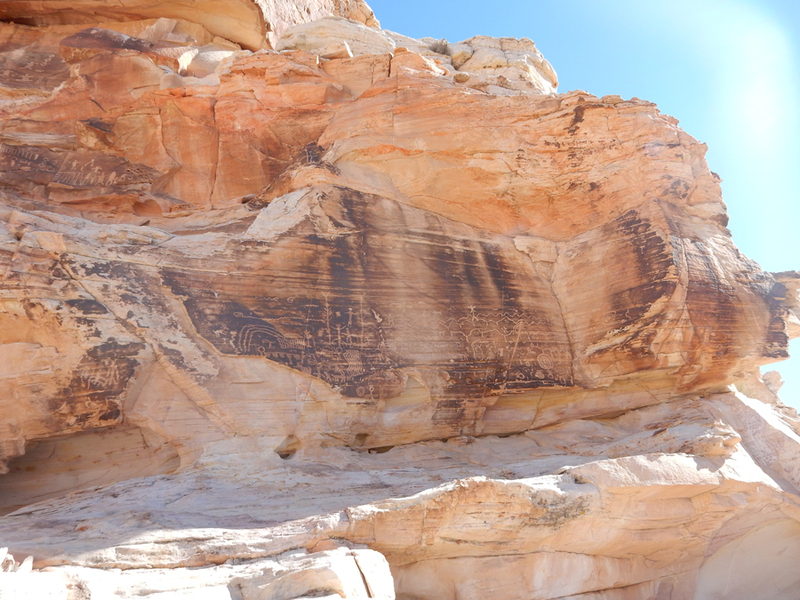 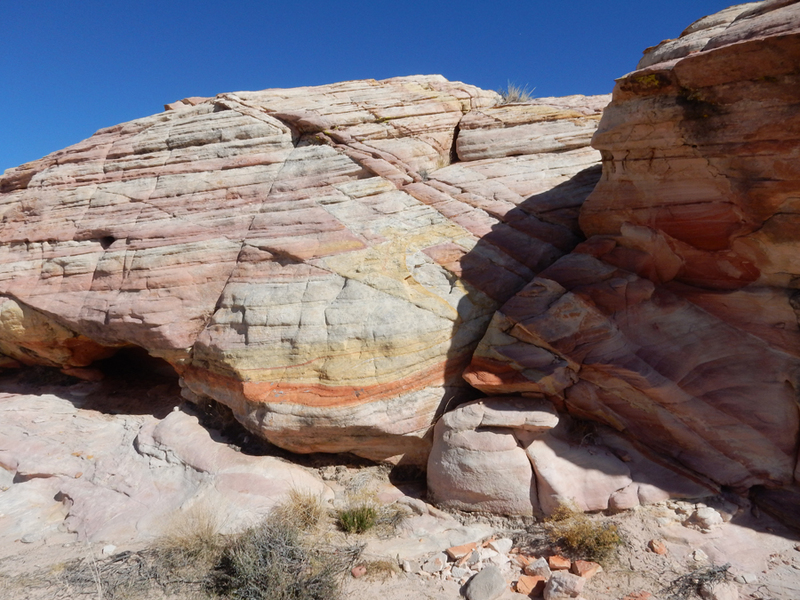 Gold Butte was designated a BLM National Monument in December 2016 by President Obama. 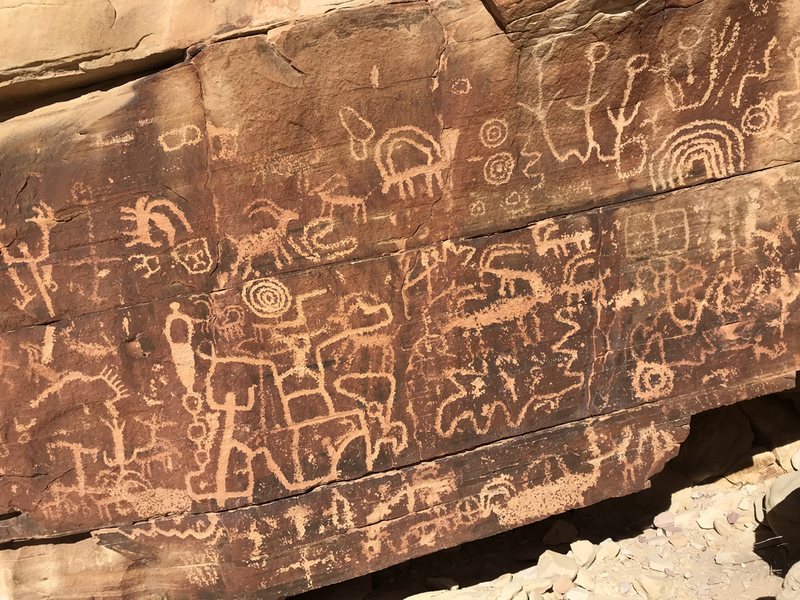 The Trump administration is currently attempting to reduce its size, like it did for Bears Ears and Grand Staircase Escalante NMs in Utah in 2017. 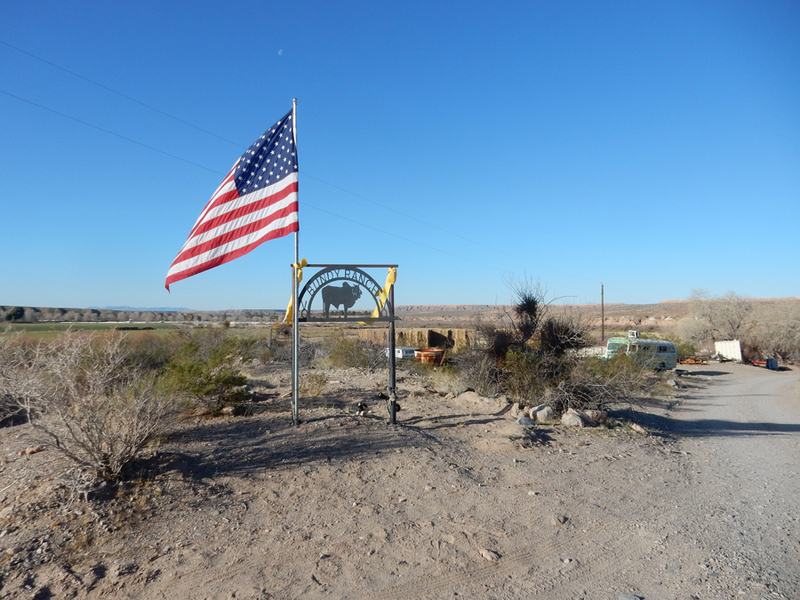 Cliven Bundy has a ranch just north of the NM. 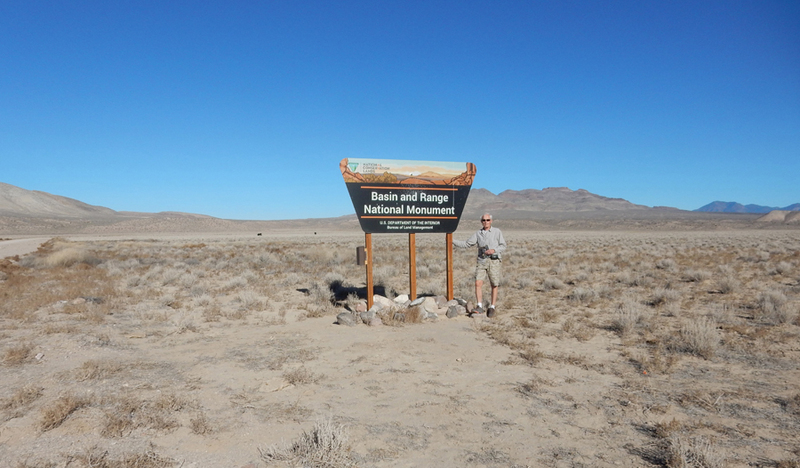 He grazed his cattle on the BLM land long before it was a NM without paying grazing fees. 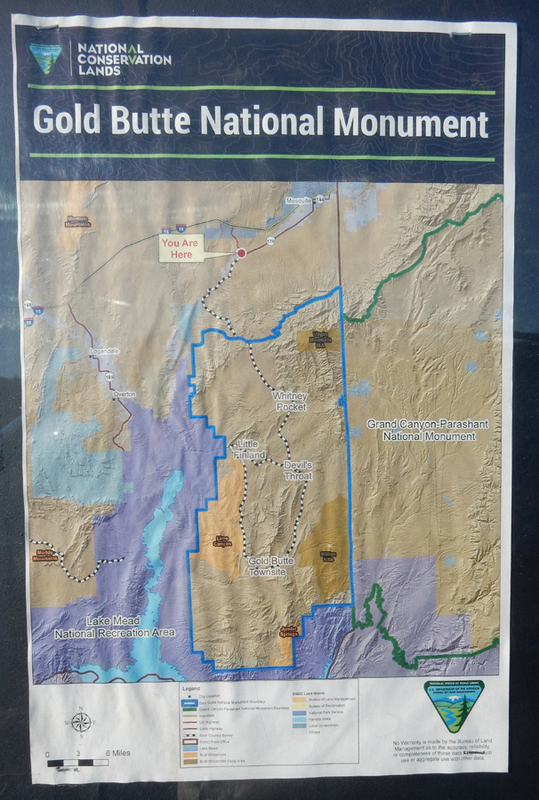 This led to the “Bundy Standoff” in 2014. 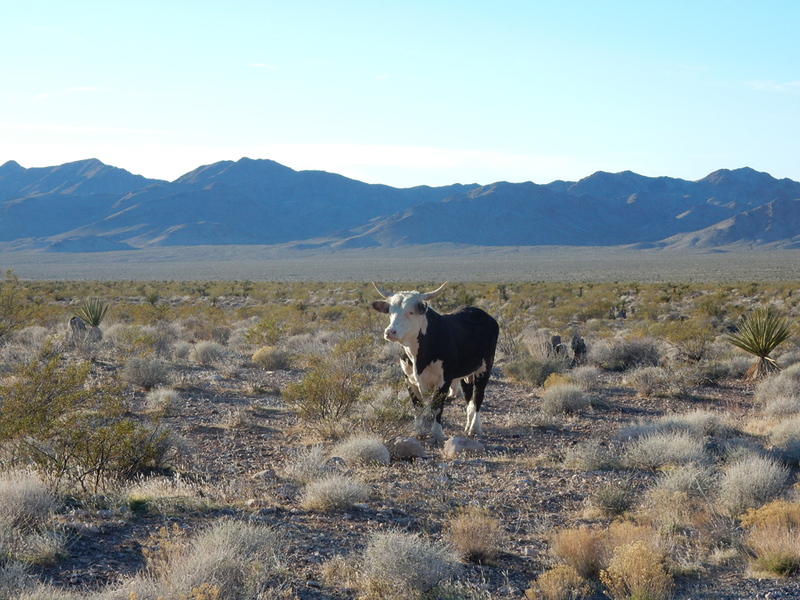 He refused to pay over one million in back fees for grazing on federal land, so the BLM started rounding up his cattle. 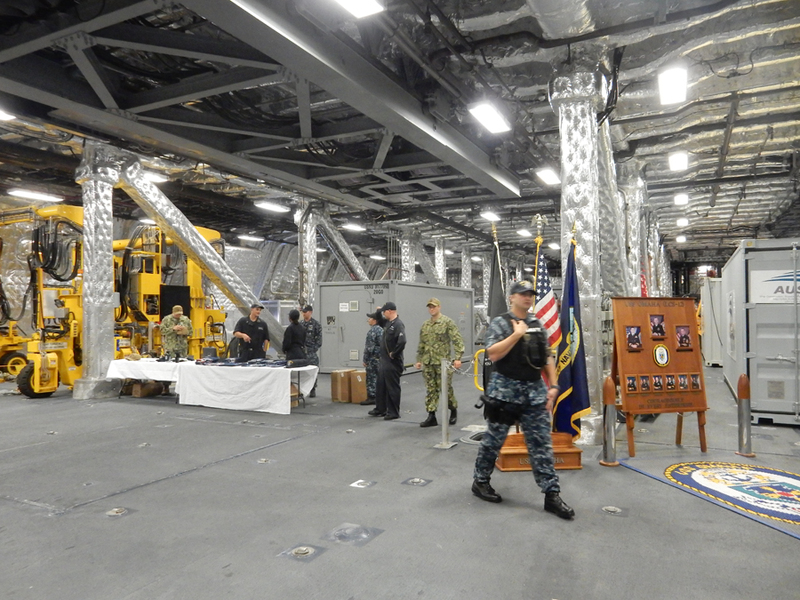 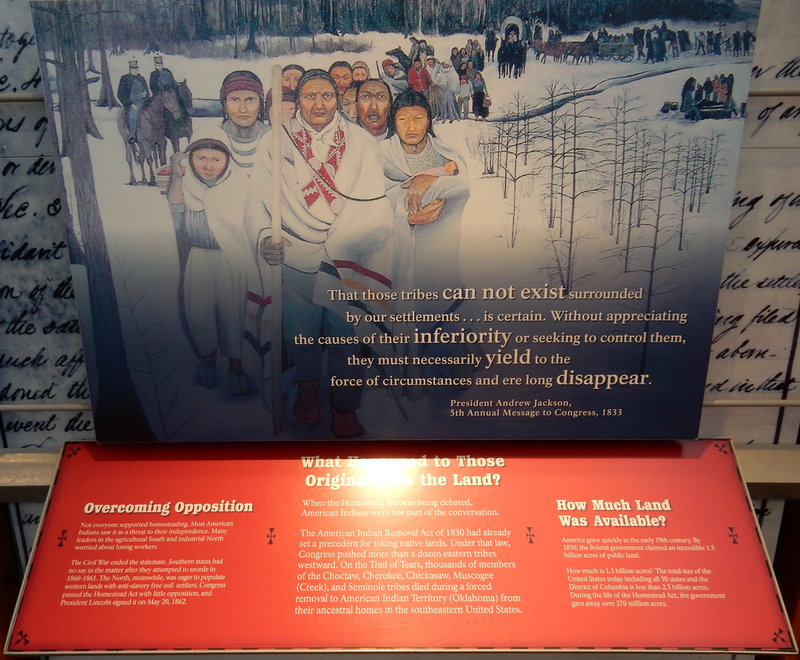 Protestors, some armed, blocked the removal. 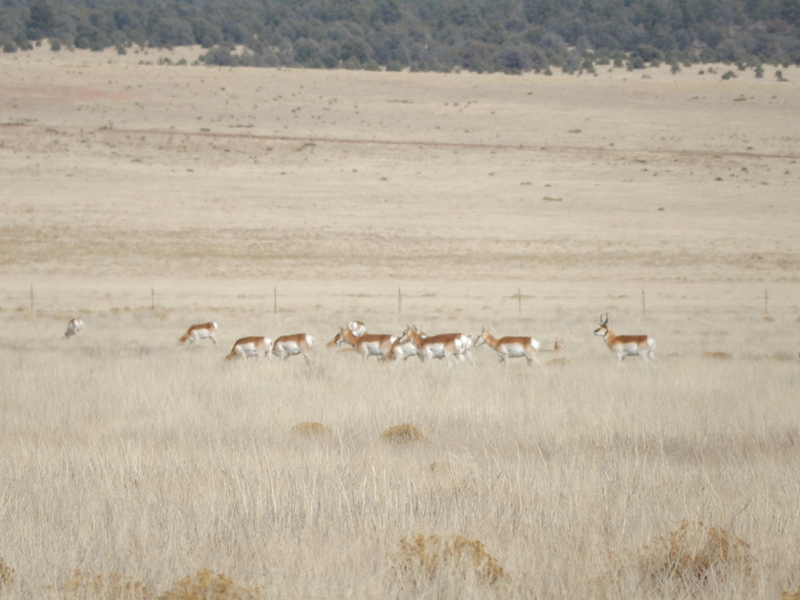 The Sheriff and BLM Director agreed to release the cattle to de-escalate the standoff. 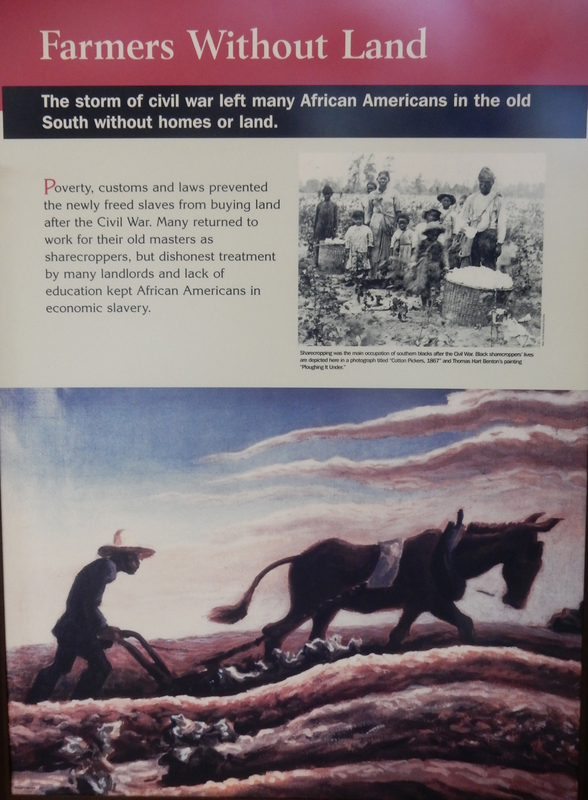 This issue has still not been resolved. 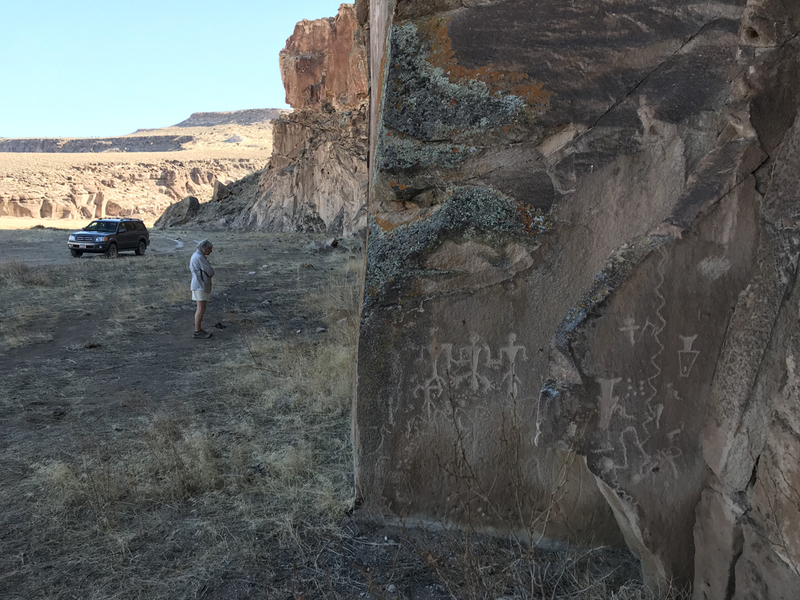 Bundy and his sons were also involved in the Malheur National Wildlife Refuge standoff in OR in 2016, where they were arrested. 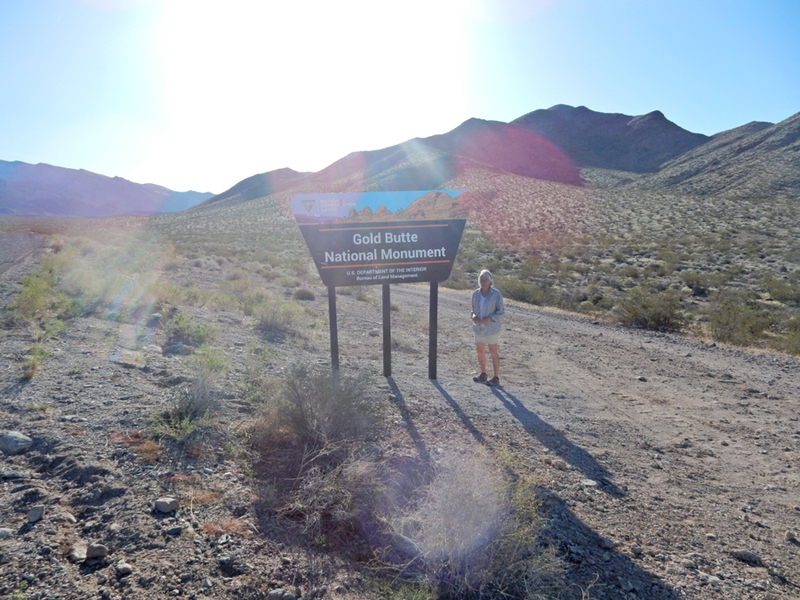 Gold Butte was the highlight of our five-week road trip. 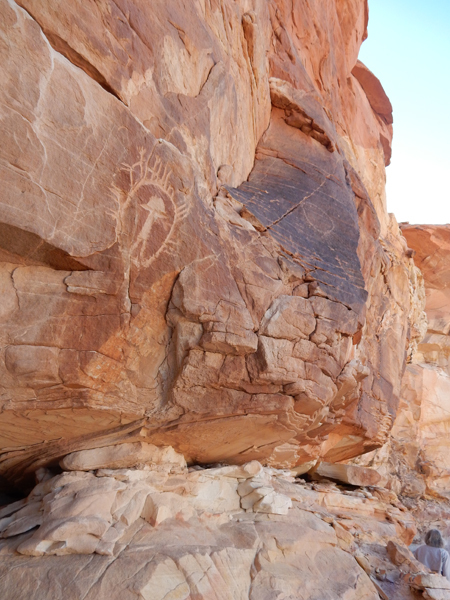 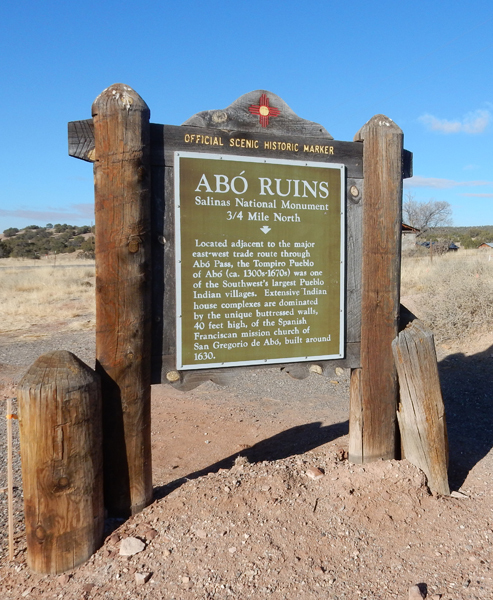 The rugged desert landscape, mountains, sandstone formations, historic sites, “rock art” petroglyphs, etc. 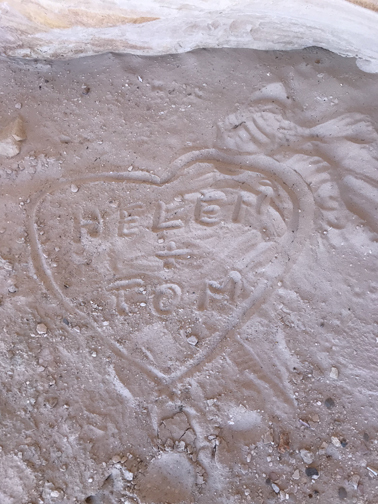 were wonderful! 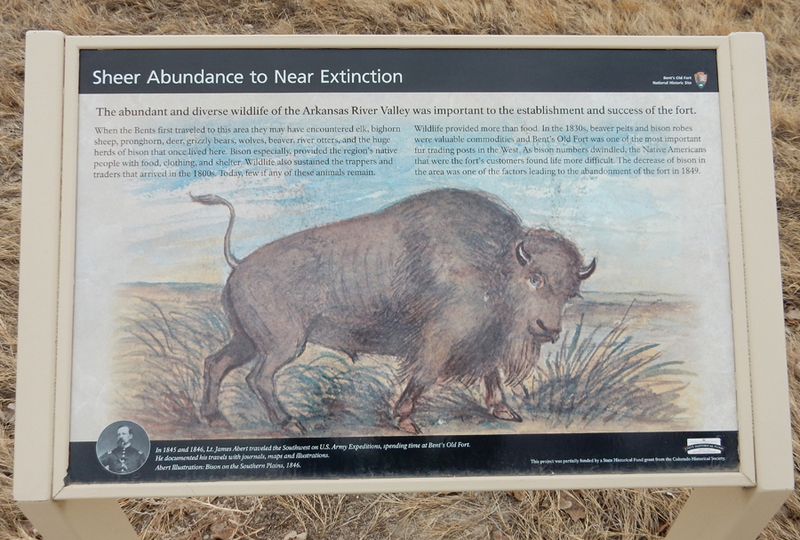 This area needs to be preserved and protected! 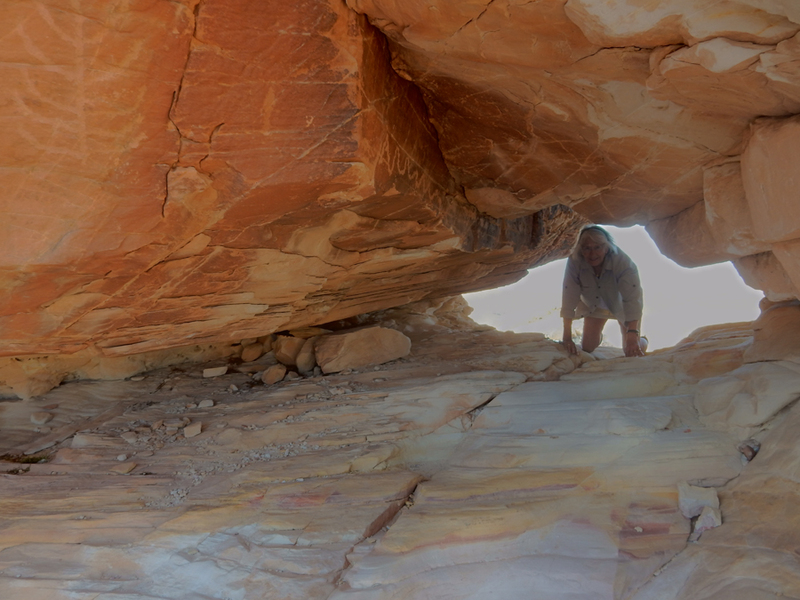 The roof of a large cave collapsed producing this large hole. 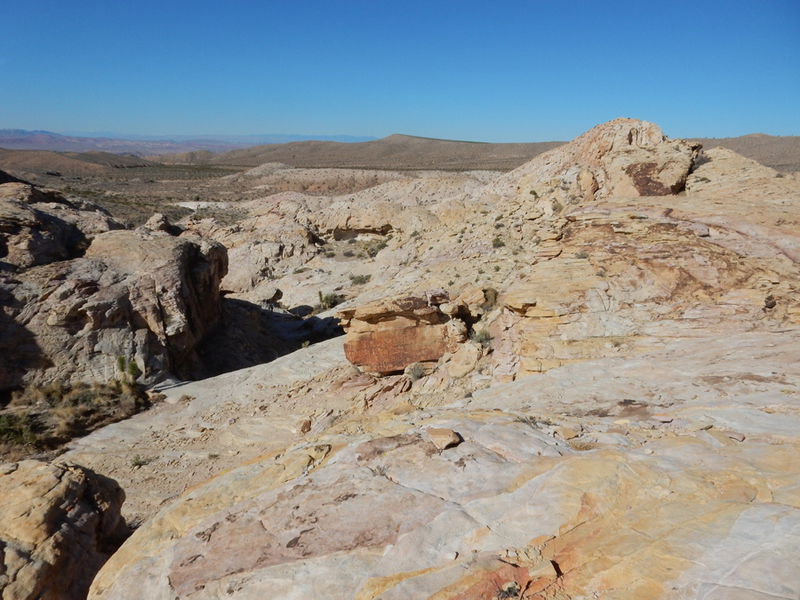 It was entirely fenced off for safety because the edge is unstable. 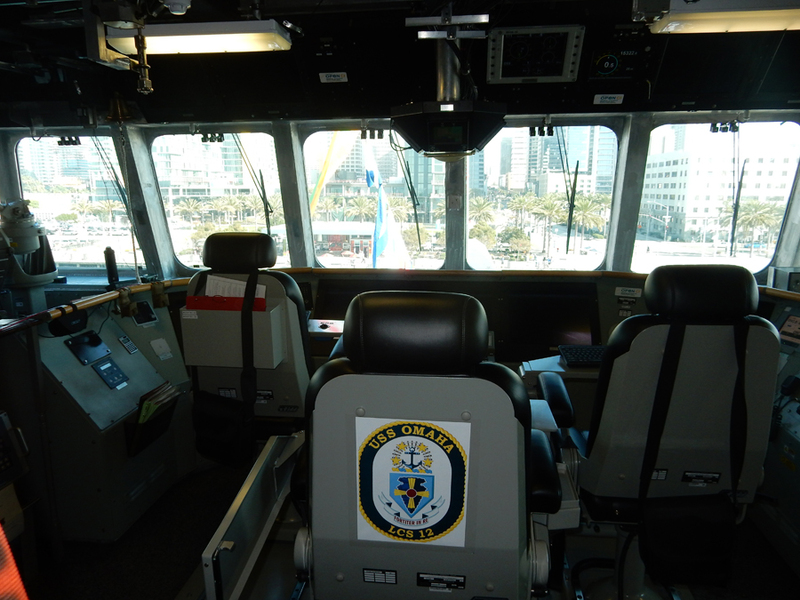 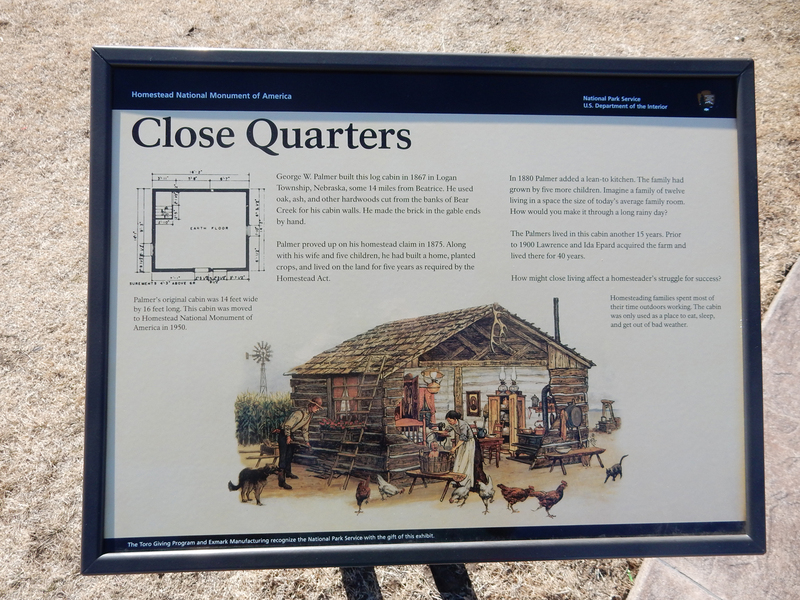 Therefore, you could not get close enough to look inside. 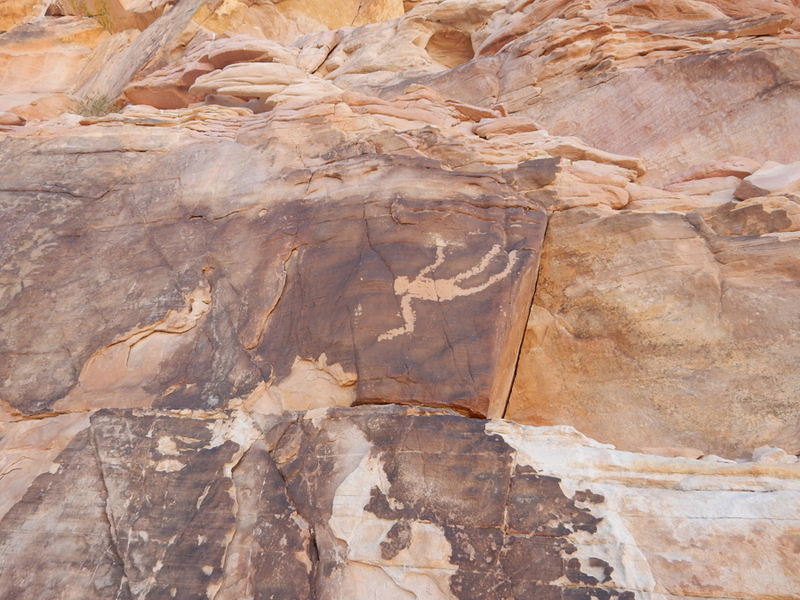 One of Cliven Bundy’s cattle? 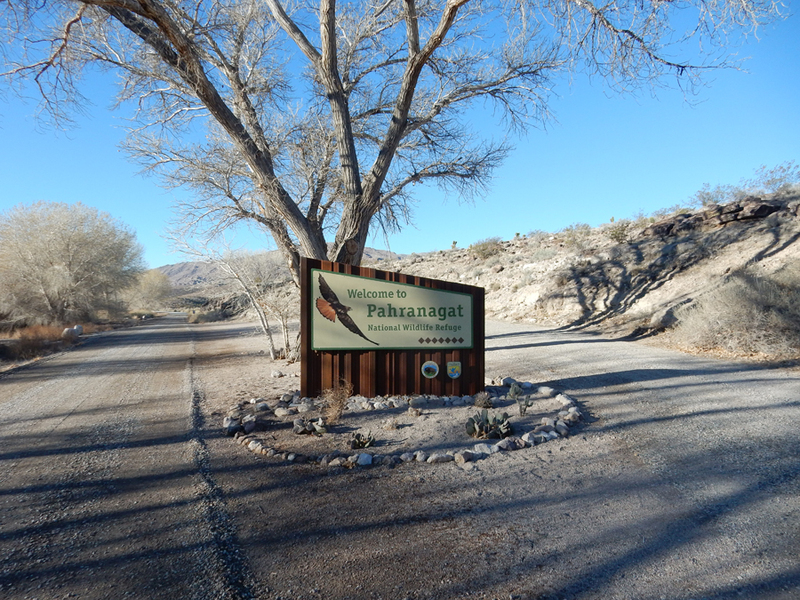 2/7 W – Stopped at the Pahranagat National Wildlife Refuge along US 93 on our way to Basin and Range National Monument (2hrs) north of Vegas. 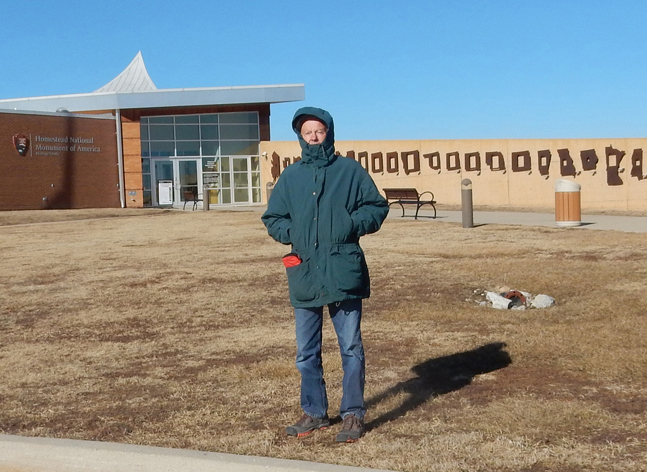 Unfortunately, the Visitor Center was closed. 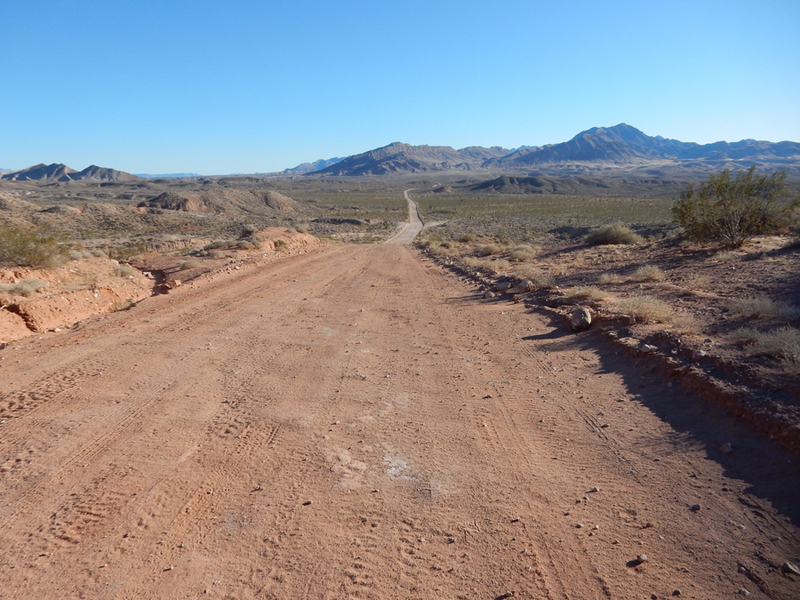 Most of this new (2015) NM looks like this. 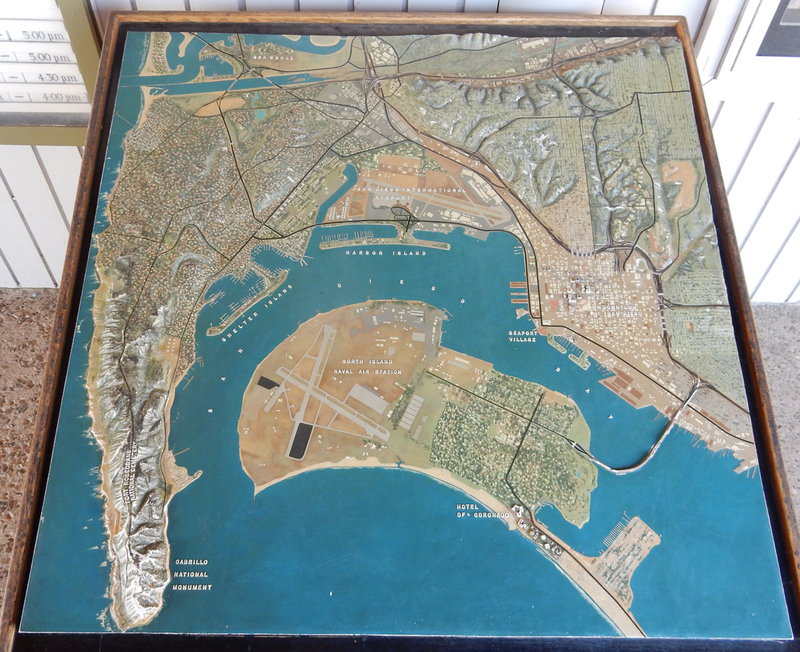 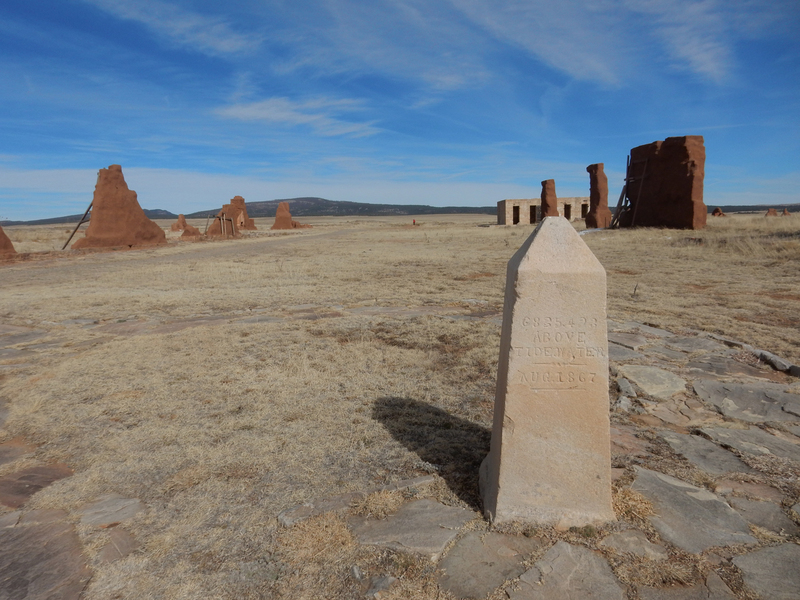 However, the monument is huge (708,000 acres) and has many areas that are unique and interesting. 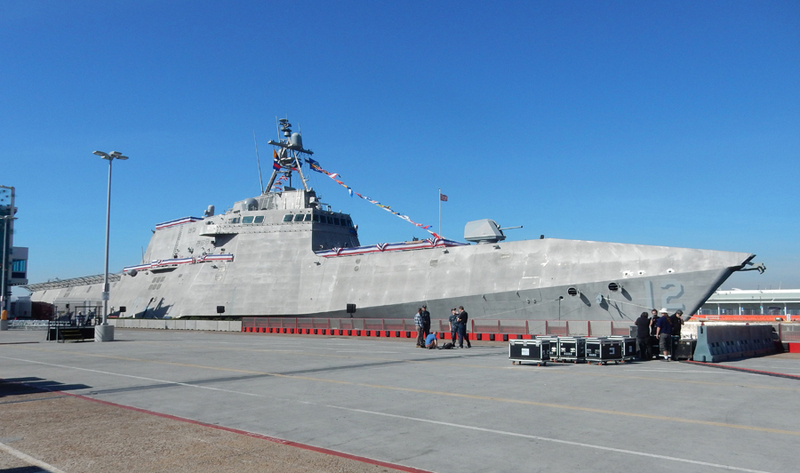 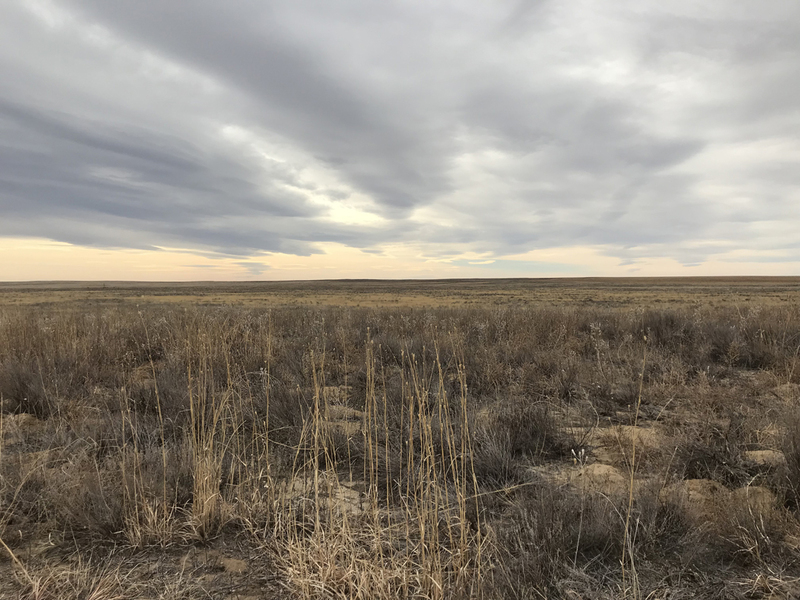 This is another NM that the Trump administration is reviewing with the objective of reducing its size. 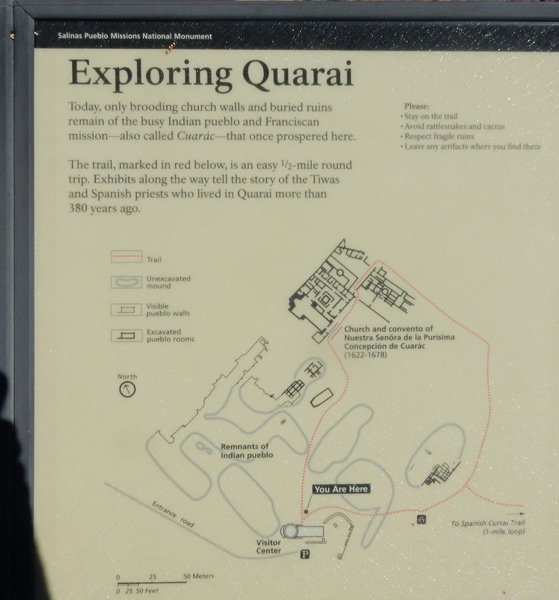 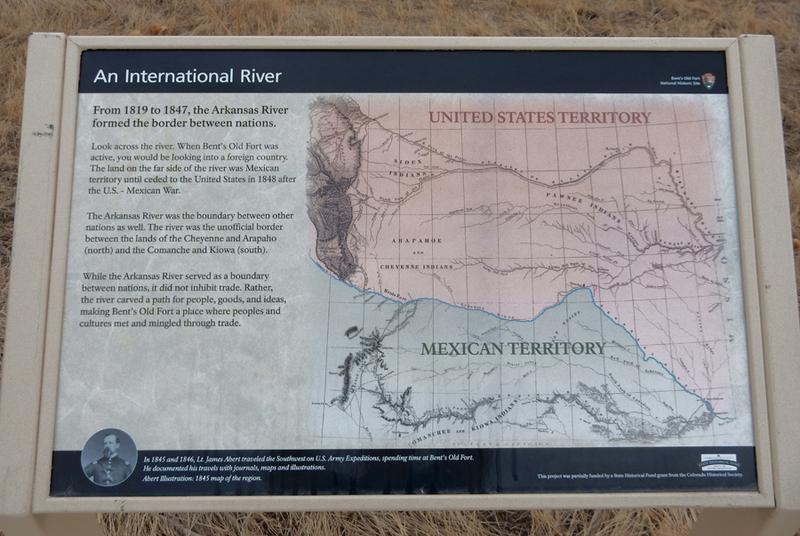 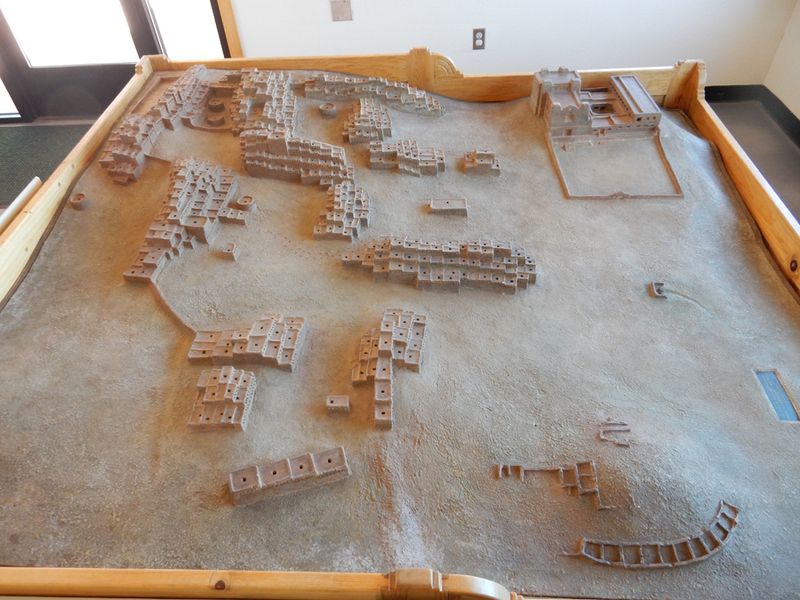 Our first stop was in the White River Narrows Archeological District. 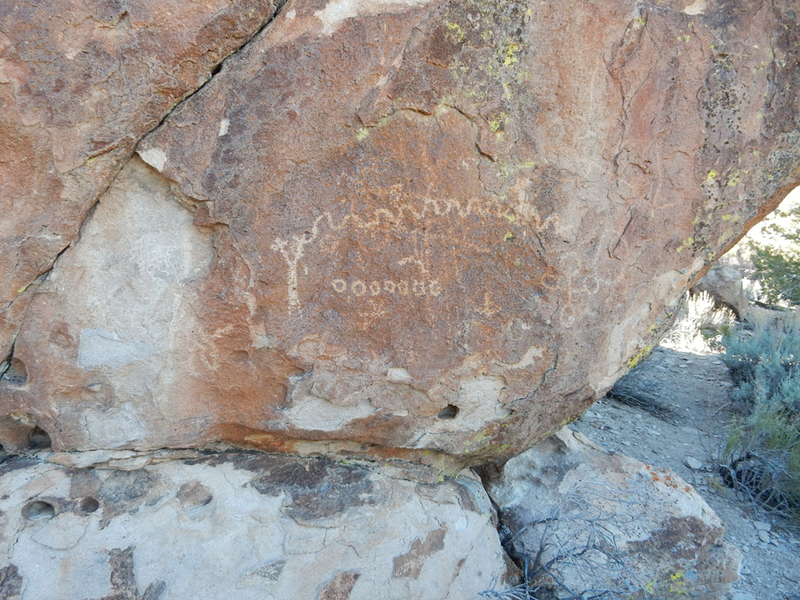 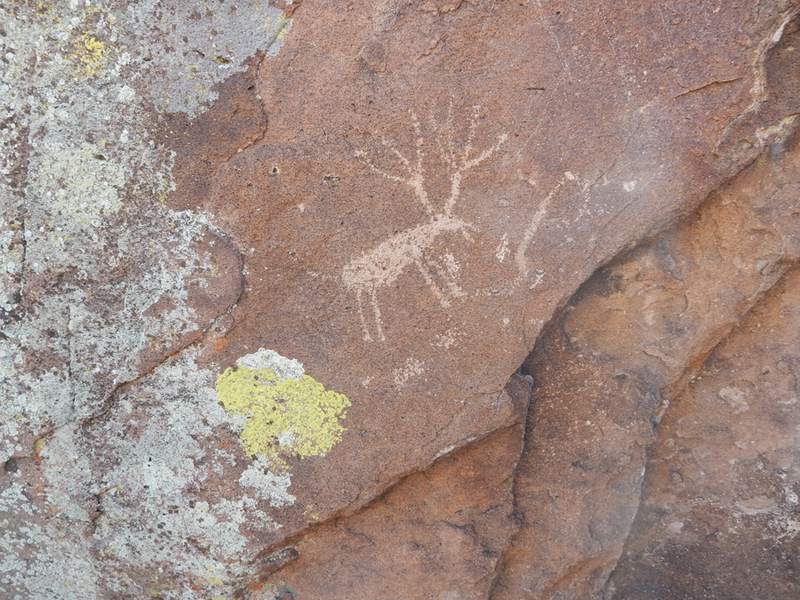 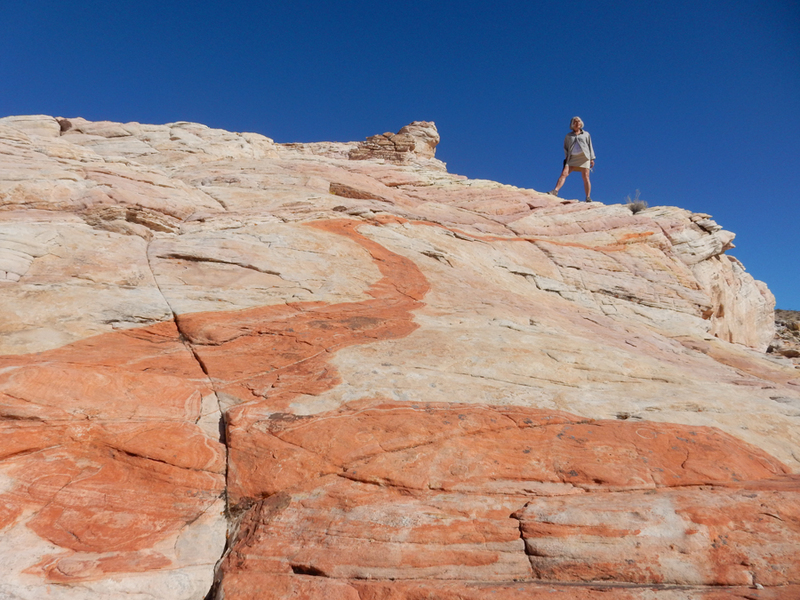 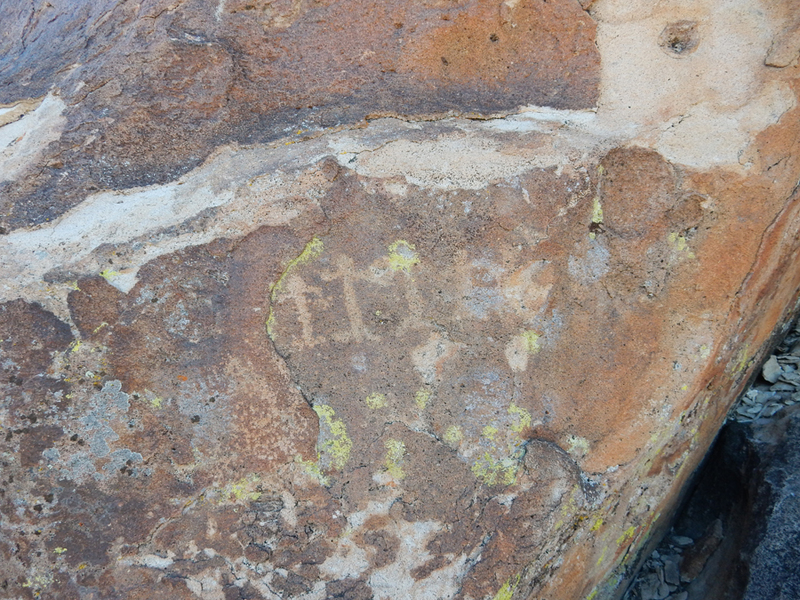 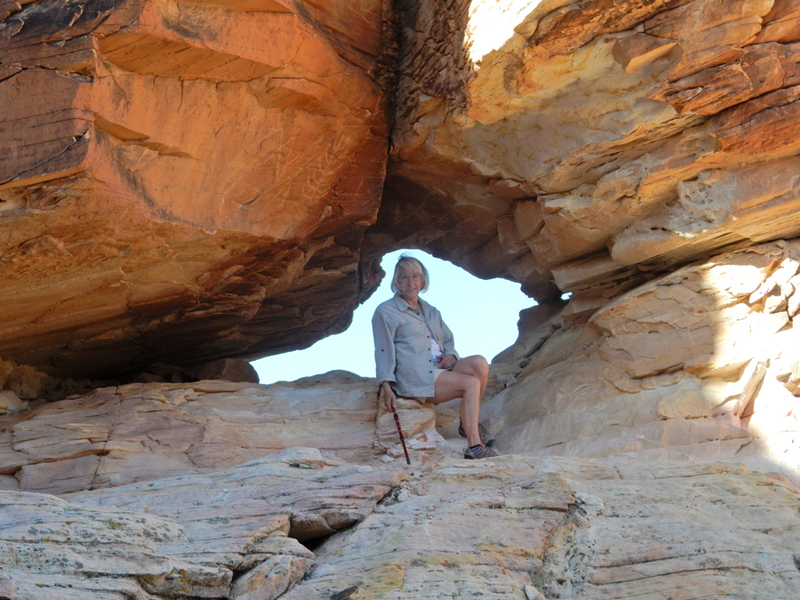 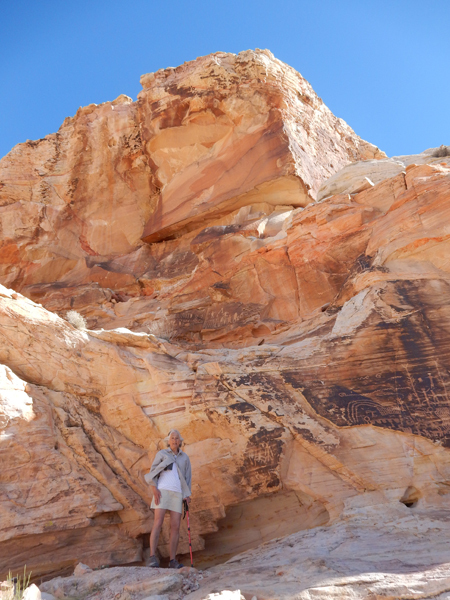 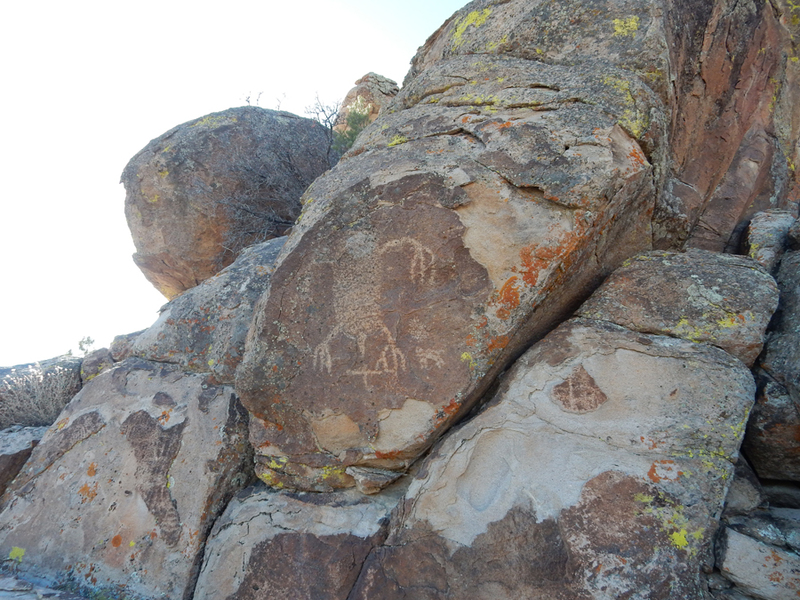 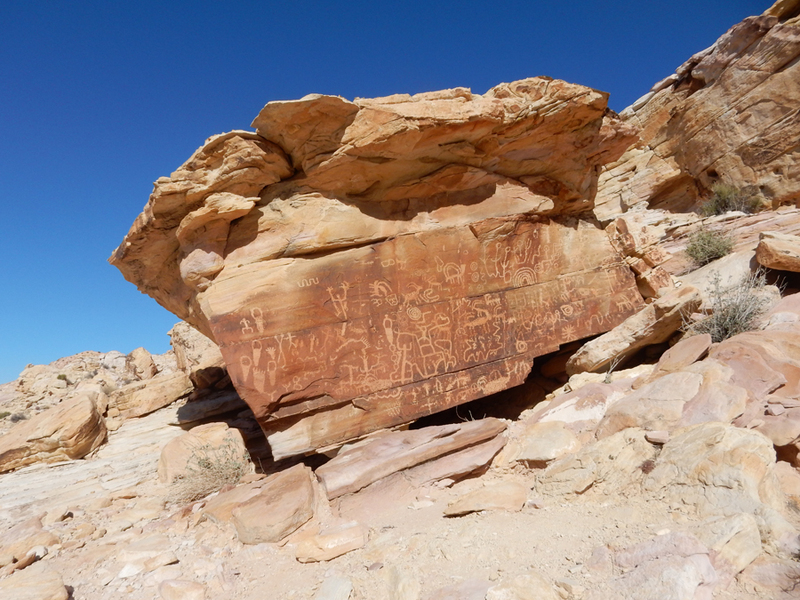 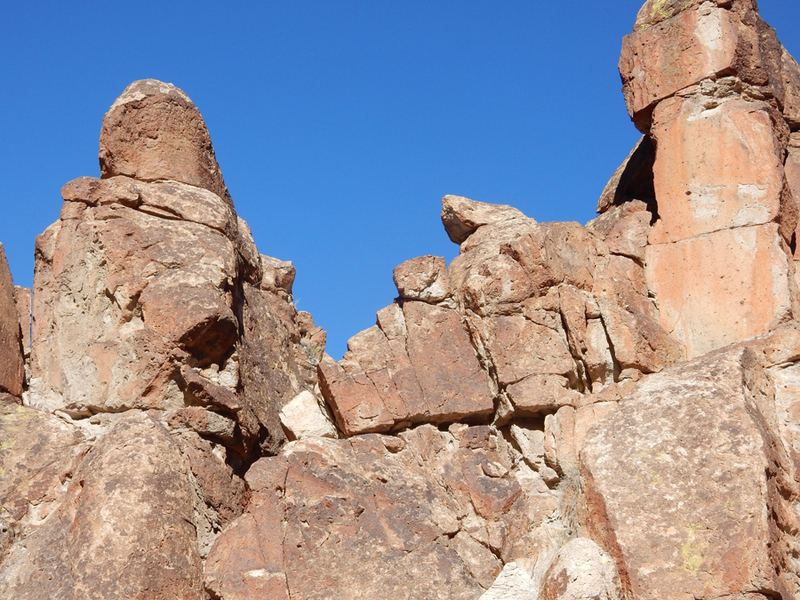 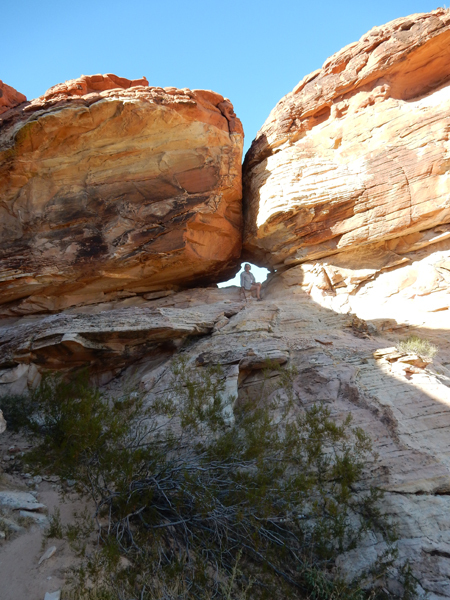 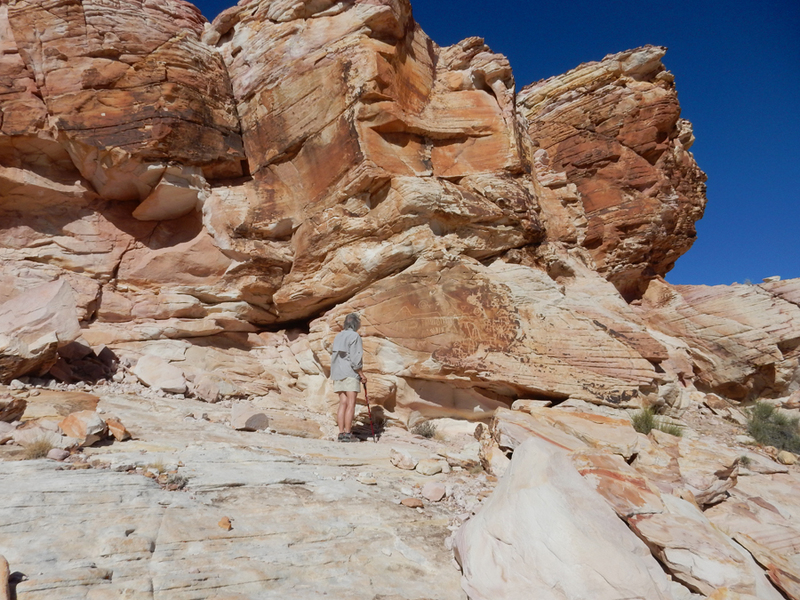 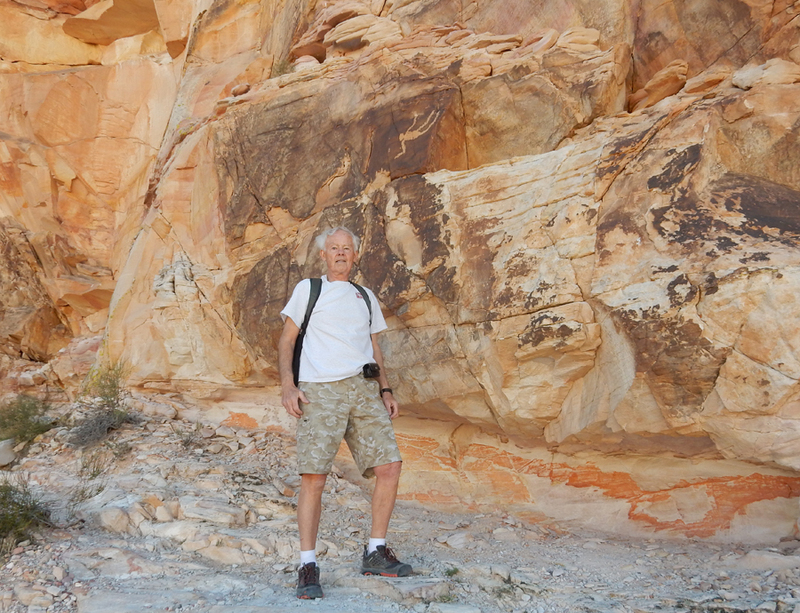 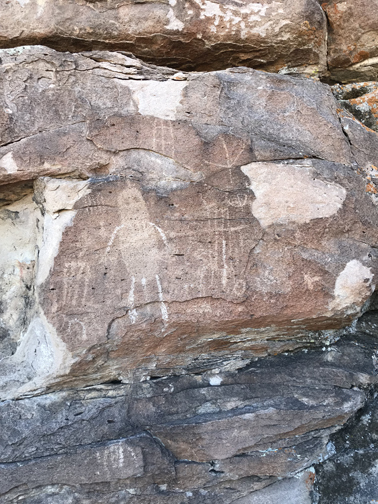 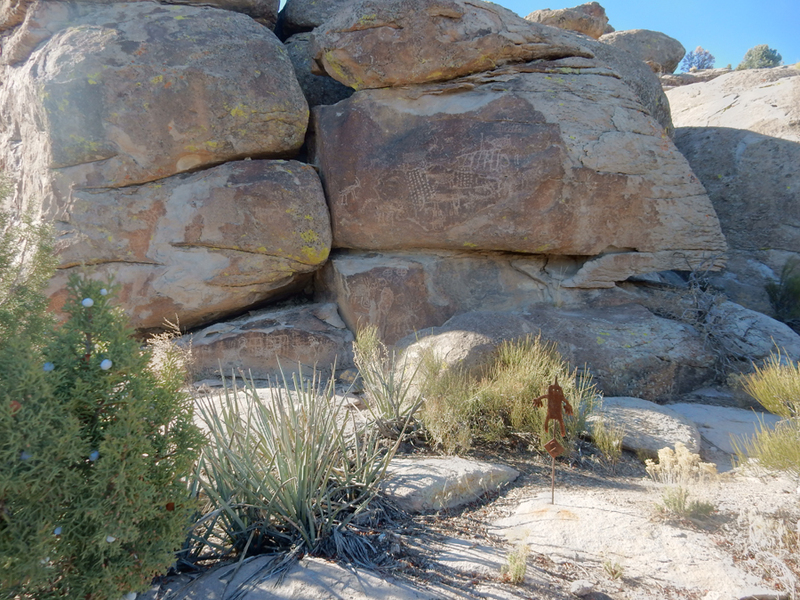 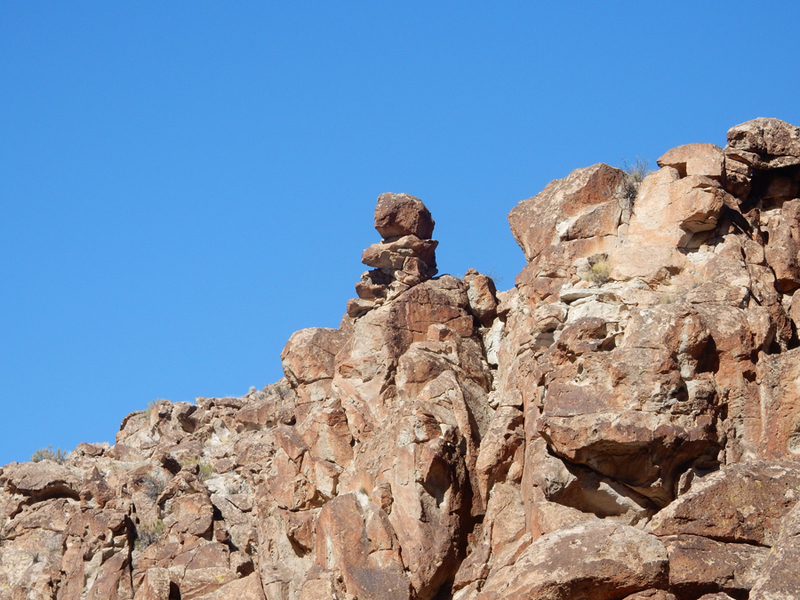 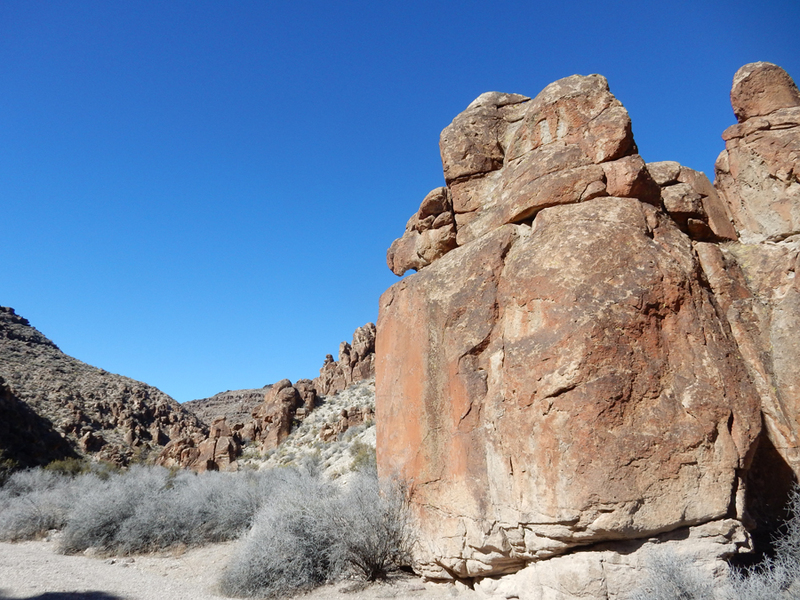 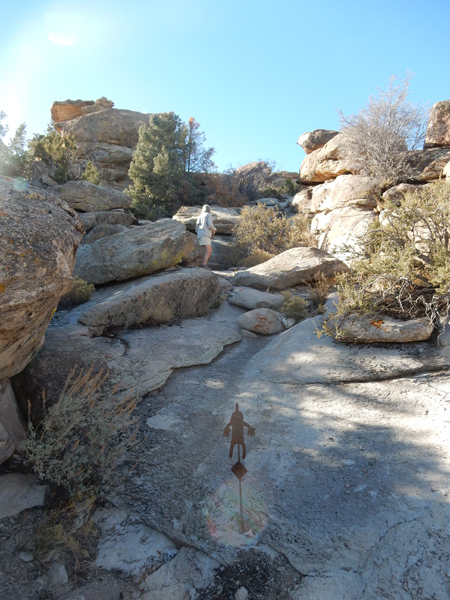 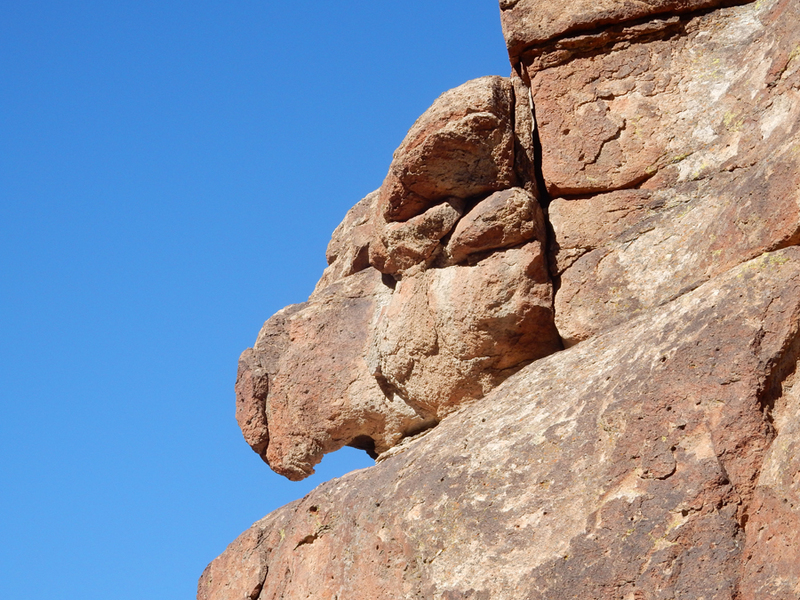 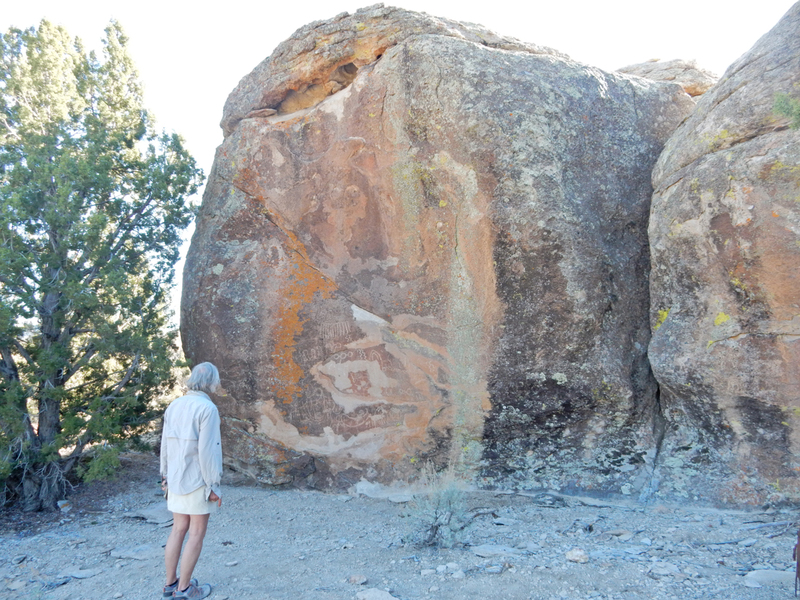 We did several short hikes to rock art locations. 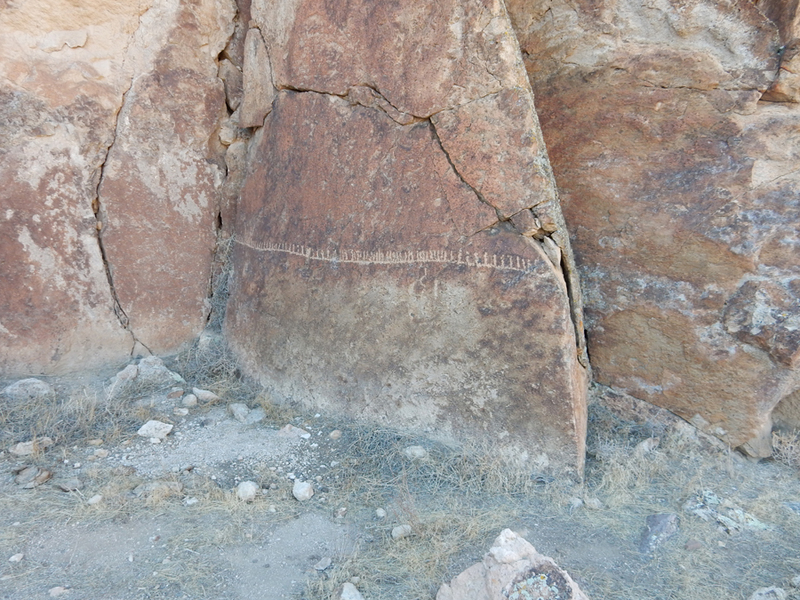 The first one was a rake-like design with serpentine and vertical lines below. 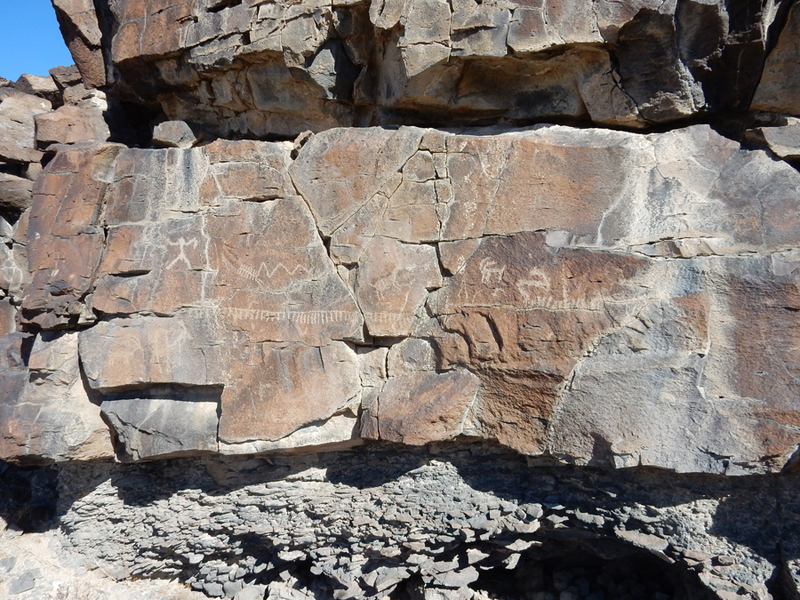 Archeologists believe this represents a game drive fence used in the canyon narrows. 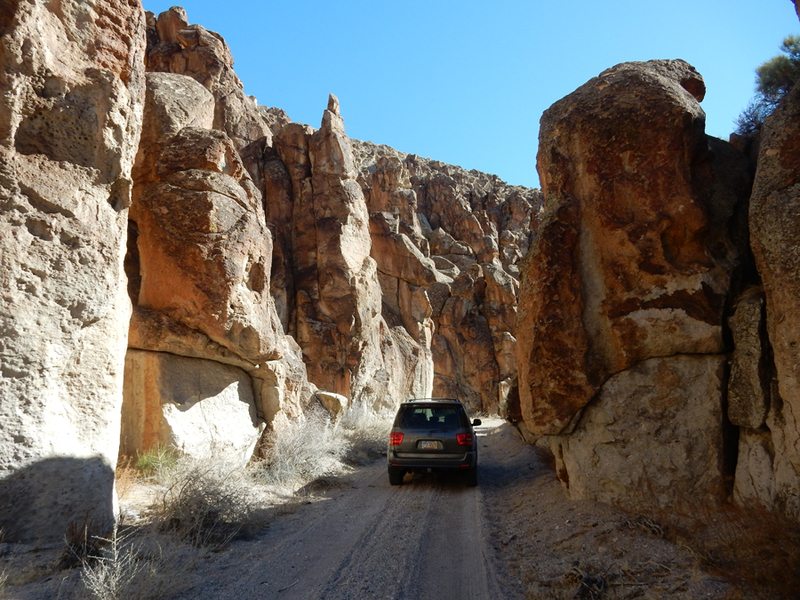 Entering the “Valley of Faces” Canyon, parked the SUV and hiked about 1.5 miles through the canyon on a cool but comfortable morning. 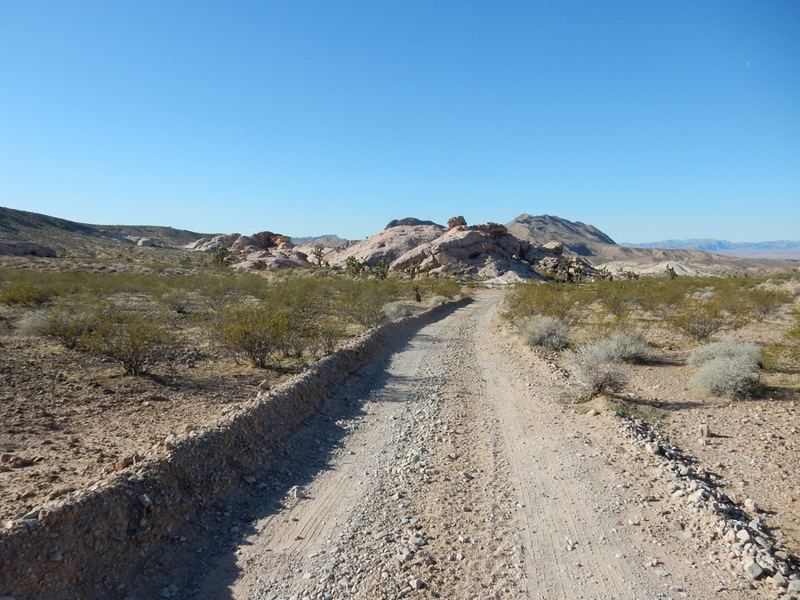 This is a two-way track! 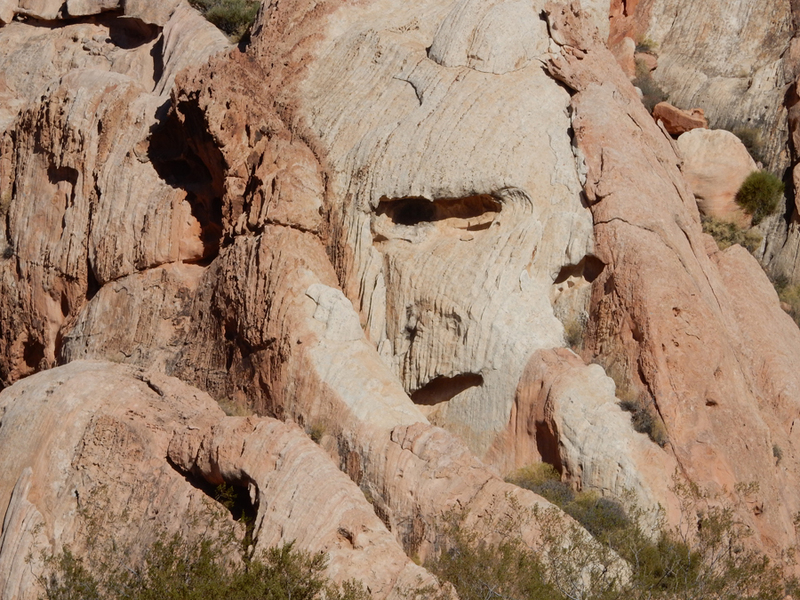 Do you see any faces? 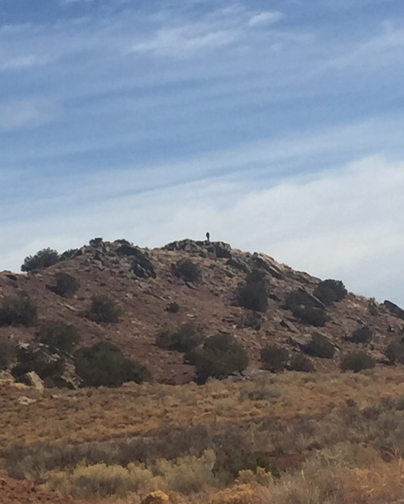 A Mt. 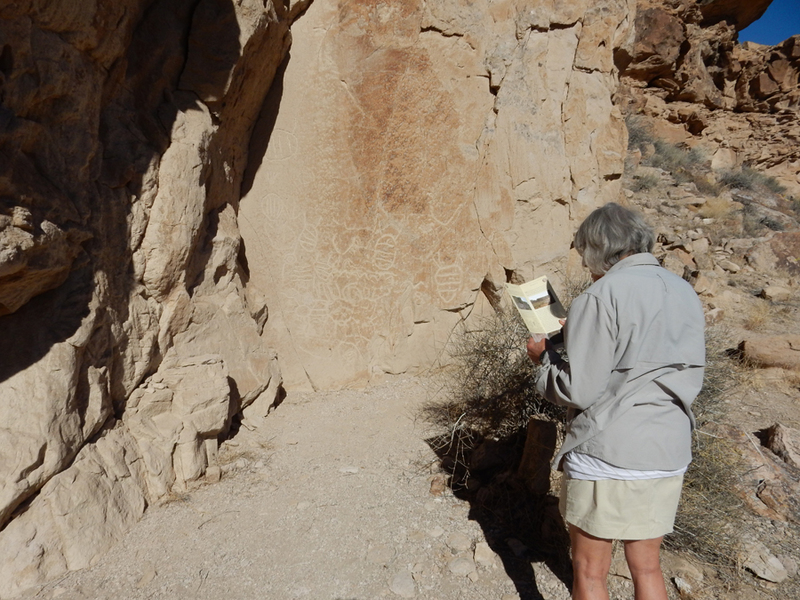 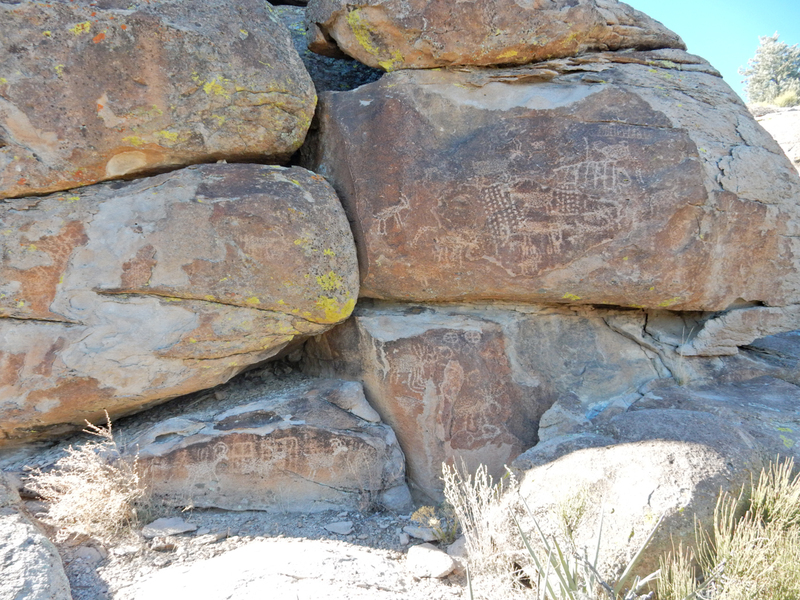 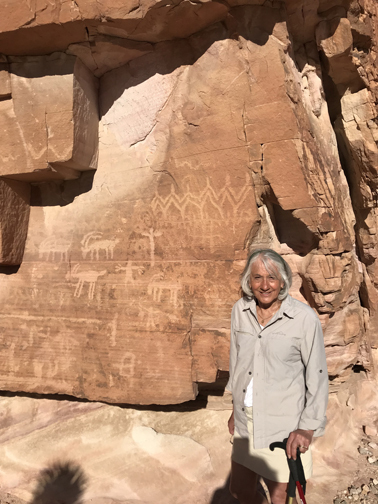 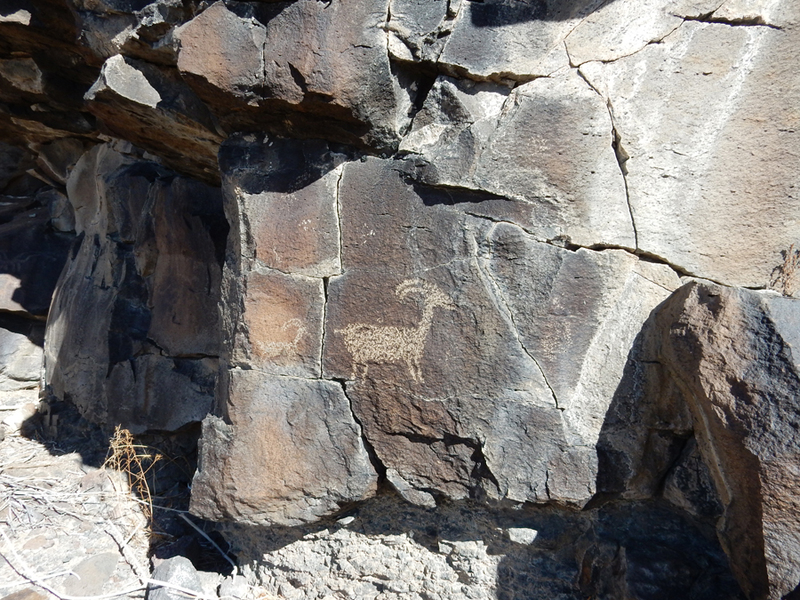 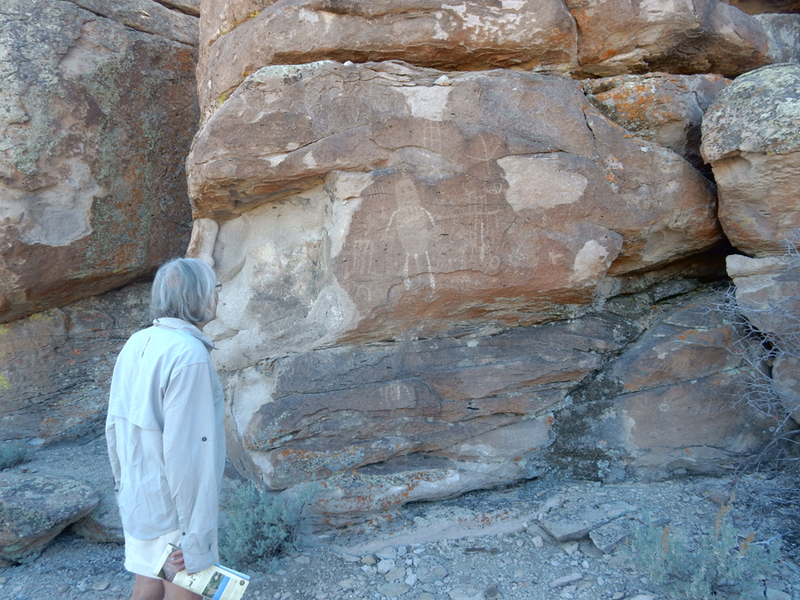 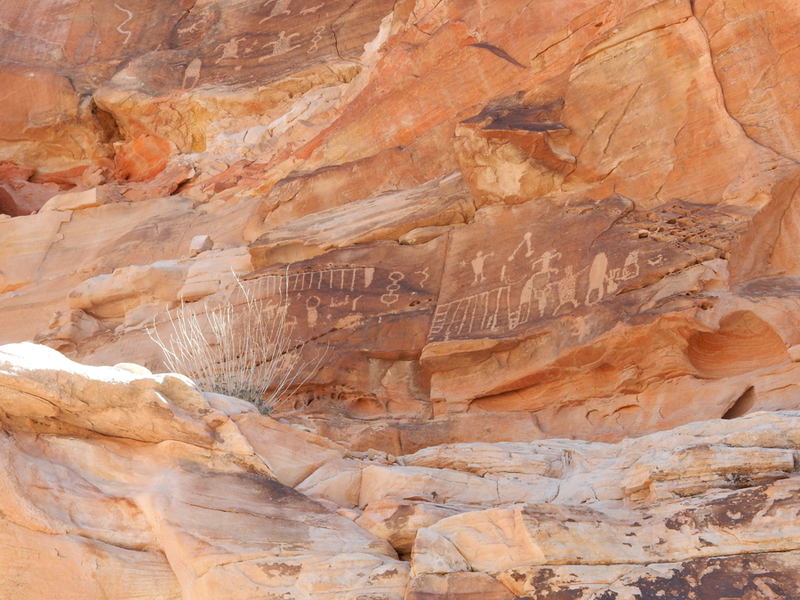 Irish BLM Rock Art Guide helped us locate petroglyphs. 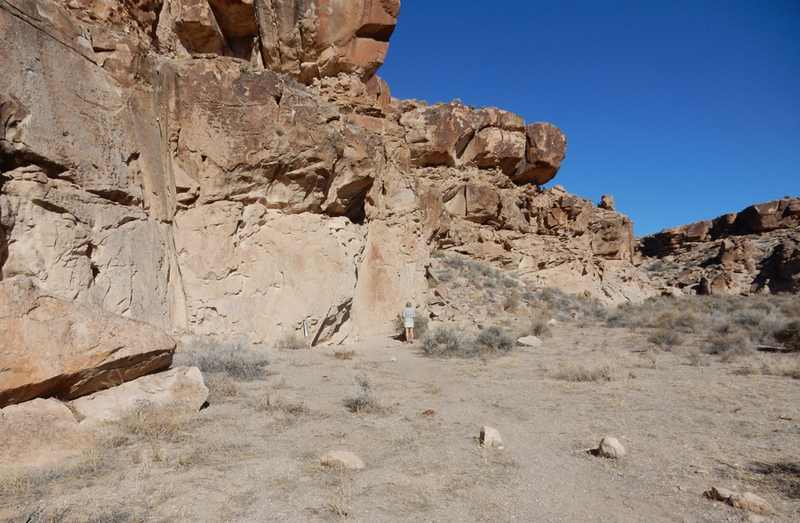 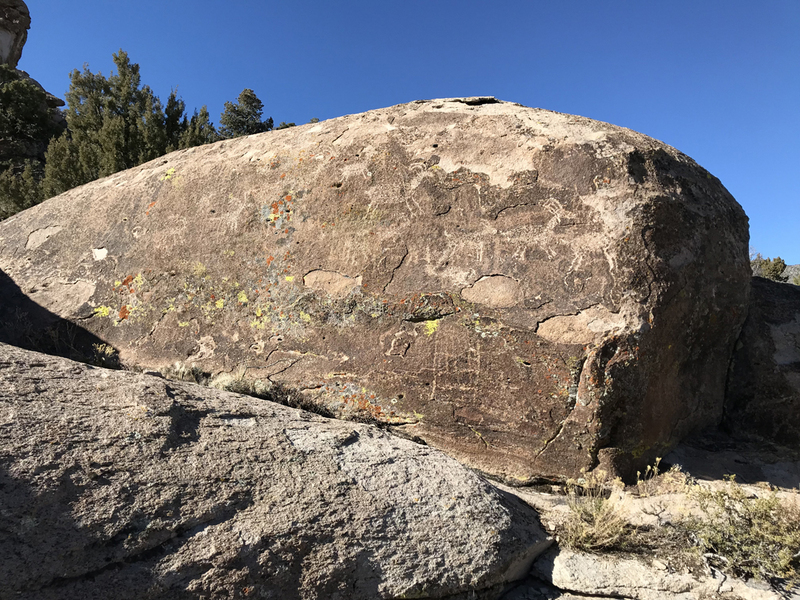 There were about 80 rock art panels at this site (IV) alone. 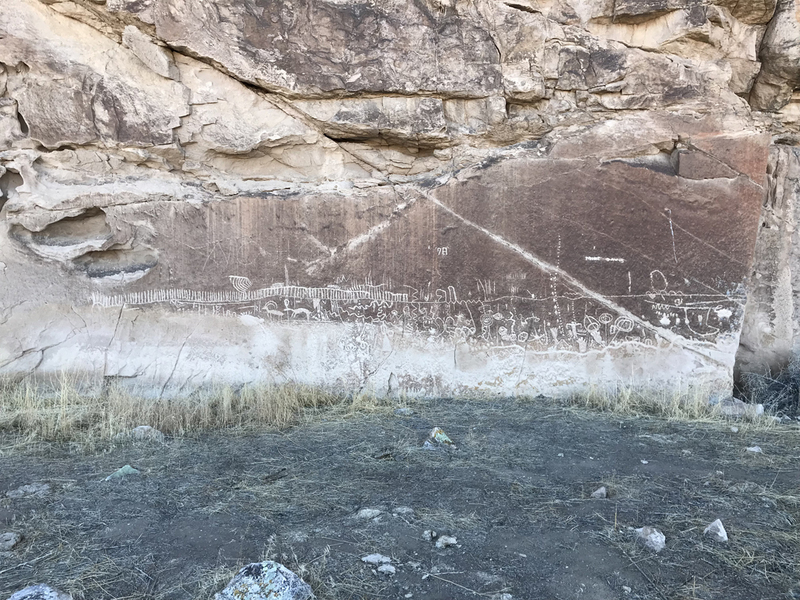 Site VI had 129 panels! 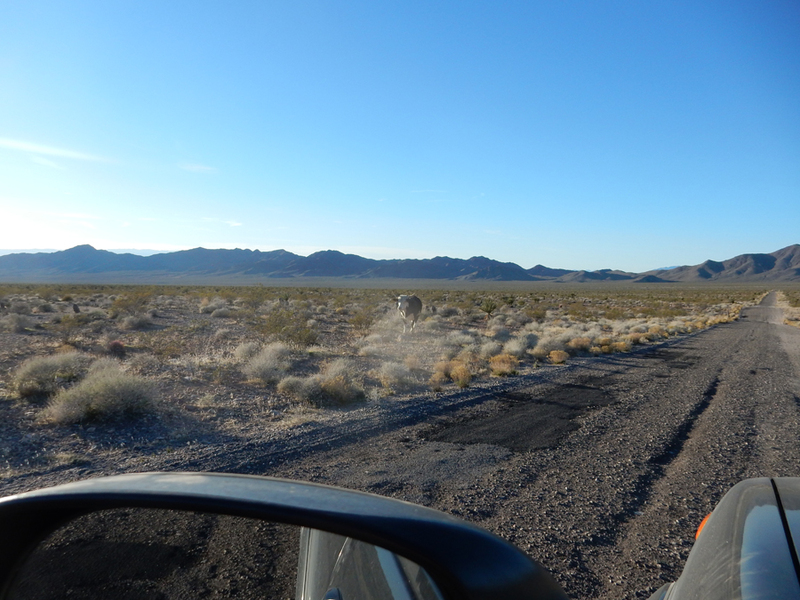 NV SR375 is known as the Extraterrestrial Highway. 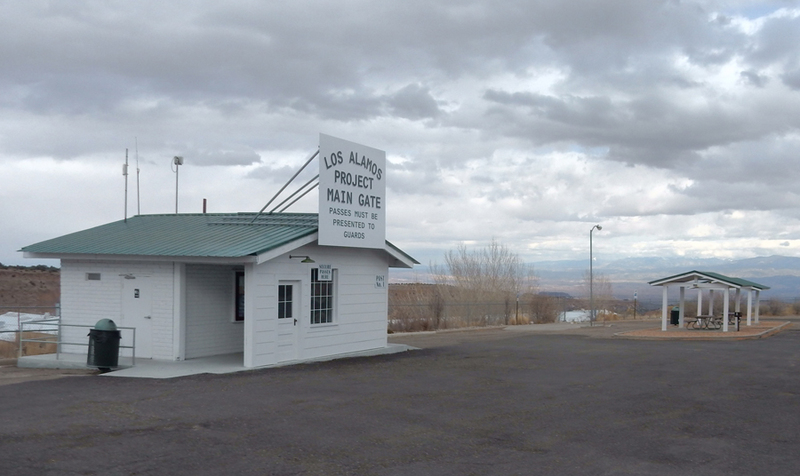 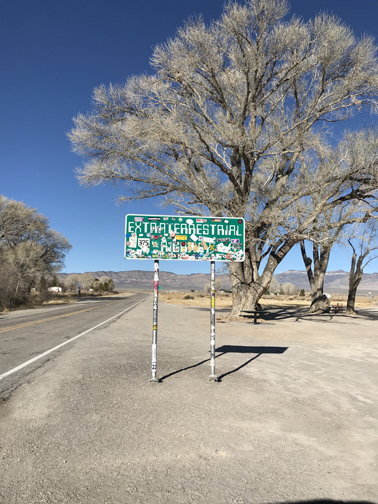 The top-secret Area 51 base is near the highway. 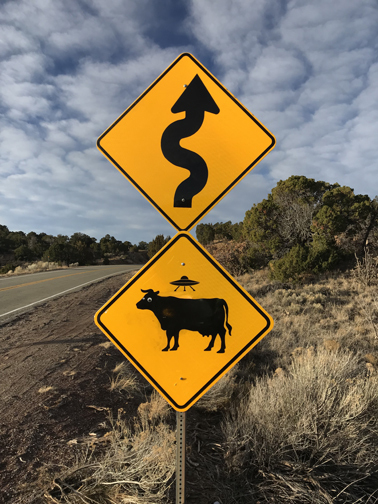 Many travelers have reported UFO observations and other strange alien activity along this road. 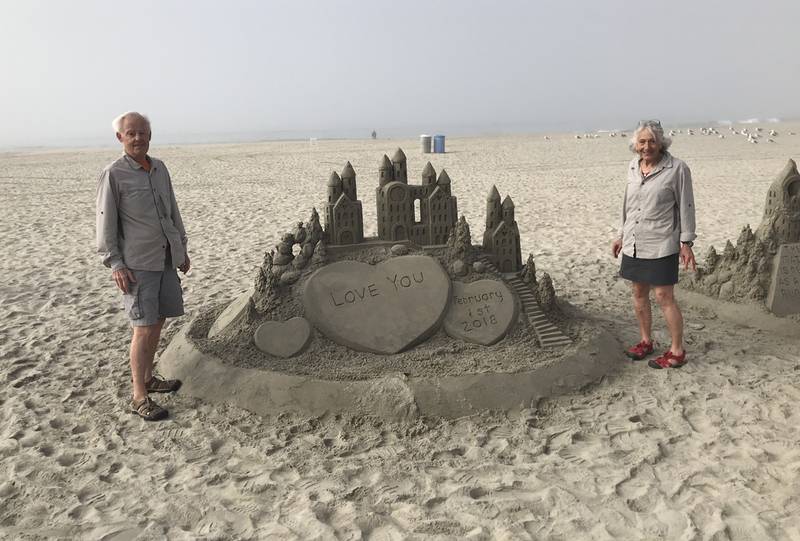 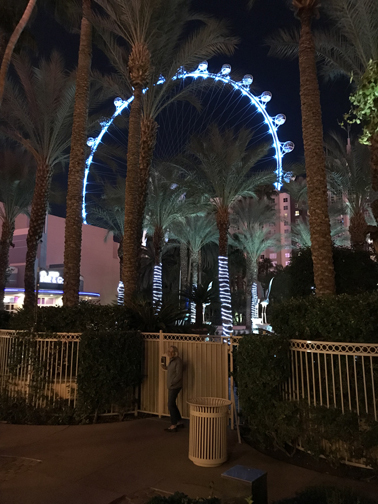 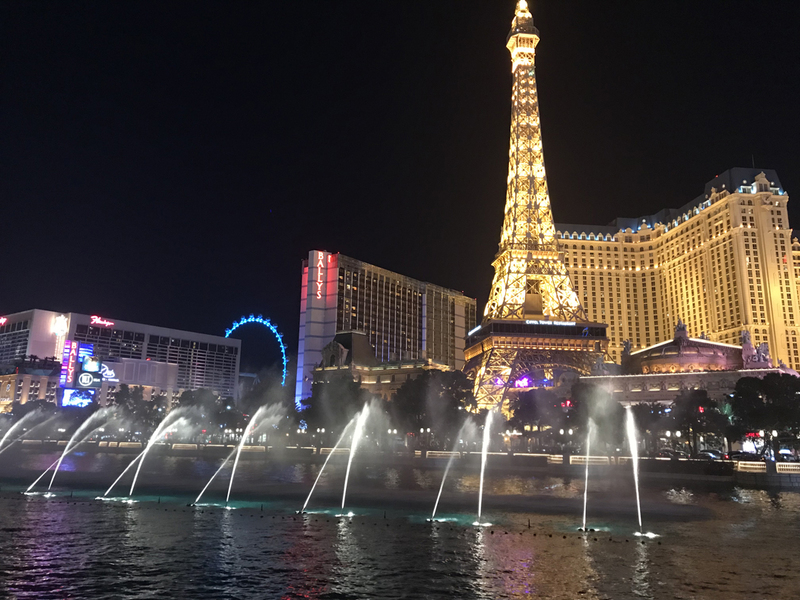 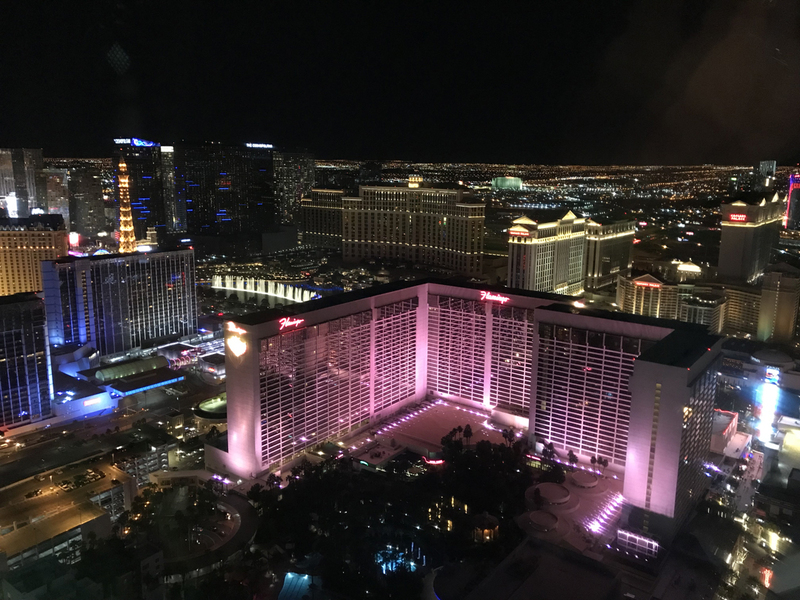 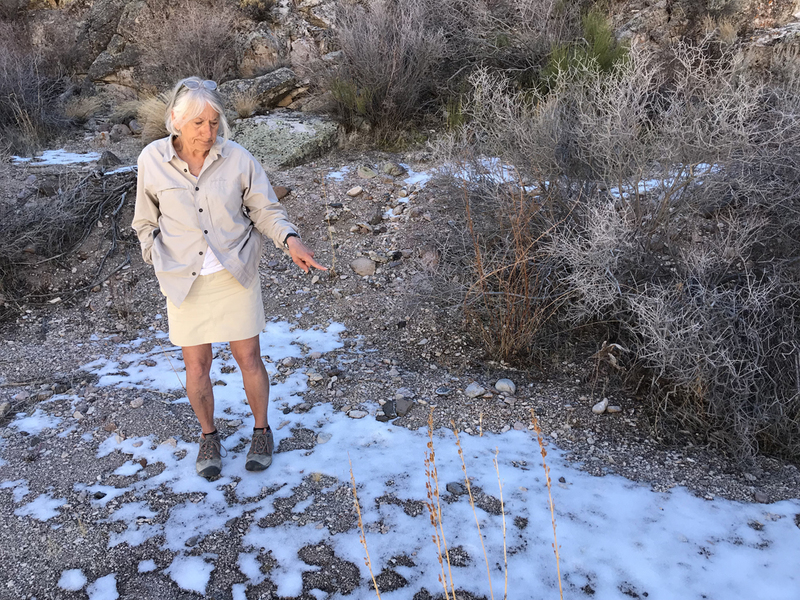 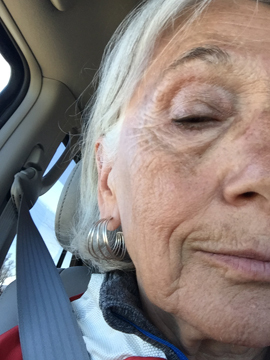 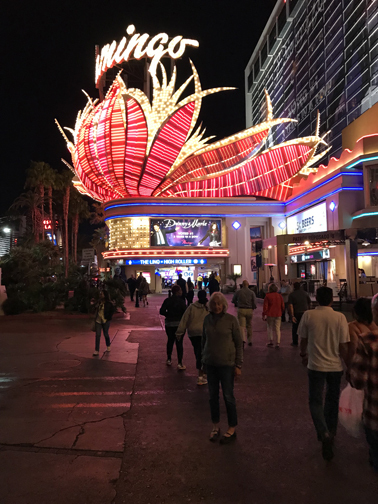 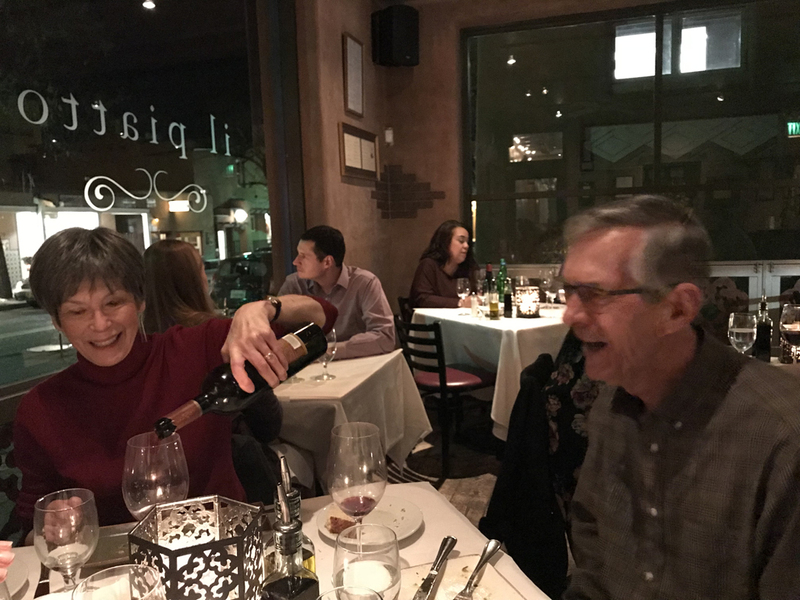 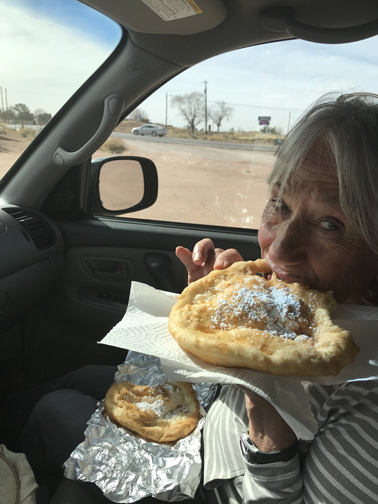 2/8 Th – We had to return to Mesquite NV to retrieve our pillows and Helen’s stitching scissors from the Holiday Inn where we stayed two days earlier. 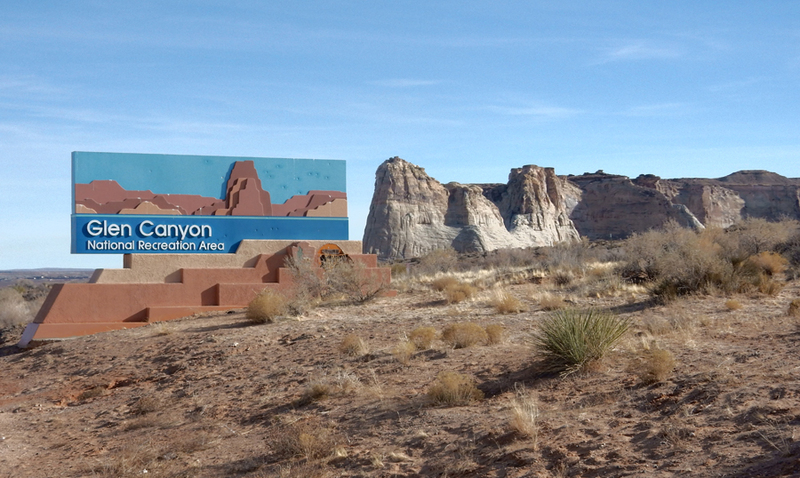 As a result, we drove through southern Utah on our way to Flagstaff AZ. 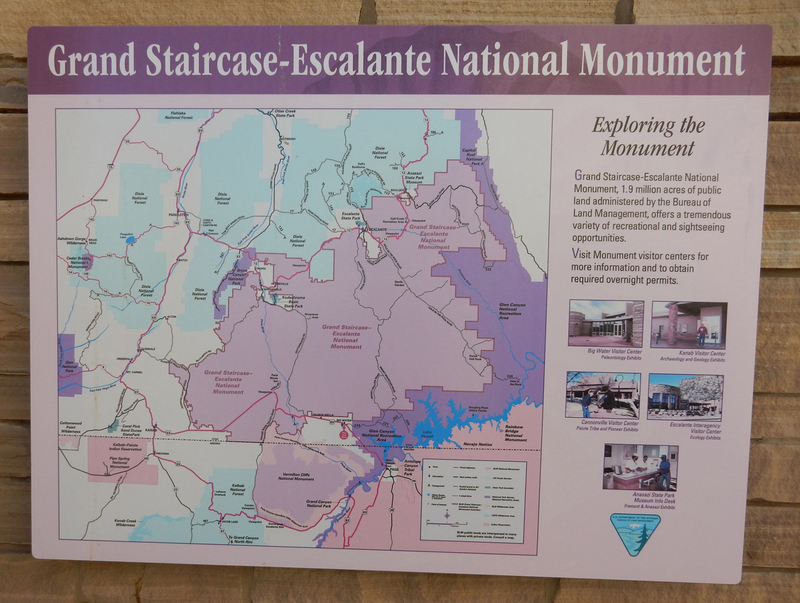 Stopped briefly at the Grand Staircase Escalante National Monument Visitor Center on US 89, it was closed. 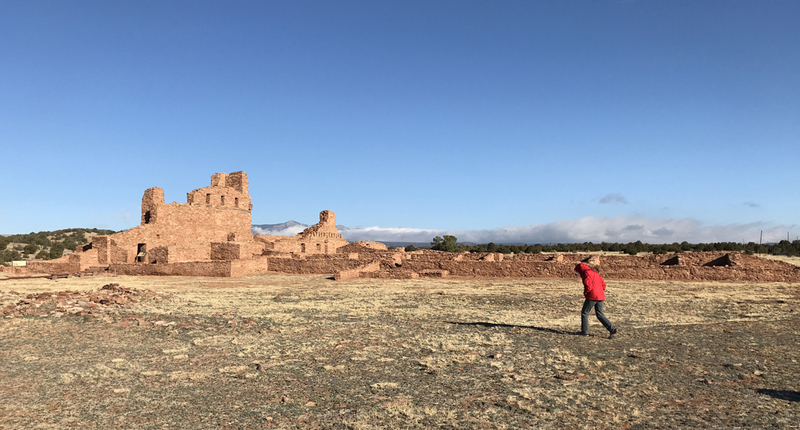 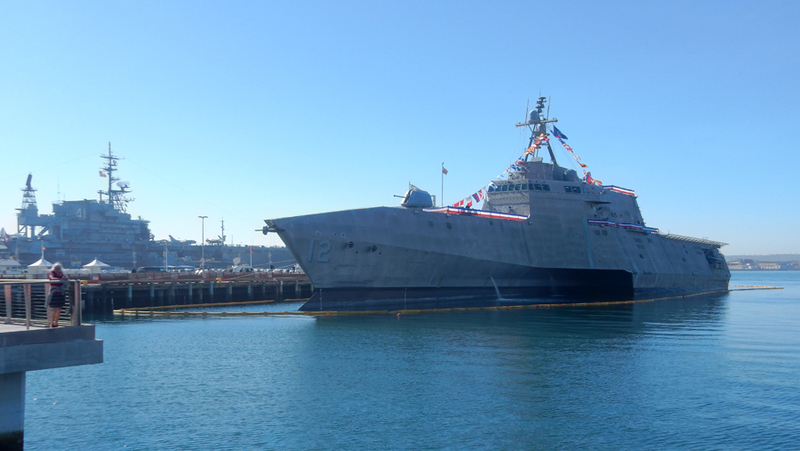 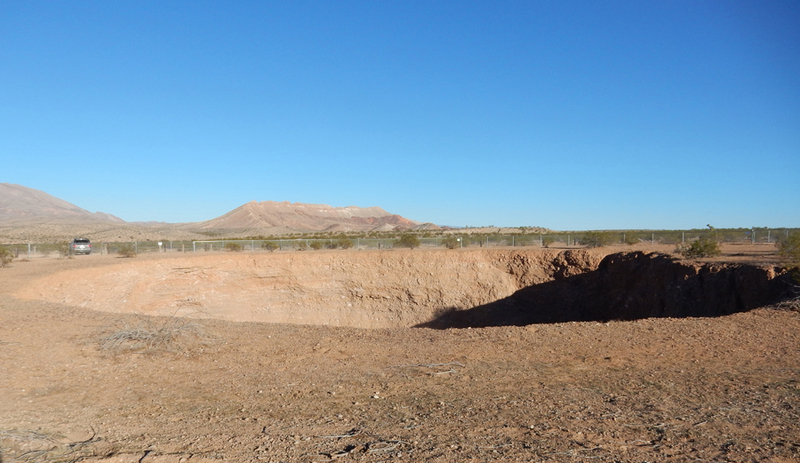 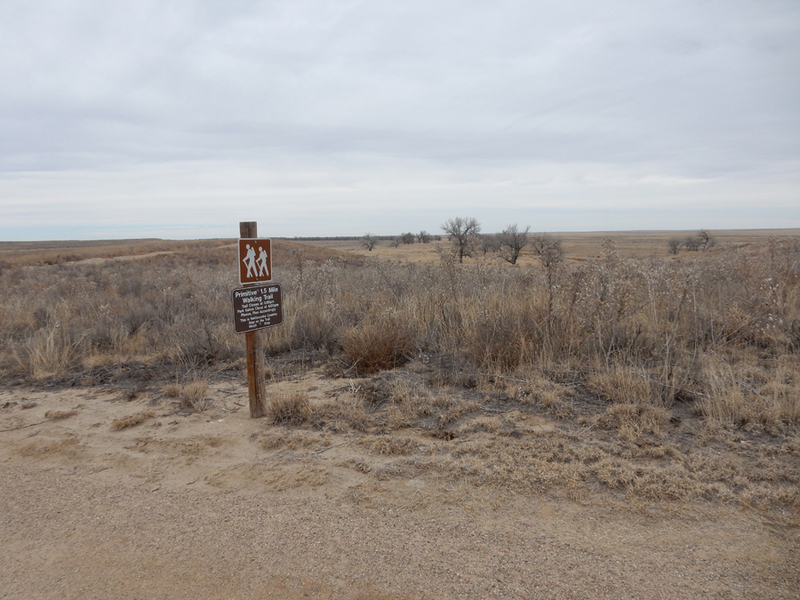 Trump reduced this NM to about half its original size in February of 2018. 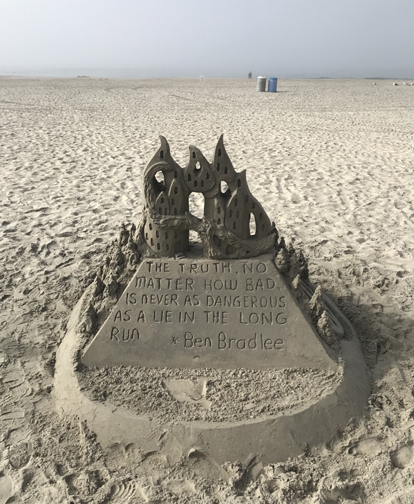 I hope our legal system rejects this unprecedented move. 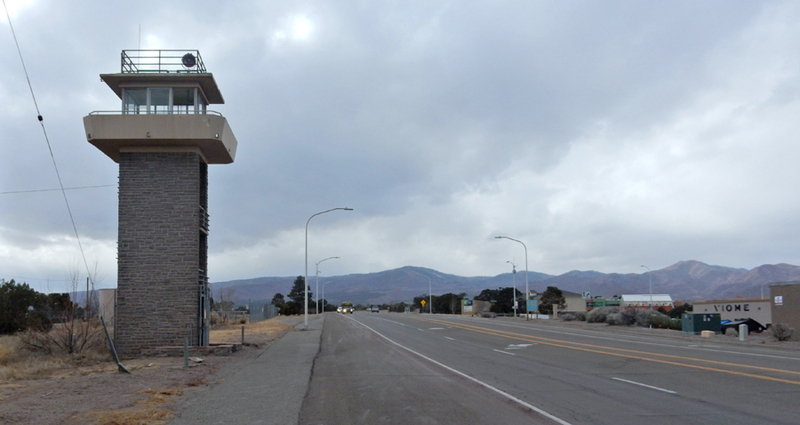 Continued South on US 89 toward Flagstaff. 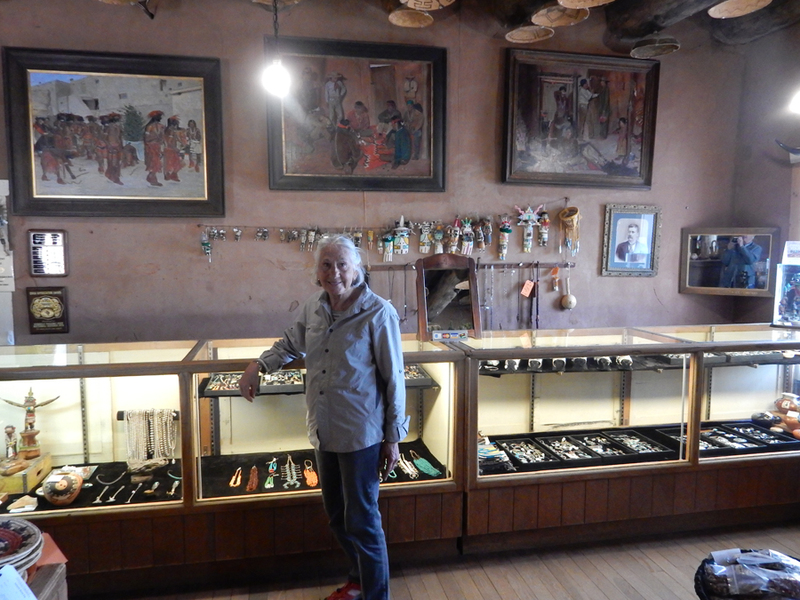 Helen bought a nickel silver Navajo bracelet from an old Navajo woman sitting along the road. 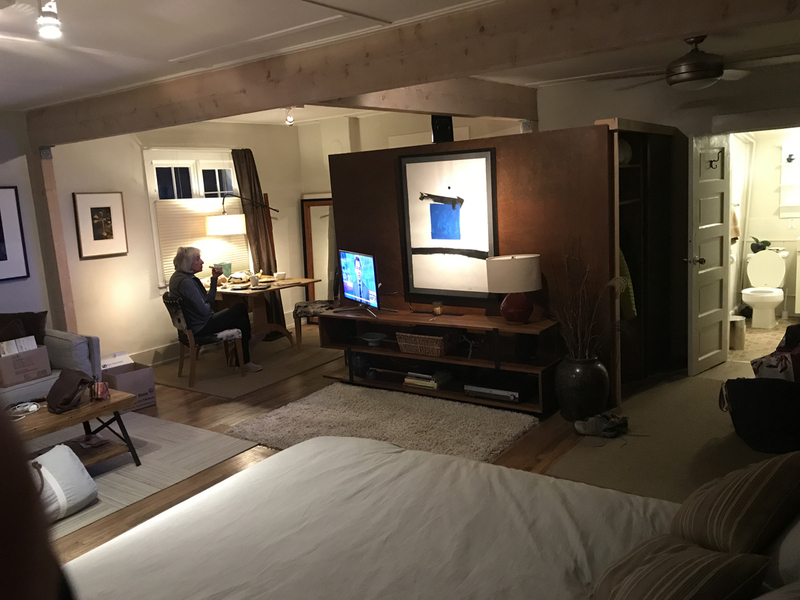 We arrived at our Airbnb about 6pm. 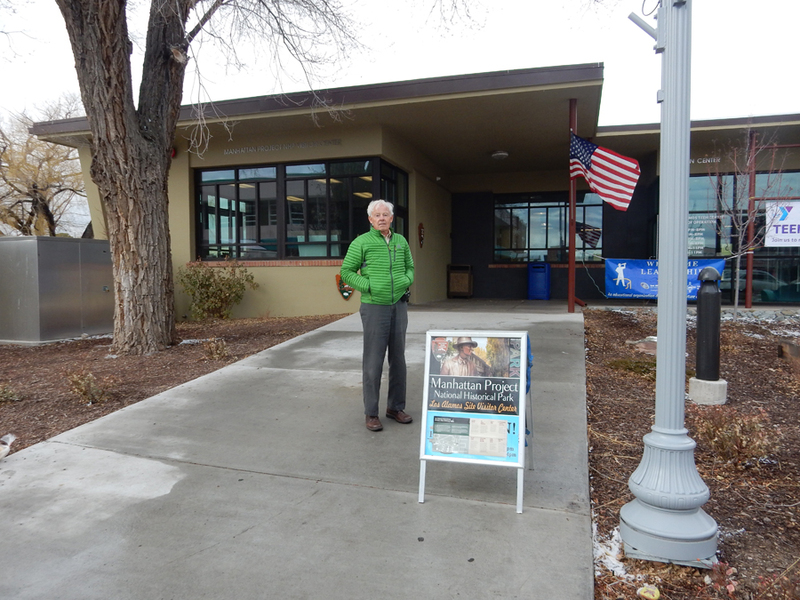 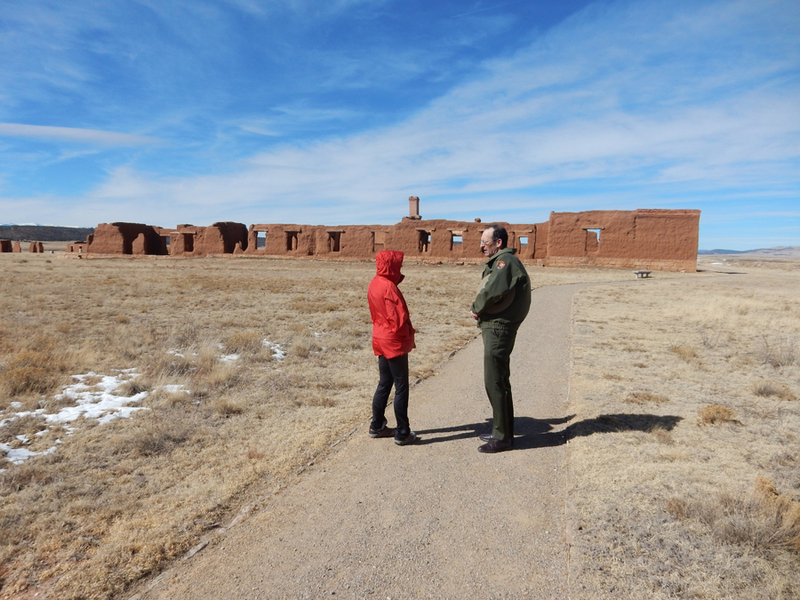 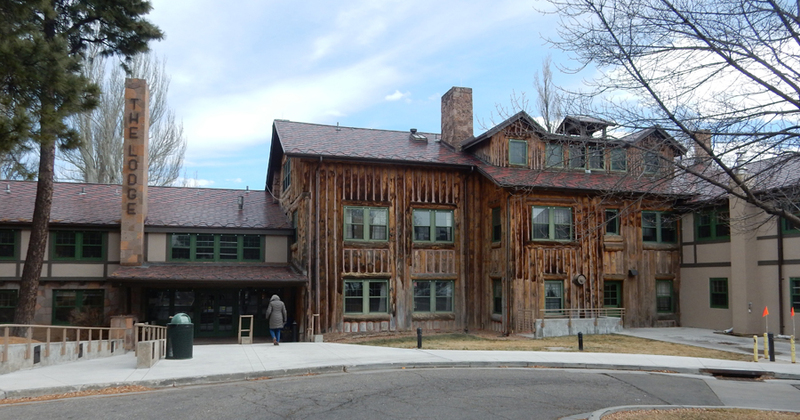 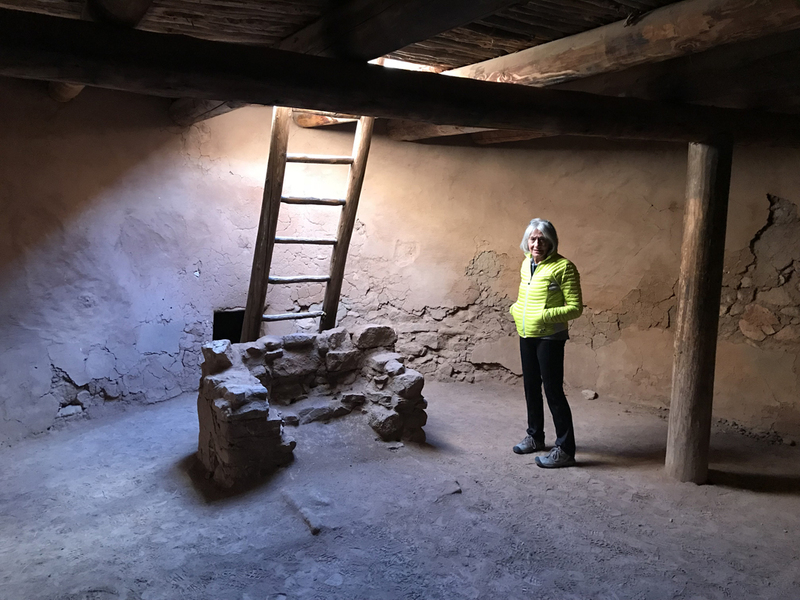 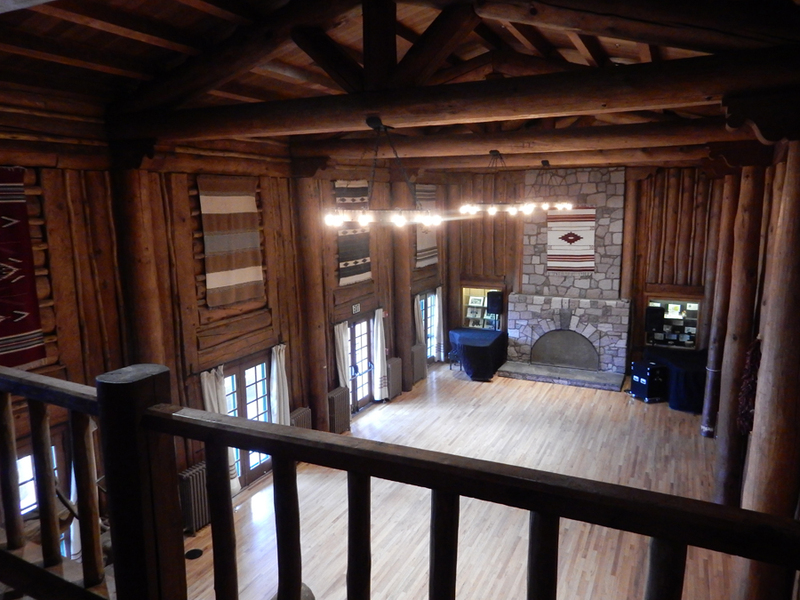 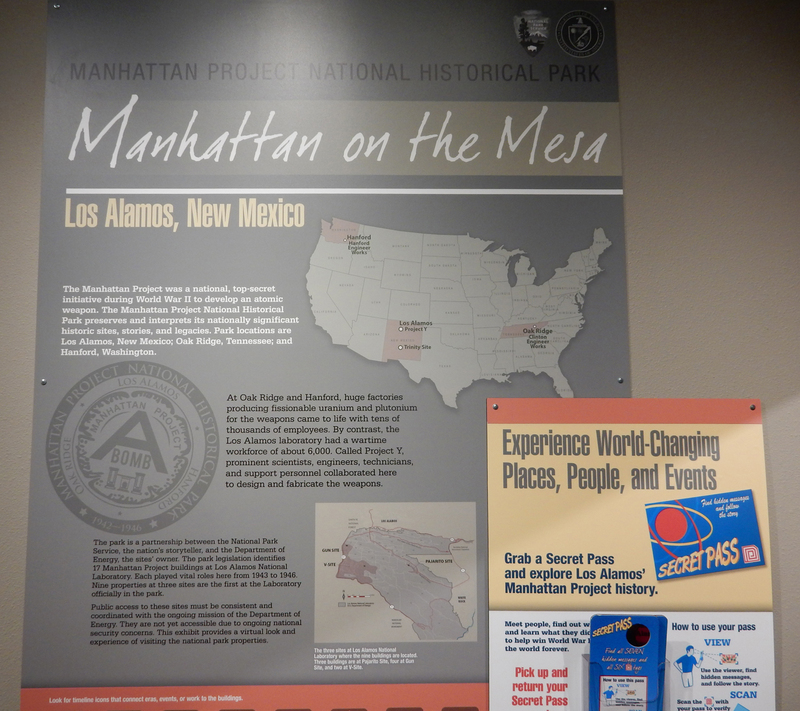 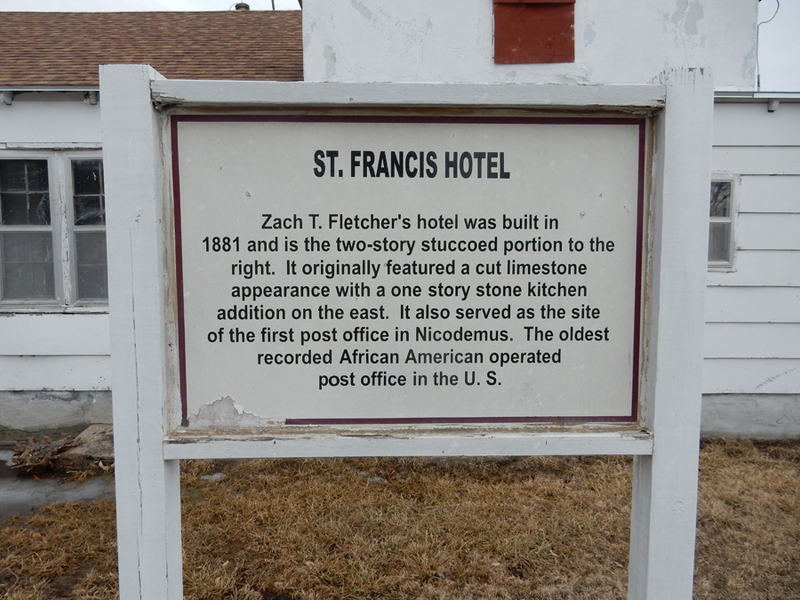 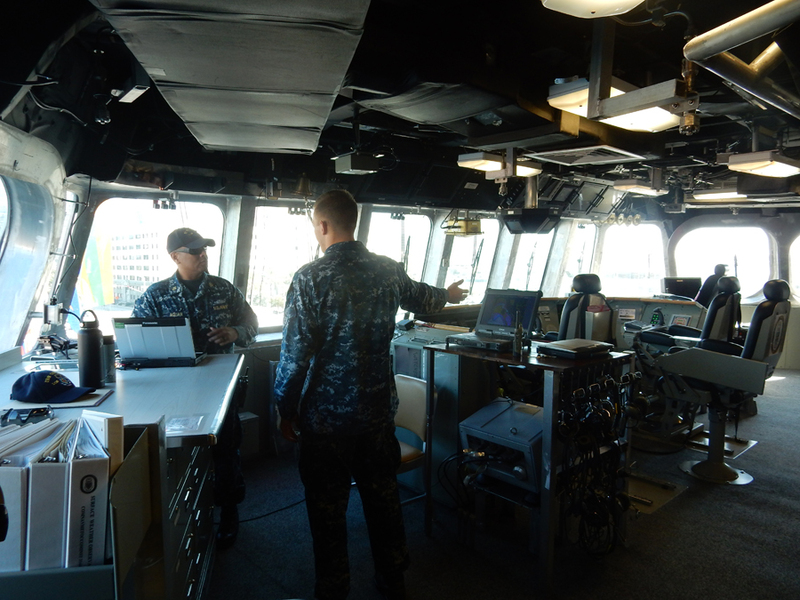 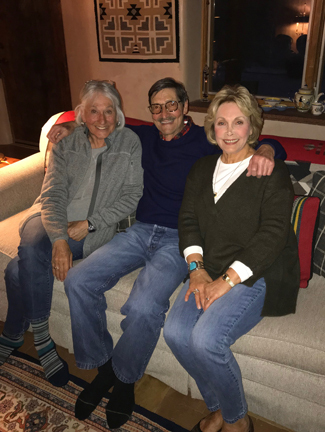 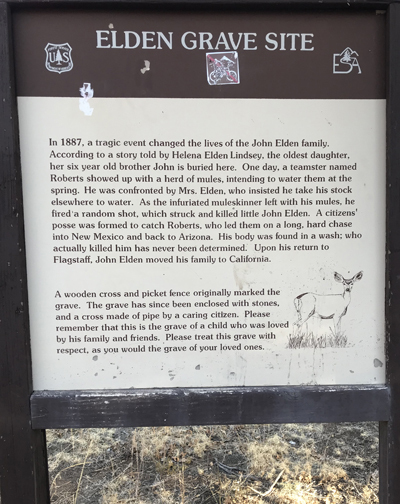 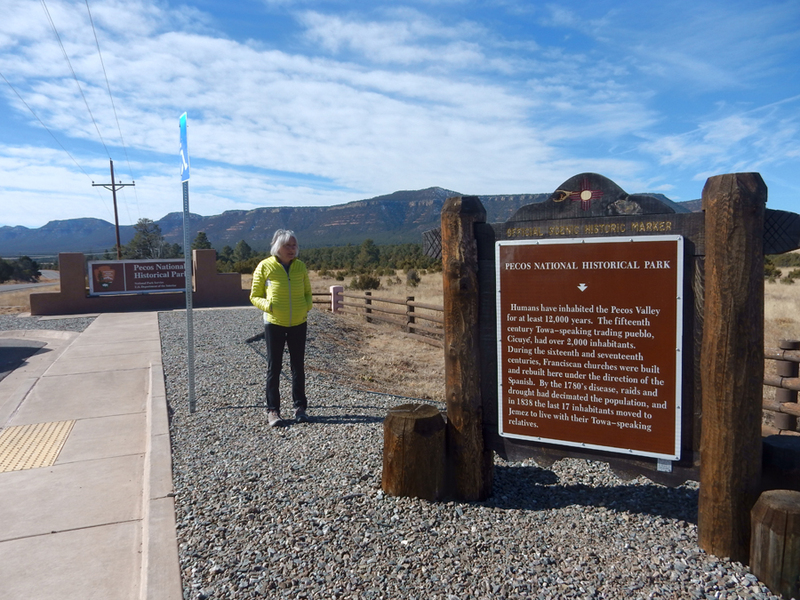 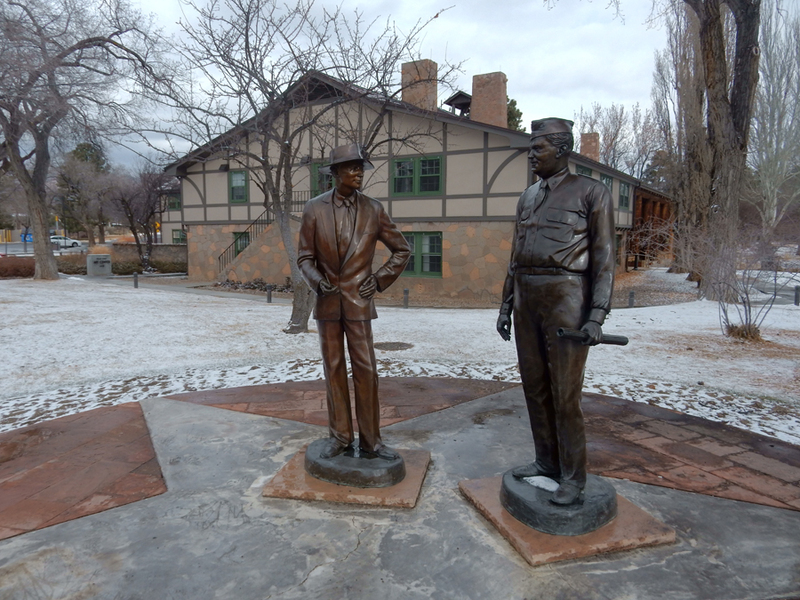 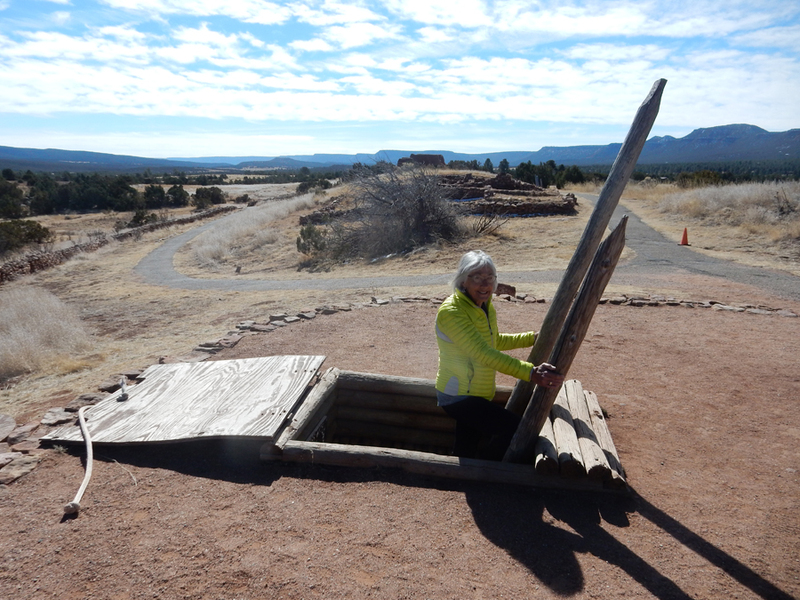 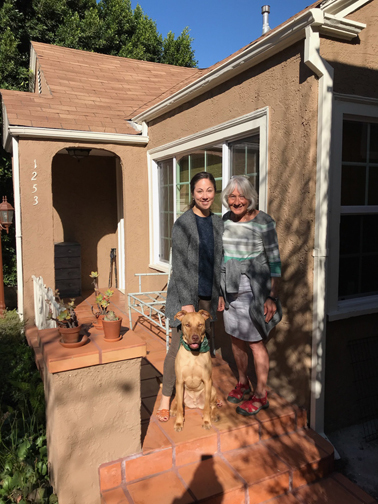 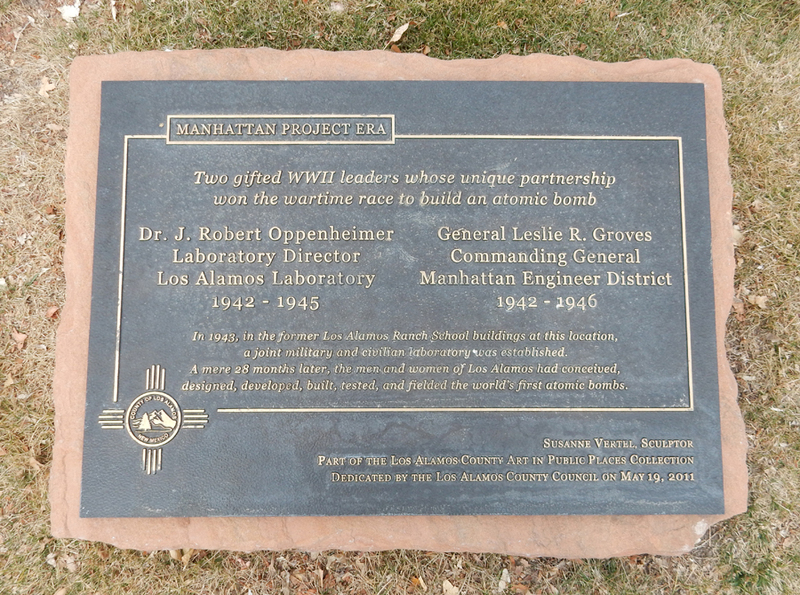 2/9 F – Flagstaff – Met with a realtor and toured 3 houses. 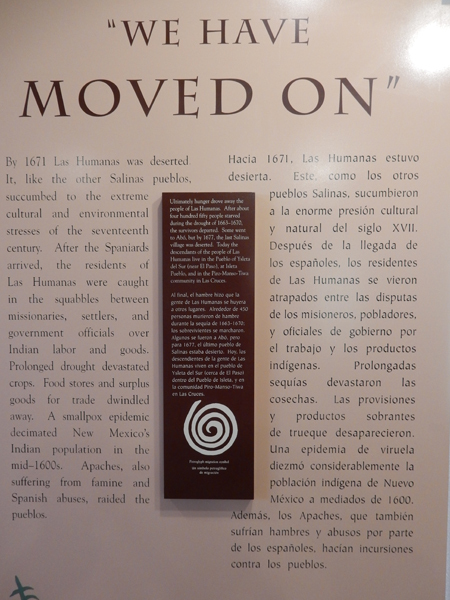 Decided that this was not the right place for us, at least right now. 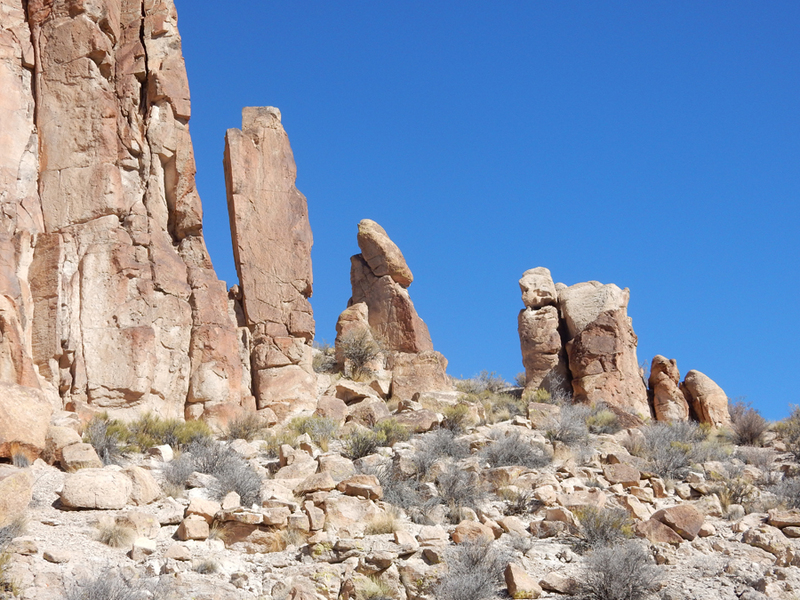 I did a nice hike in the foothills just north of the city while Helen was baking scones with Kyrie. 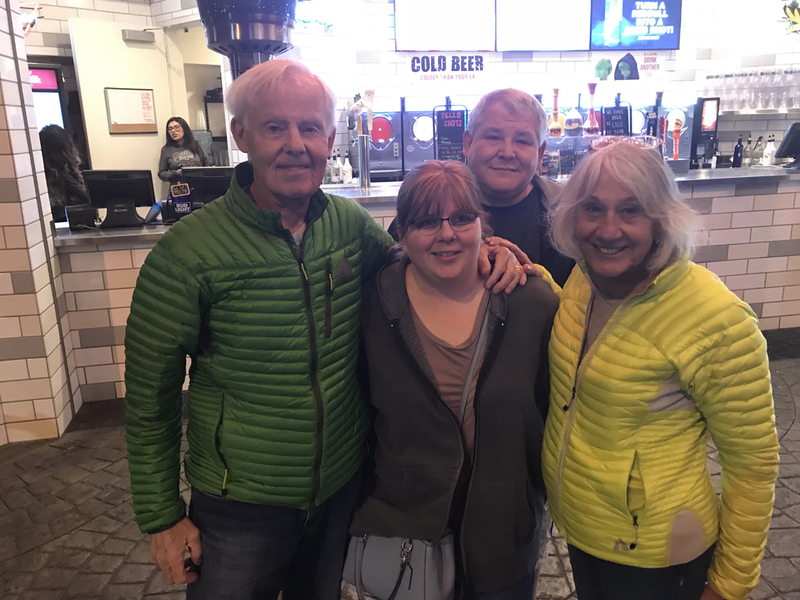 We had a fun game of Farkle with our hosts Chris and Kyrie that evening. 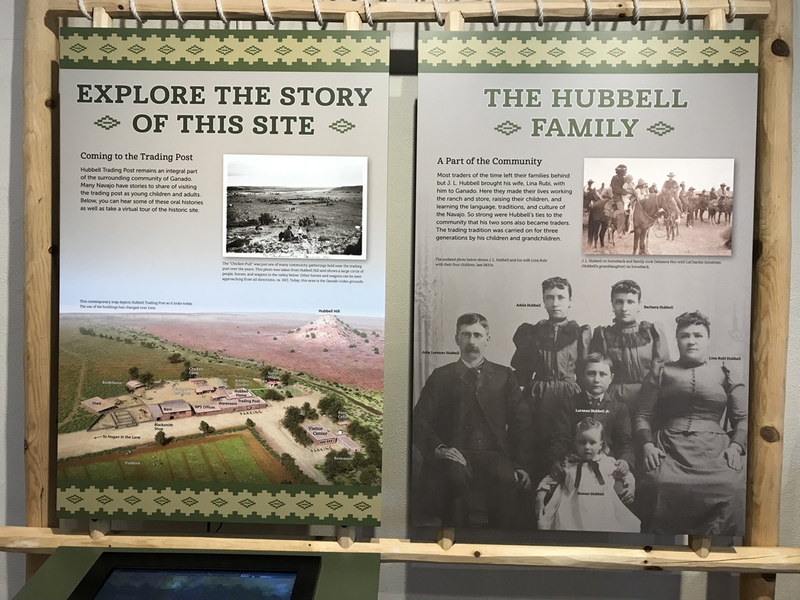 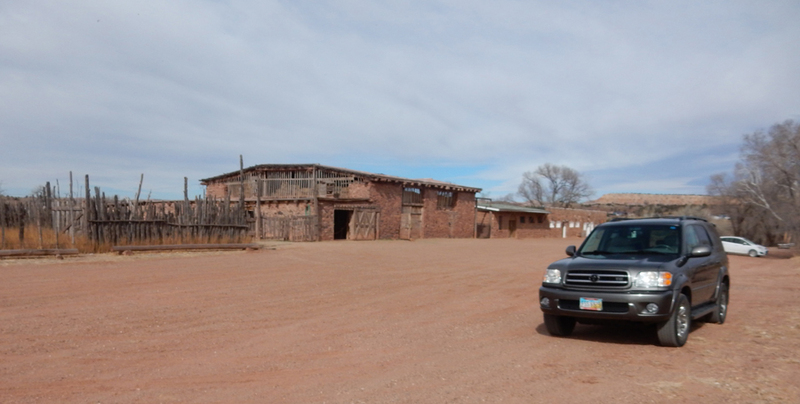 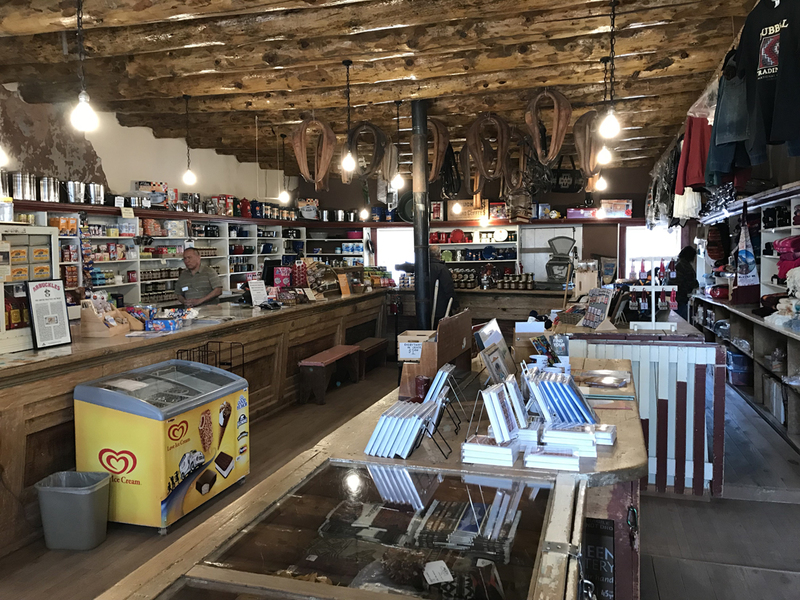 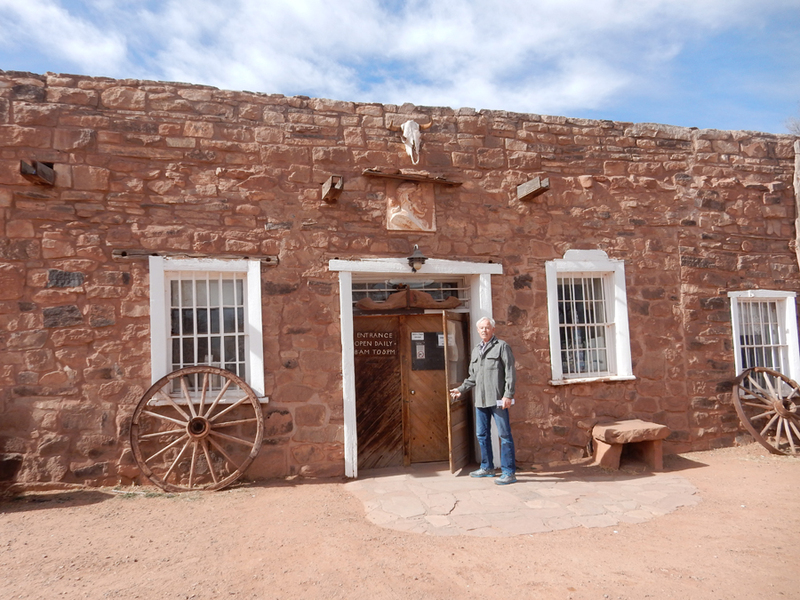 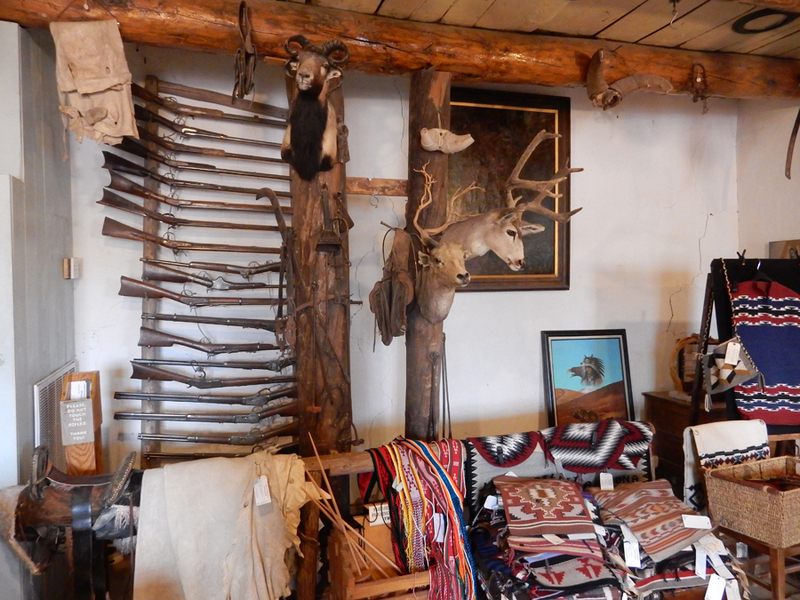 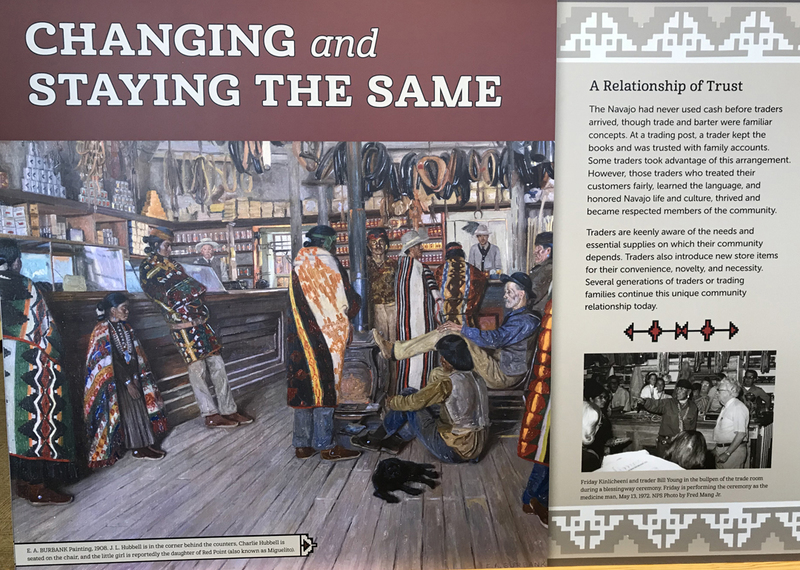 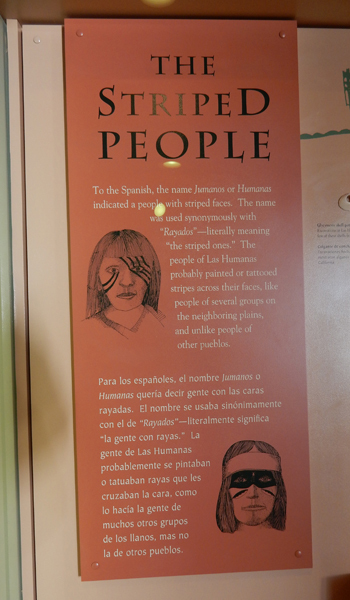 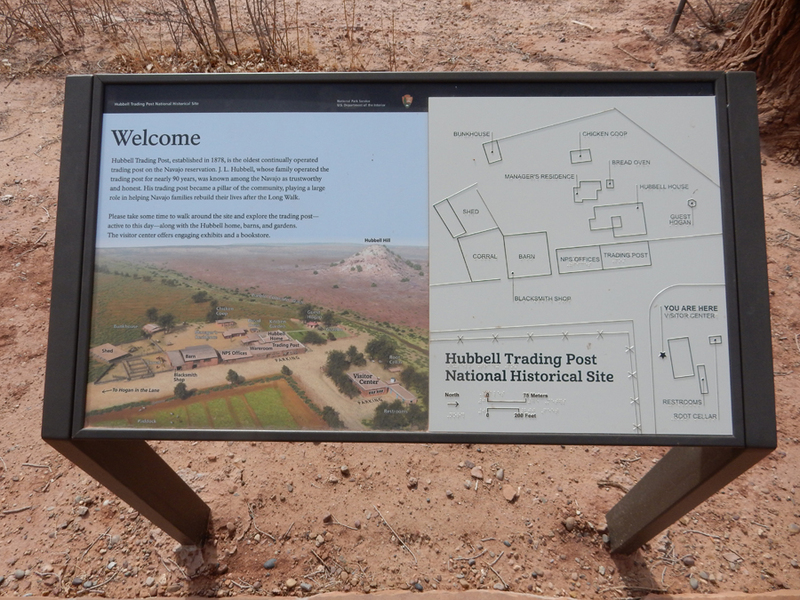 Hubbell – Don Lorenzo to local Hispanics and Naakaii Sani (Old Mexican) or Nak’ee sinili (Eyeglasses) to Navajo started trading here in 1876. 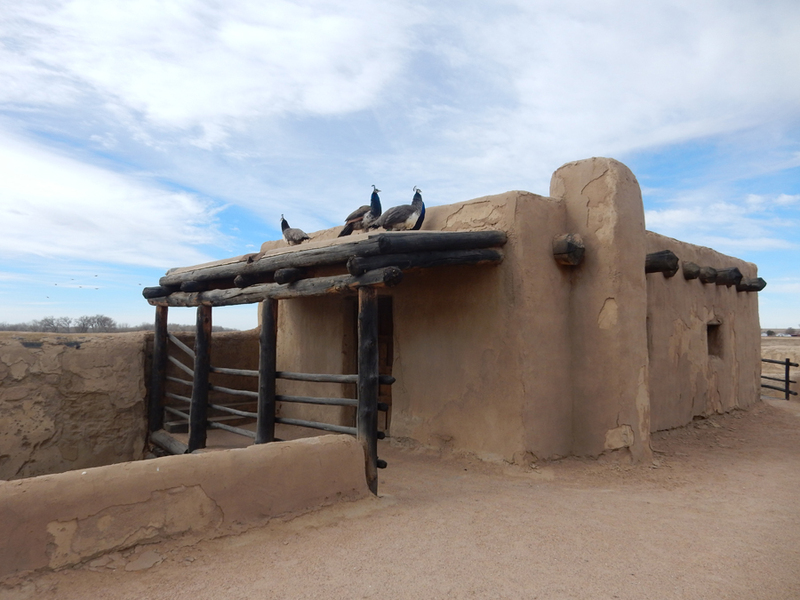 He married Lena Rubi three years later and they had four children. 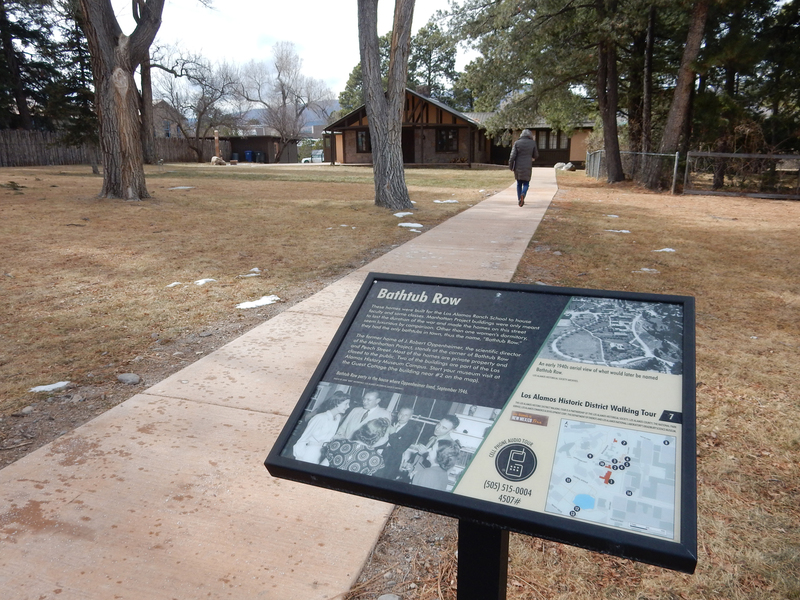 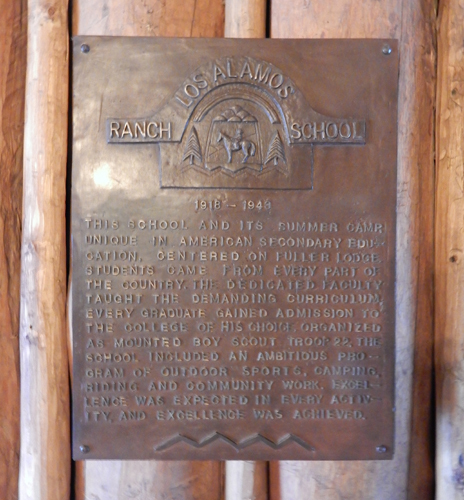 In 1967 the wife of their youngest son sold the Trading Post and ranch to the National Park Service. 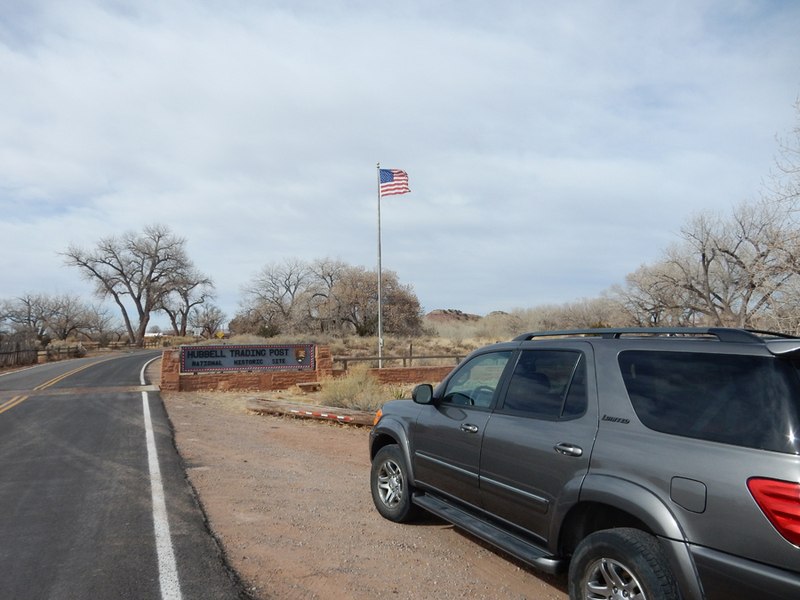 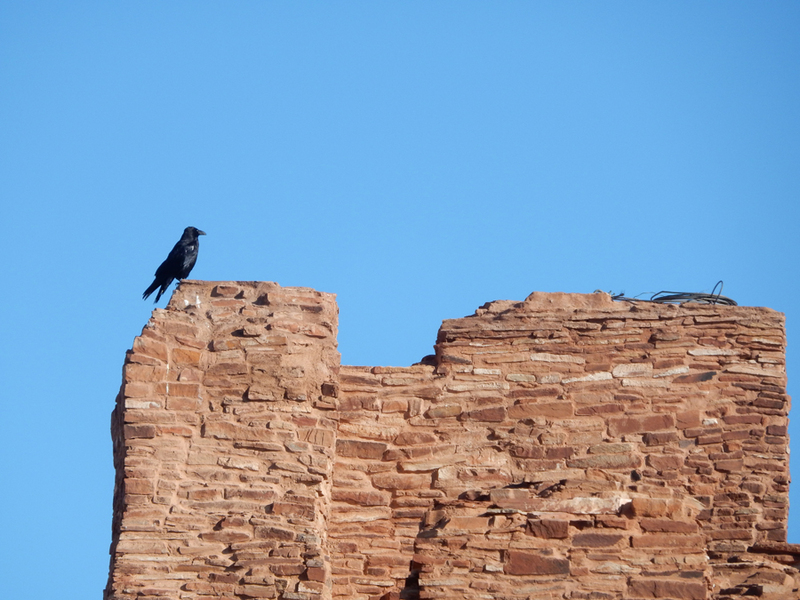 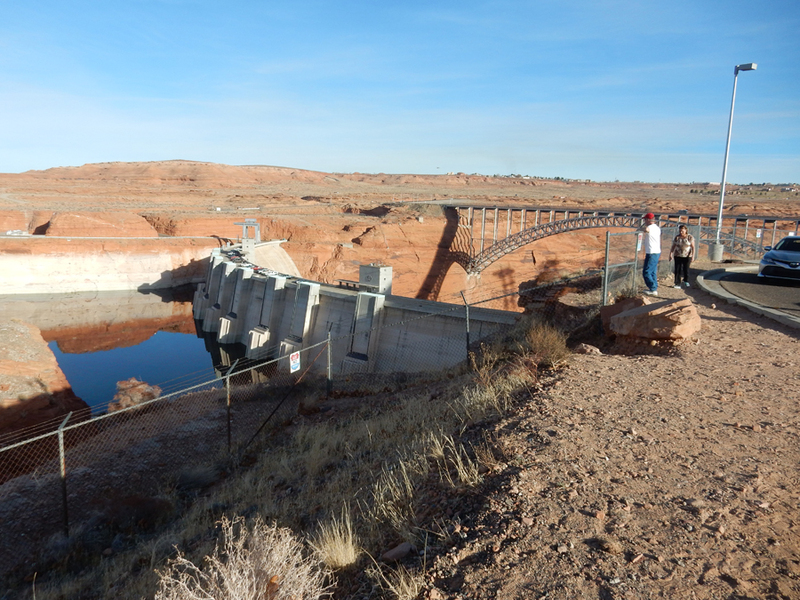 Guest Hogan, Hubbell Hill (in the background) is on the Navajo reservation. 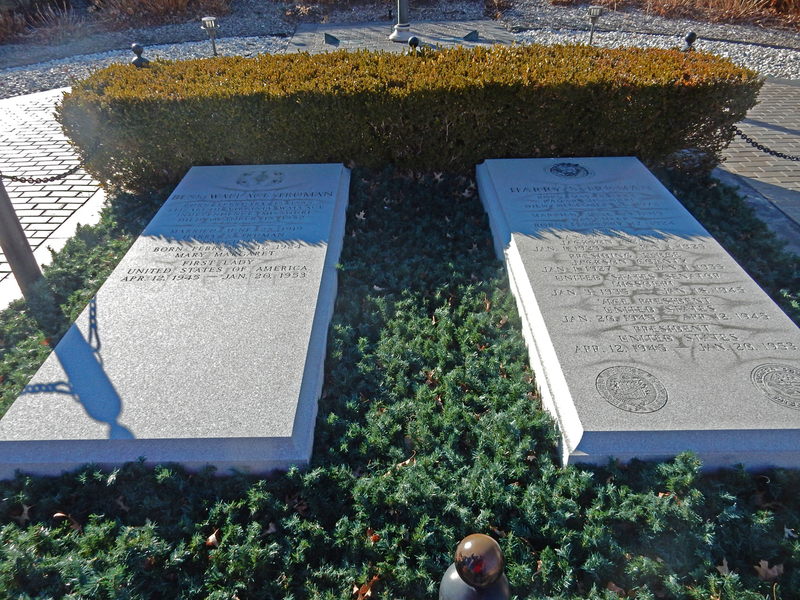 Hubbell, his wife, and his best friend Bi’lii Lani (Chief Many Horses) are buried on top. 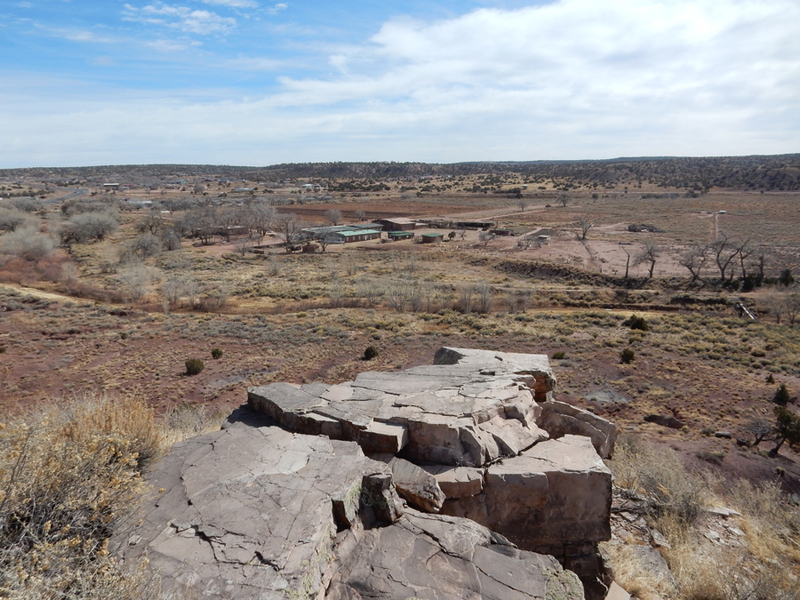 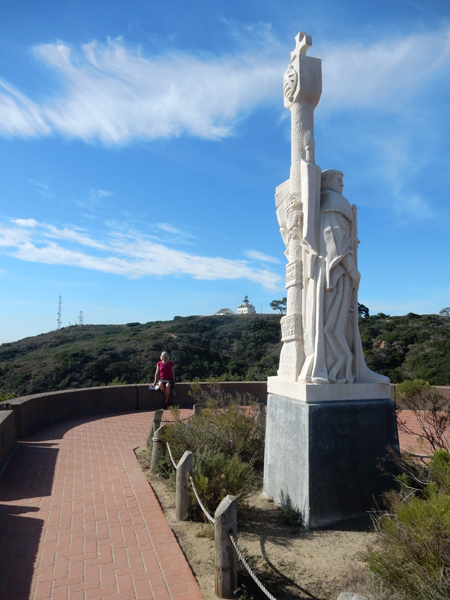 View of the Trading Post and ranch from the top of Hubbell Hill. 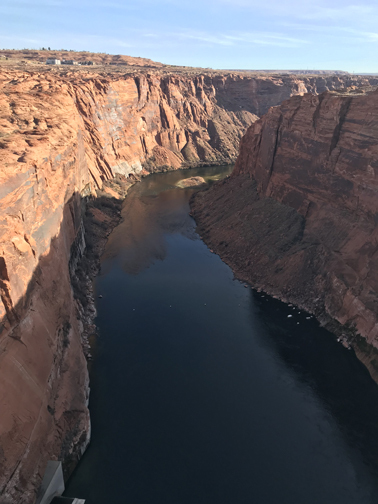 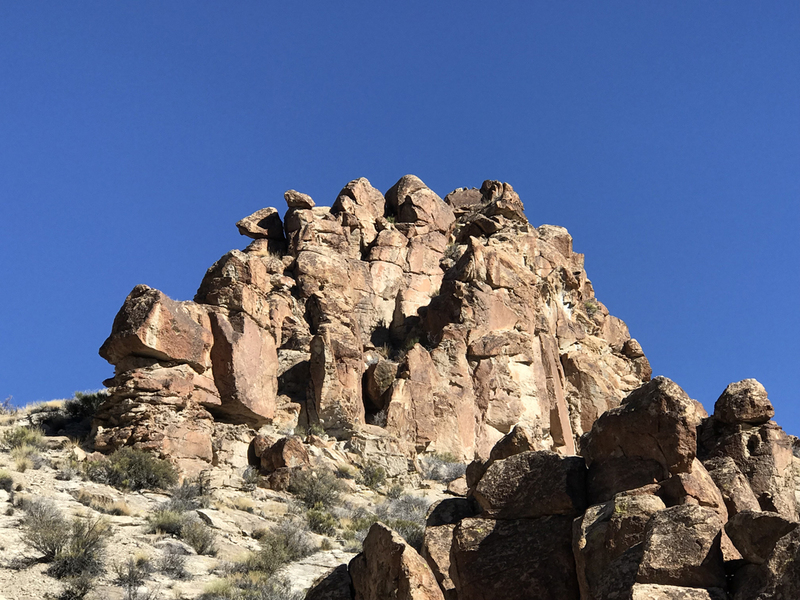 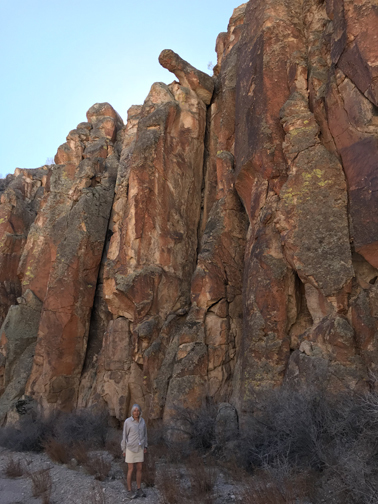 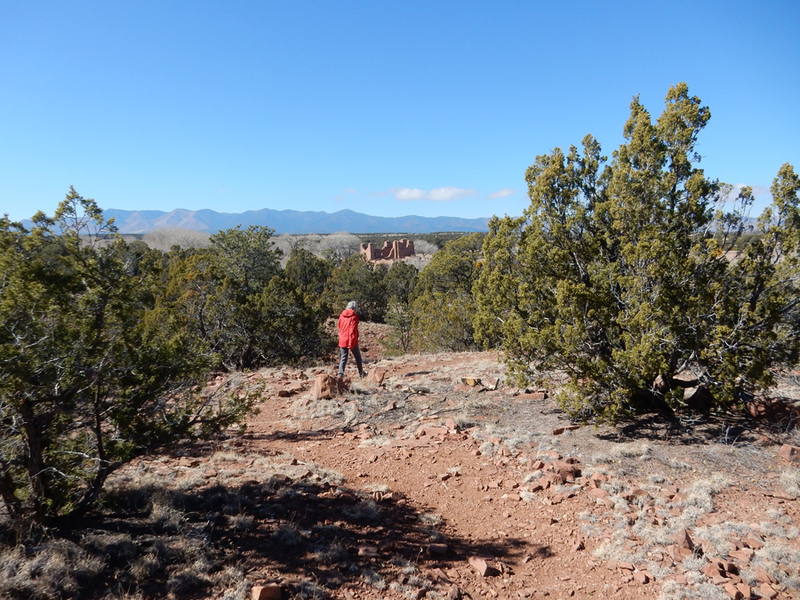 I am currently exploring the possibility of a coordinated effort between the park and the Navajo Nation to put a trail in from the Visitor Center to the top of the hill. 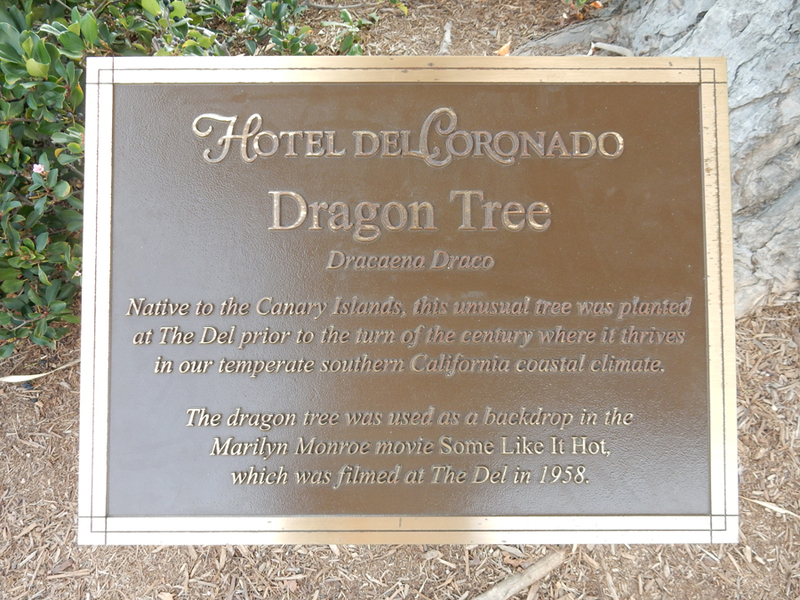 I believe this would be a wonderful addition to the park. 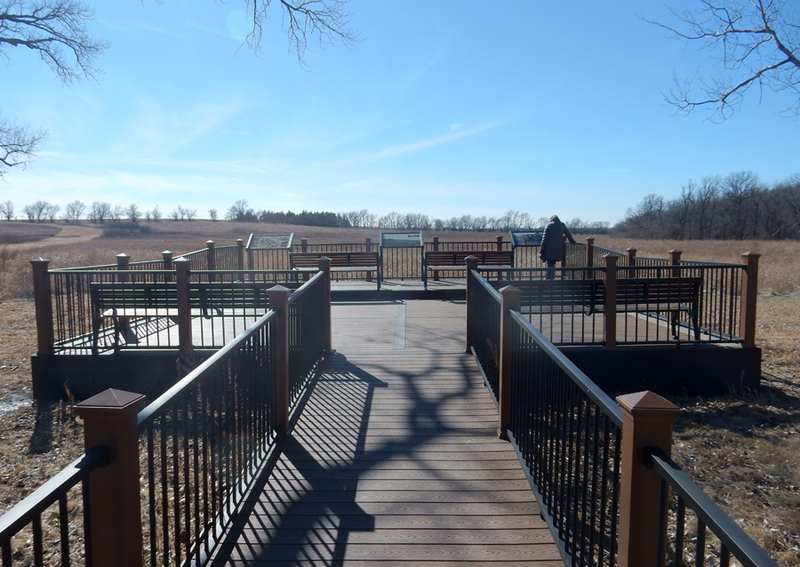 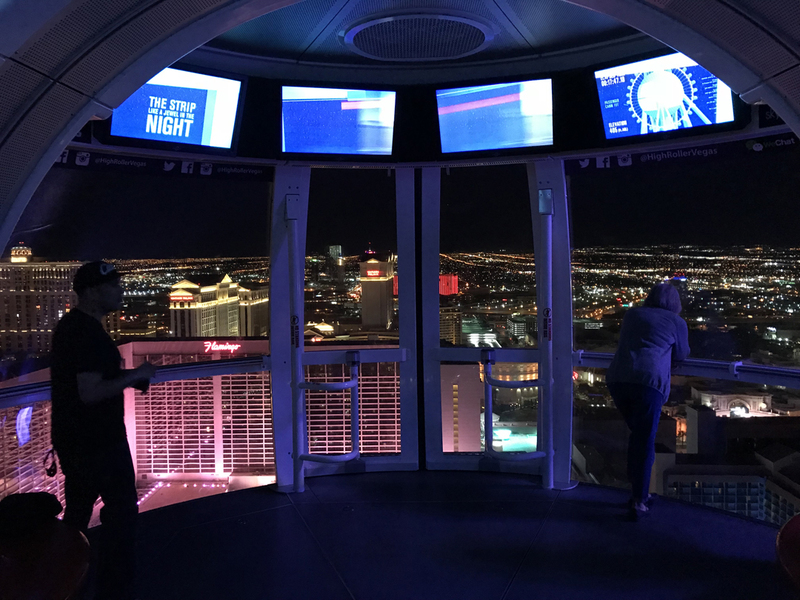 It would add a physical activity opportunity for visitors as well as providing a panoramic view of the surrounding landscape. 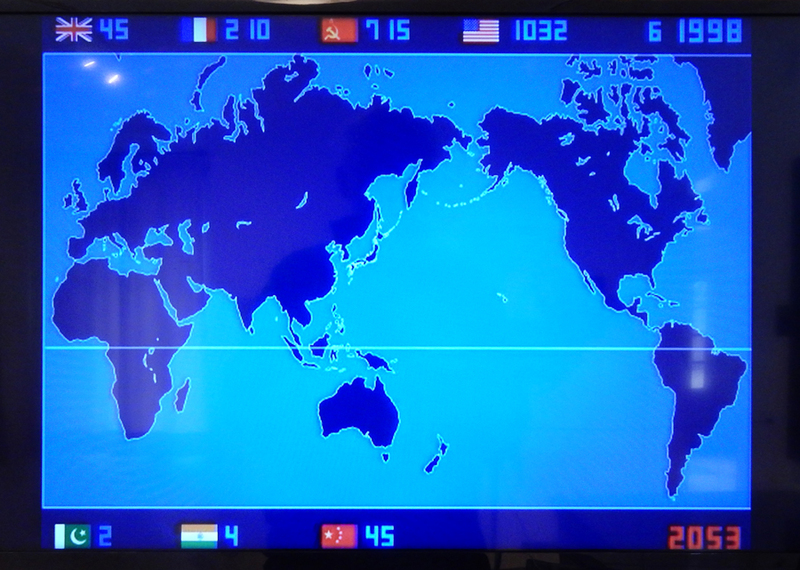 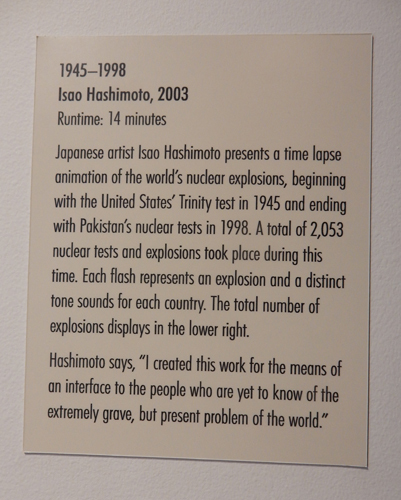 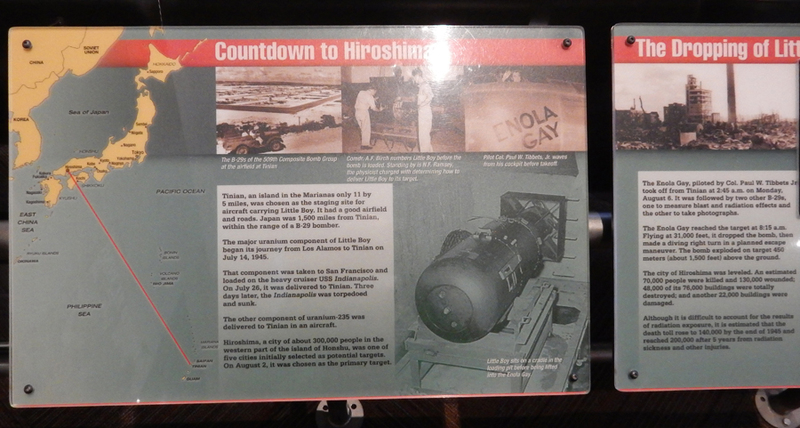 Nuclear tests by country from 1945-1998 – 2,053!!! 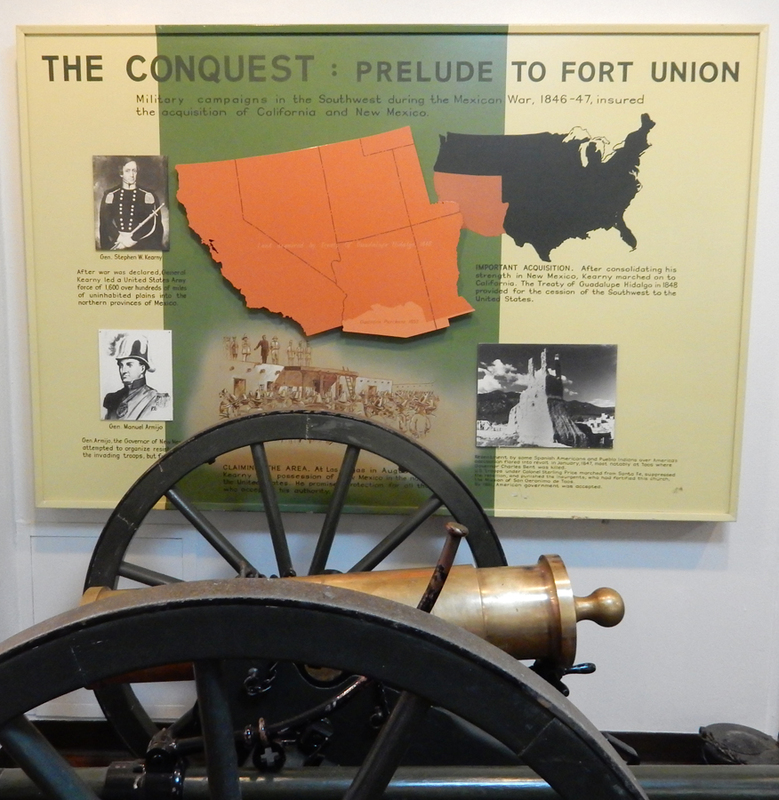 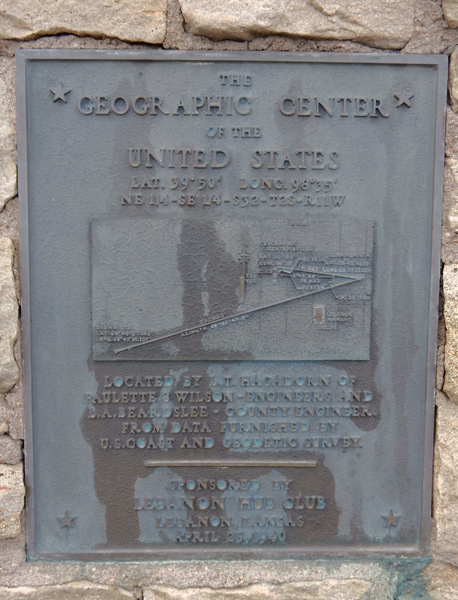 What the sign does not state – is that the Confederates were also trying to take the U.S. Mint in Denver. 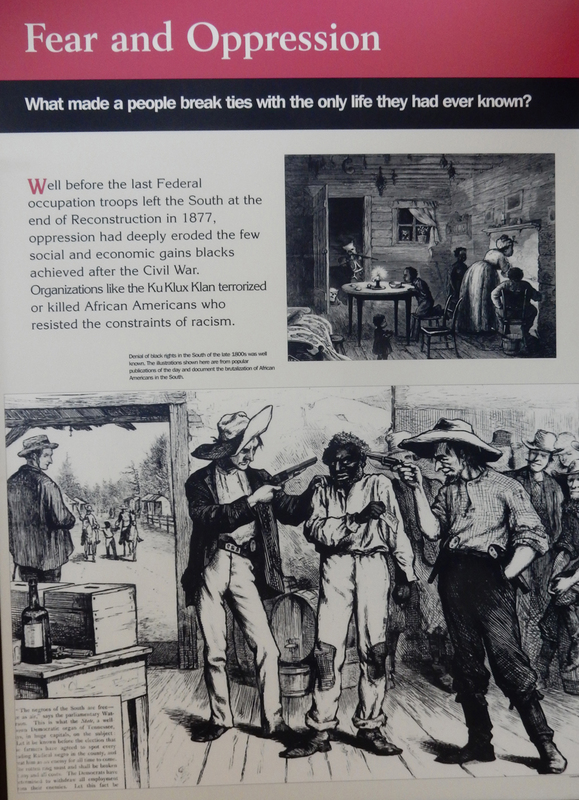 That would have had a major impact on the Civil War. 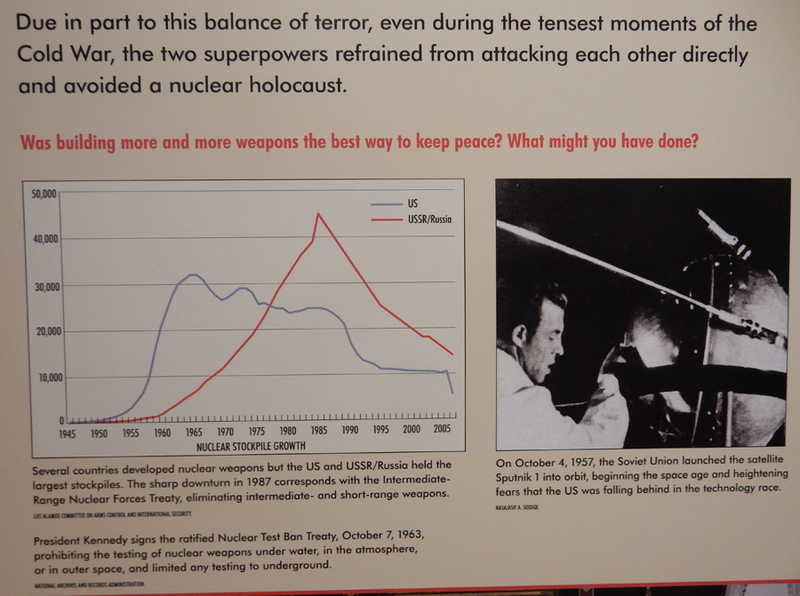 So, though small, this battle was VERY important. 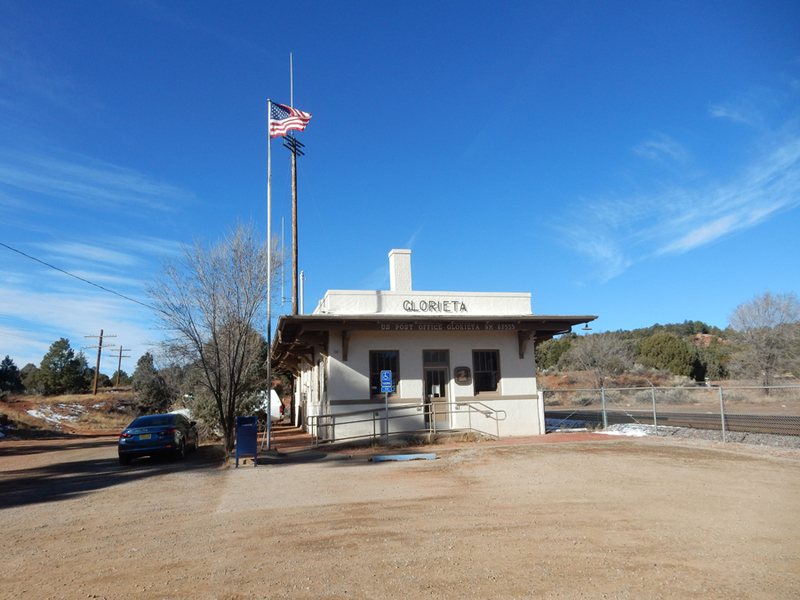 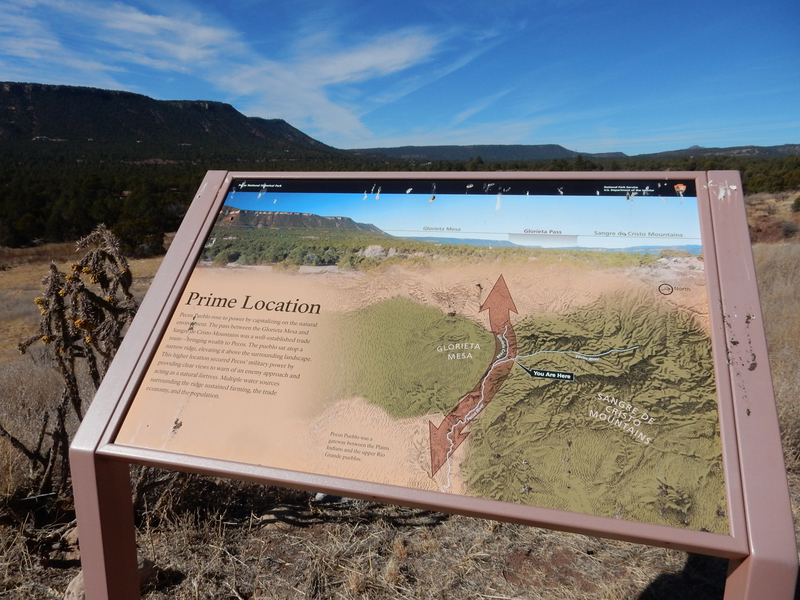 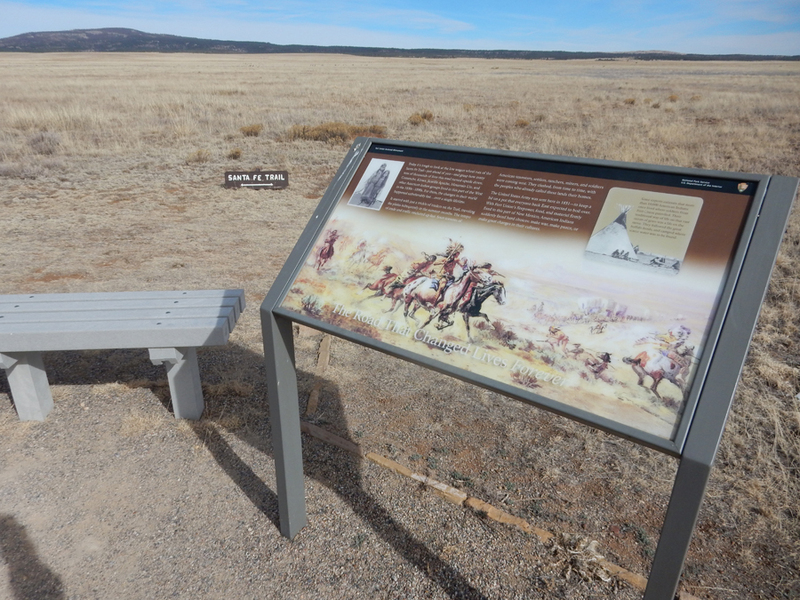 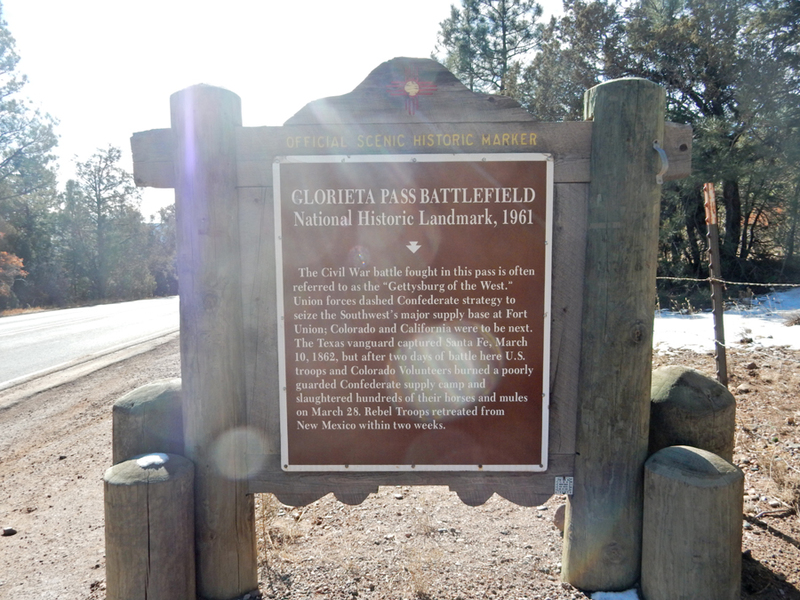 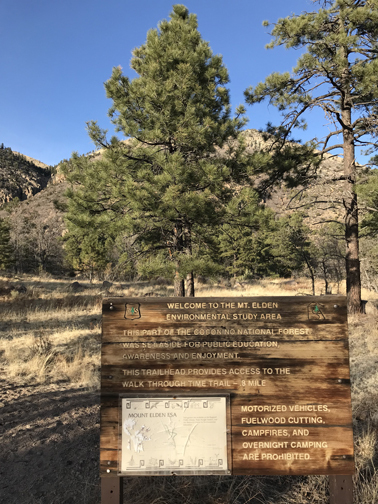 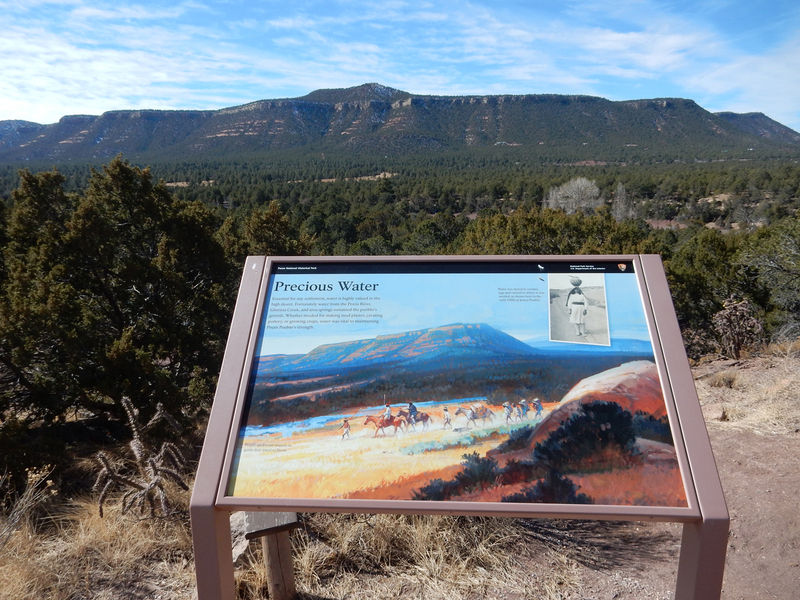 Glorieta Pass is on the Santa Fe Trail; it provides passage through the Sangre de Cristo Mountains. 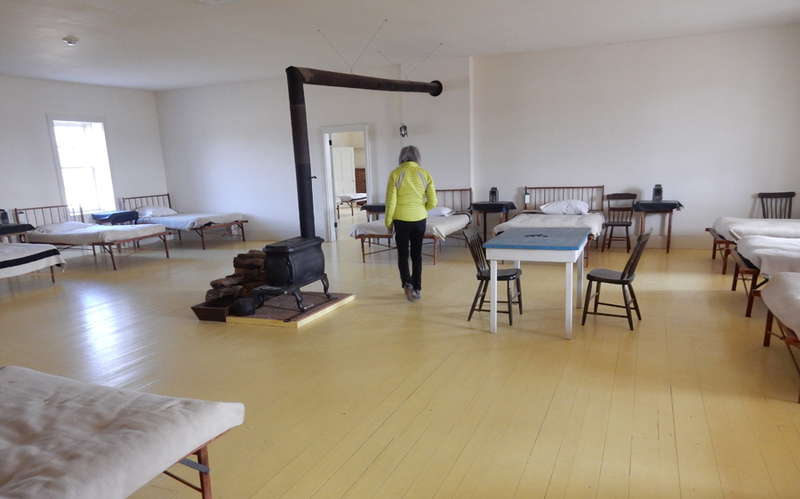 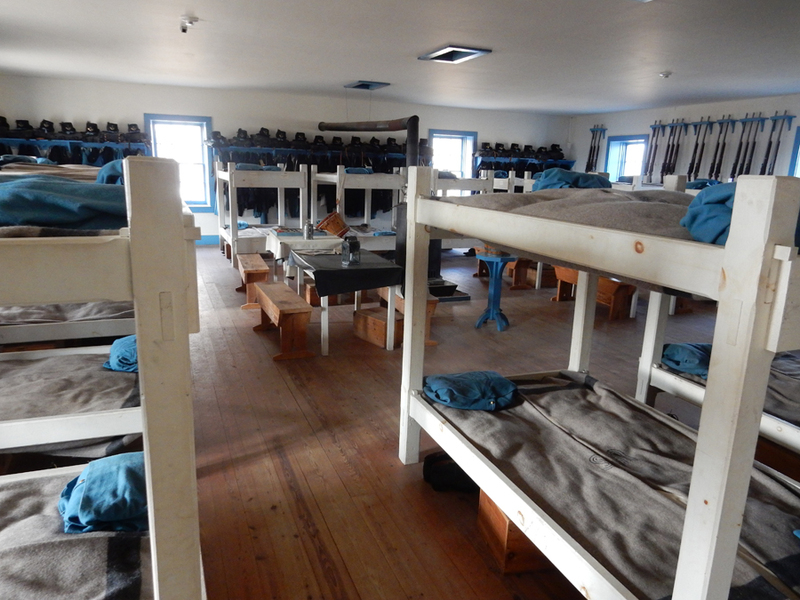 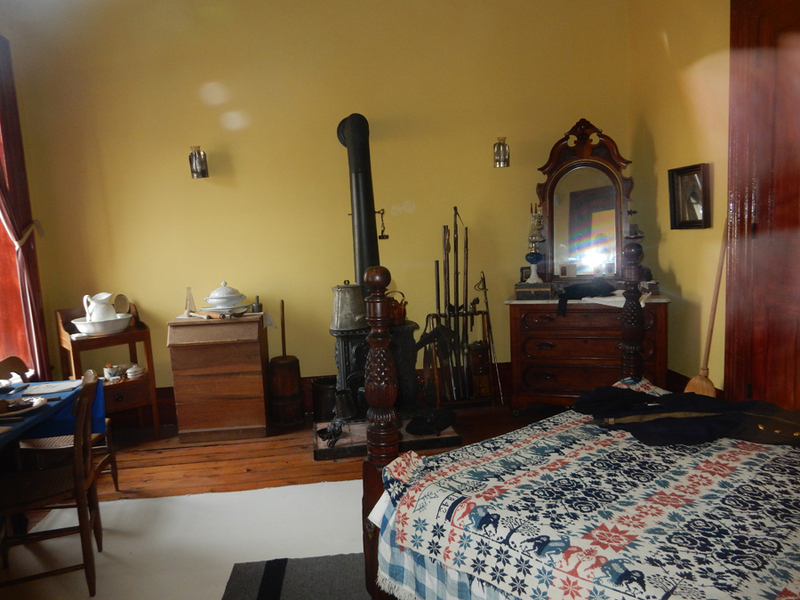 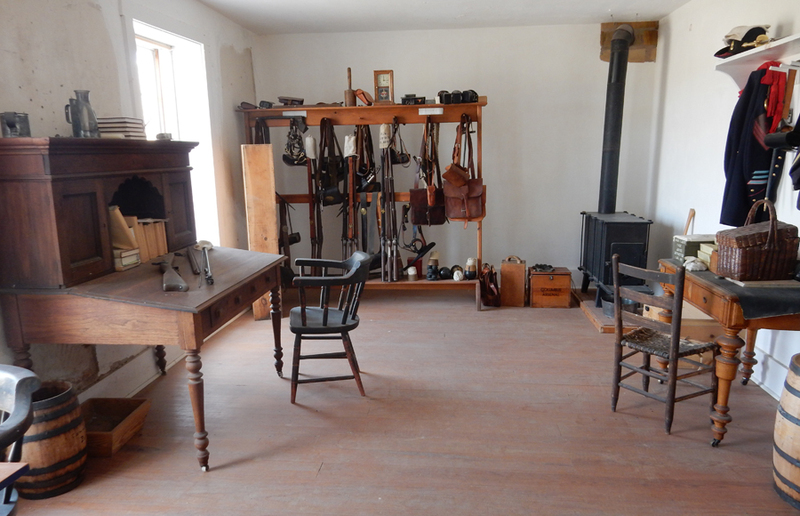 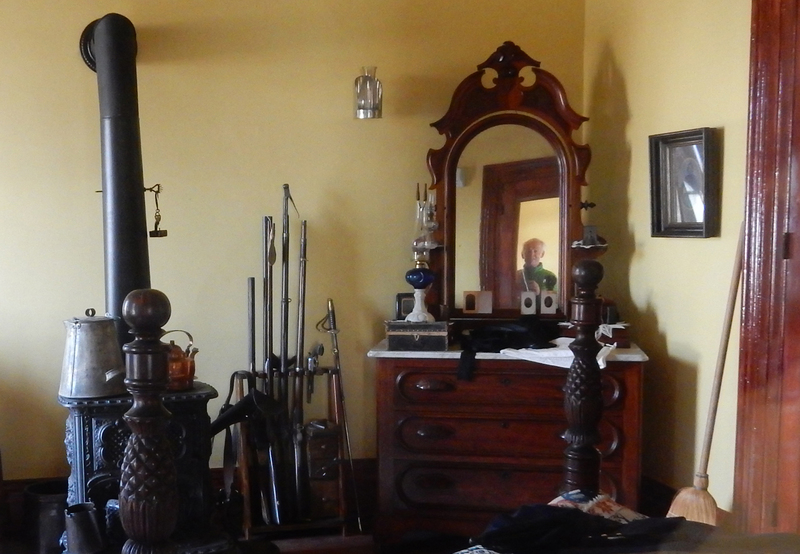 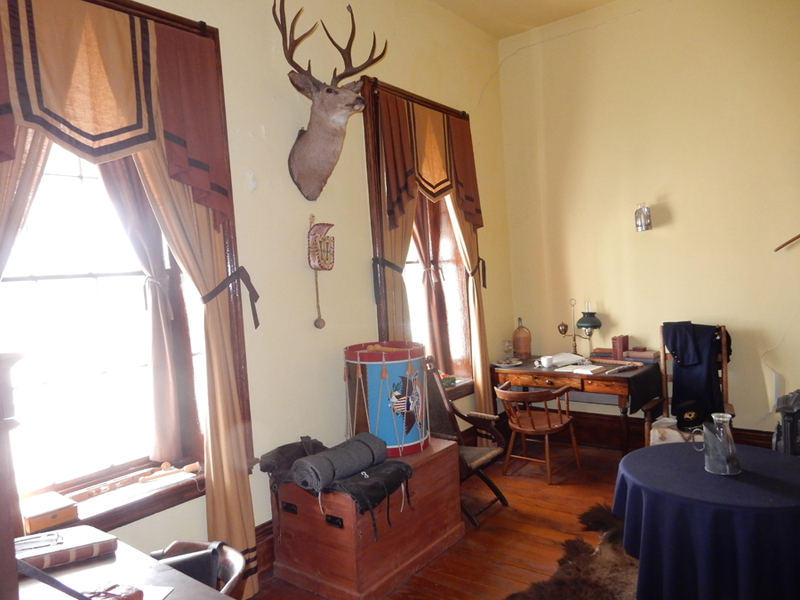 This was a guest room that is now called the Susan Magoffin’s Quarters. 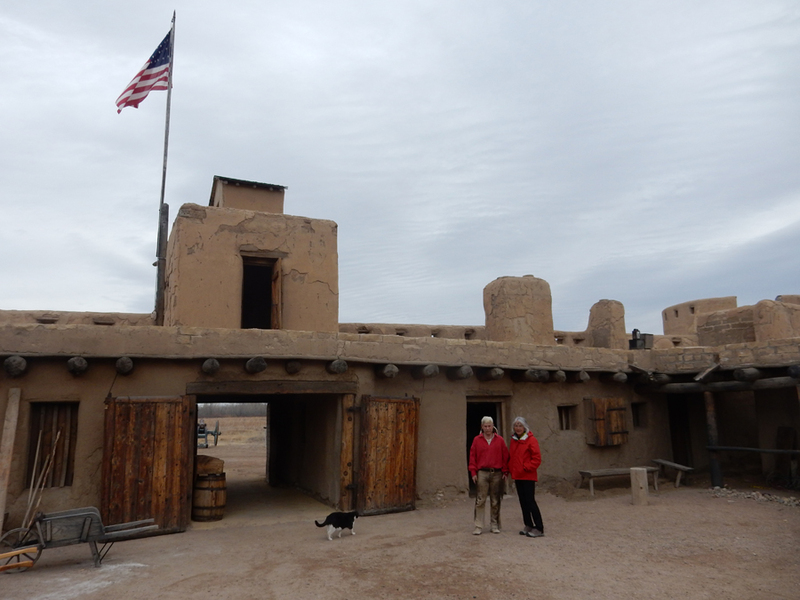 She was the wife of a prosperous trader and one of only a few white women who visited the fort. 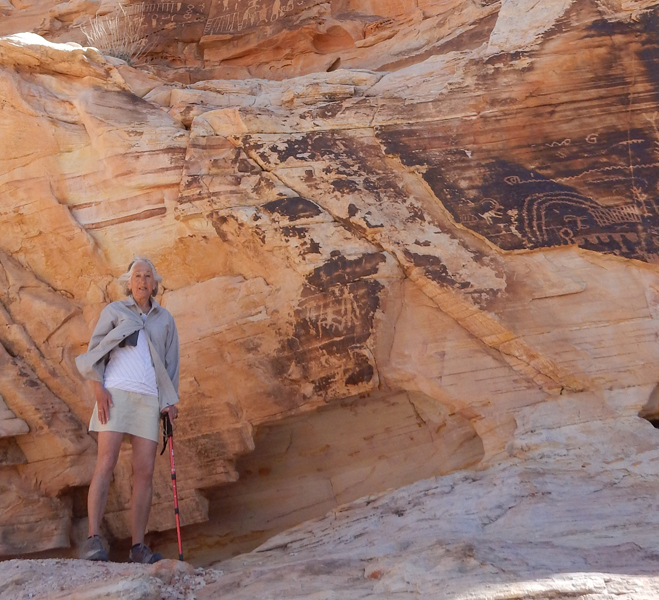 She suffered a miscarriage and stayed 12 days. 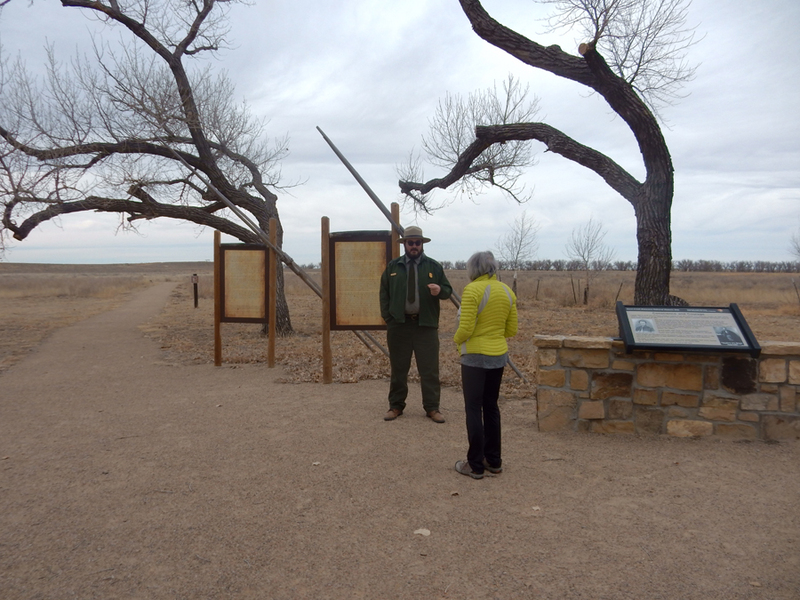 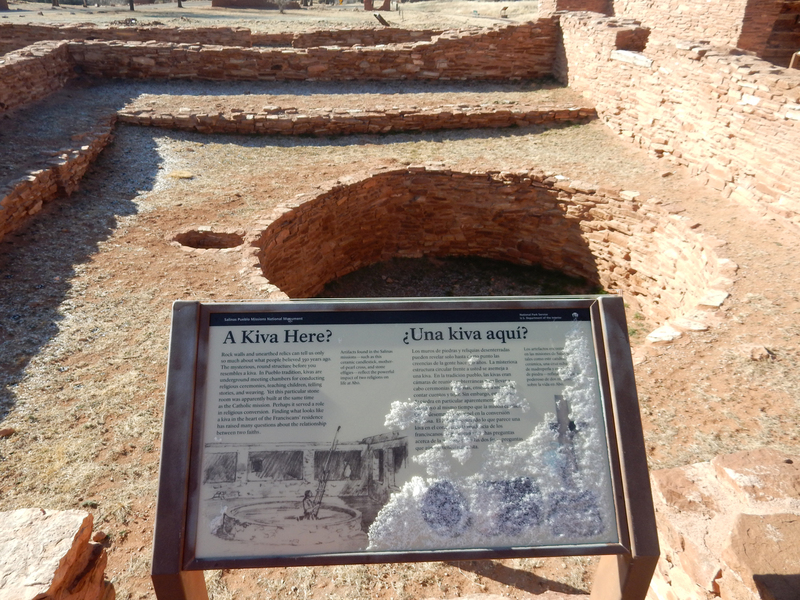 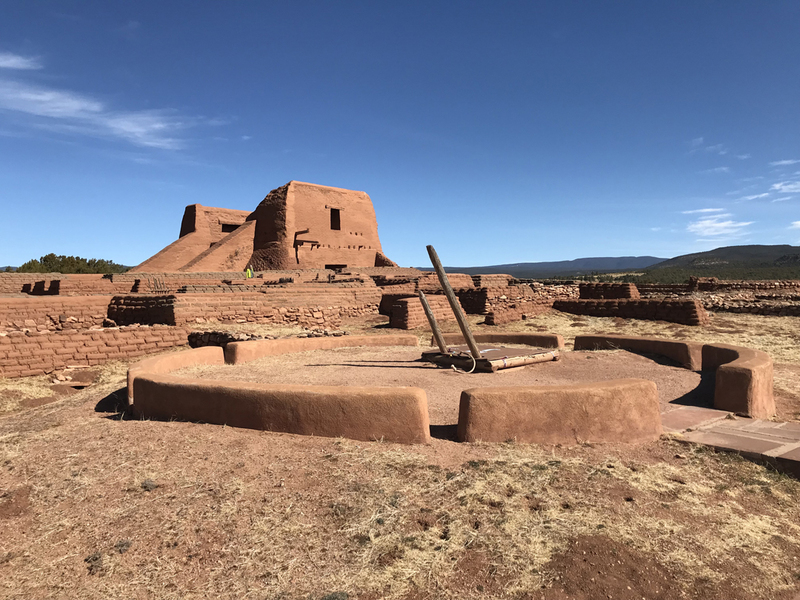 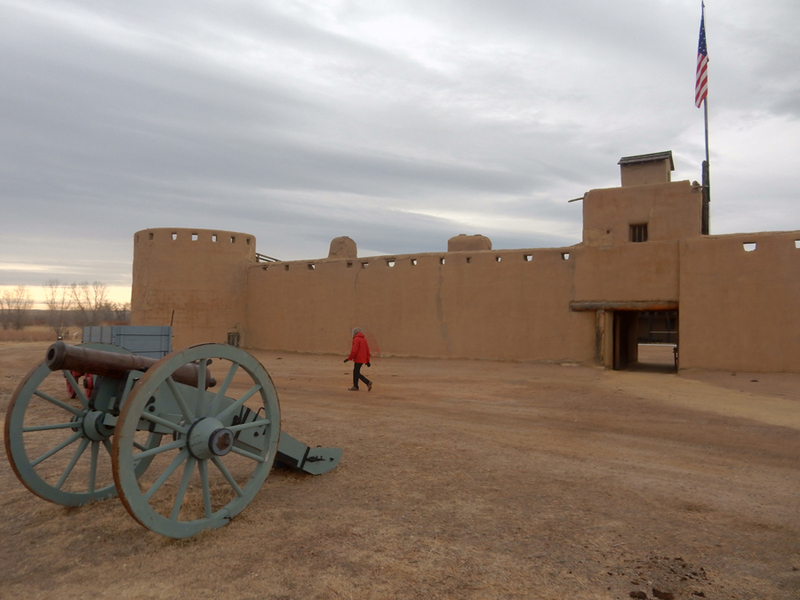 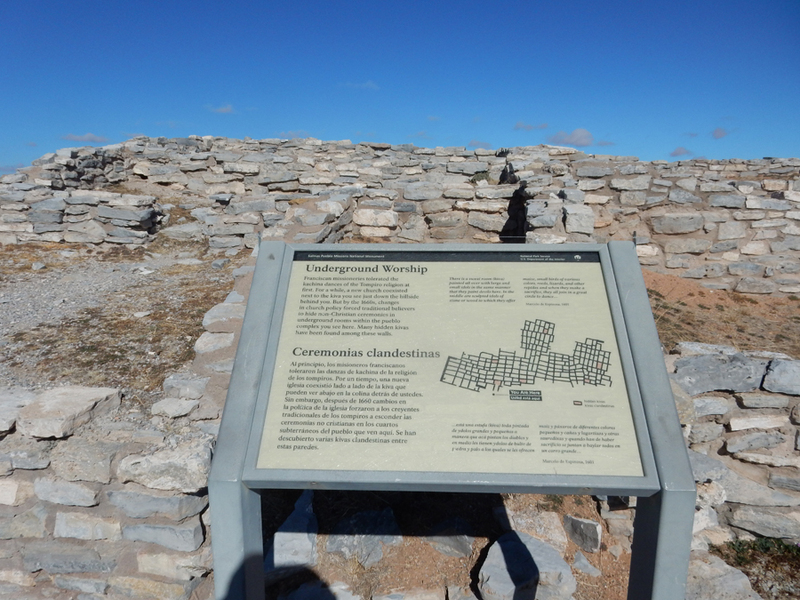 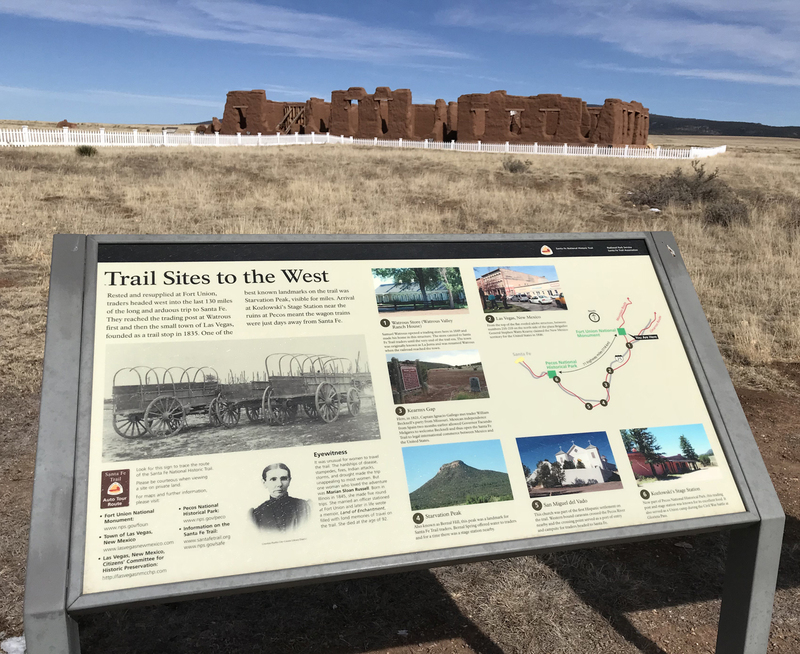 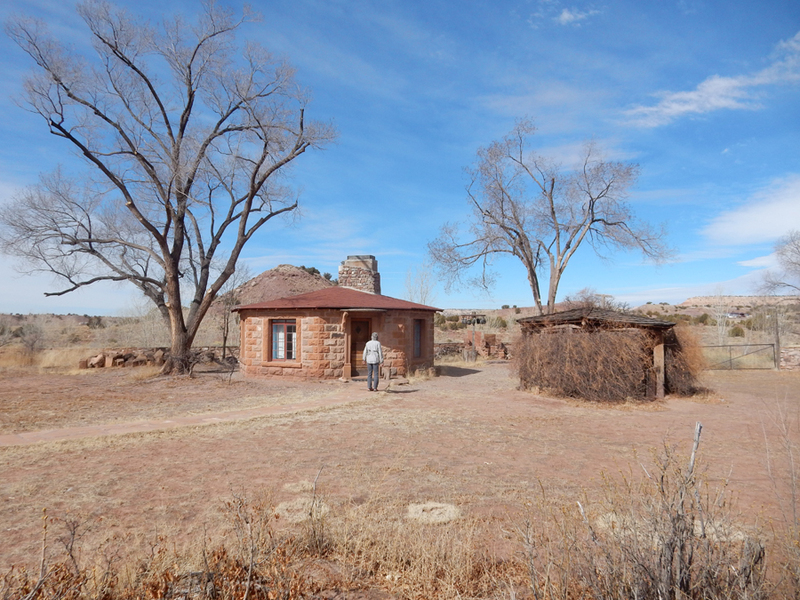 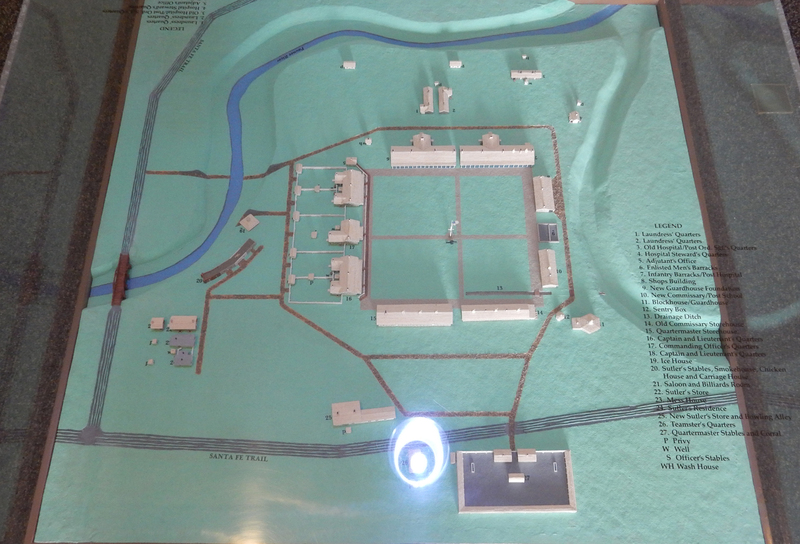 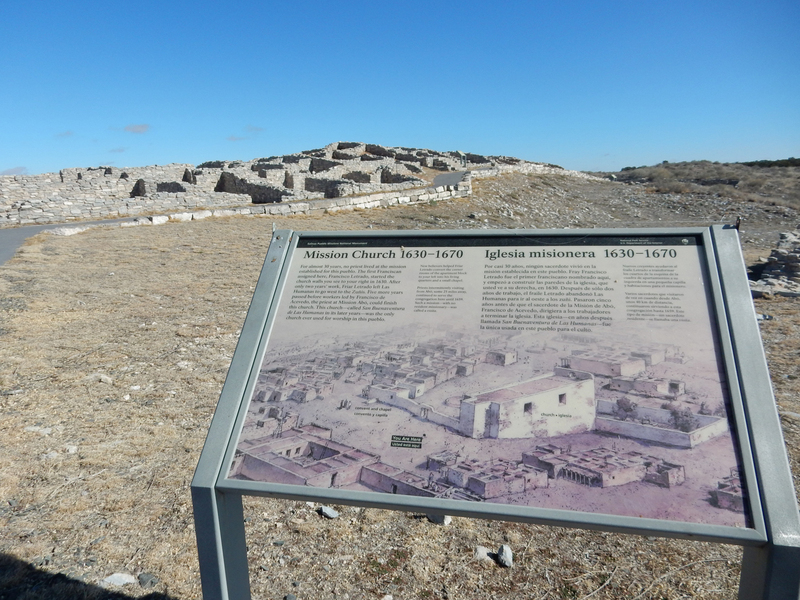 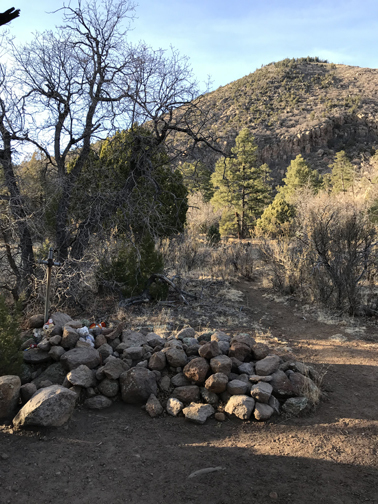 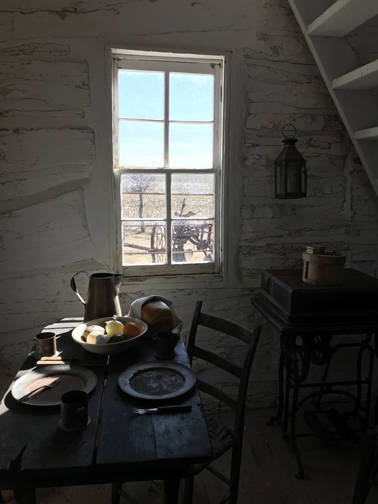 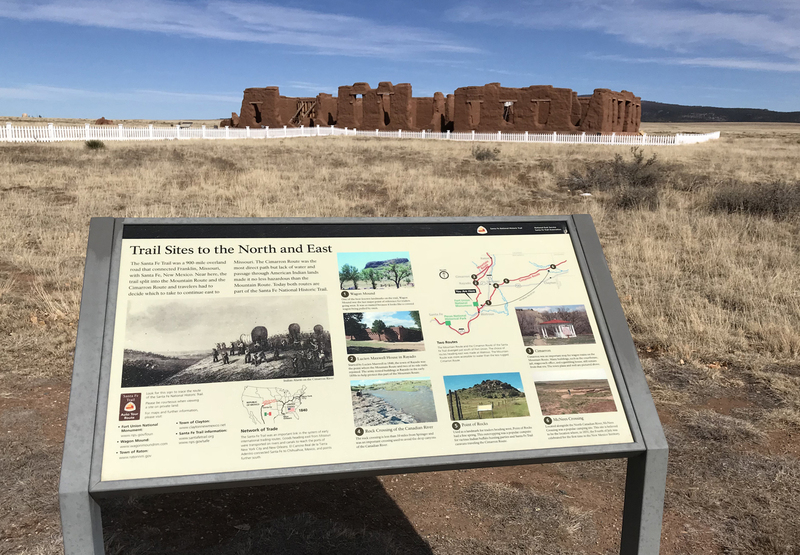 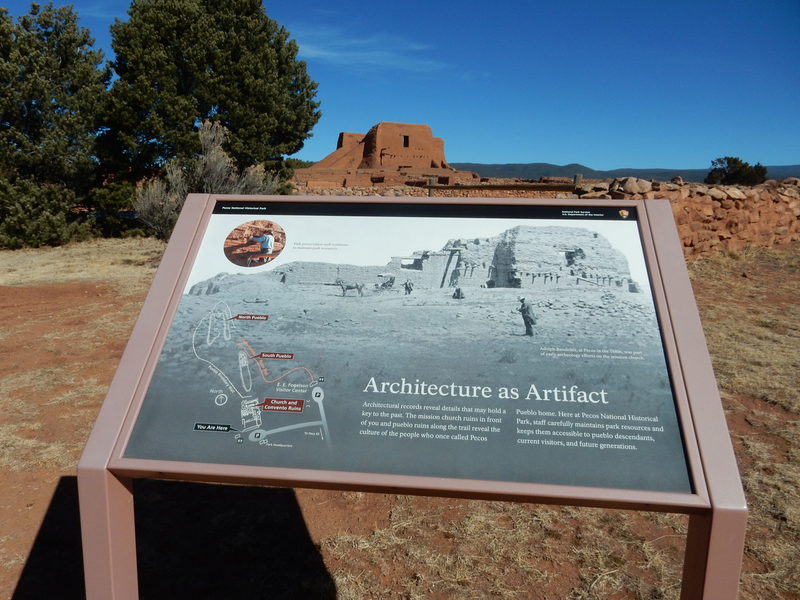 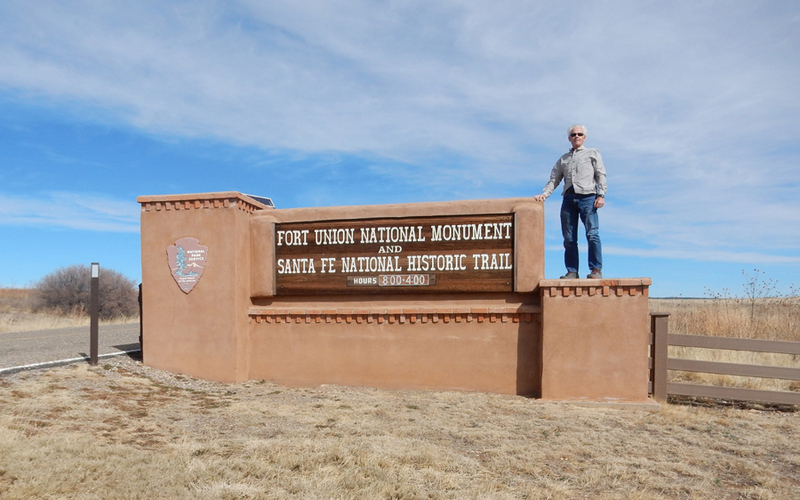 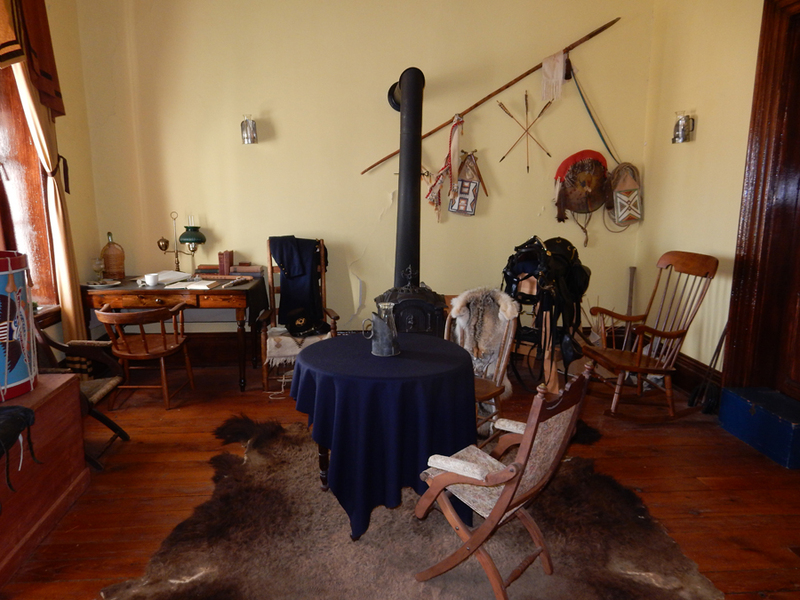 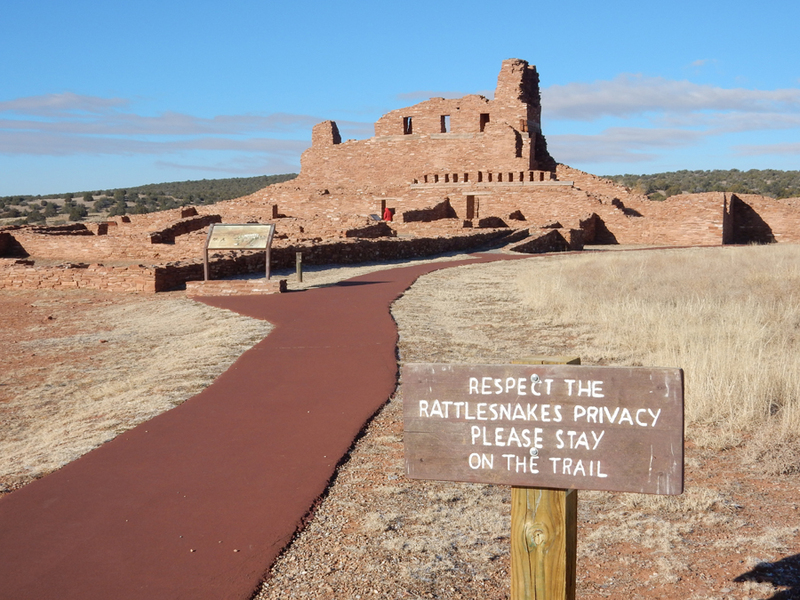 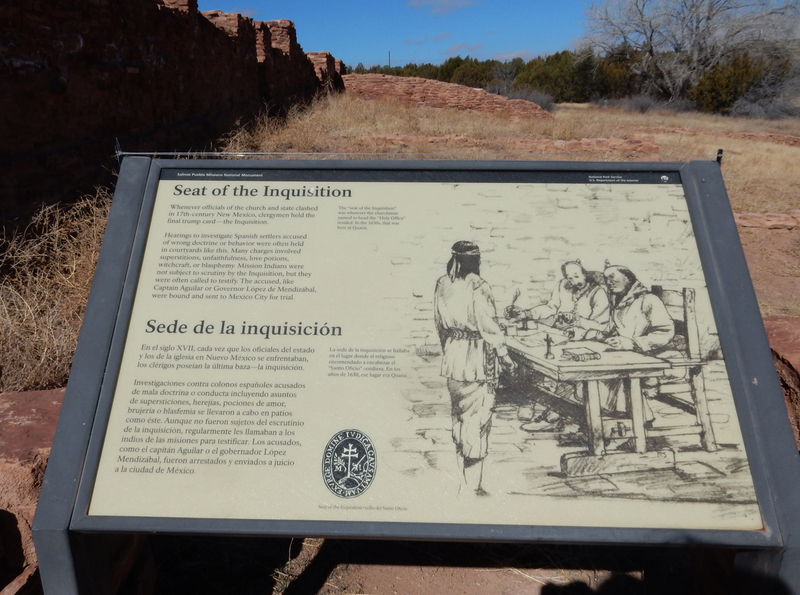 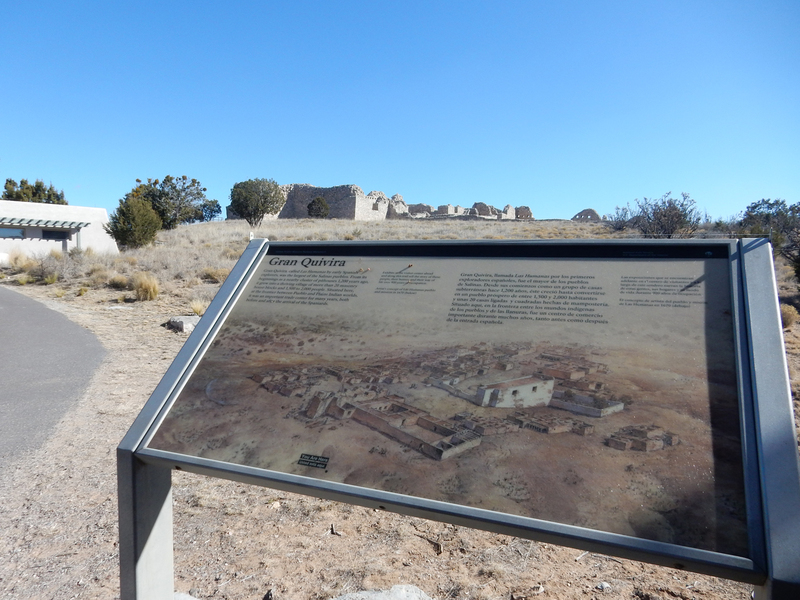 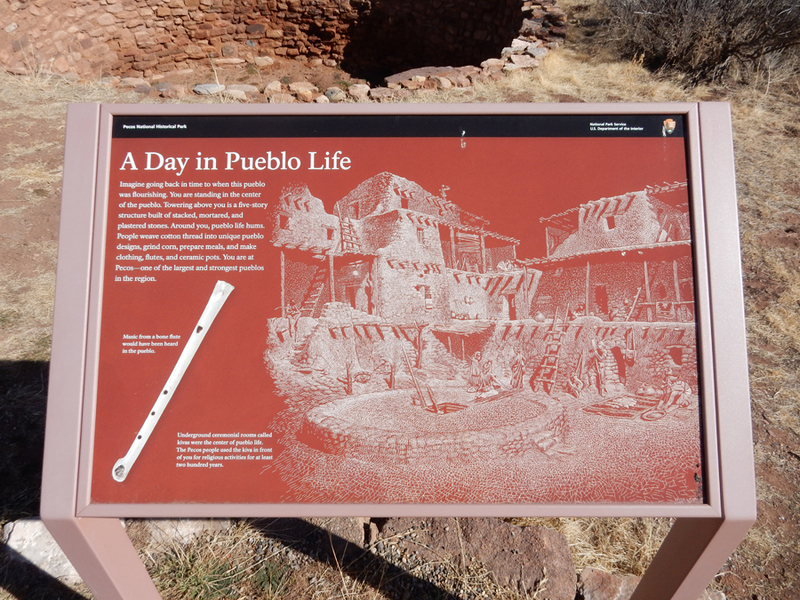 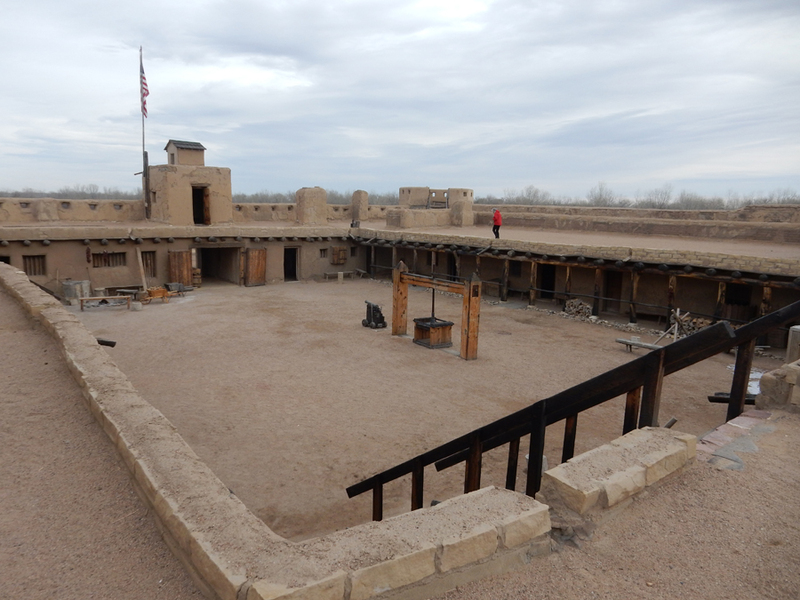 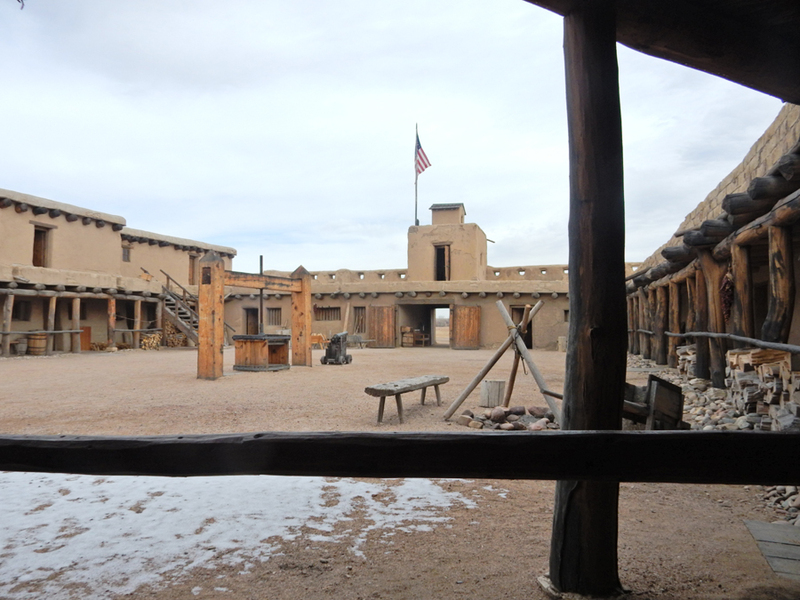 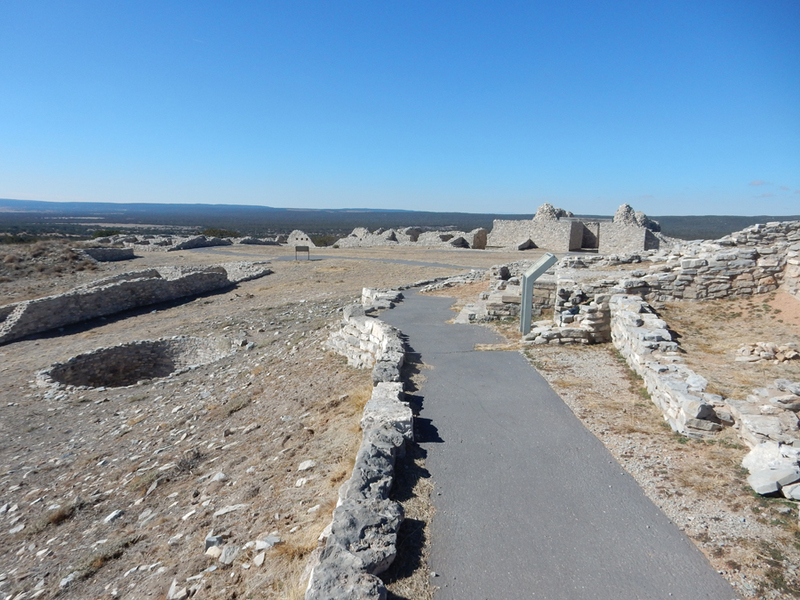 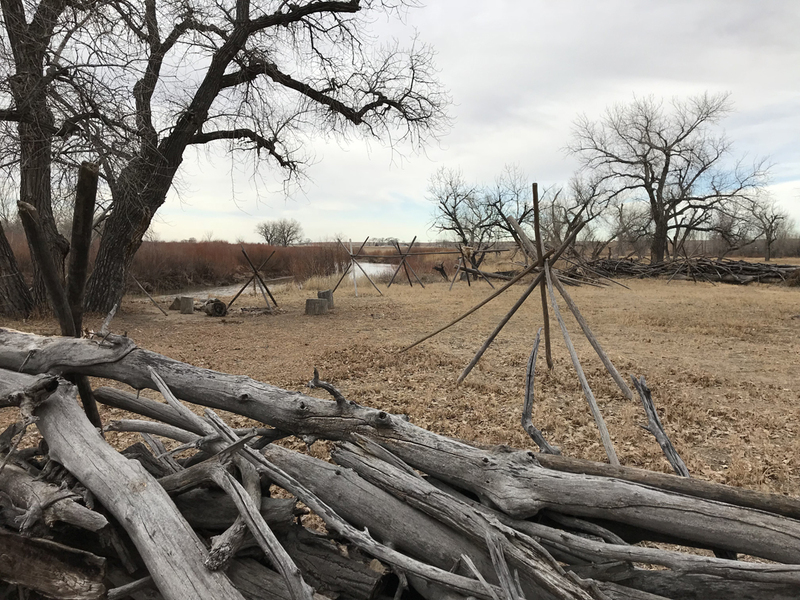 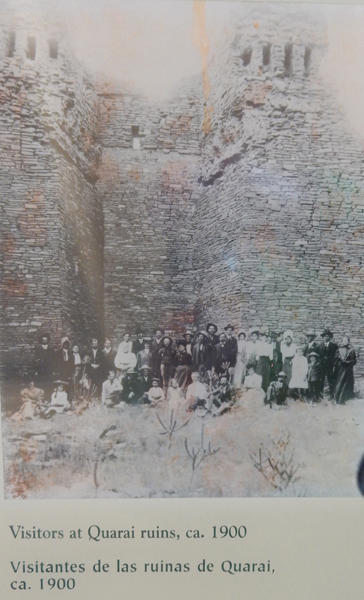 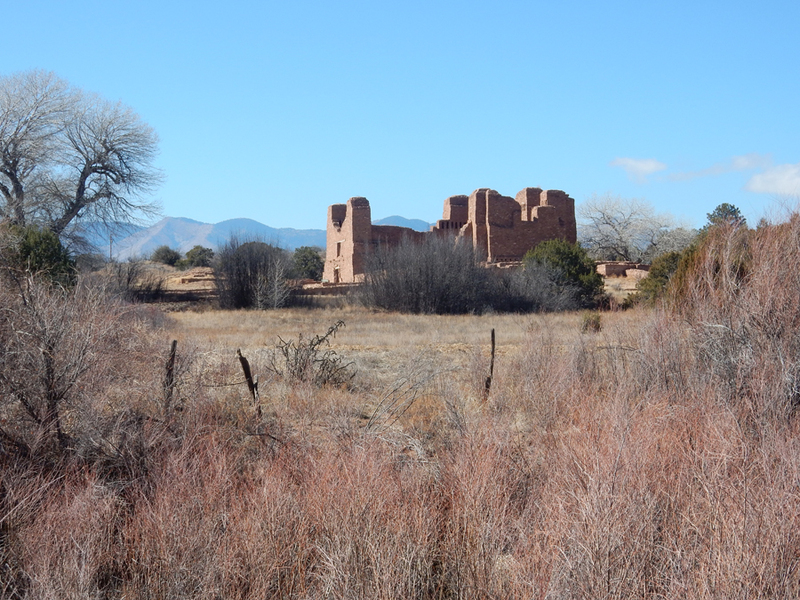 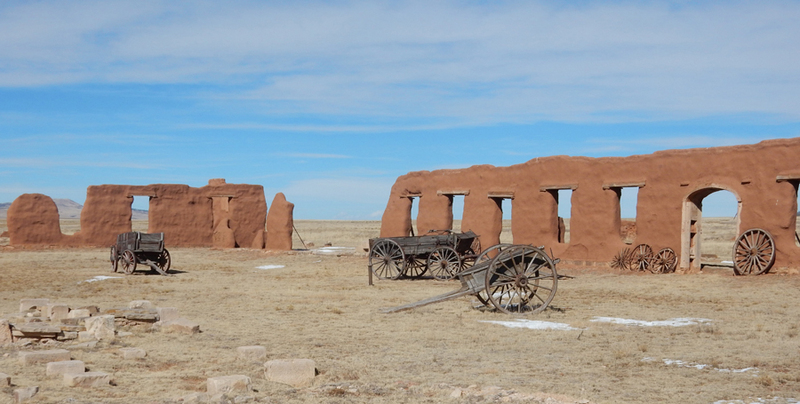 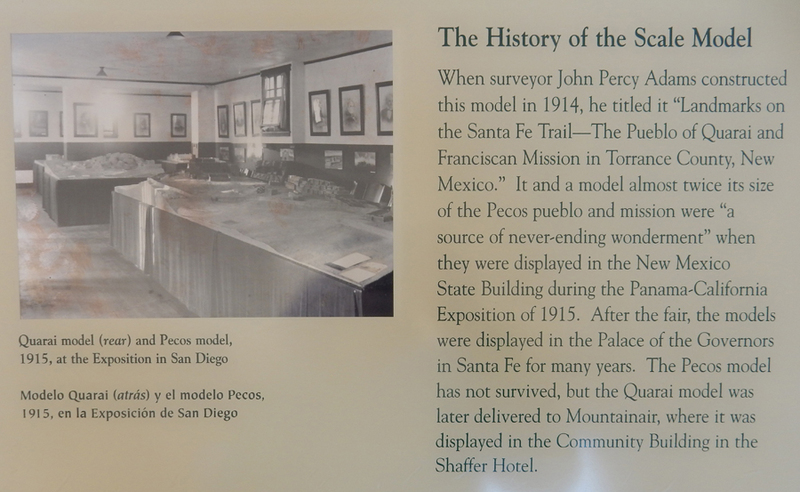 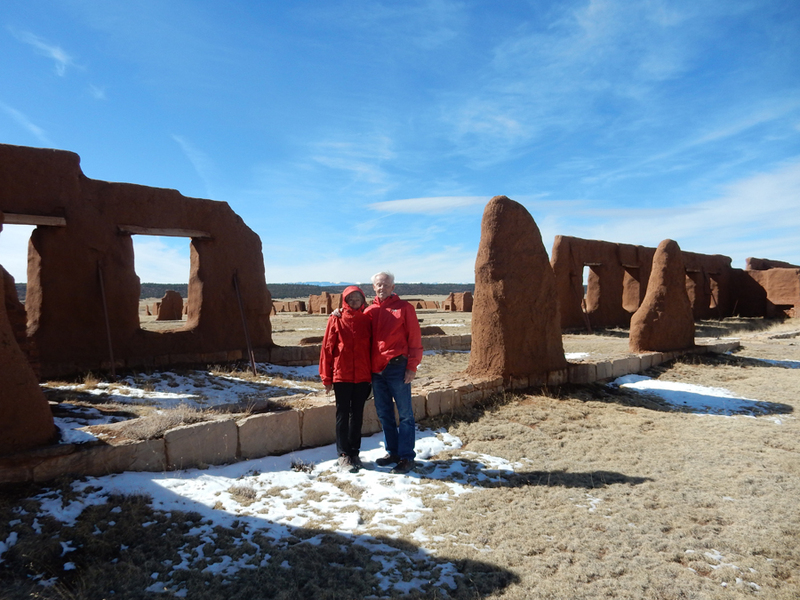 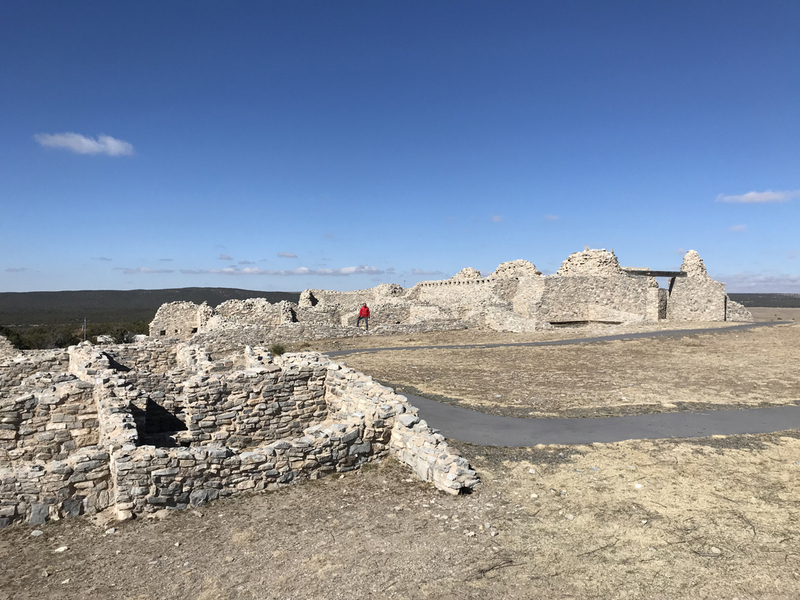 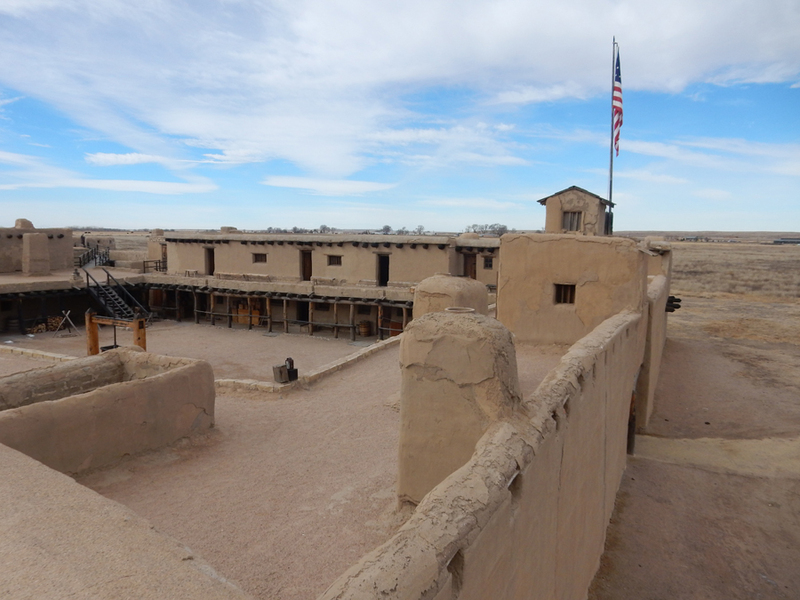 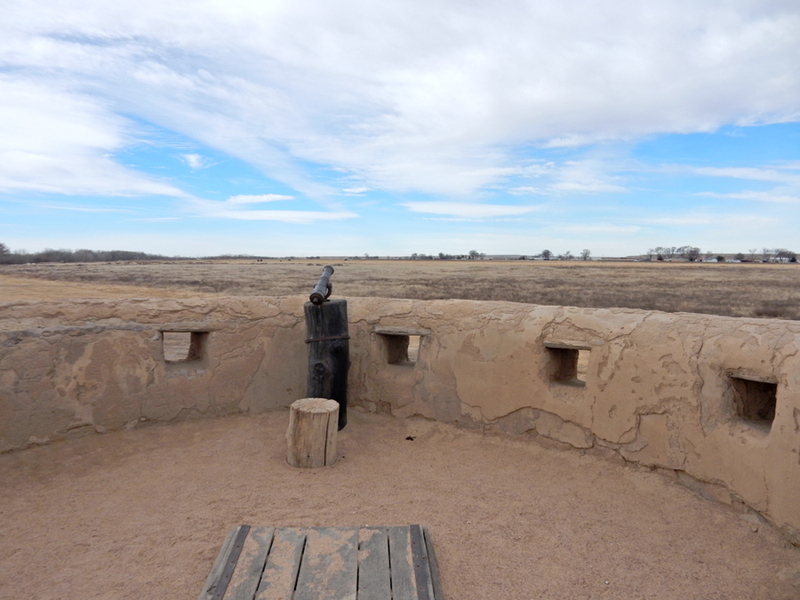 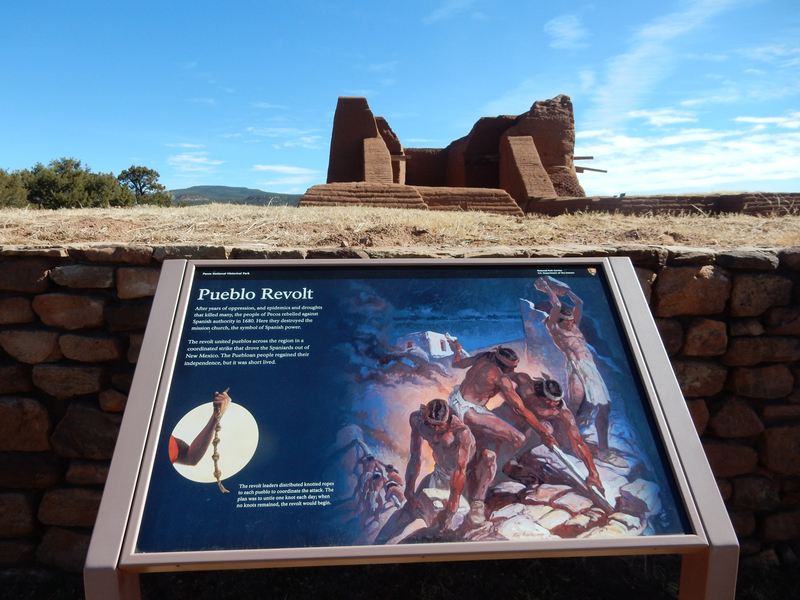 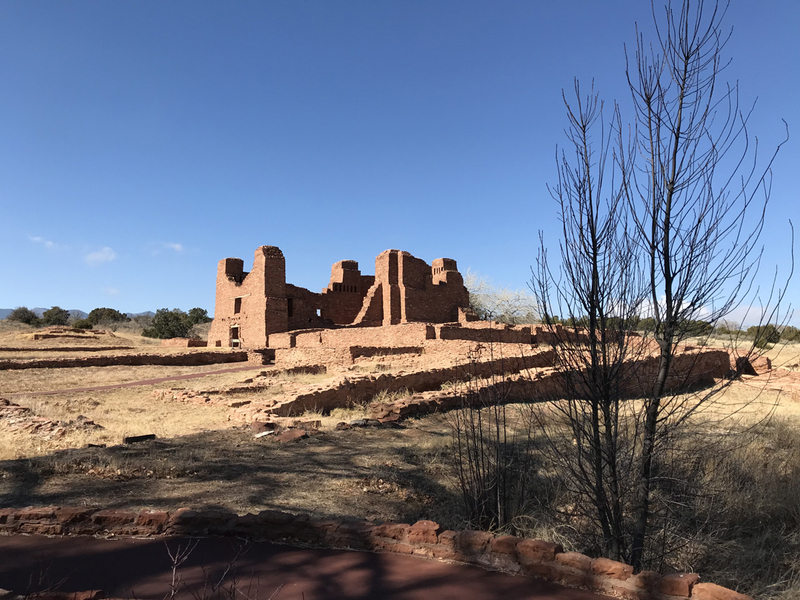 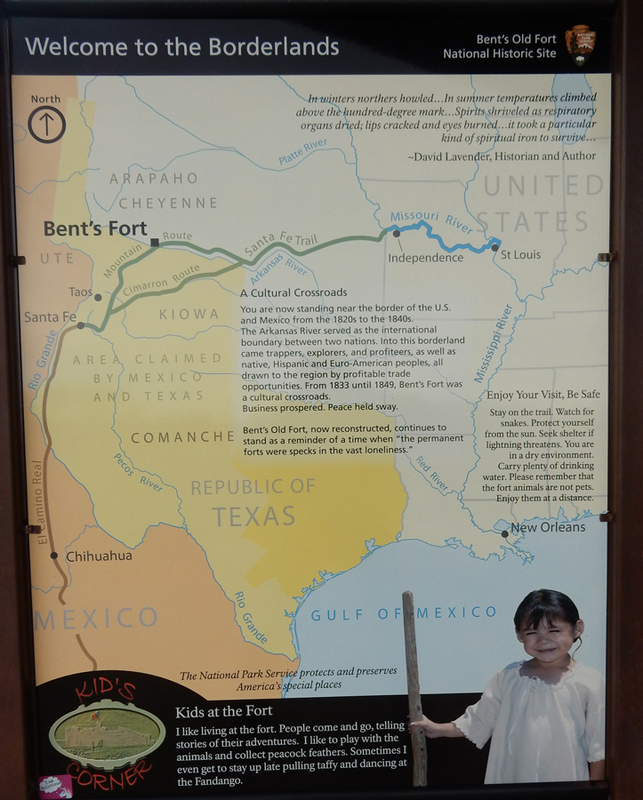 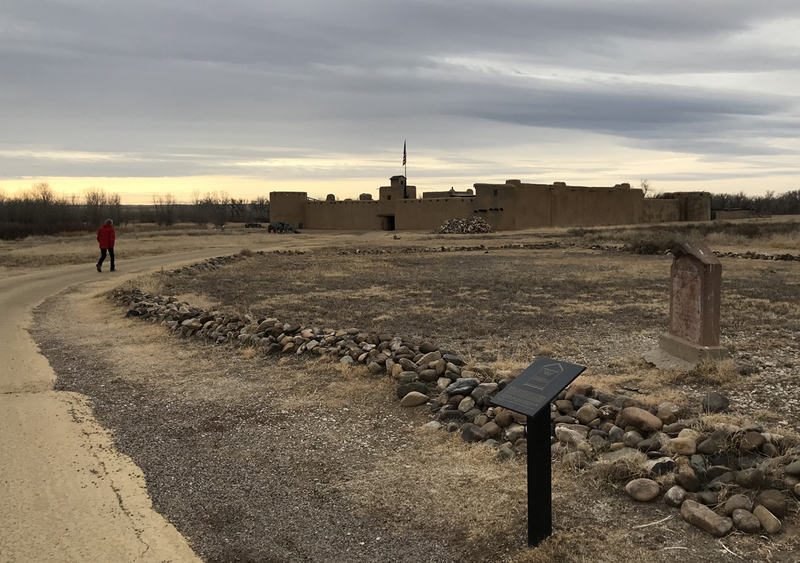 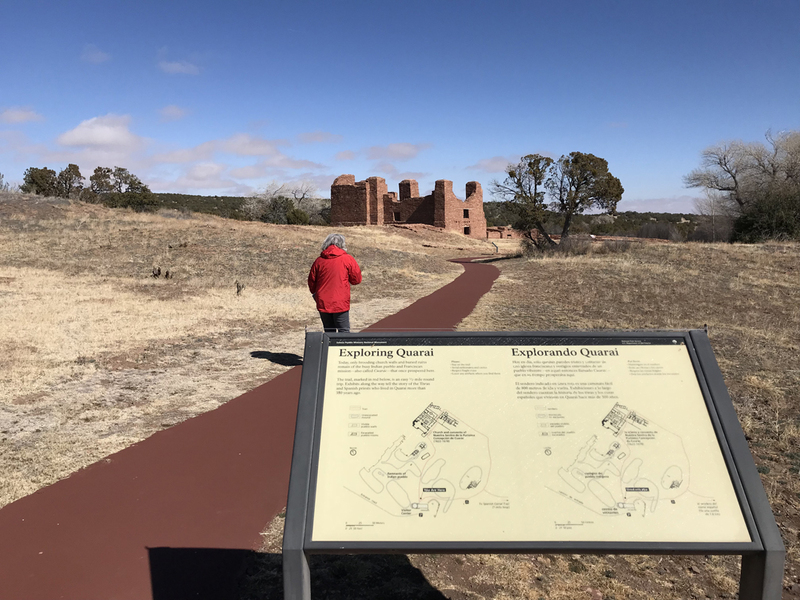 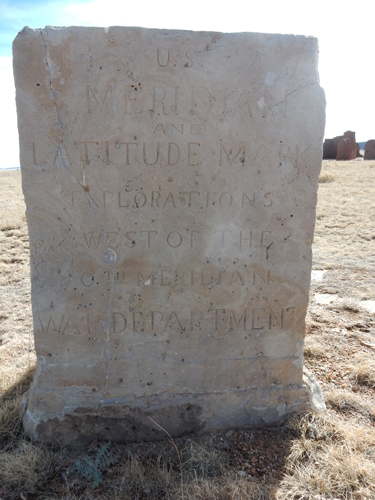 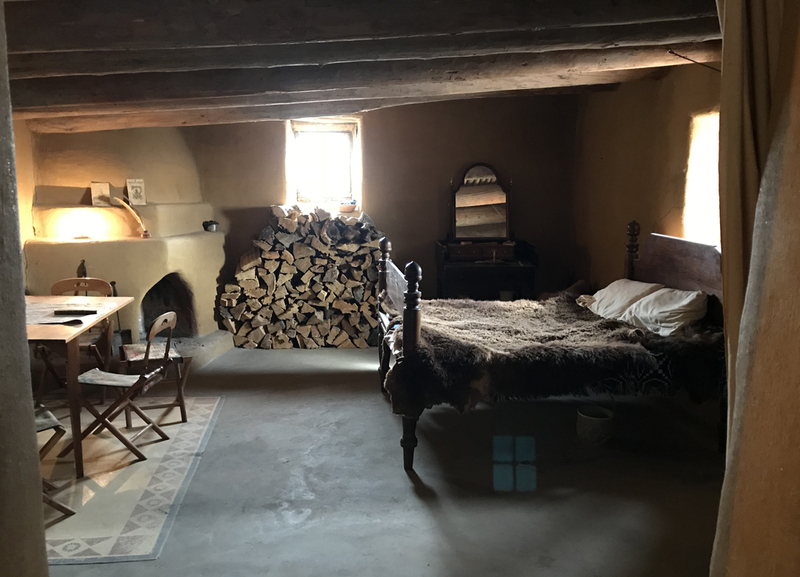 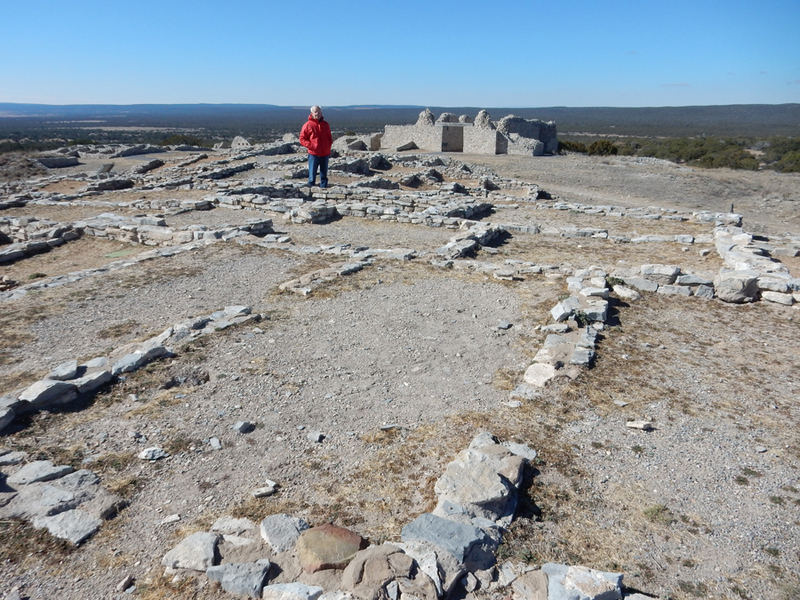 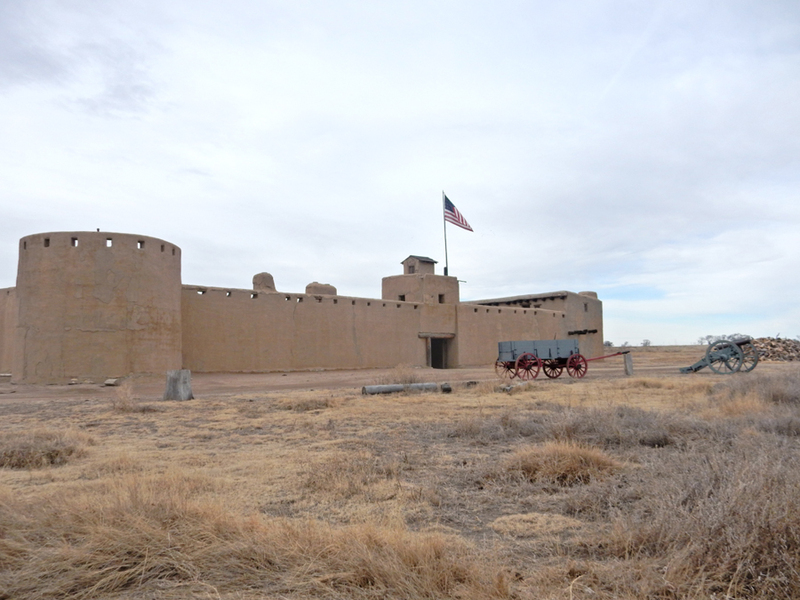 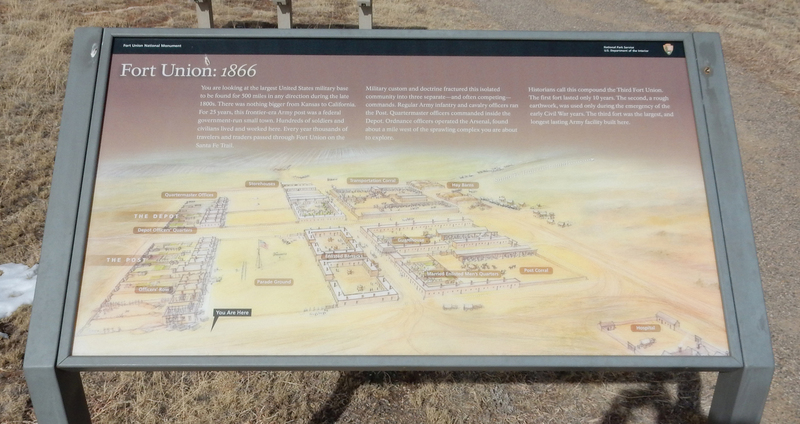 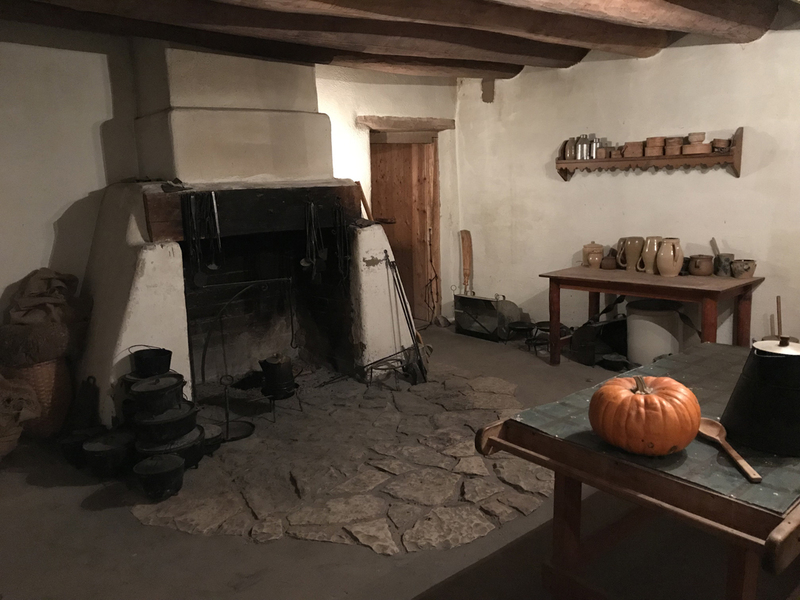 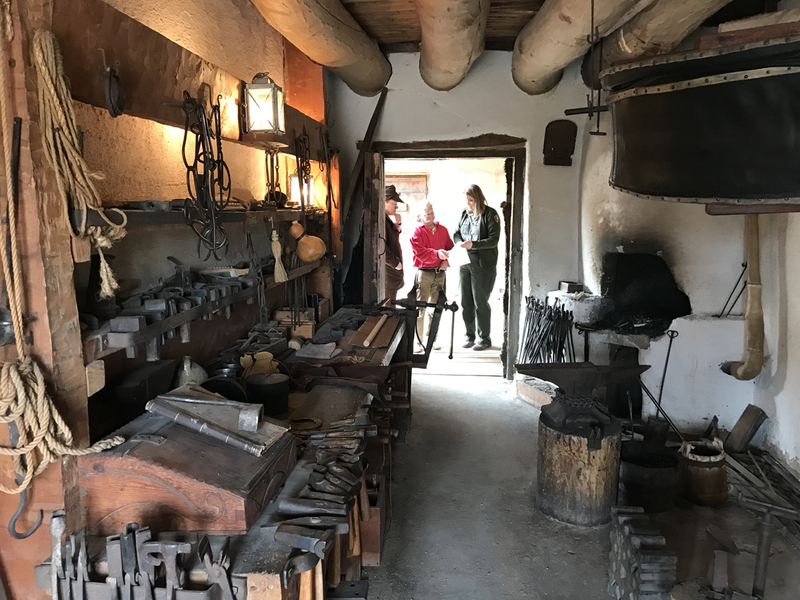 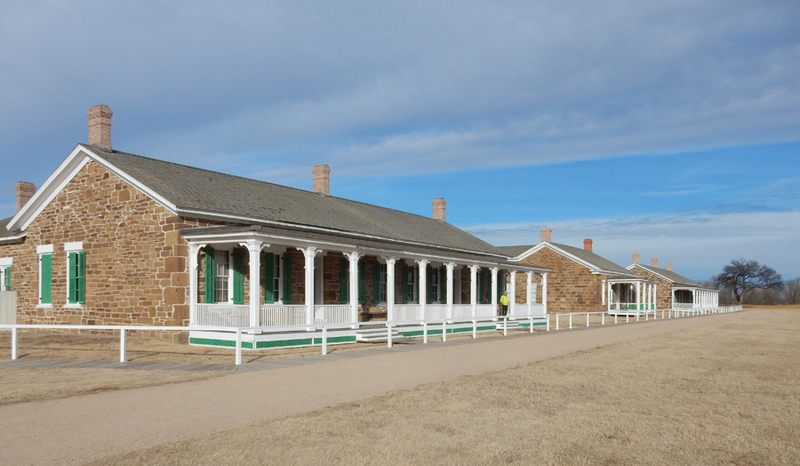 The fort was on the Mountain Branch of the Santa Fe Trail (SFT) and was a cultural crossroads for trappers, hunters, traders, Indians, and Mexicans. 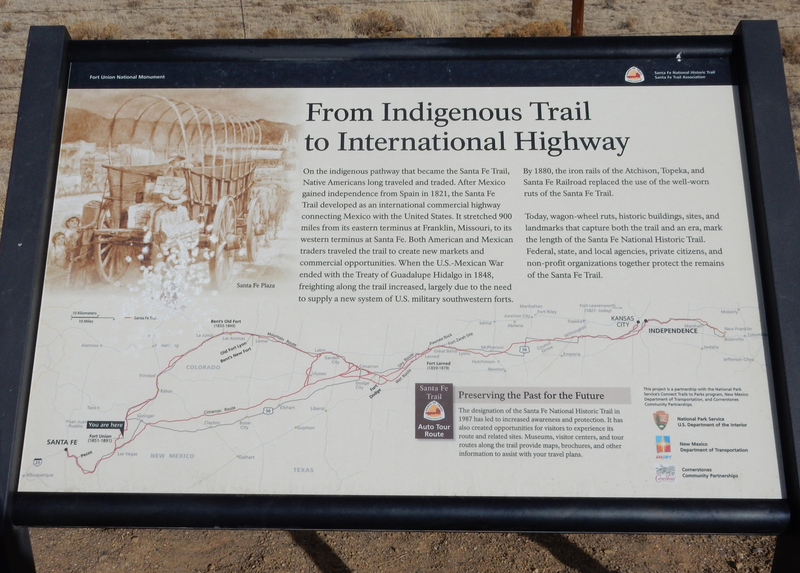 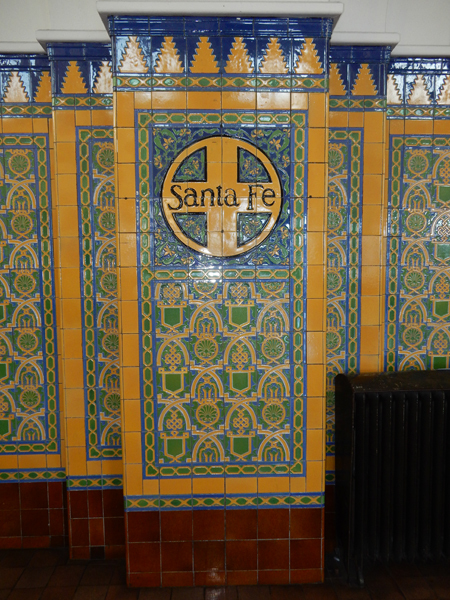 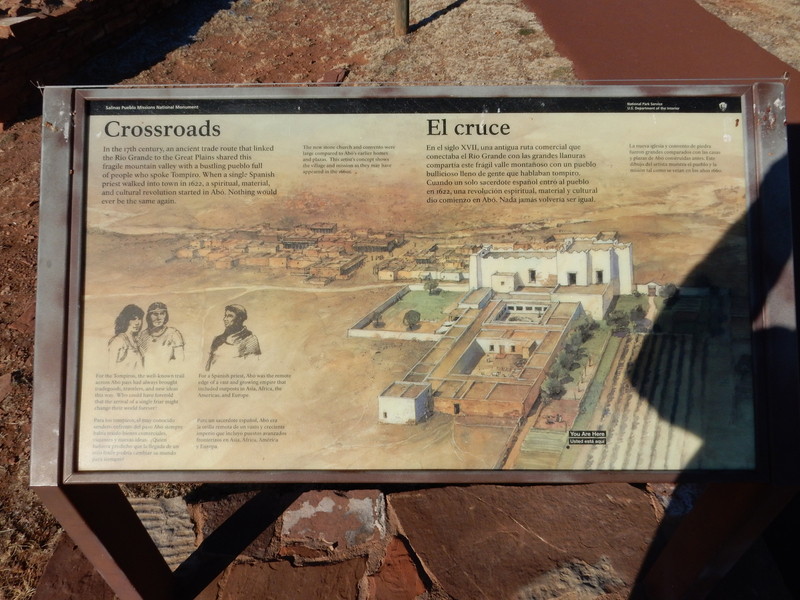 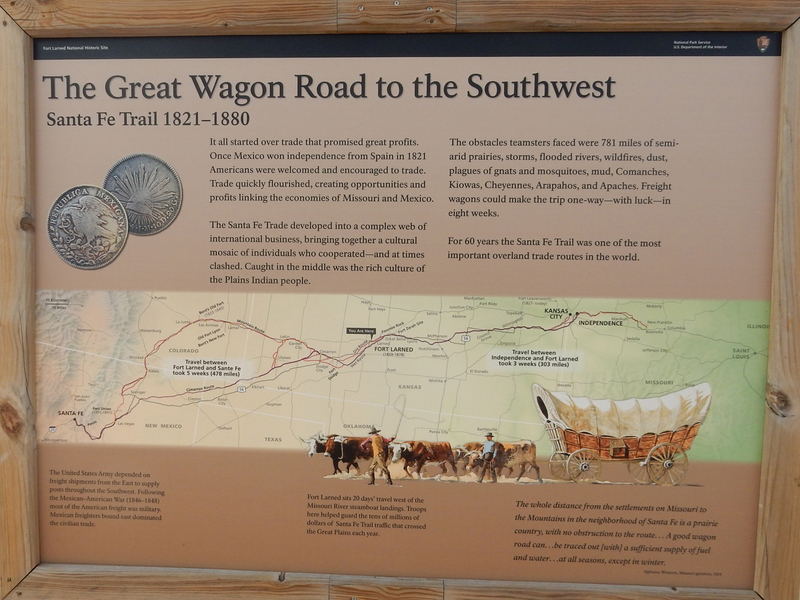 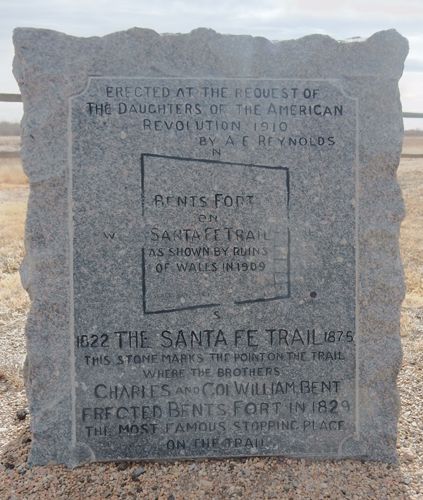 The SFT connected with the El Camino Real de Tierra Adentro Trail (Royal Road) at Santa Fe, which extended trade deep into Mexico. 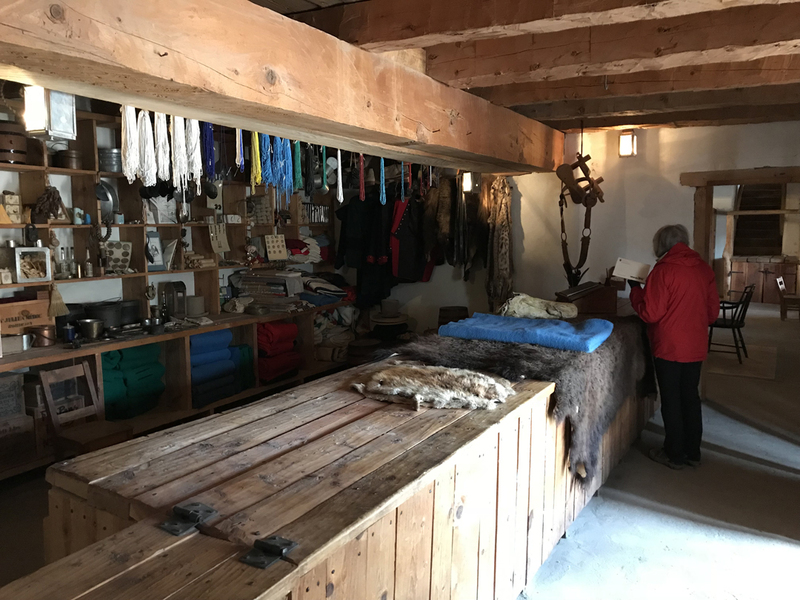 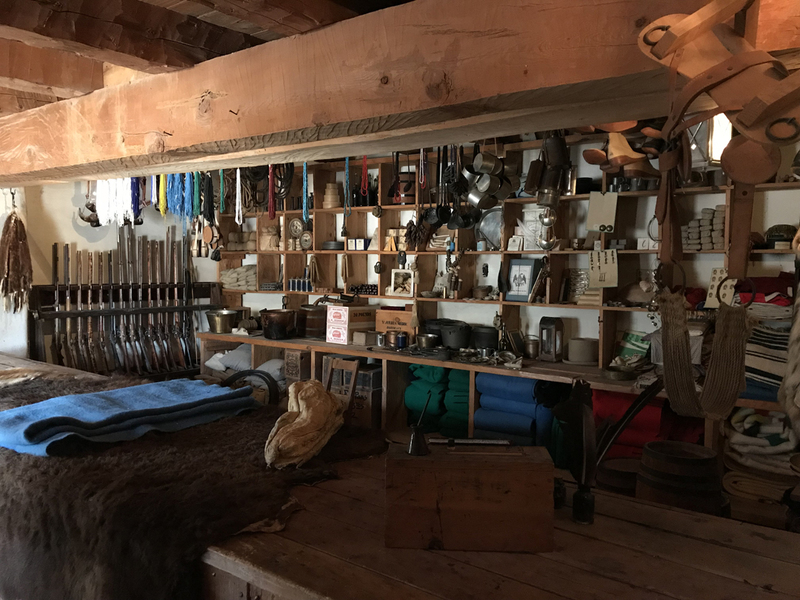 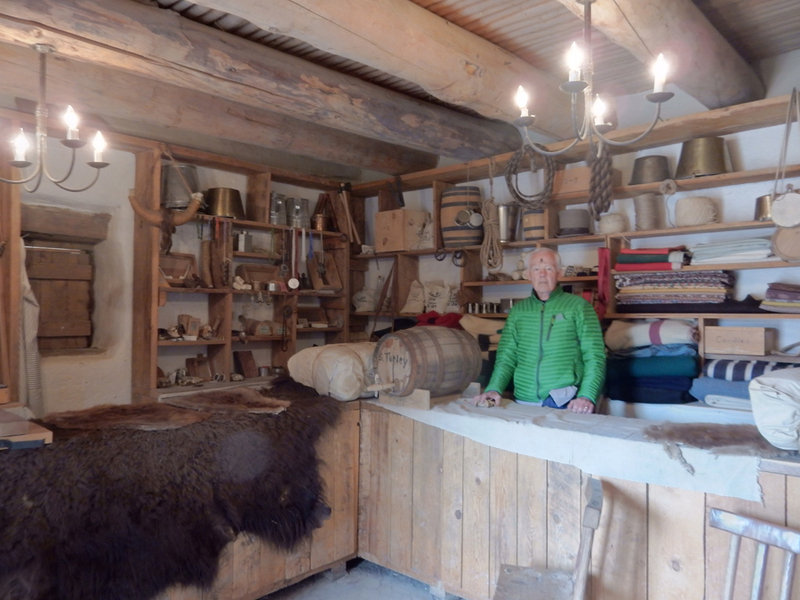 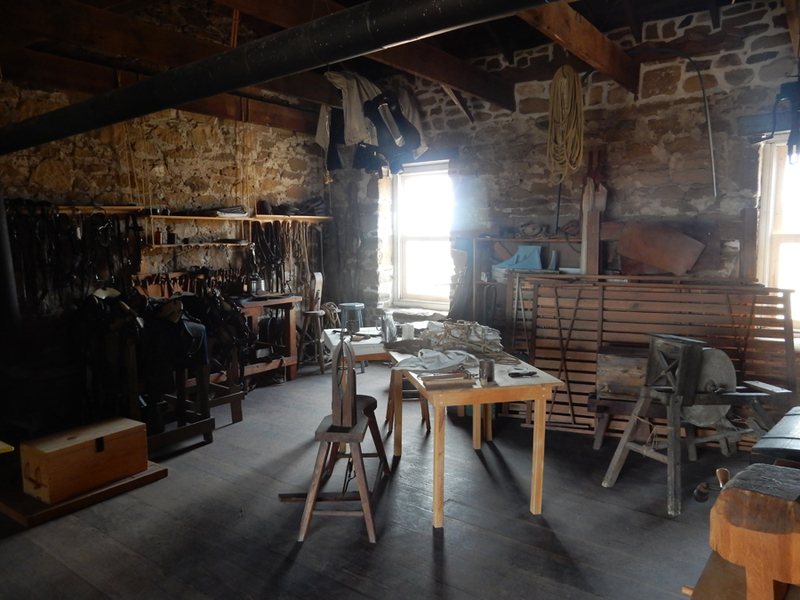 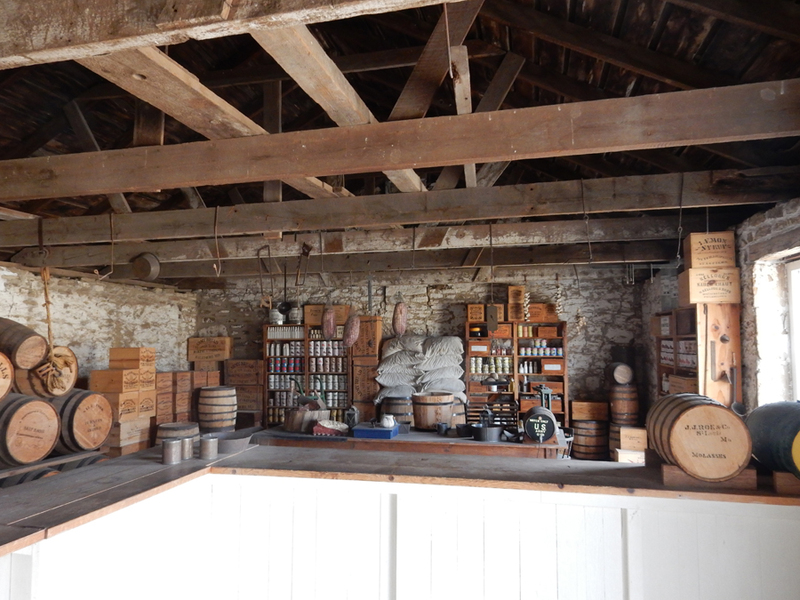 The trading post relied heavily on oxen, mules and horses for transporting furs and trade goods down the 600-mile trail to and from Missouri. 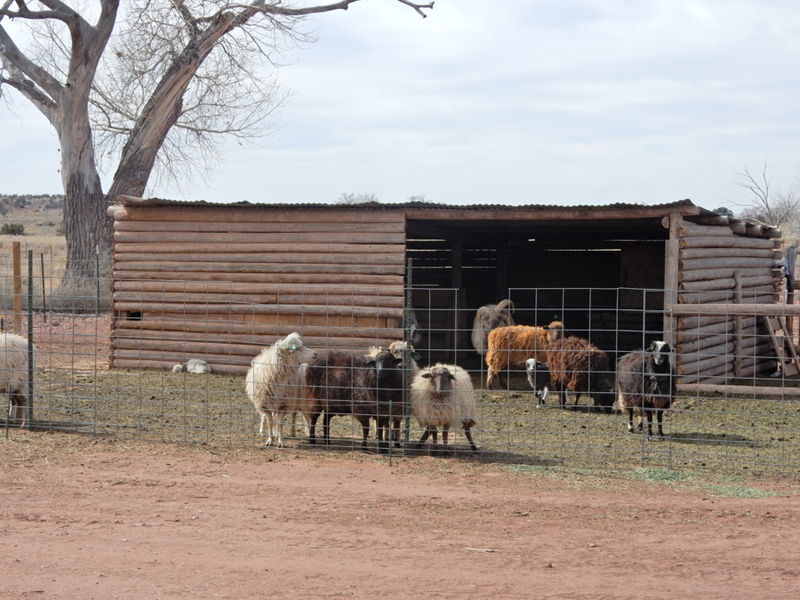 Journals mention goats, chickens, pigs, buffalo calves, milk cows, peacocks and sheep. 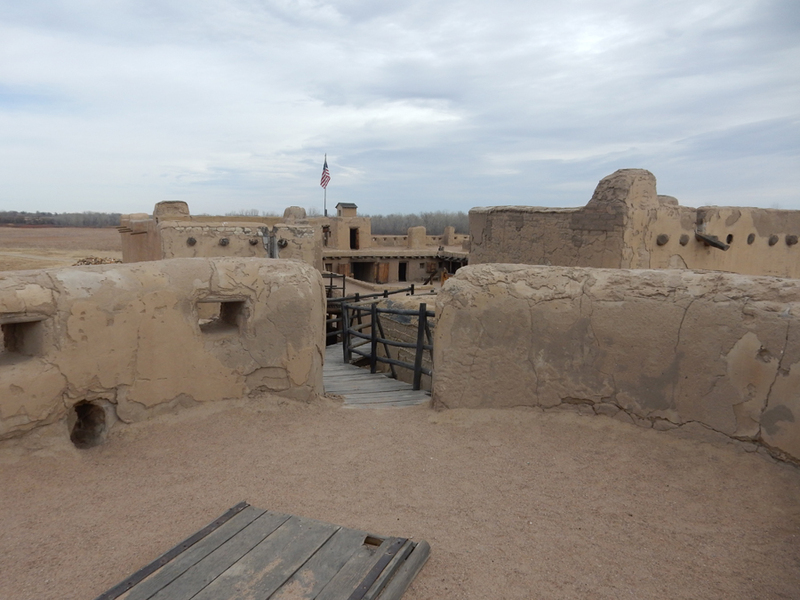 Oxen, Spanish horses and a mule graze in and outside the fort. 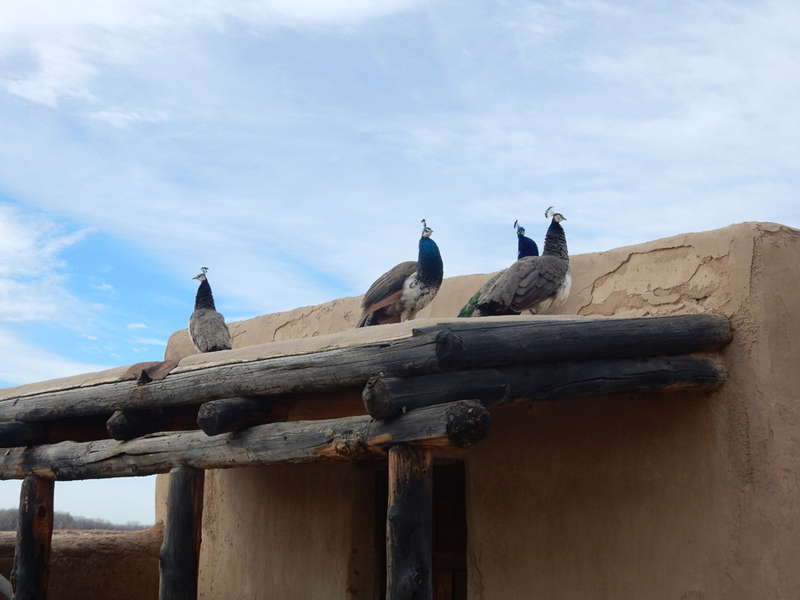 Peacocks and chickens roam the rear corral, much like in the 1840s. 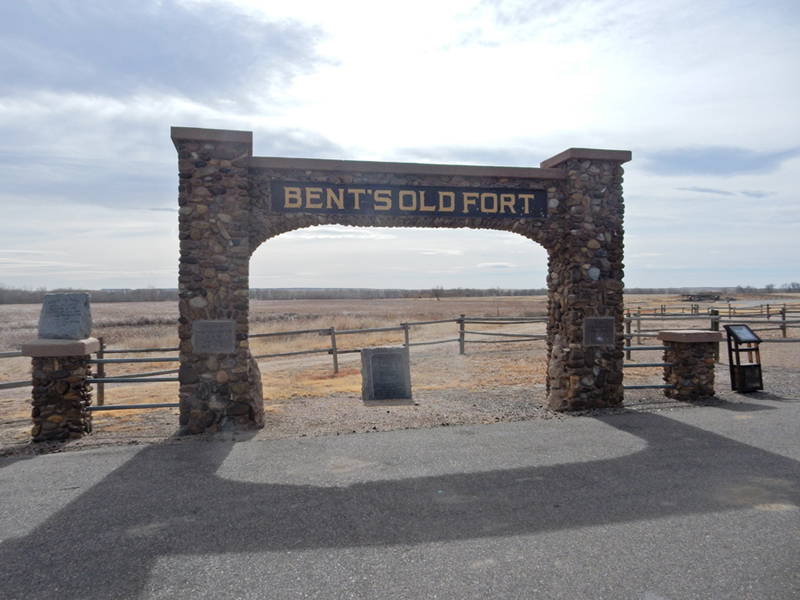 Charles Bent moved to Taos, married into a prominent family, and directed the SFT trade from there. 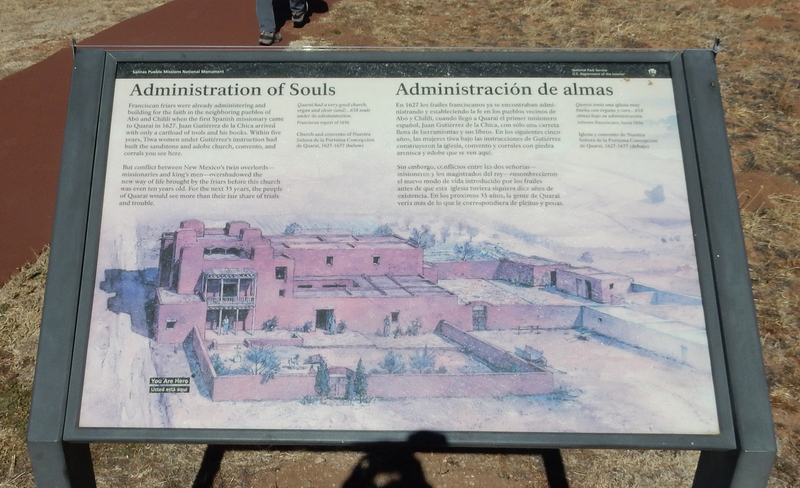 He was named Provisional Governor of New Mexico in 1846. 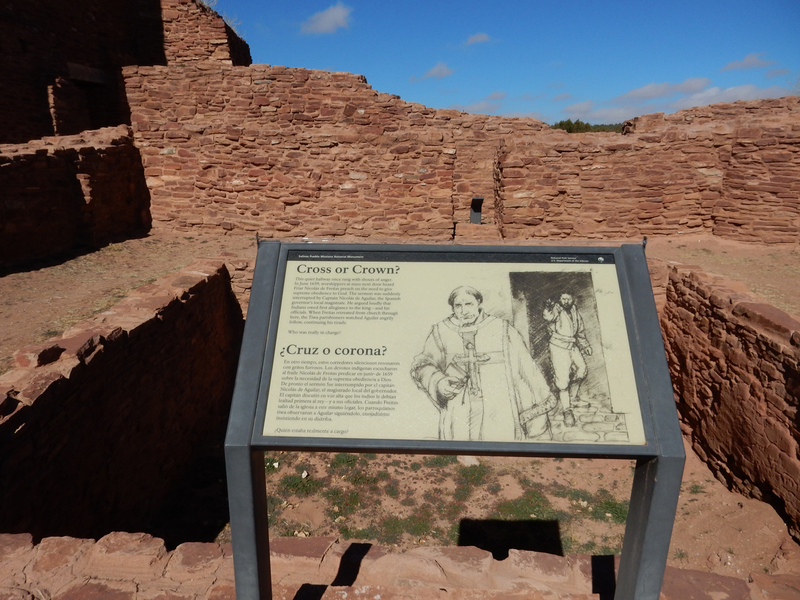 He was killed in 1847 during a revolt of the Hispanics and Pueblo Indians against the U.S. William Bent married Owl Woman, daughter of Cheyenne Chief White Thunder and sometimes lived in her village. 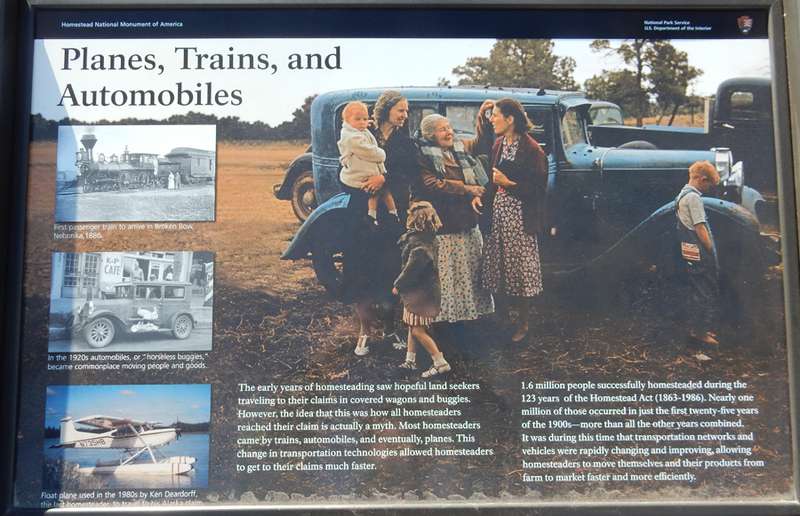 They had four children. 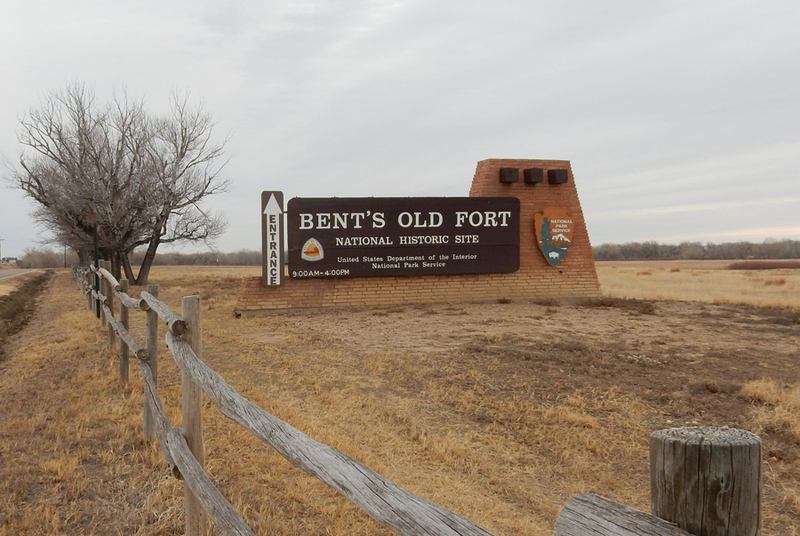 Bent also took Owl Woman’s sisters, Yellow Woman and Island, as secondary wives. 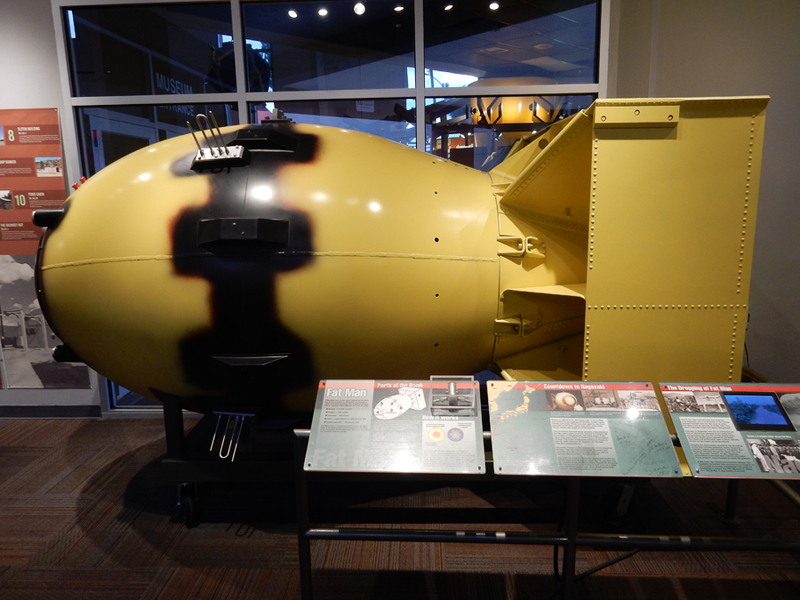 He had his fifth child with Yellow Woman. 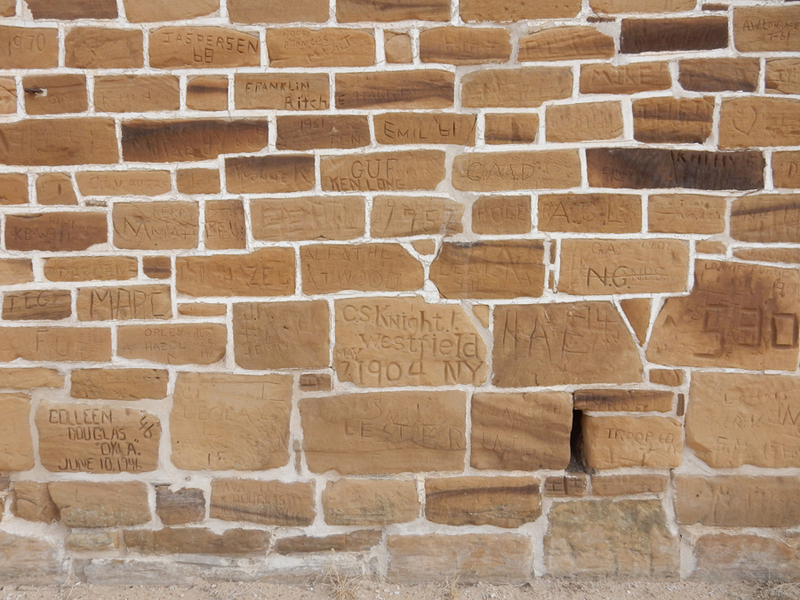 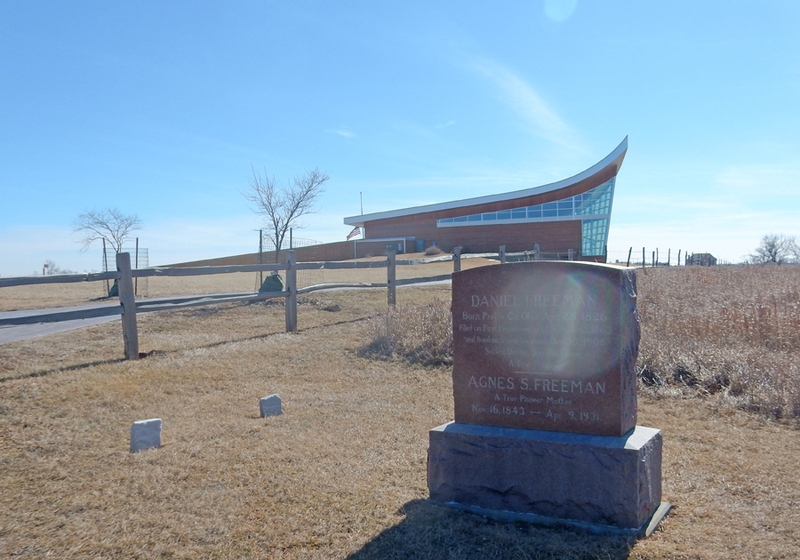 After Owl Woman died in 1847, Island cared for her children. 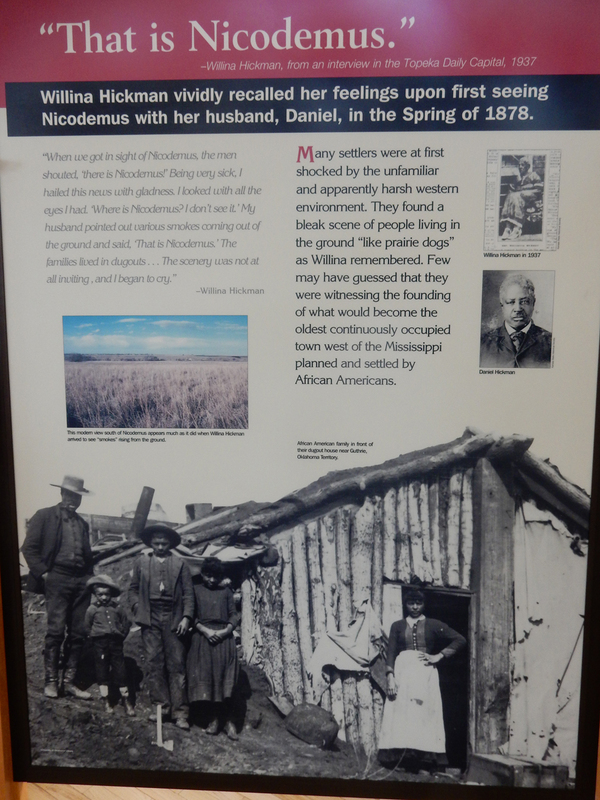 Each of the sisters left Bent and, in 1869, he married the young Adaline Harvey, the educated mixed-race daughter of Alexander Harvey, a friend who was a prominent American fur trader. 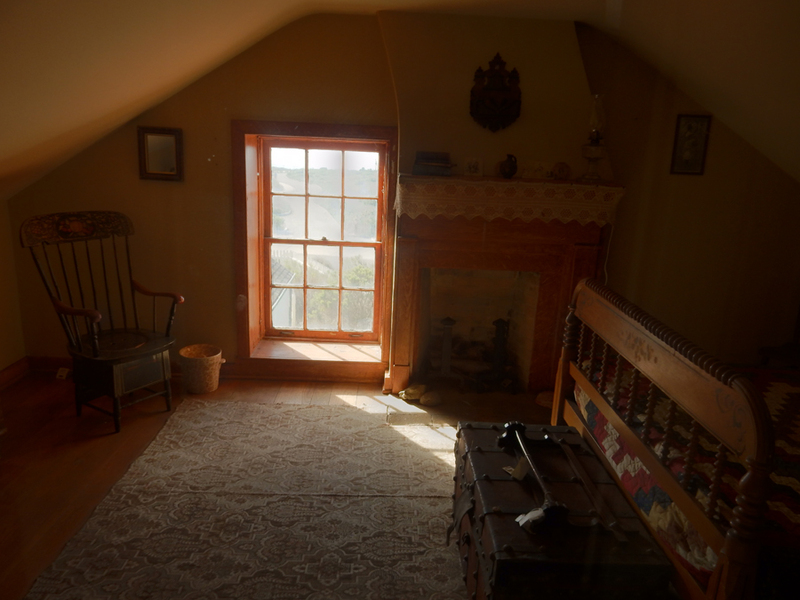 Bent died shortly after their marriage, and Adaline bore their daughter, his sixth child, after his death. 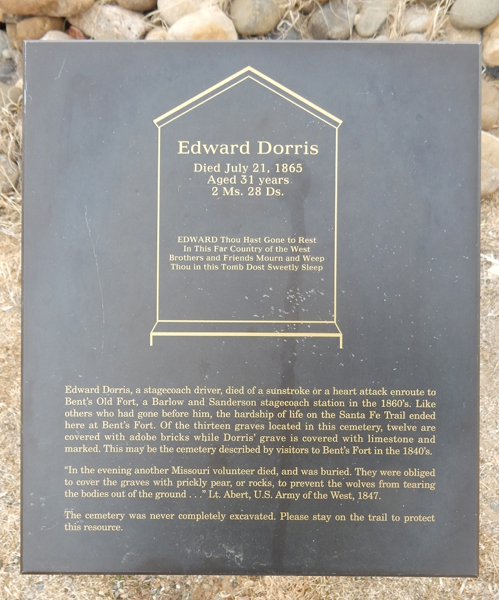 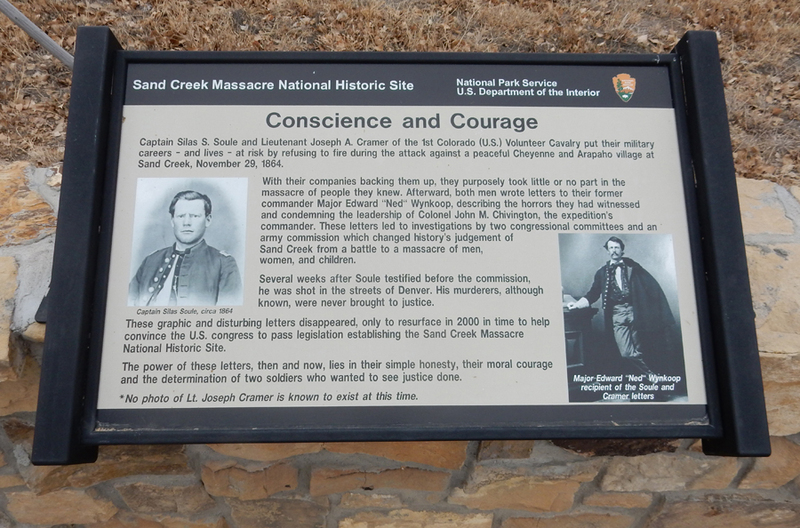 I mention the genealogy here because his male children would play a significant role during and after the 1864 Sand Creek Indian Massacre. 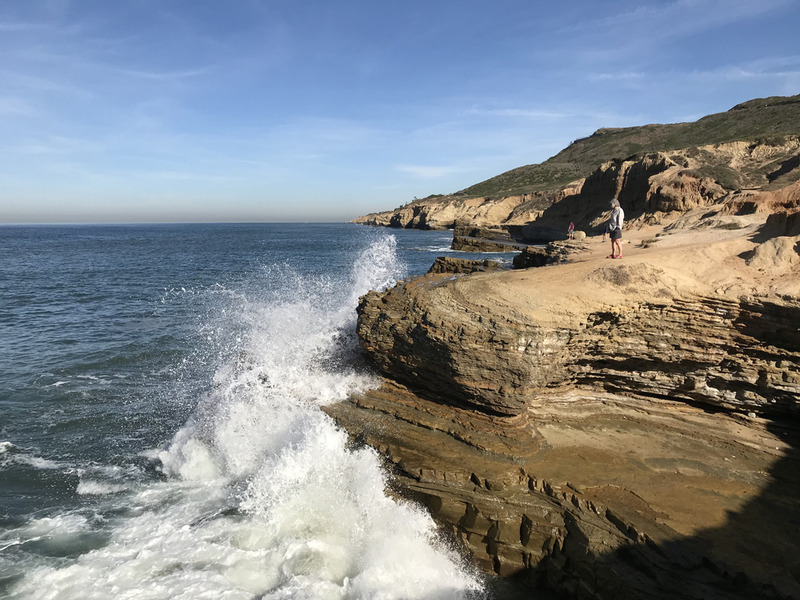 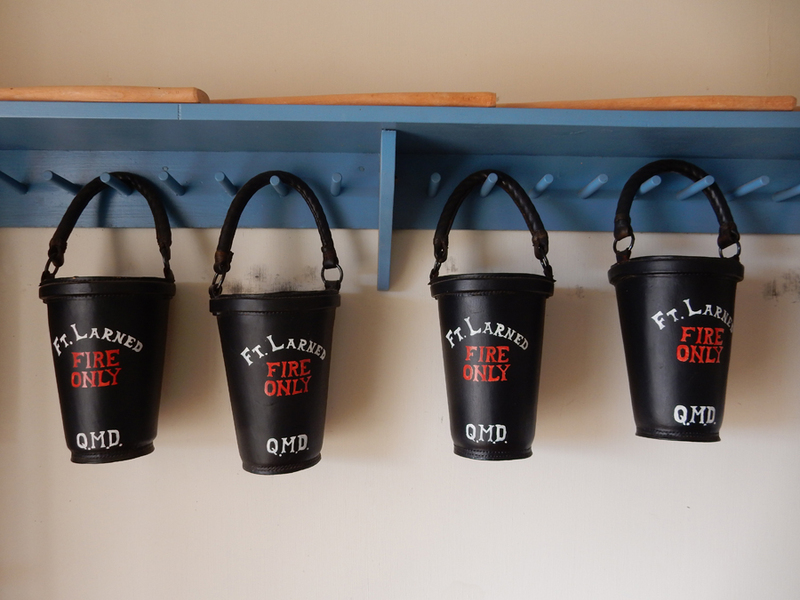 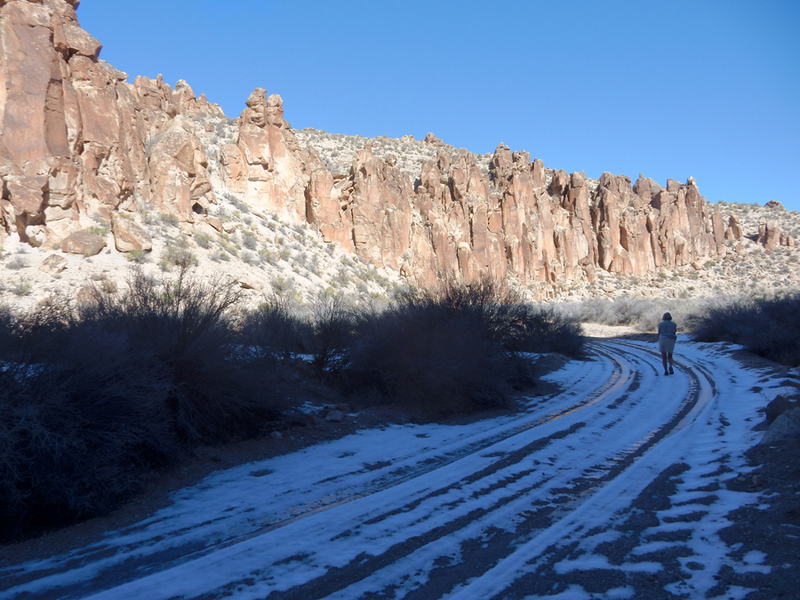 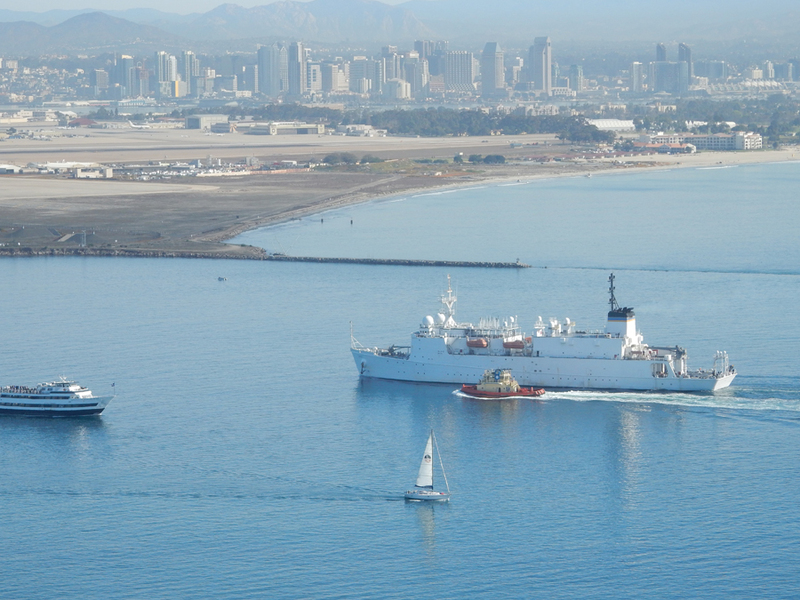 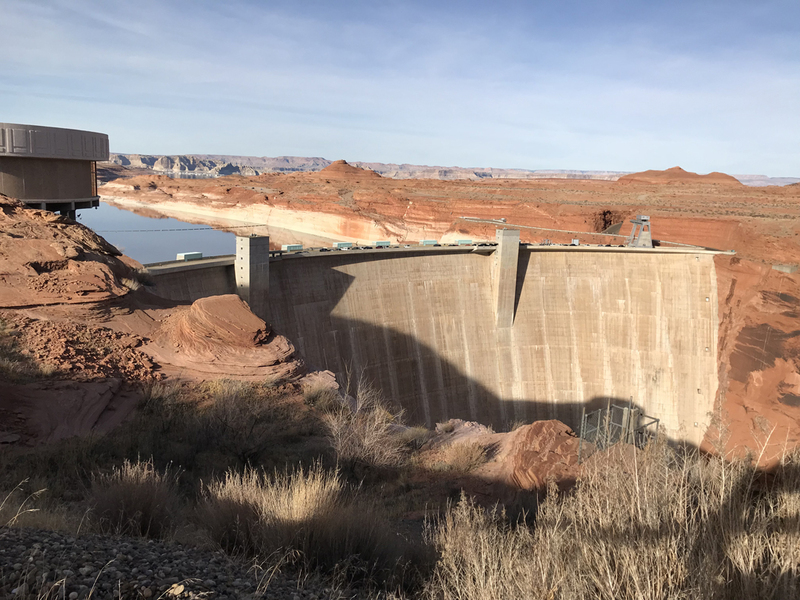 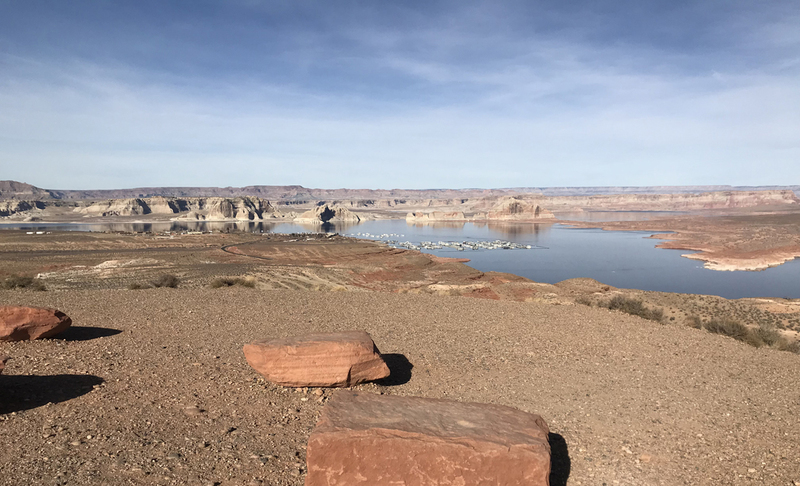 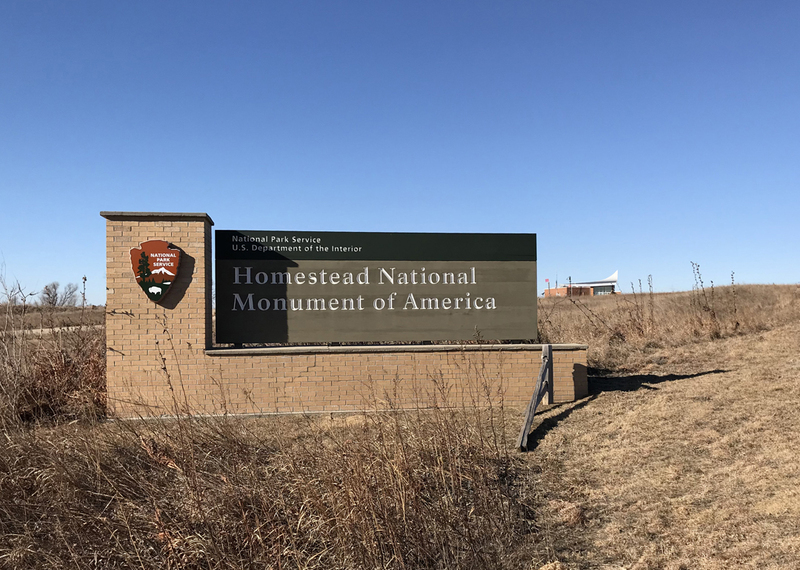 Again, a personal ranger tour, I guess February is a good time to visit these sites – provided you check the weather and call ahead to confirm hours and availability of rangers. 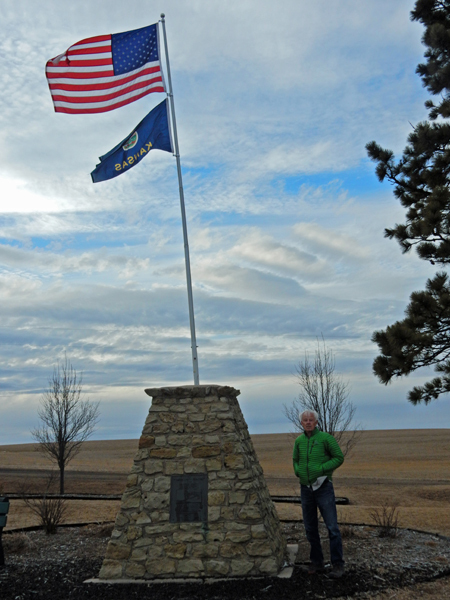 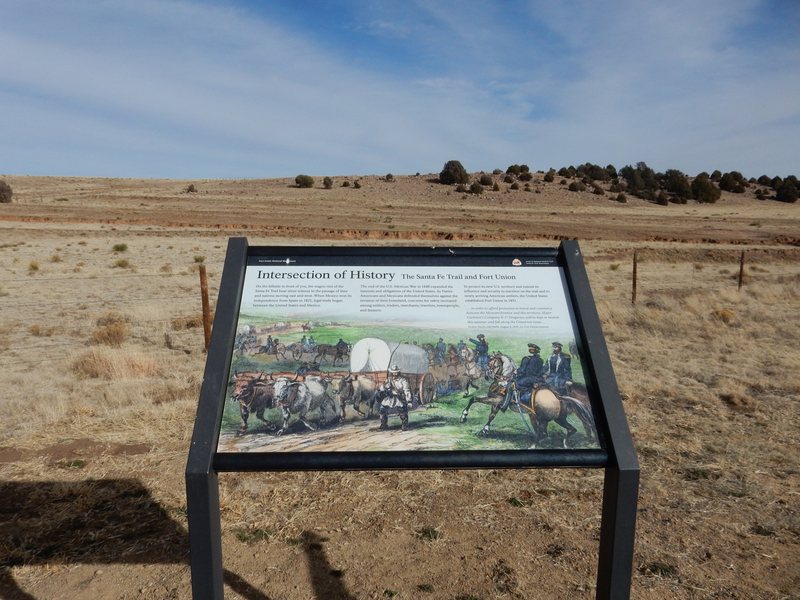 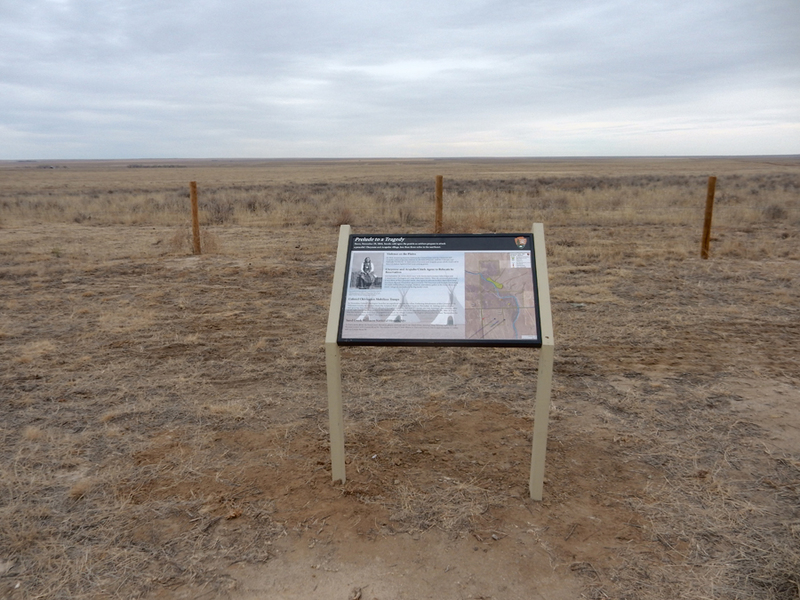 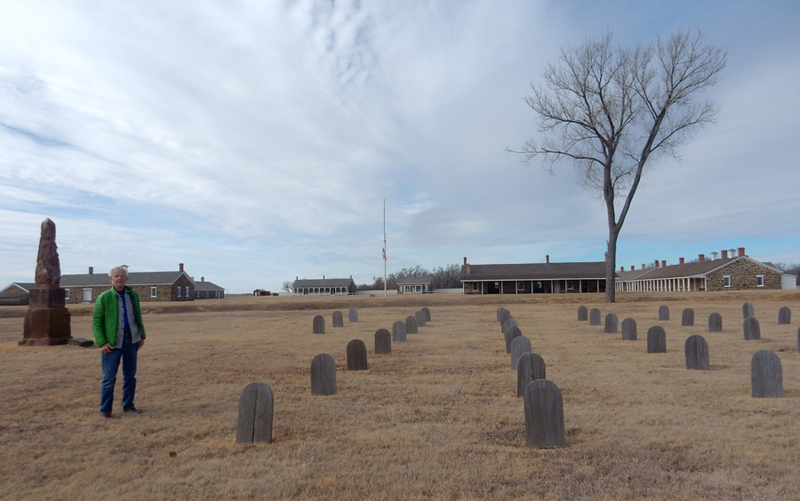 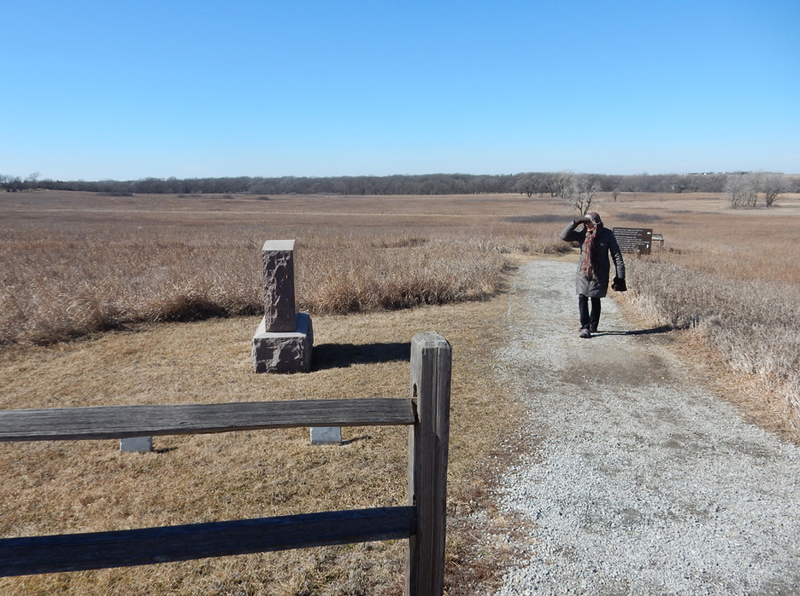 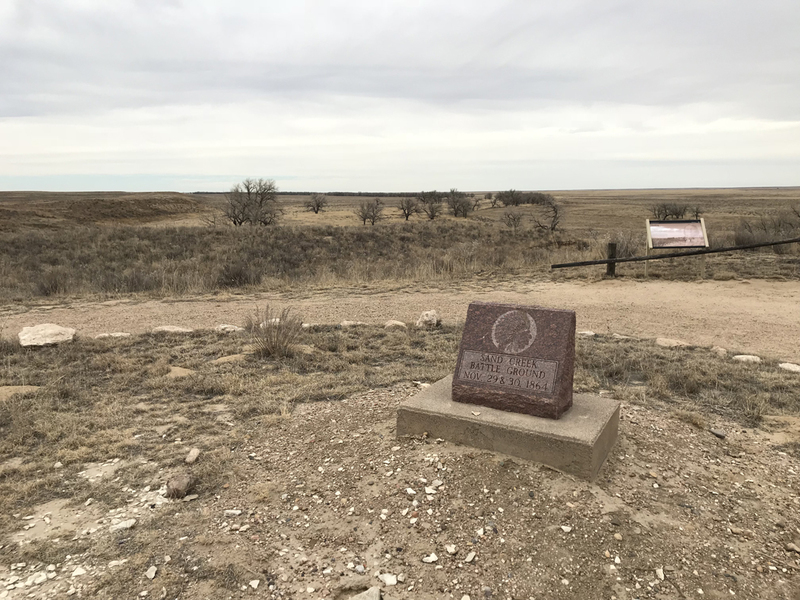 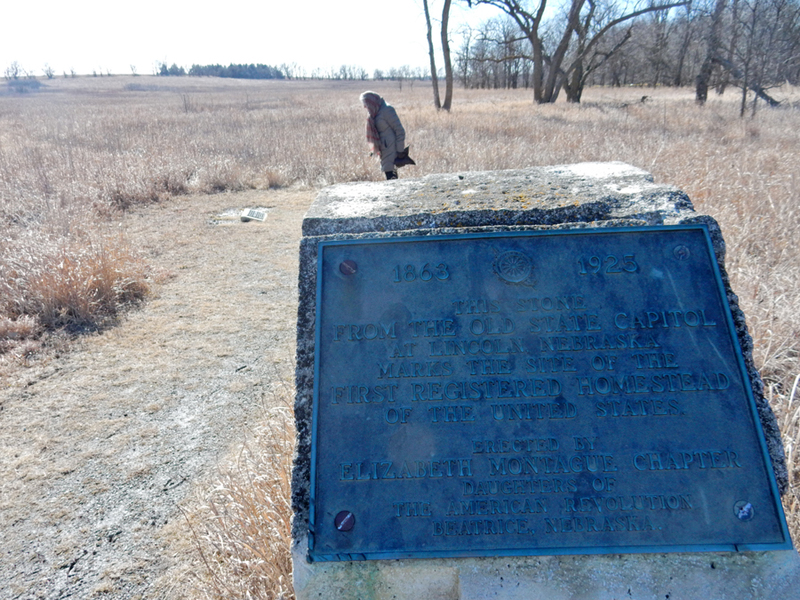 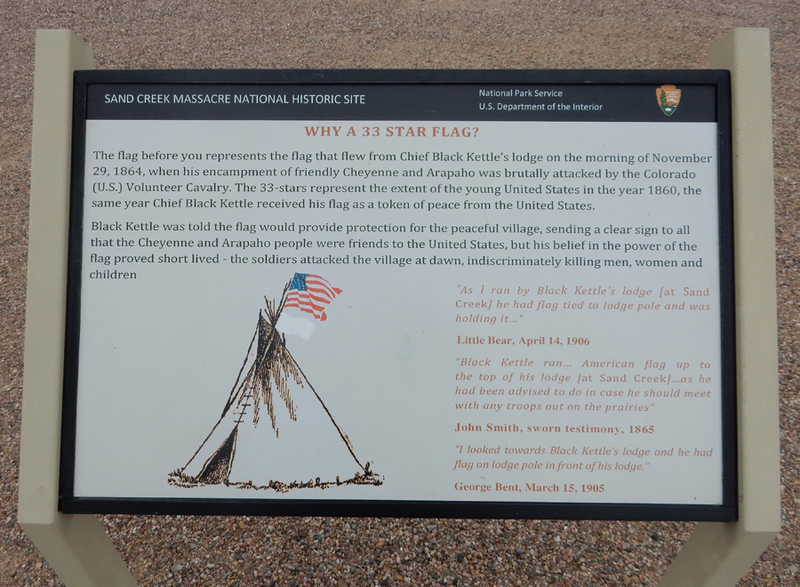 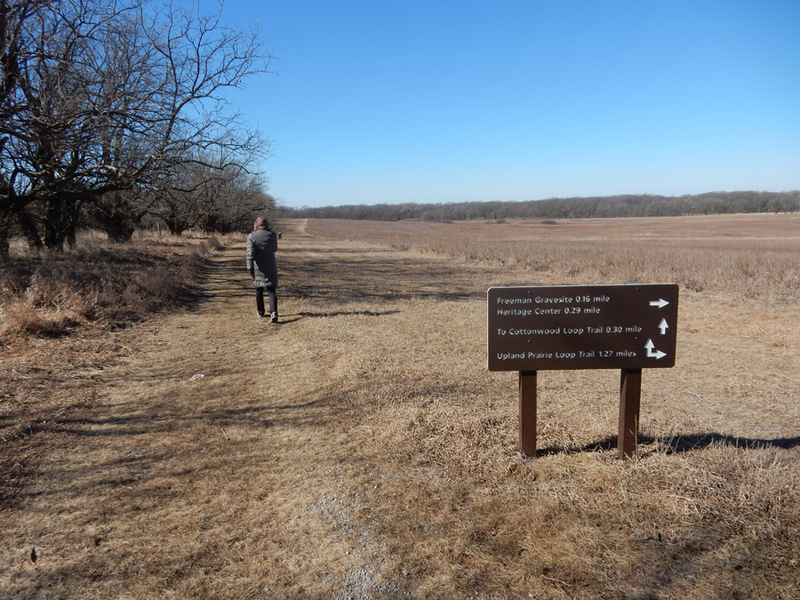 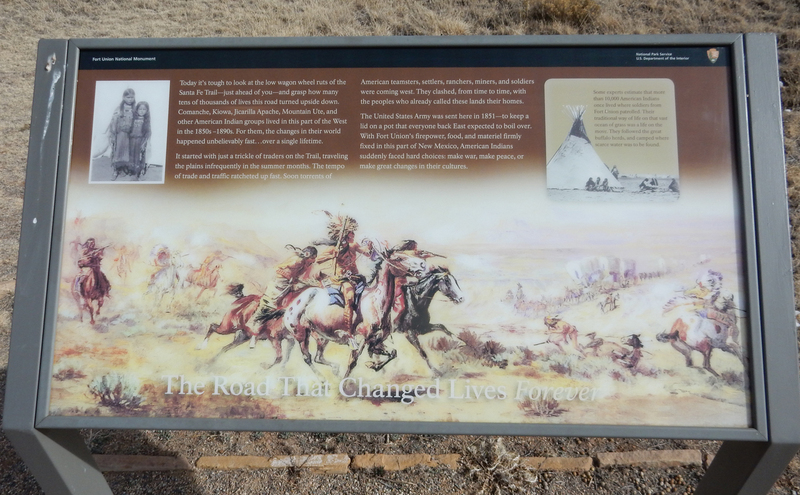 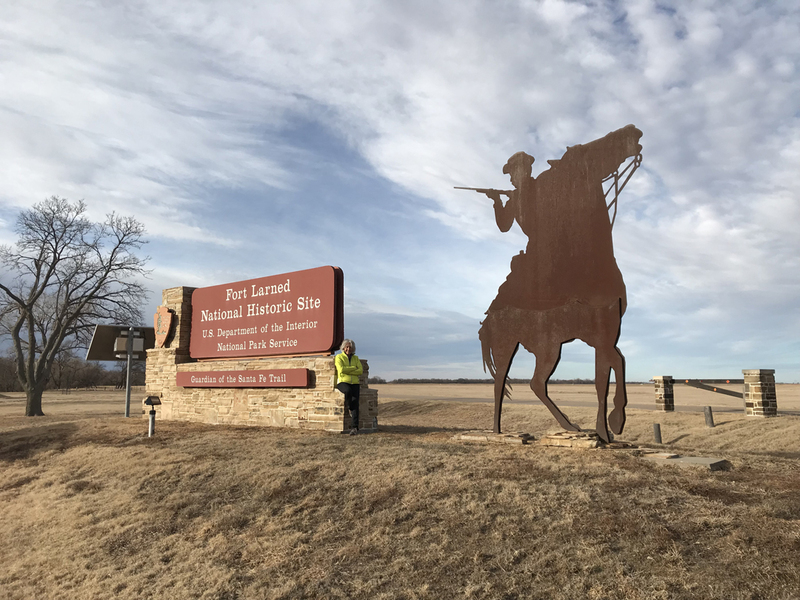 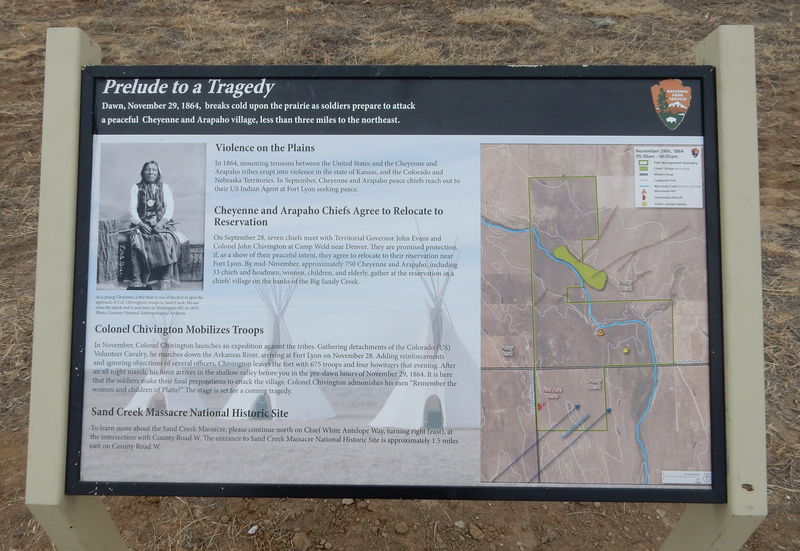 Chief Black Kettle and his wife escaped the massacre only to be killed by Gen George Custer’s troops at Washita Battlefield in OK on November 27, 1868 – see this blog for January 2018 for a description of our visit to that site. 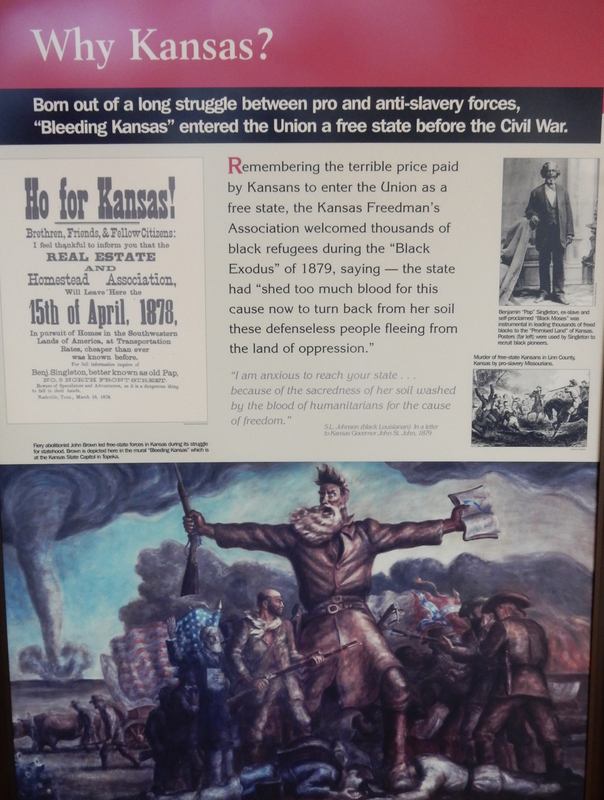 George Bent, William Bent and Owl Woman’s son who was born at Bent’s Old Fort and educated in Kansas City and St Louis, as well as his brother Charles, were with Black Kettle at Sand Creek. 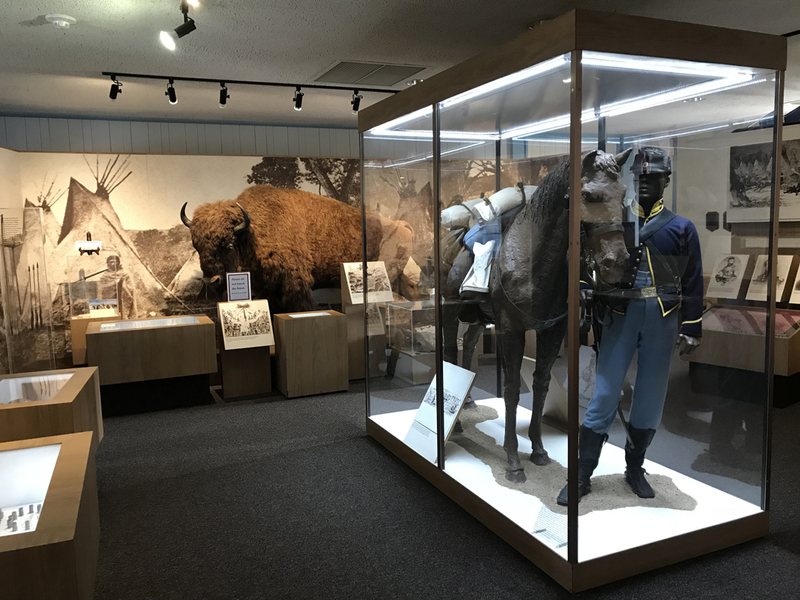 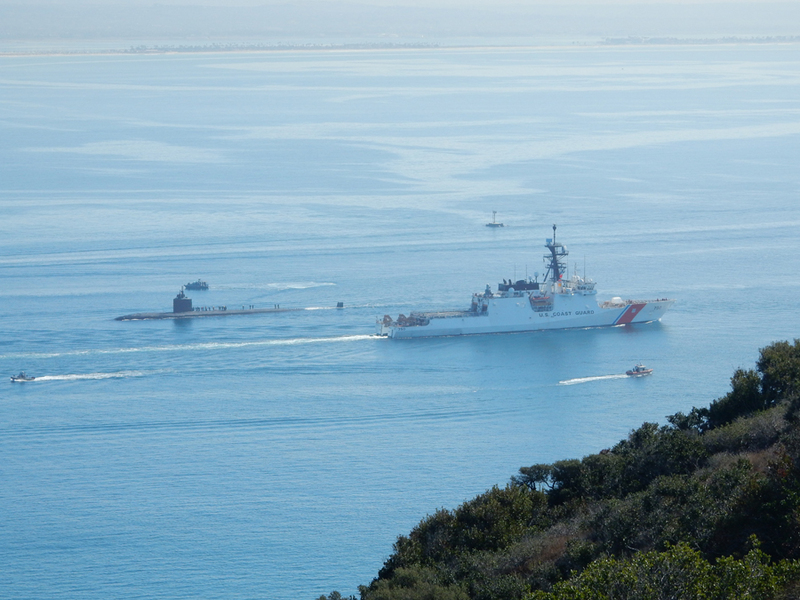 Both were wounded but escaped. 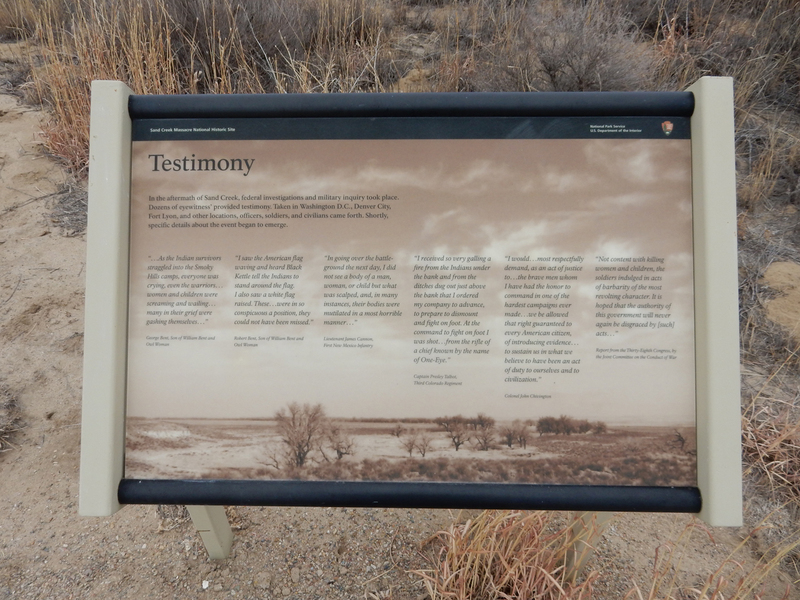 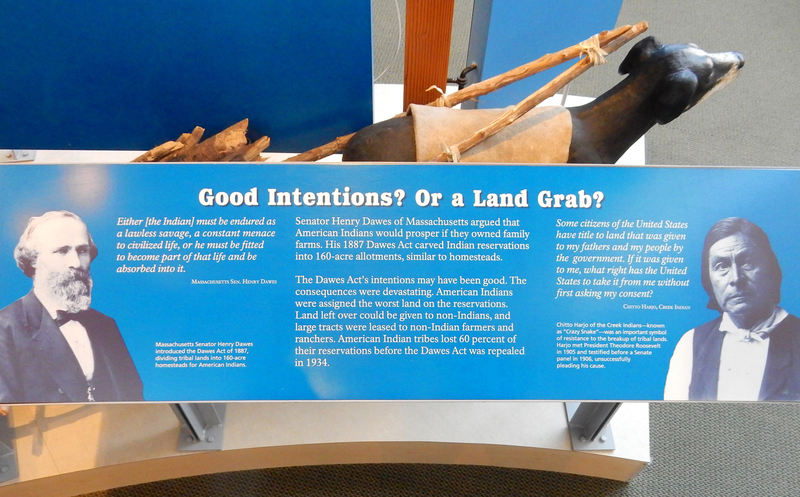 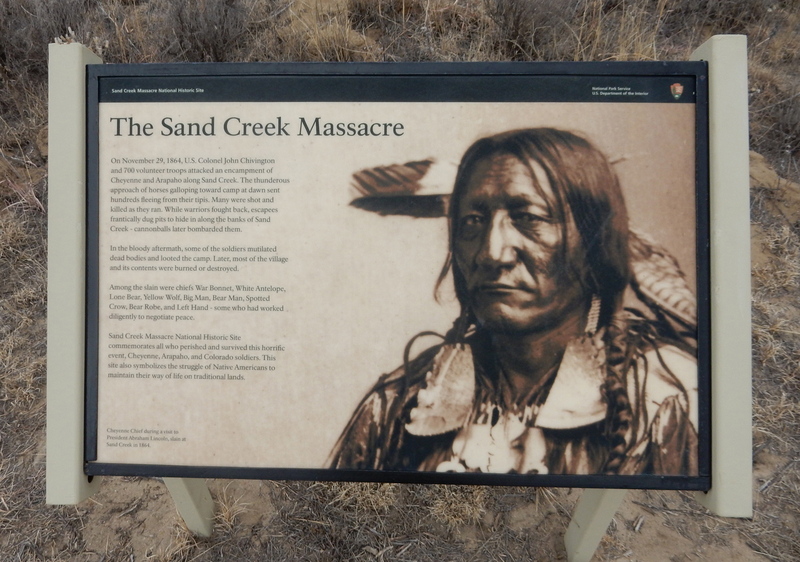 Afterward, because of the Sand Creek Massacre, they joined War Parties in attacks on towns, farms, and ranches. 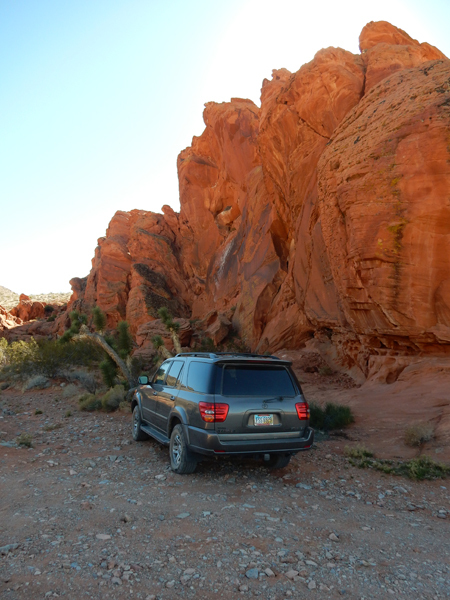 Helen was so upset after the ranger’s description of the massacre that she did not want to leave the SUV. 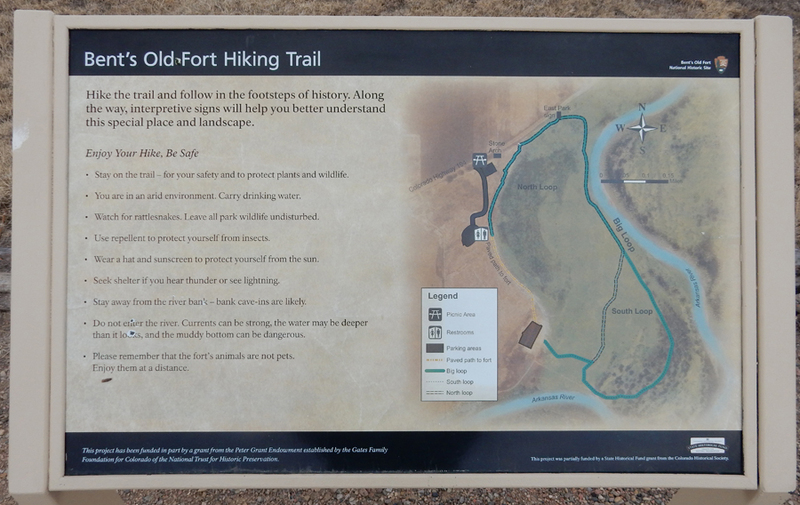 I did the 1.5 mile walk along the bluffs overlooking Sand Creek. 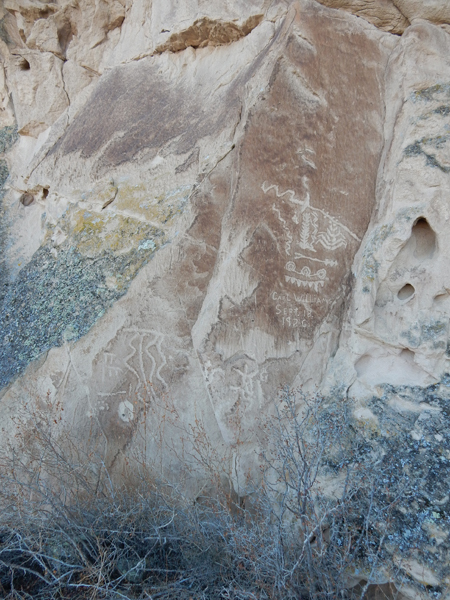 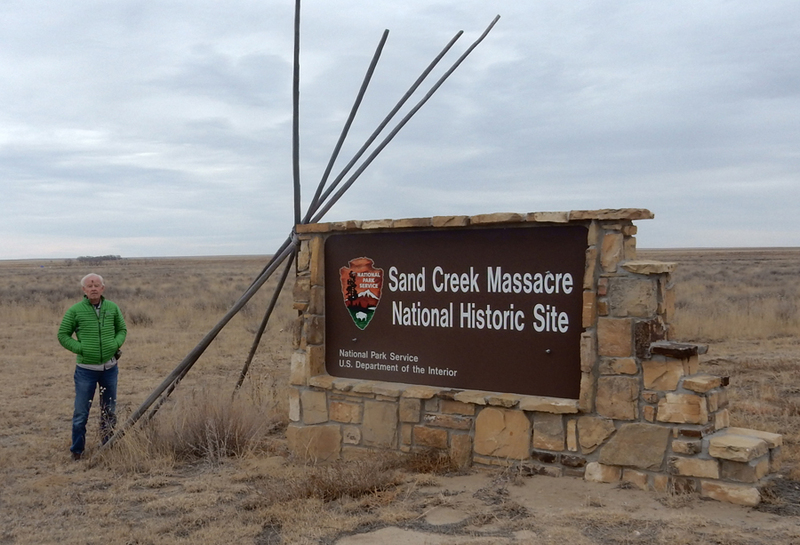 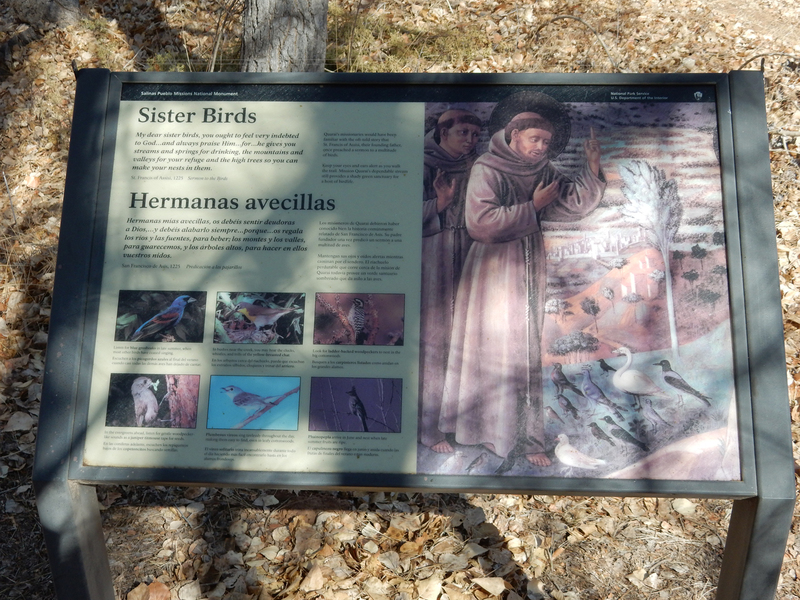 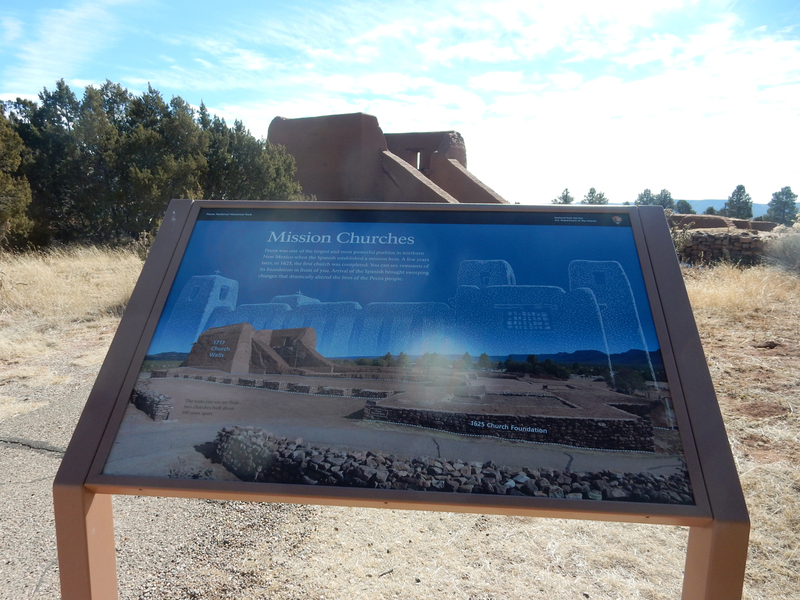 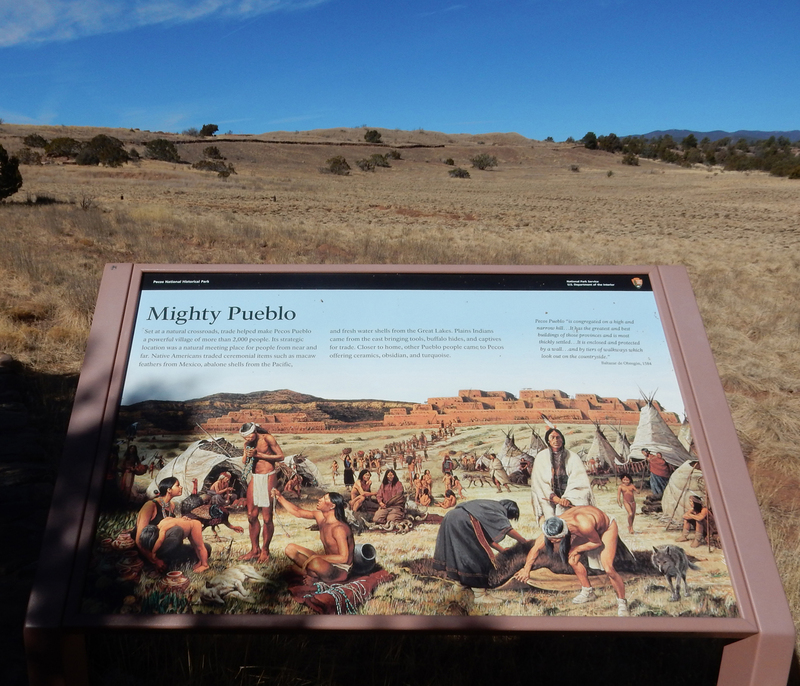 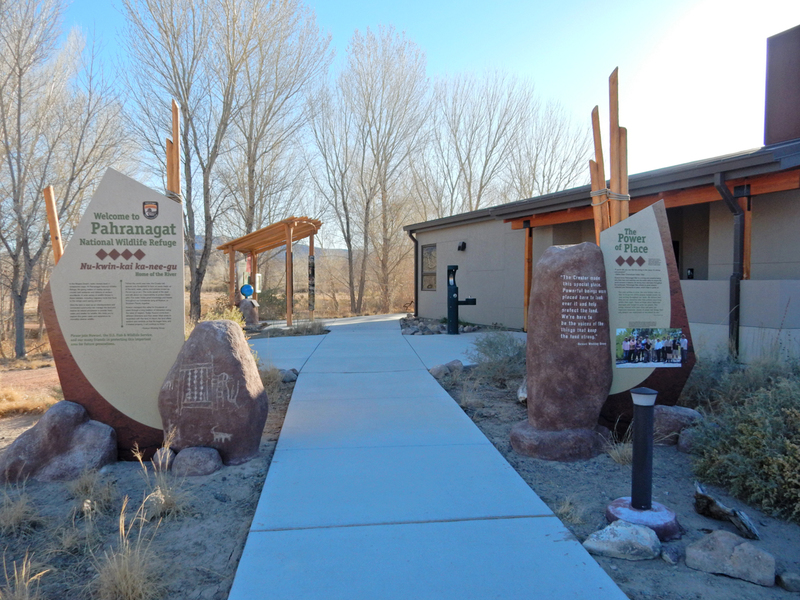 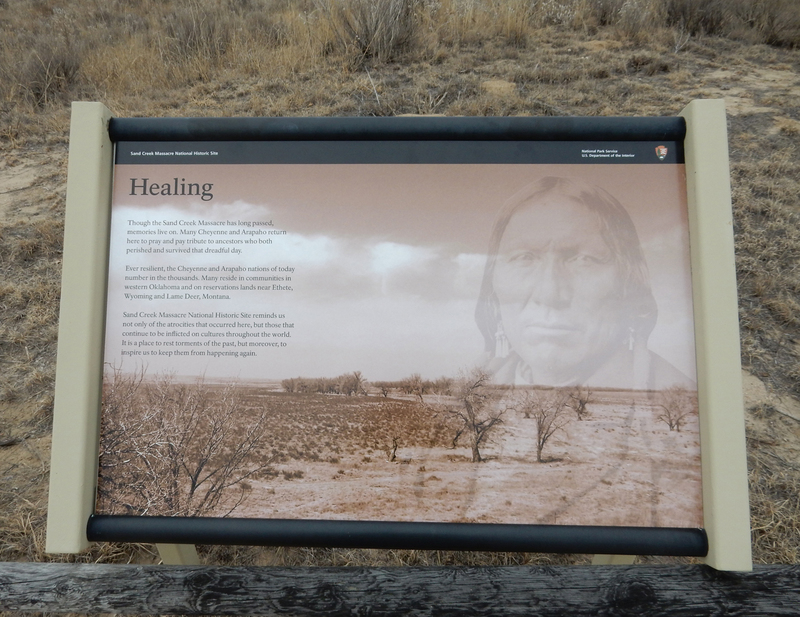 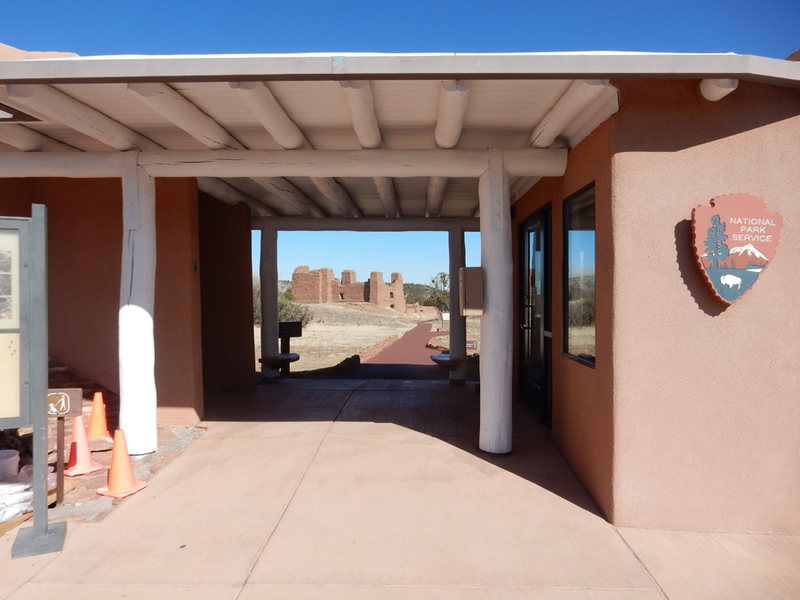 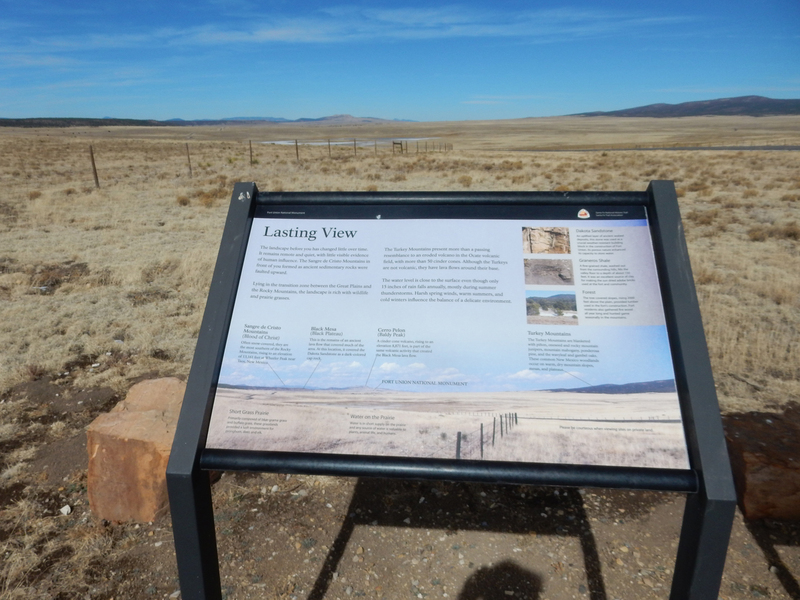 Visitors are requested not to descend to Sand Creek because it is considered Sacred Ground. 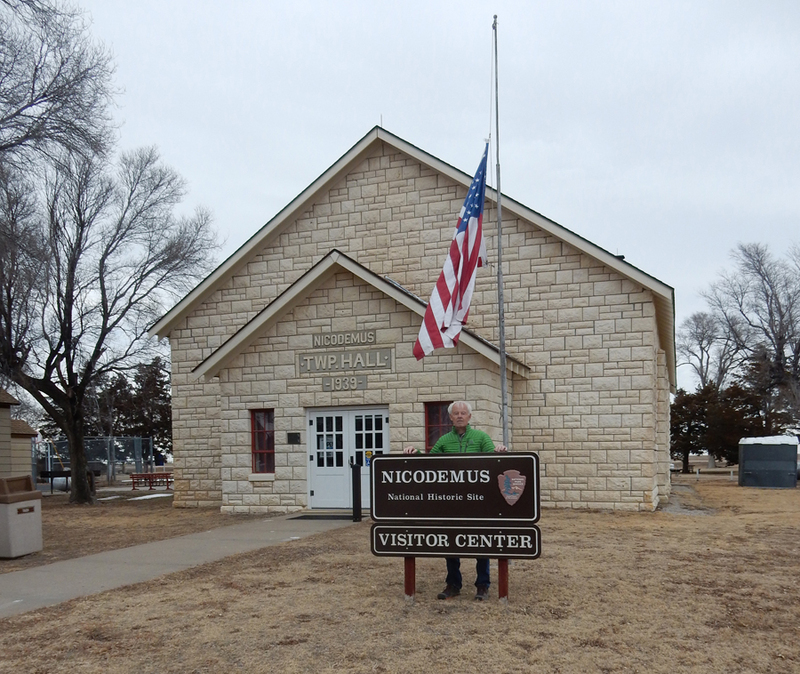 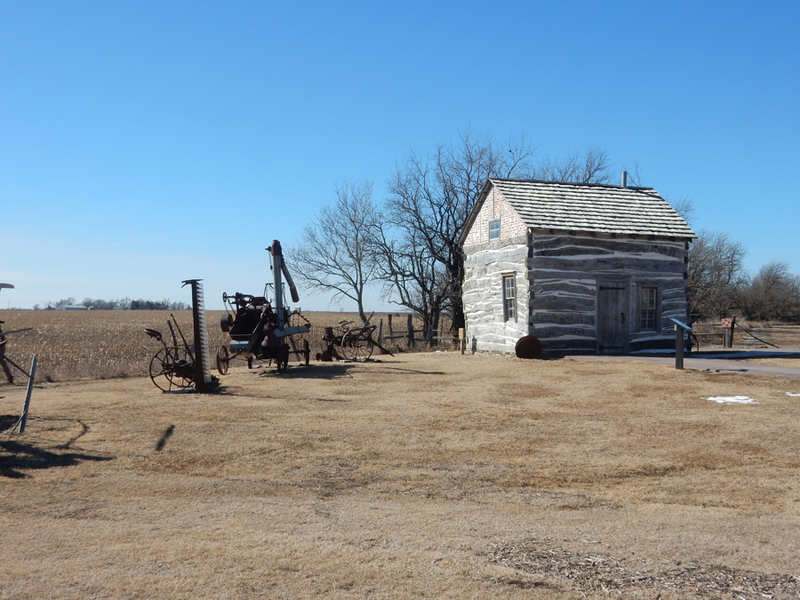 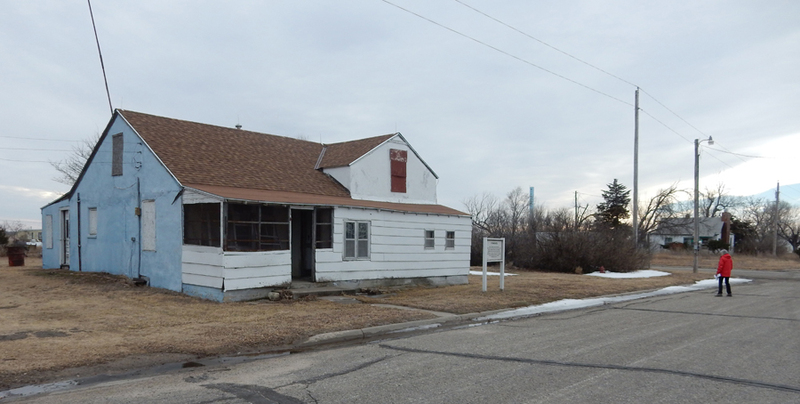 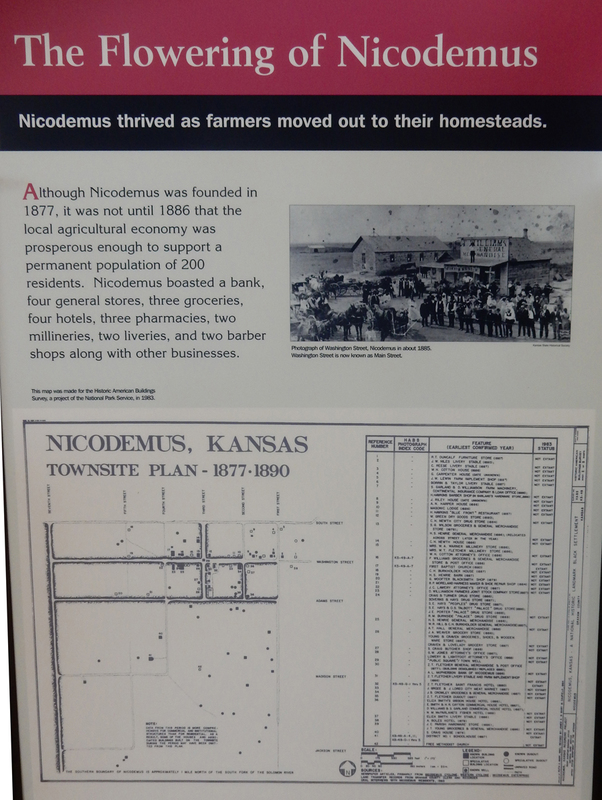 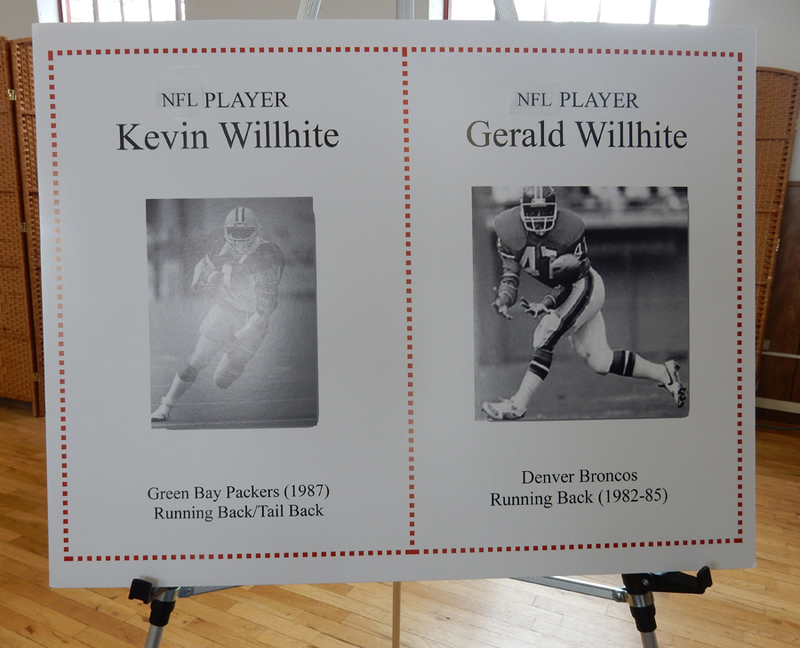 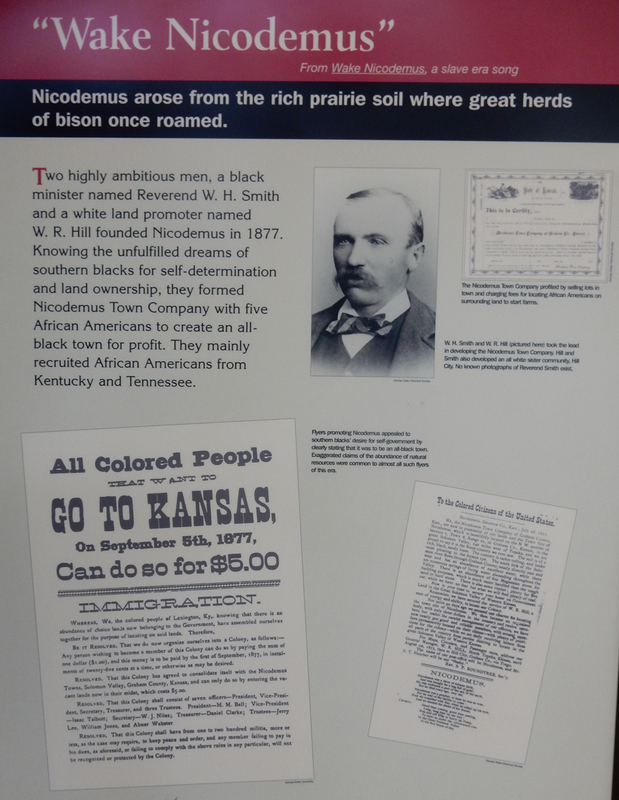 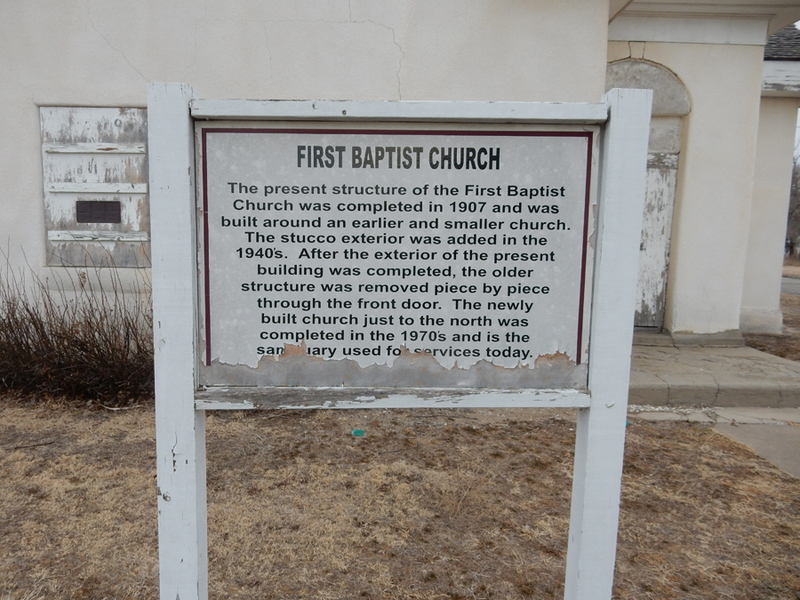 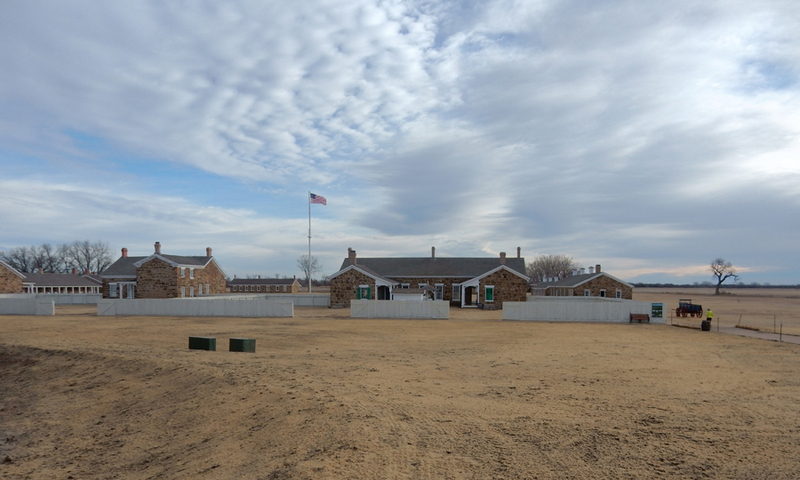 Nicodemus was designated a Historic Site by an Act of Congress in 1996. 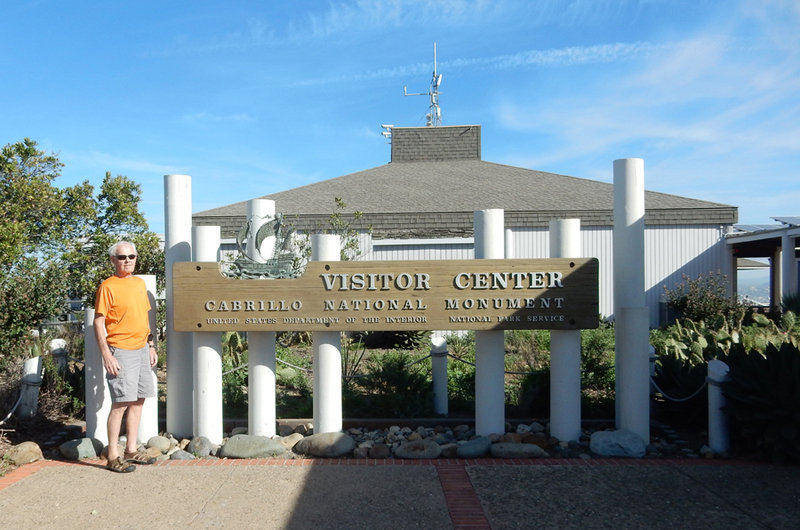 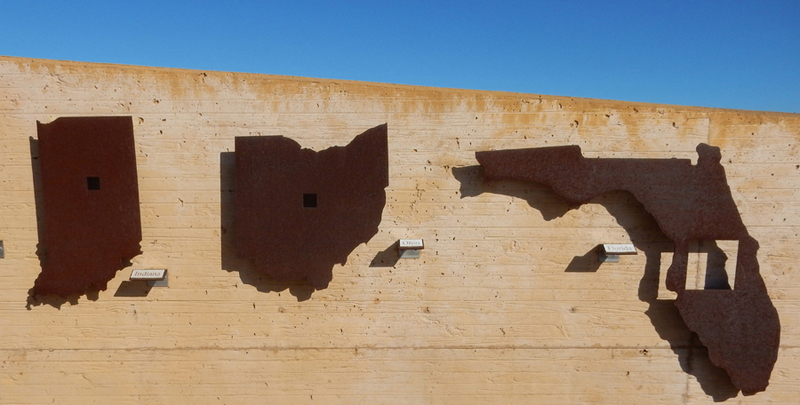 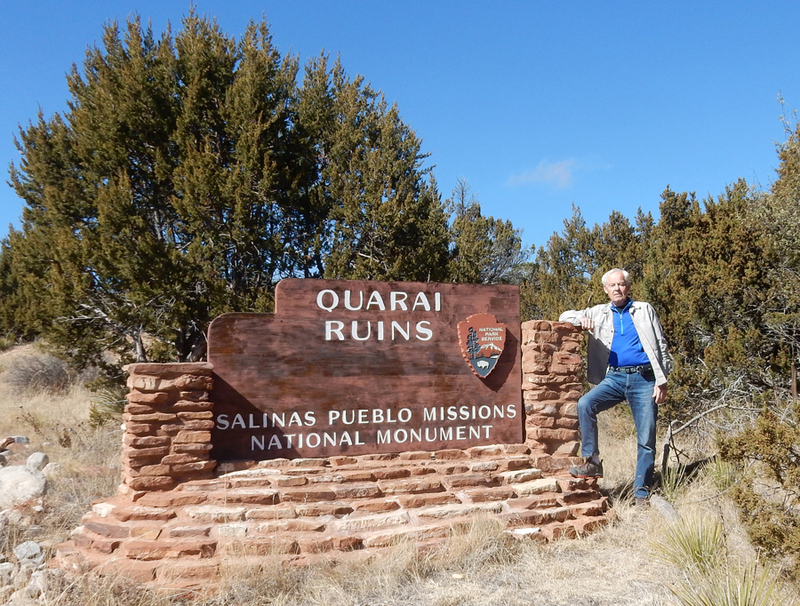 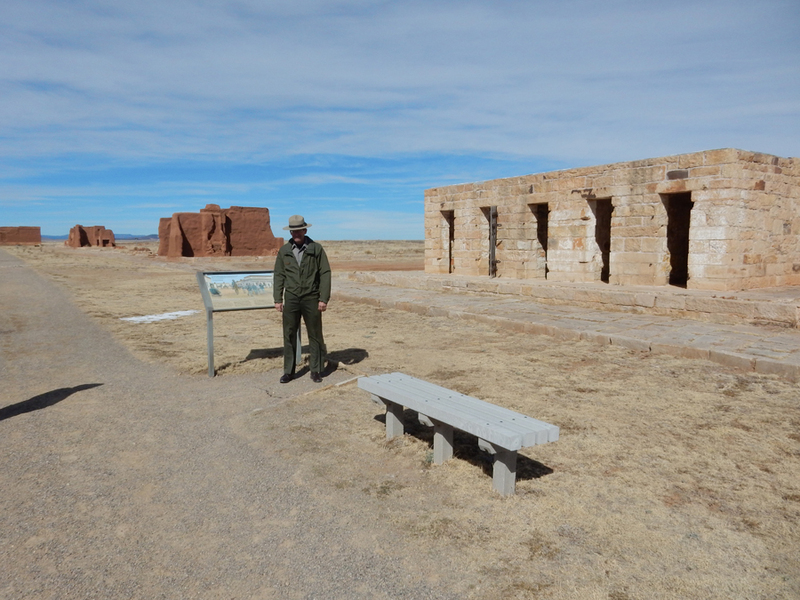 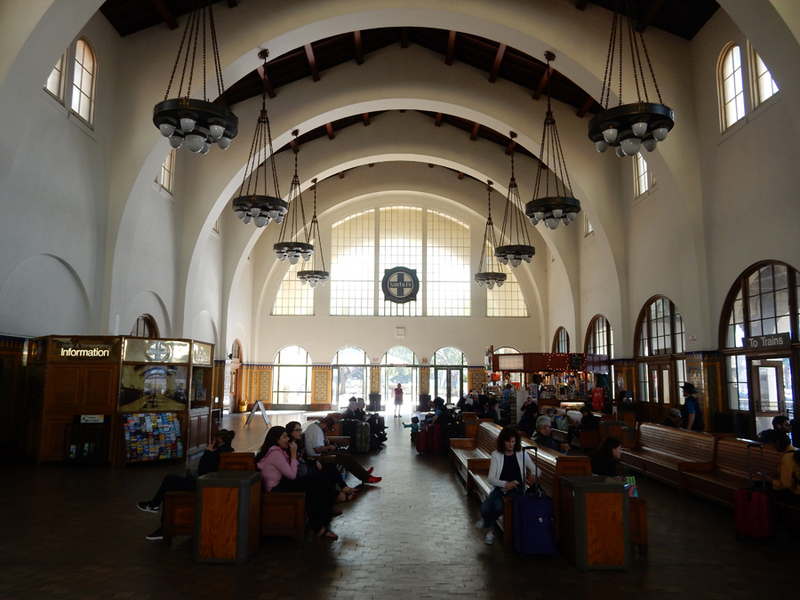 I have been to most Historic Sites in the National Park System. 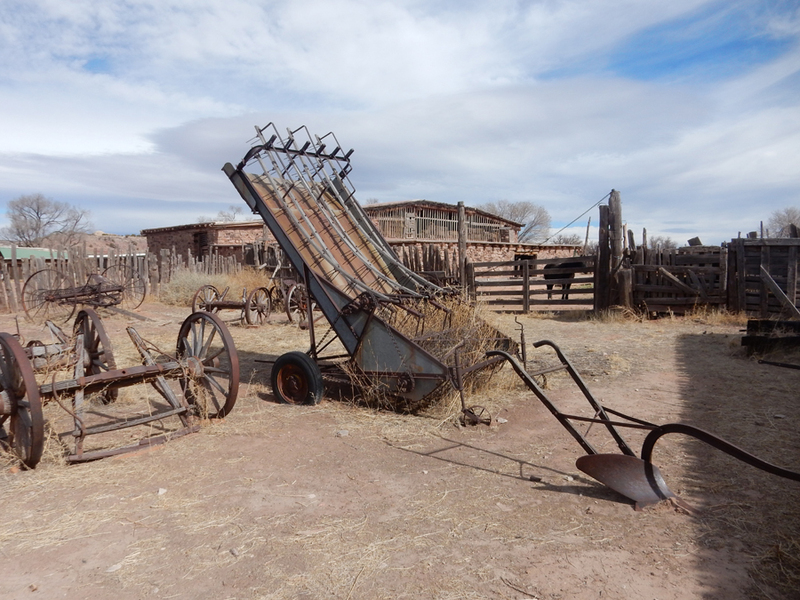 This is perhaps the least supported one I have visited. 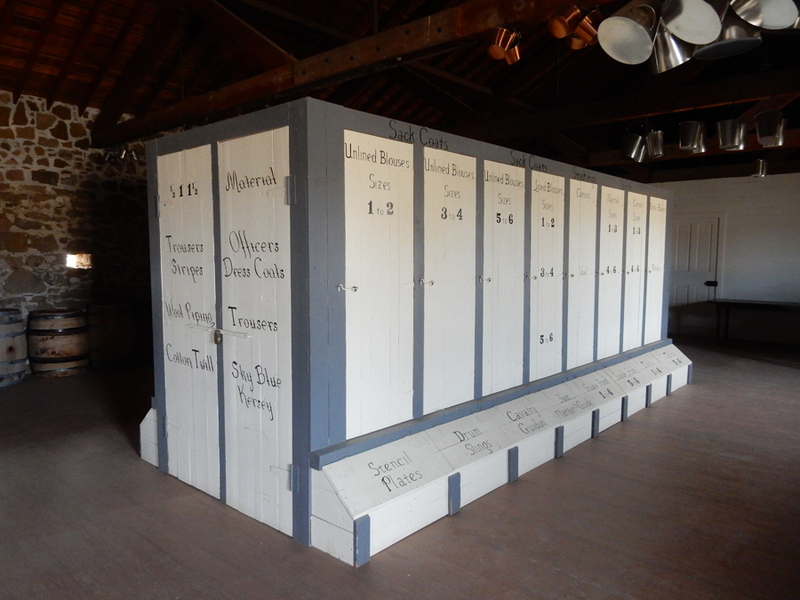 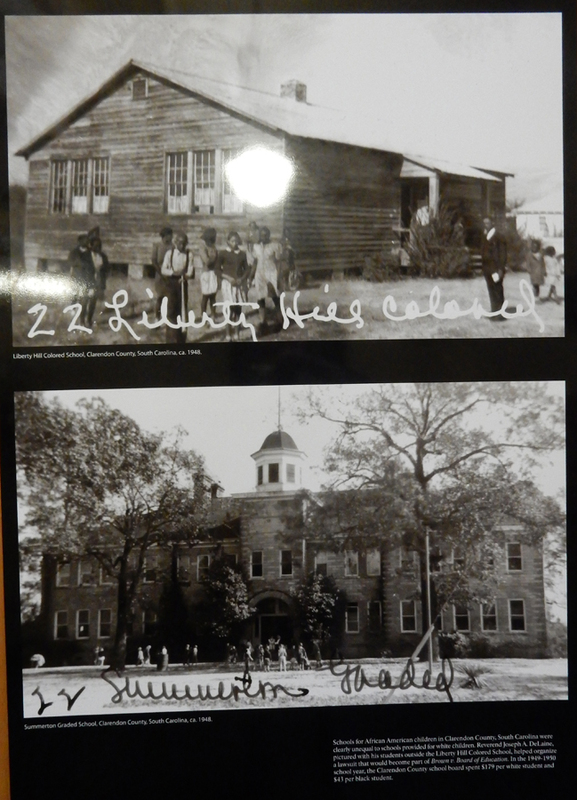 Every summer since 1878 the town has hosted its “Emancipation Celebration,” which is a homecoming for many descendants. 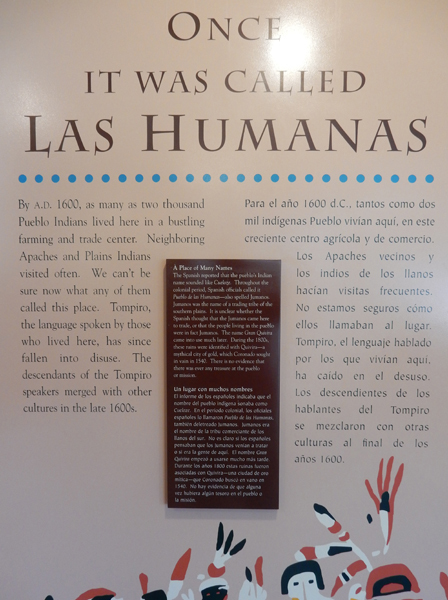 Literature states that hundreds attend this event. 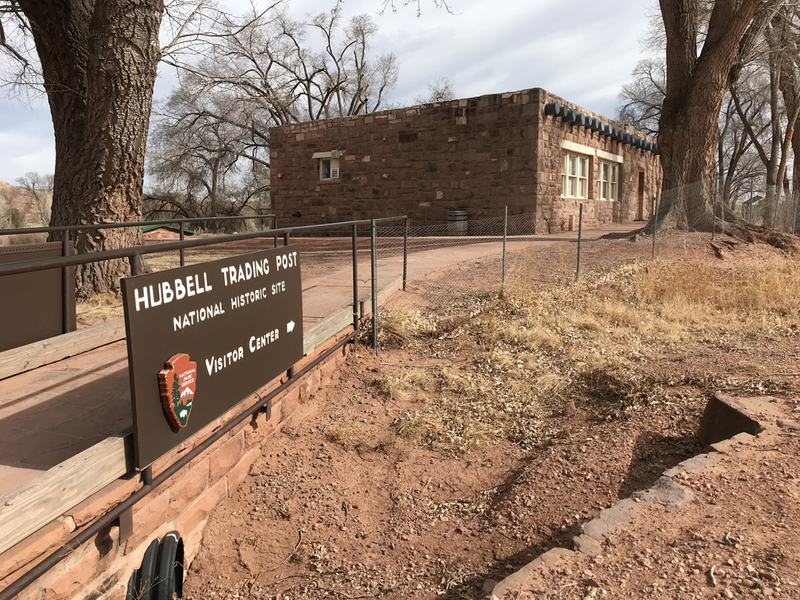 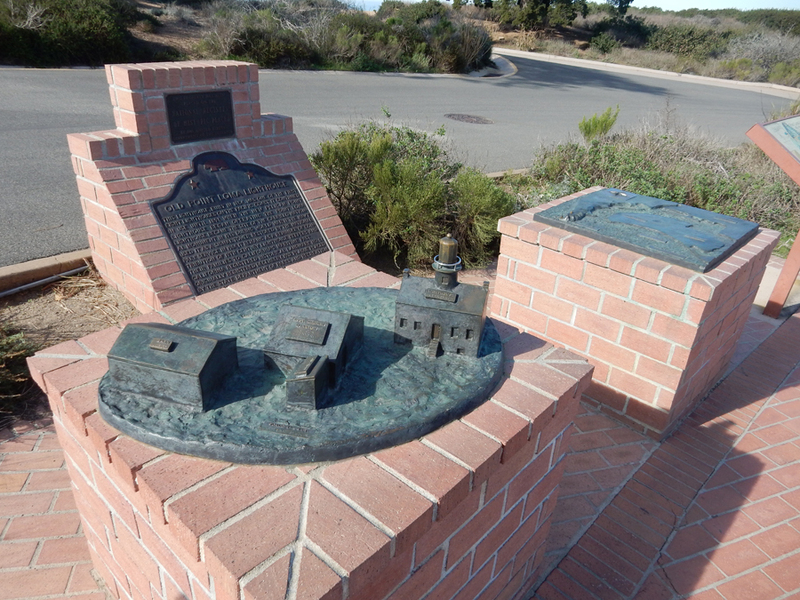 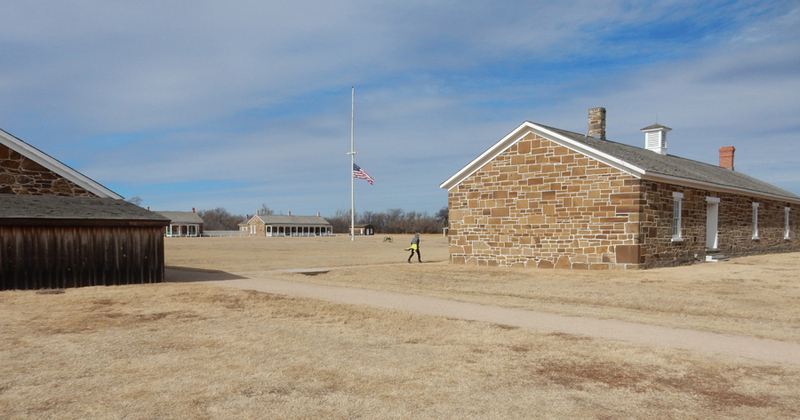 Why hasn’t the National Park System and prominent descendants done more to support this historic site? 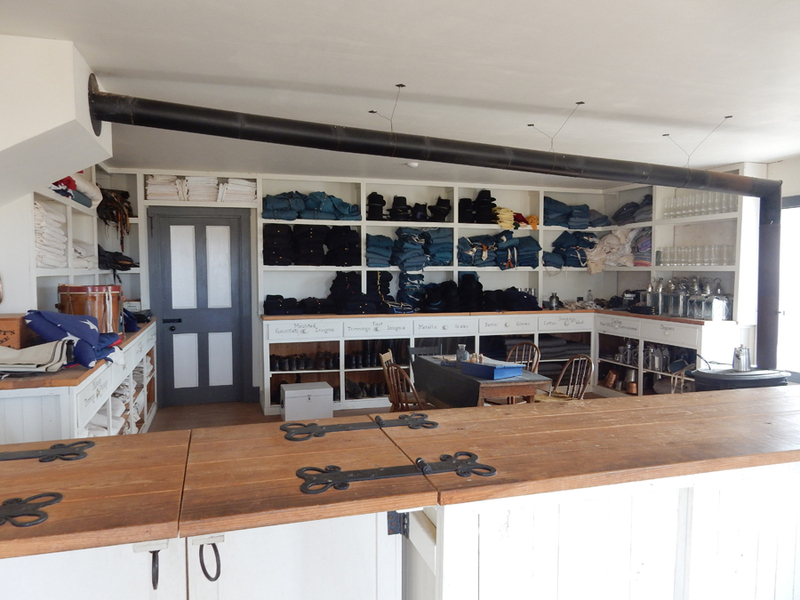 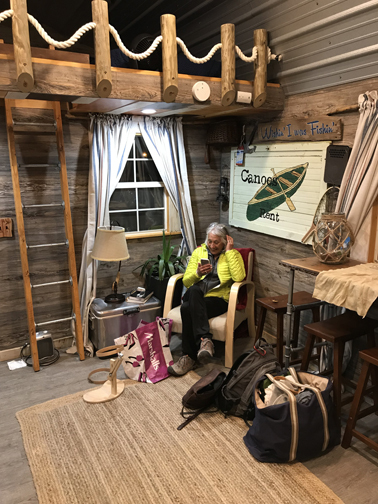 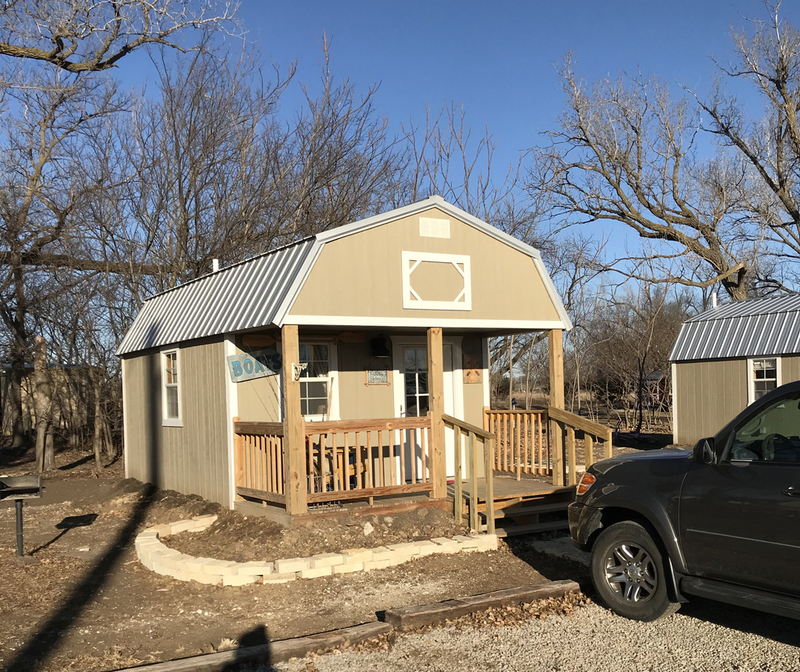 It took an hour to get to our Airbnb converted storage shed in Belleville KS, it was quite nice – though we had to sleep in the loft (up the pipe rungs)! 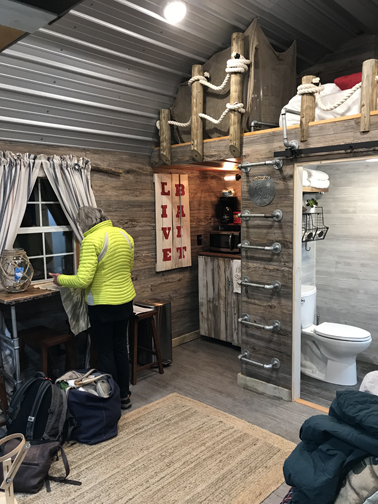 2/16 F – “Shed Accomodation” in the morning. 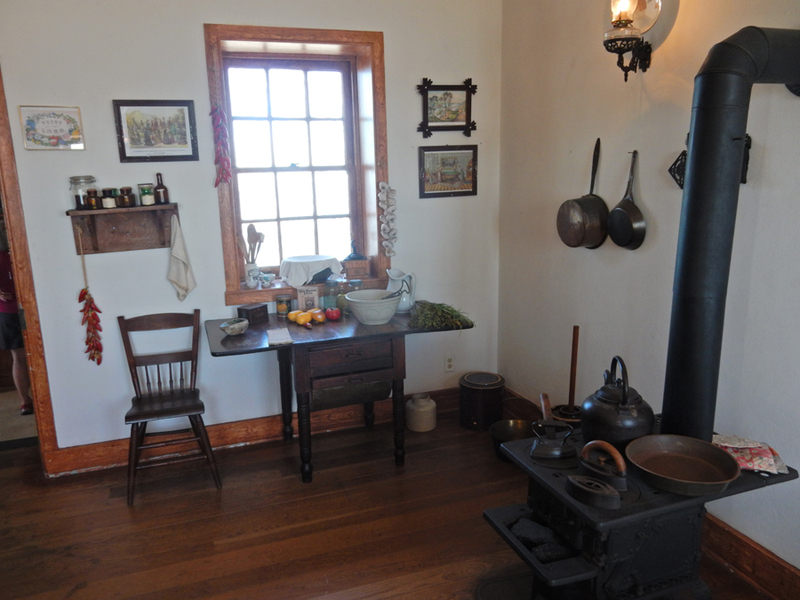 We were brought hot biscuits, butter, and jam for breakfast. 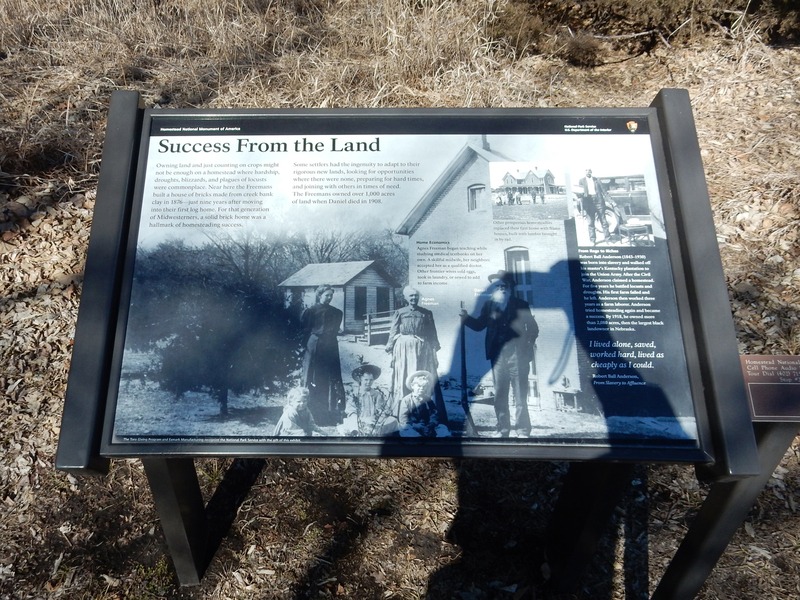 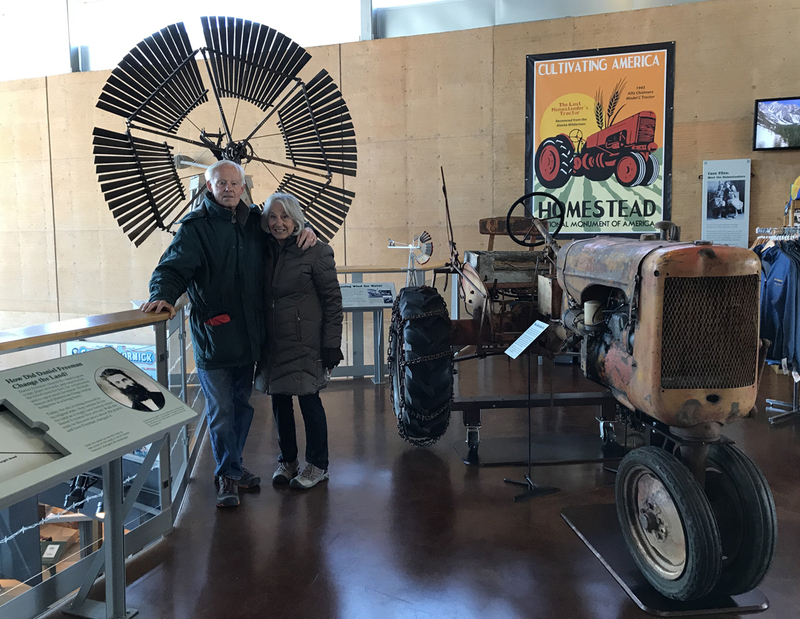 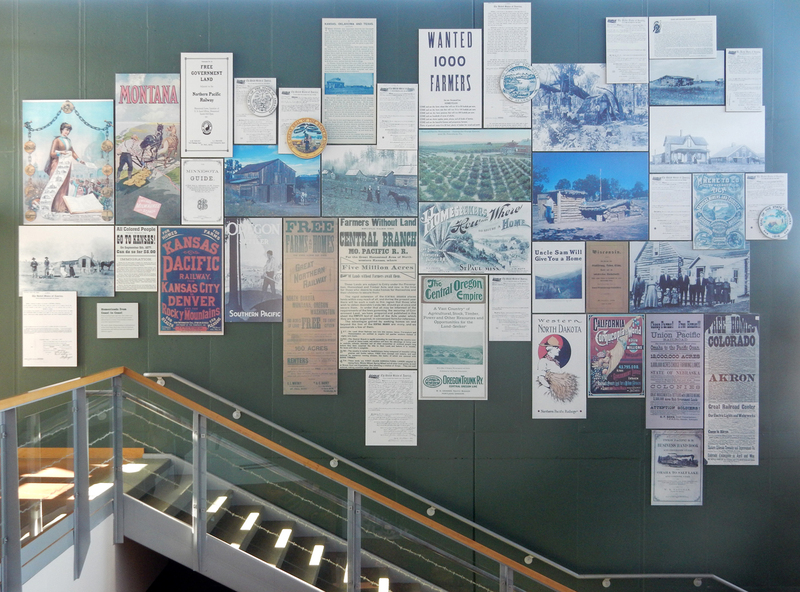 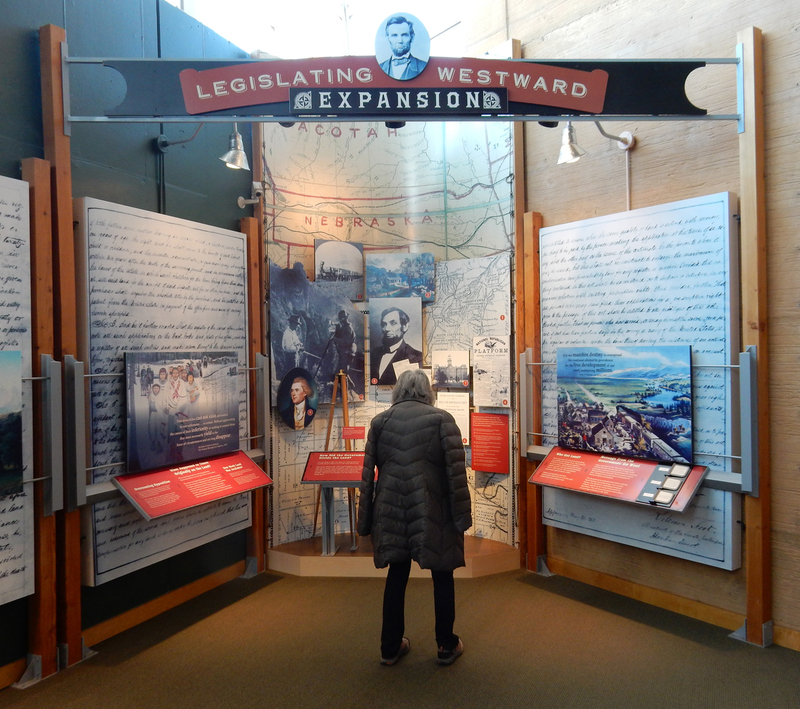 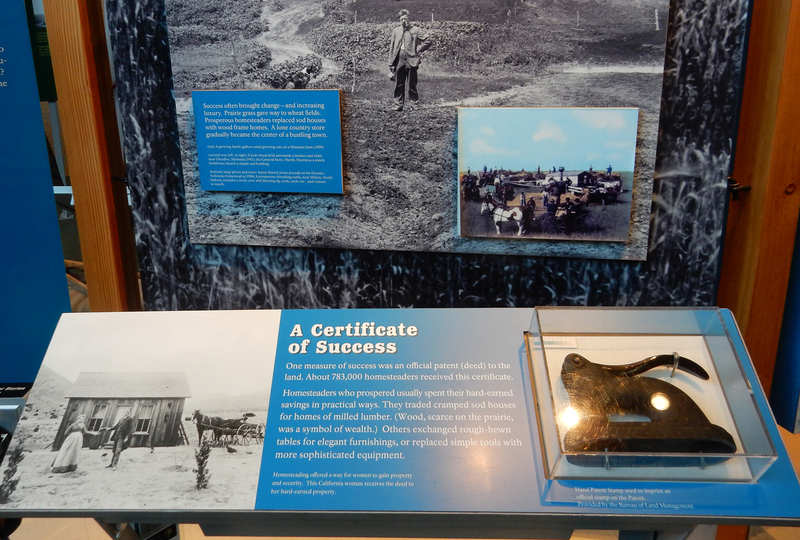 An invitation to the World – “Free Land.” For over a century (1863-1976 lower 48 states, 1960-1986 Alaska) the Homestead Act encouraged Americans and immigrants alike to settle on federal land. 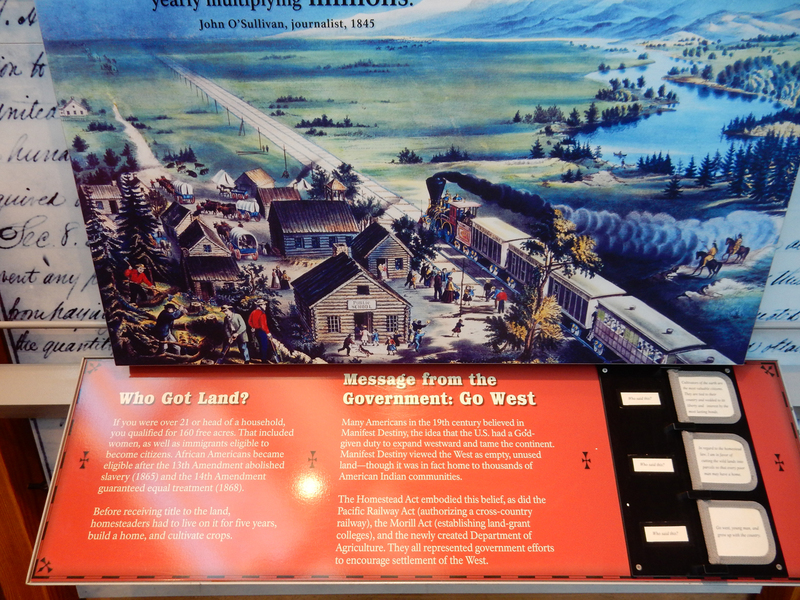 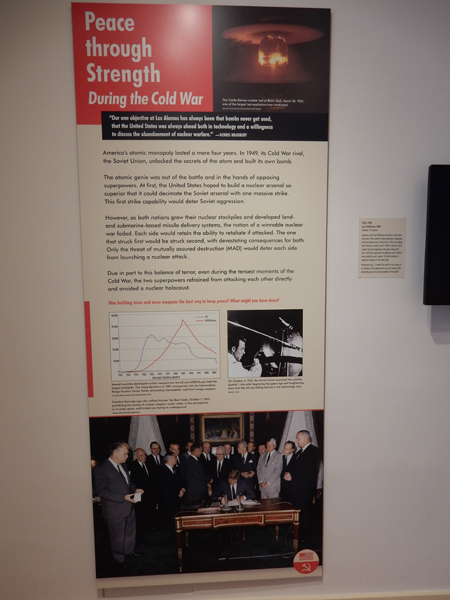 Notice the metal outlines of homesteading states on the wall. 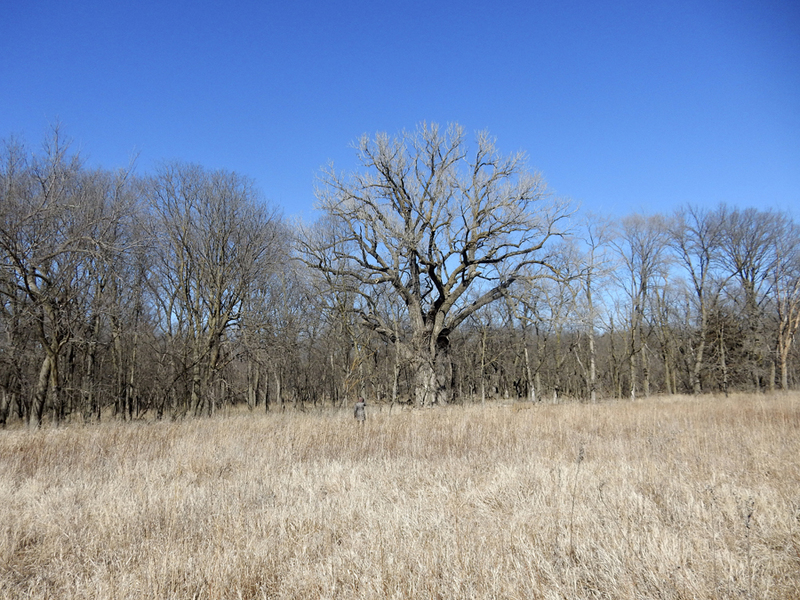 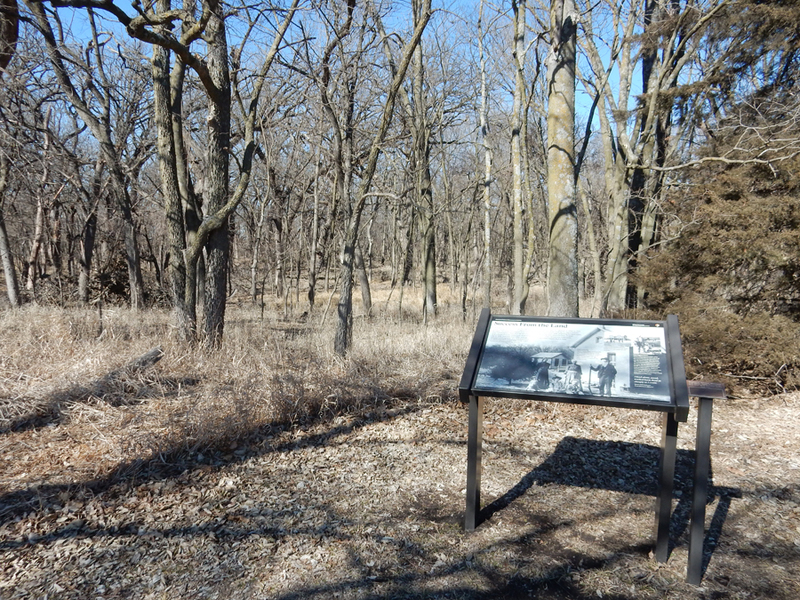 Daniel Freeman filed the first homestead claim for this land on January 1, 1863. 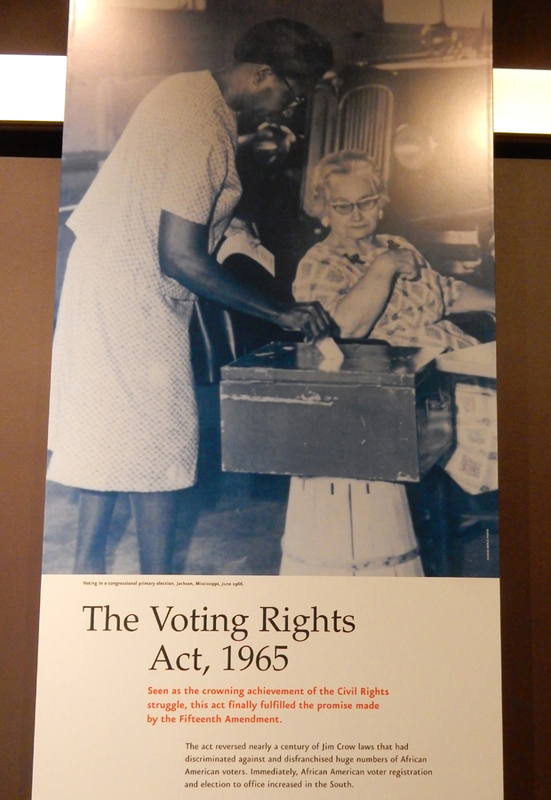 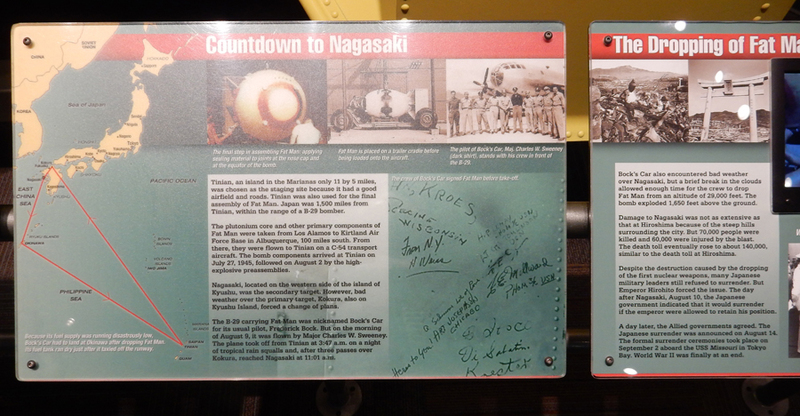 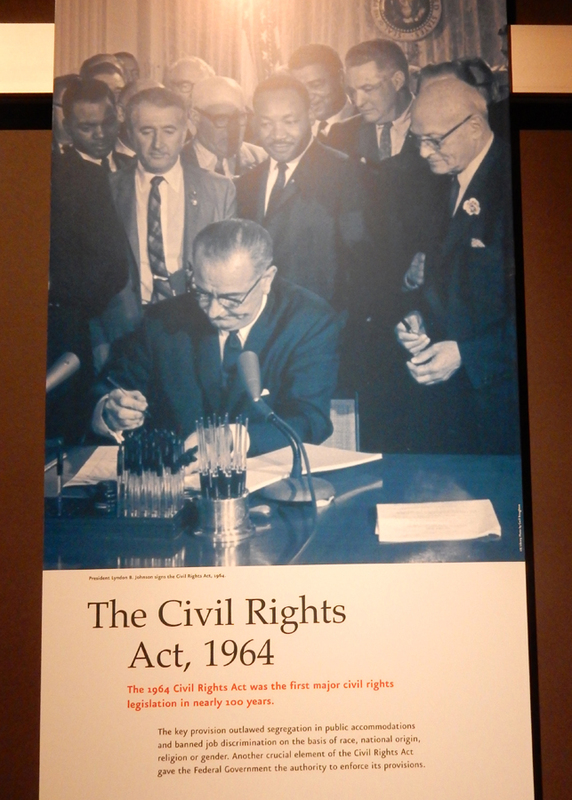 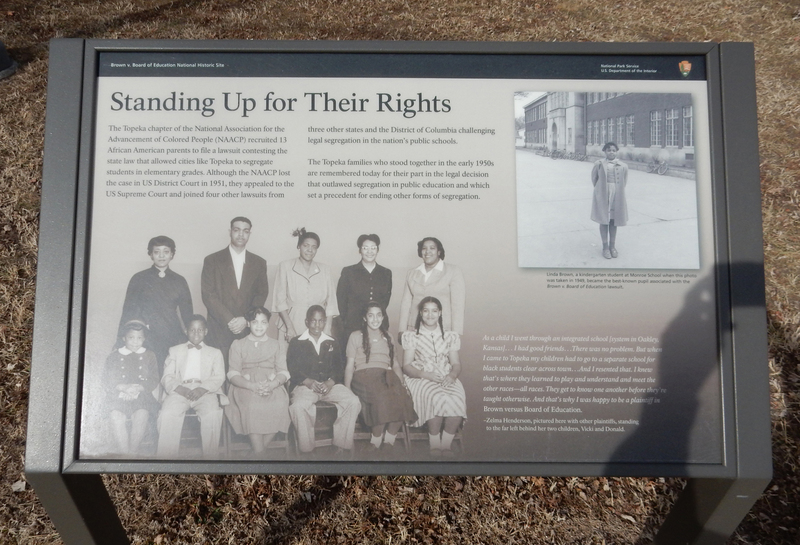 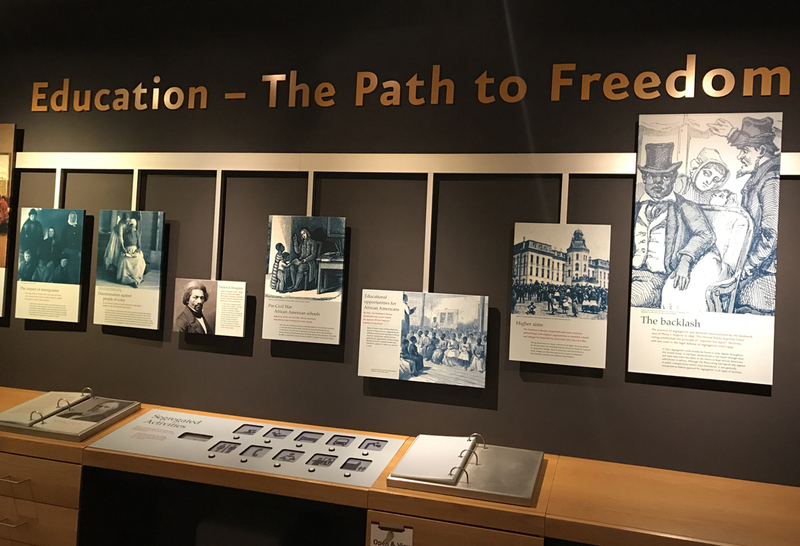 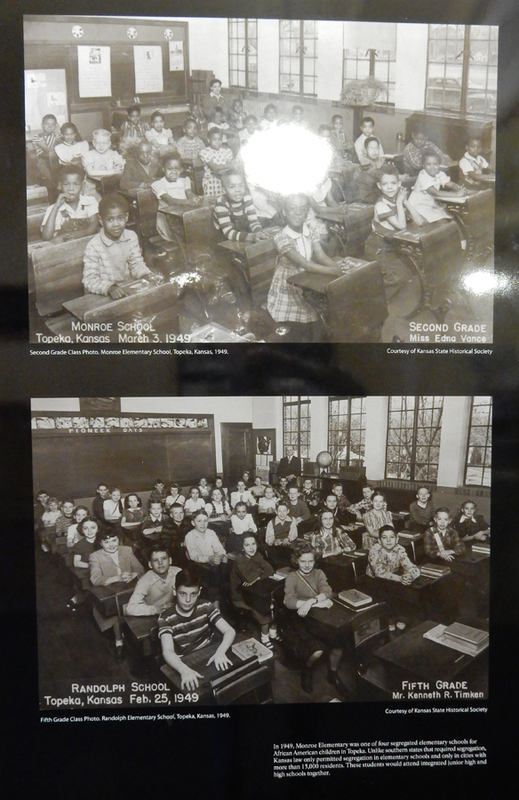 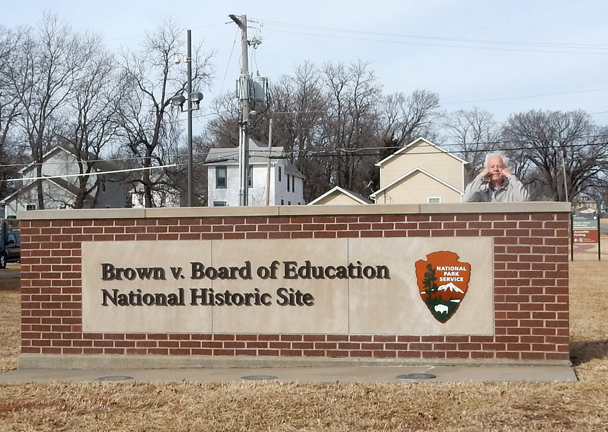 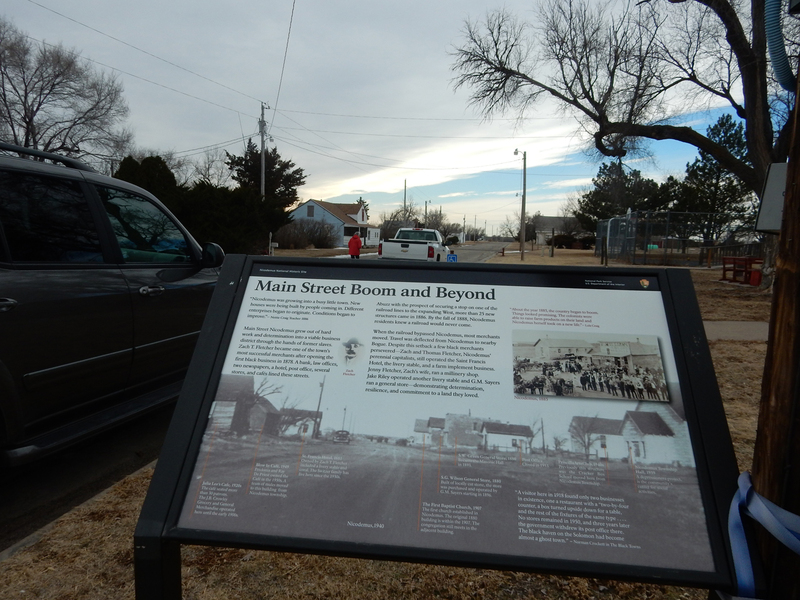 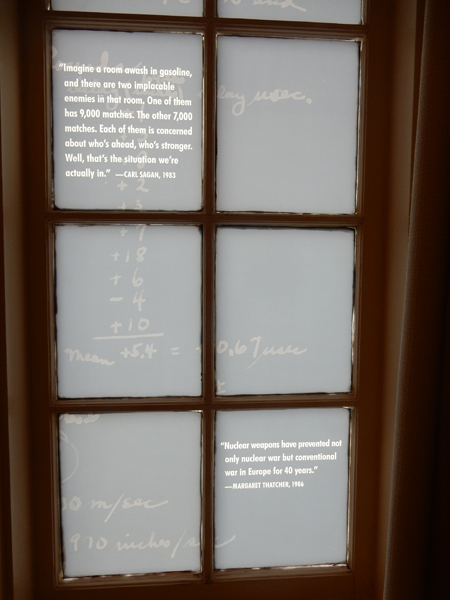 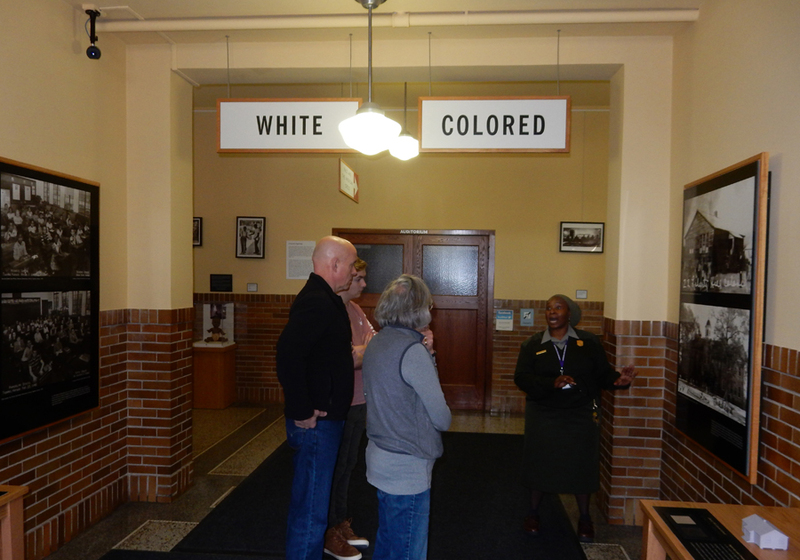 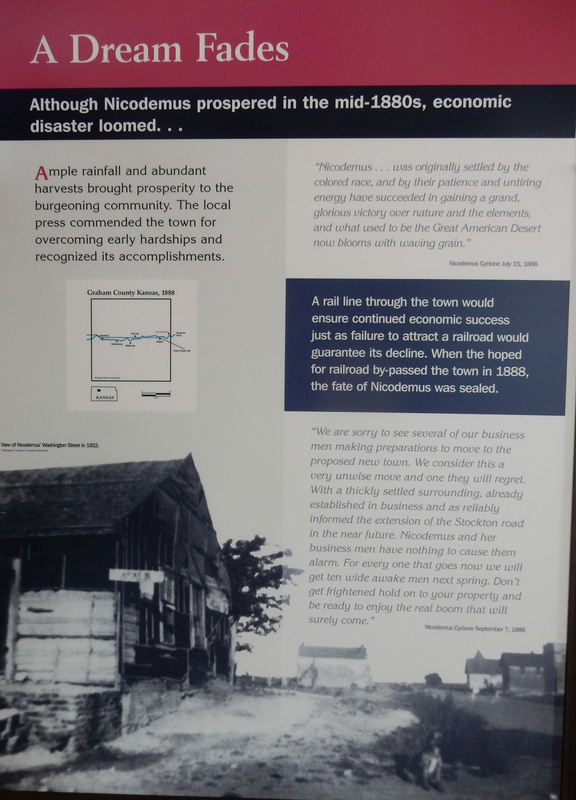 2/18 Su – A 1hr drive got us to the Visitor Center for the Brown V. Board of Education National Historic Site. 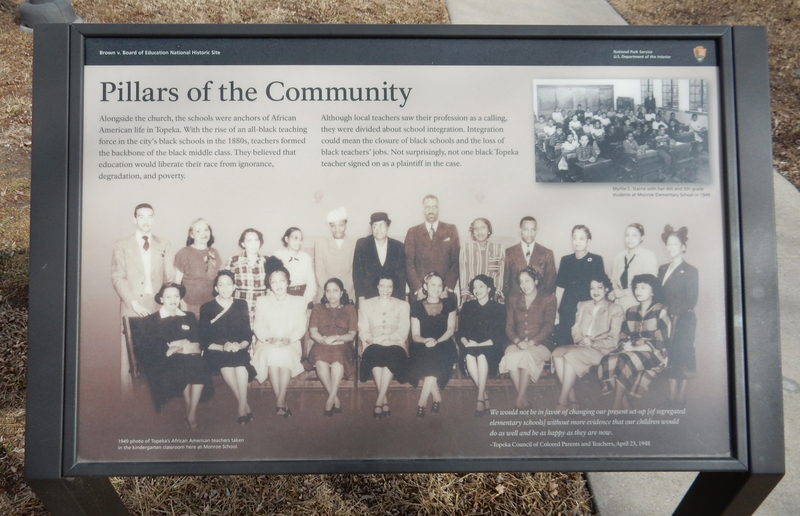 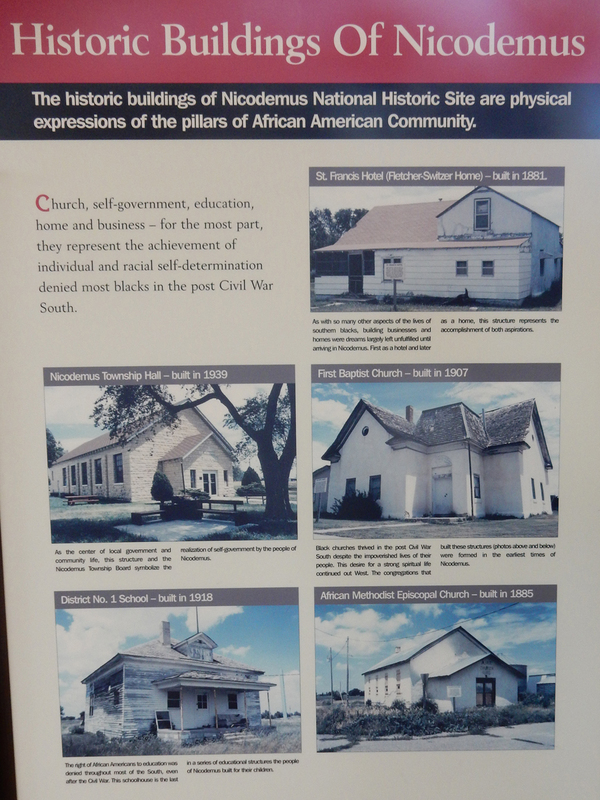 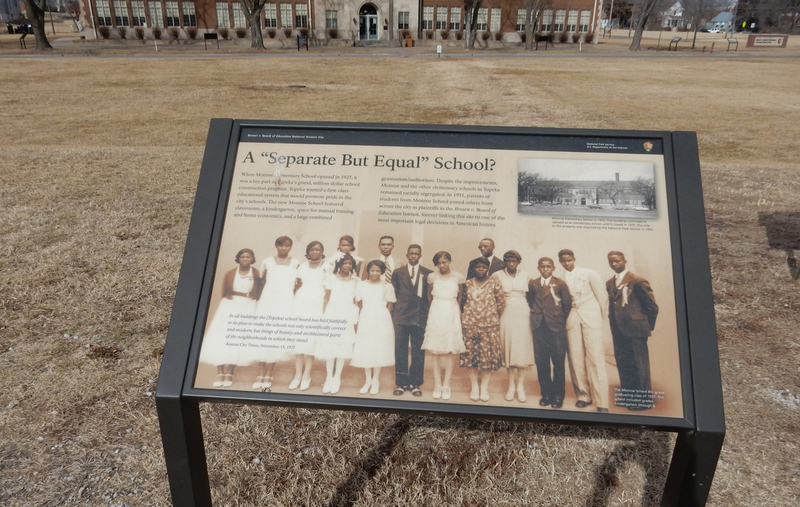 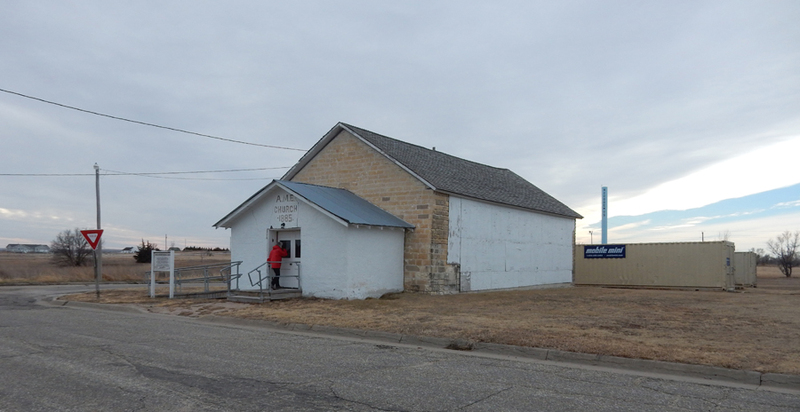 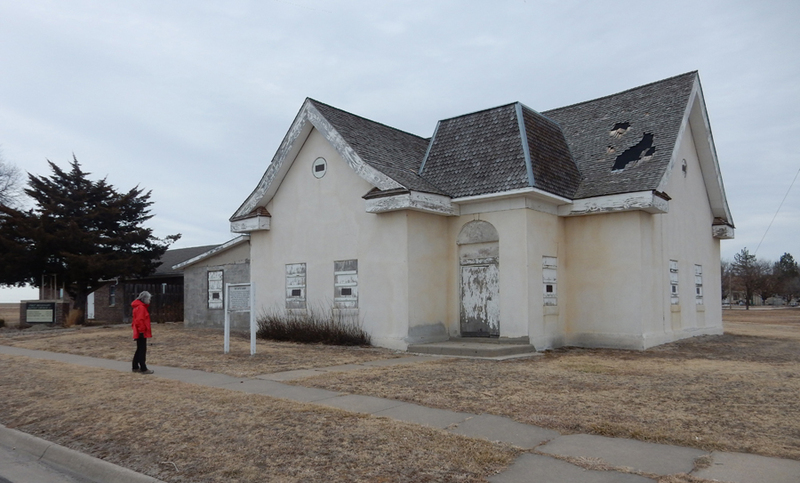 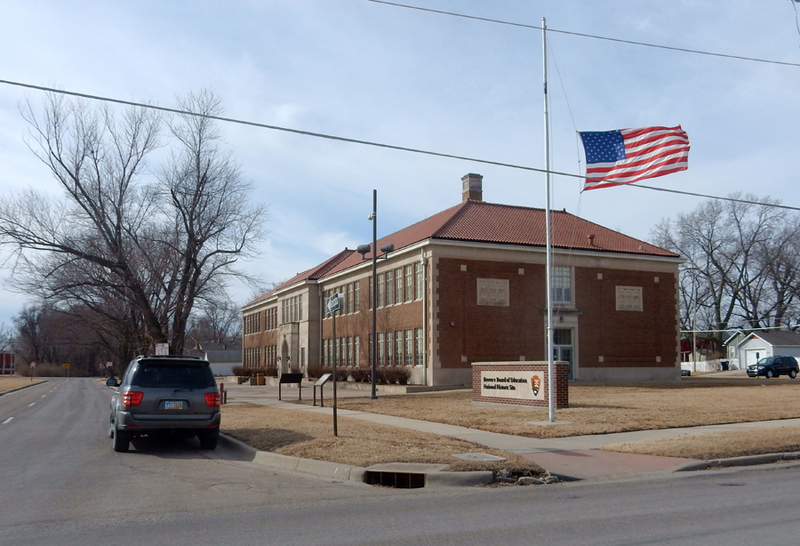 It is located in the former Monroe Elementary School, which was one of four segregated elementary schools in Topeka KS in 1954. 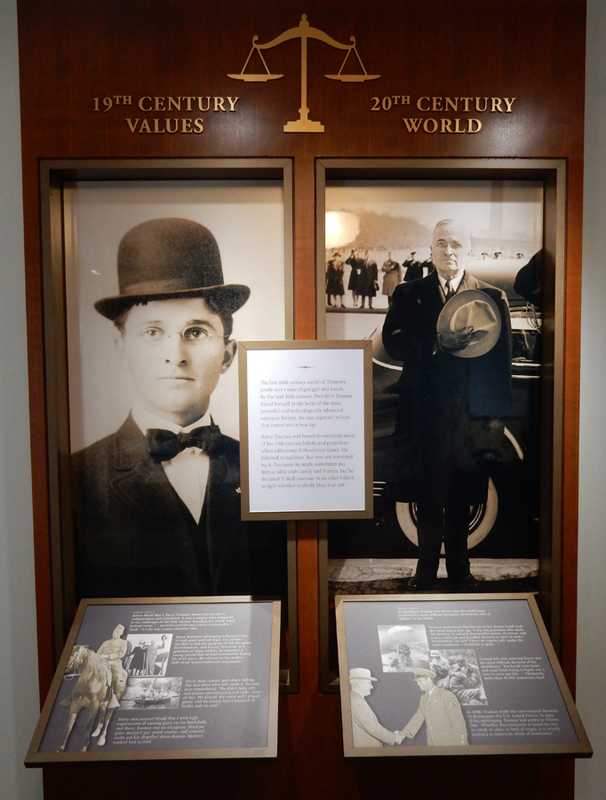 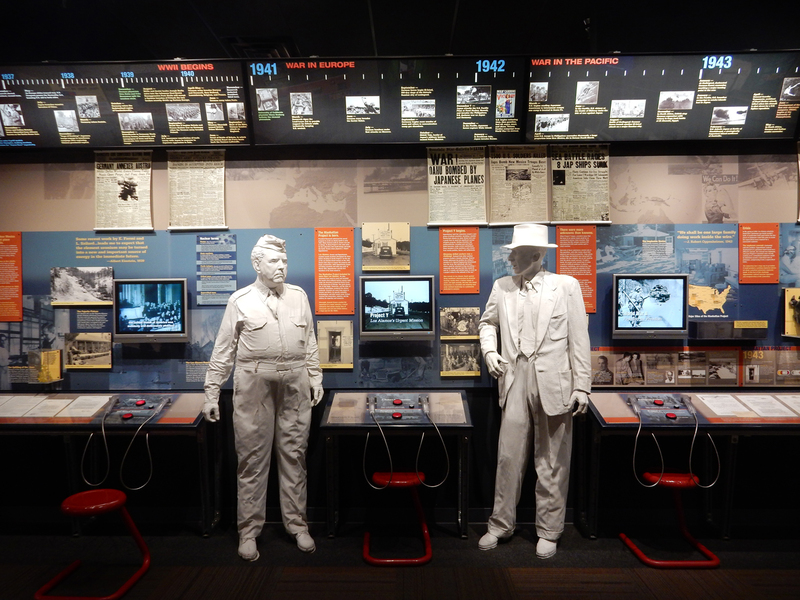 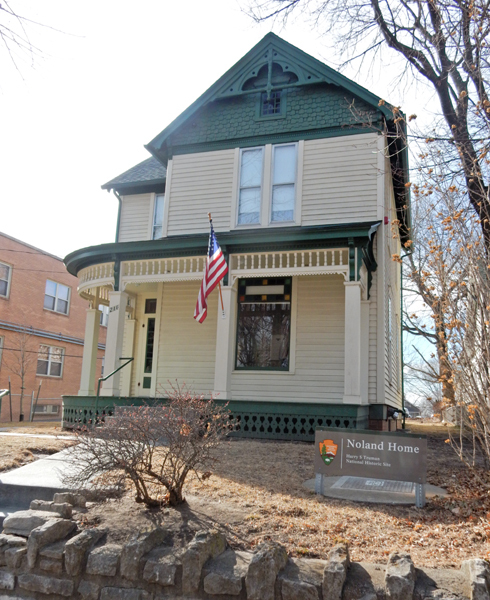 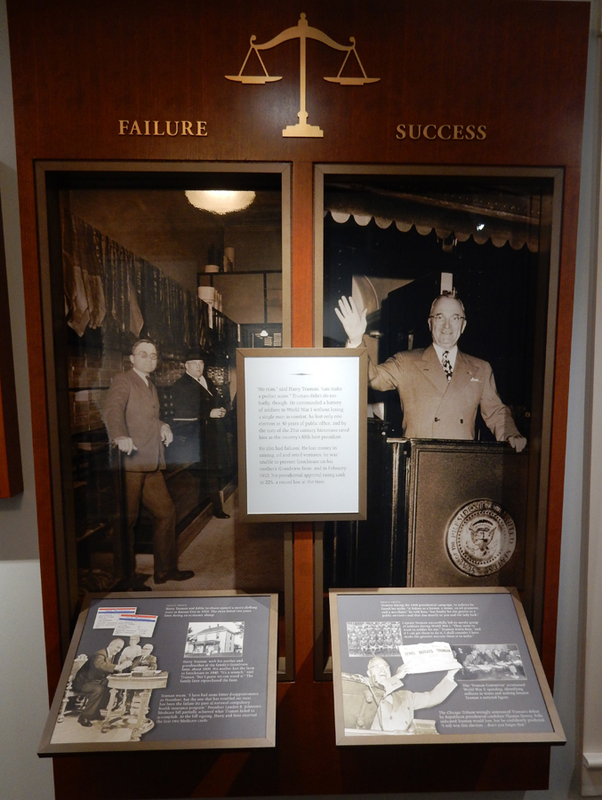 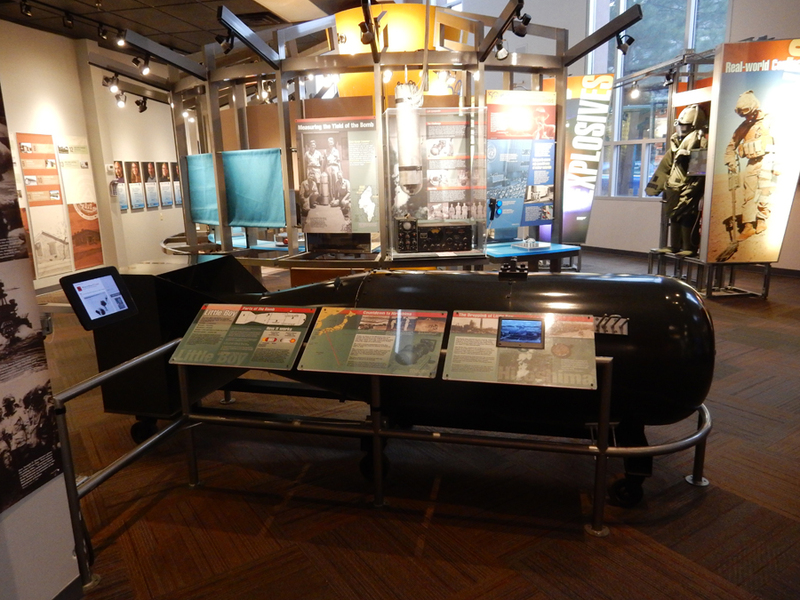 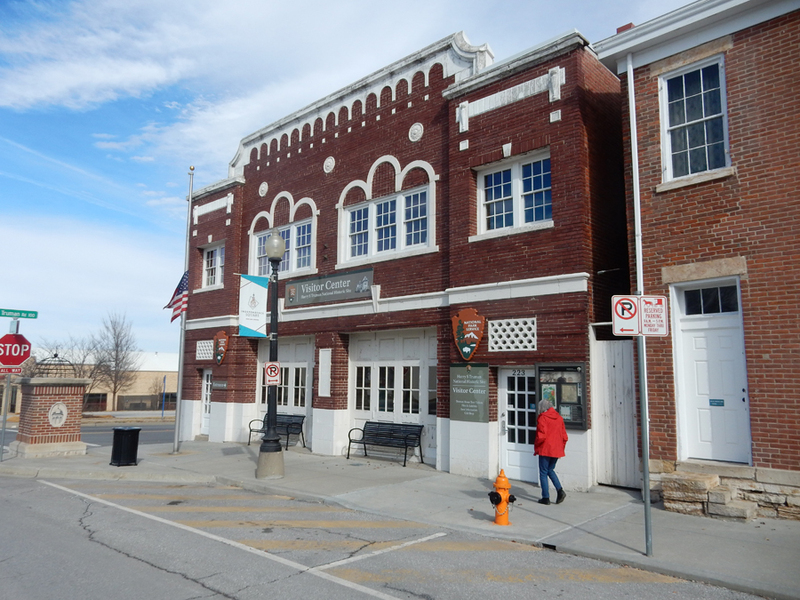 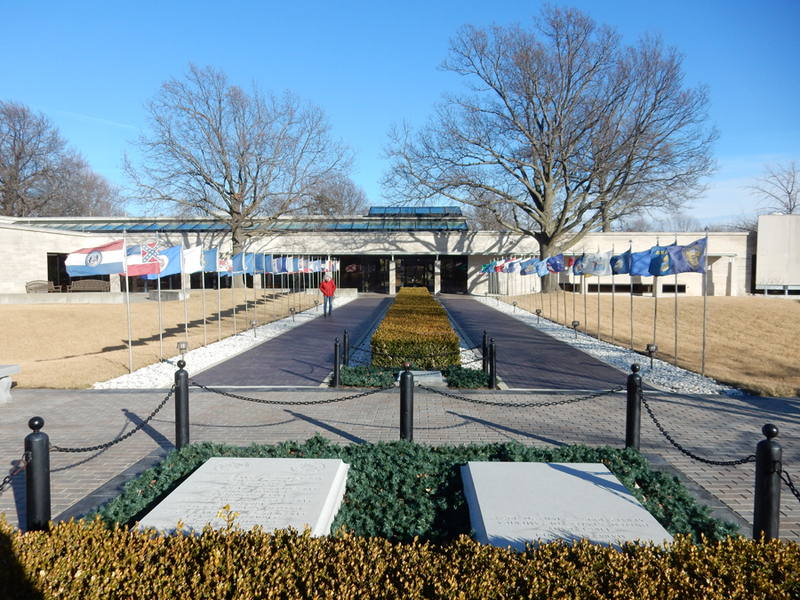 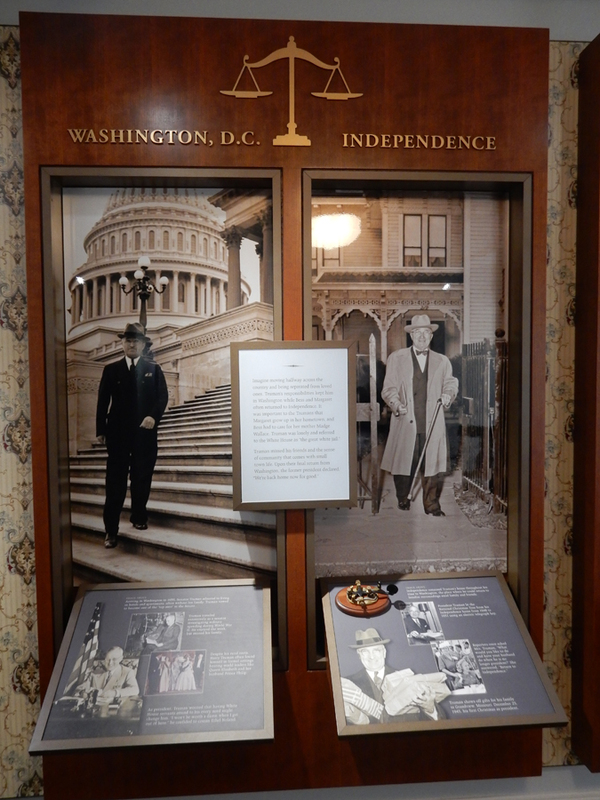 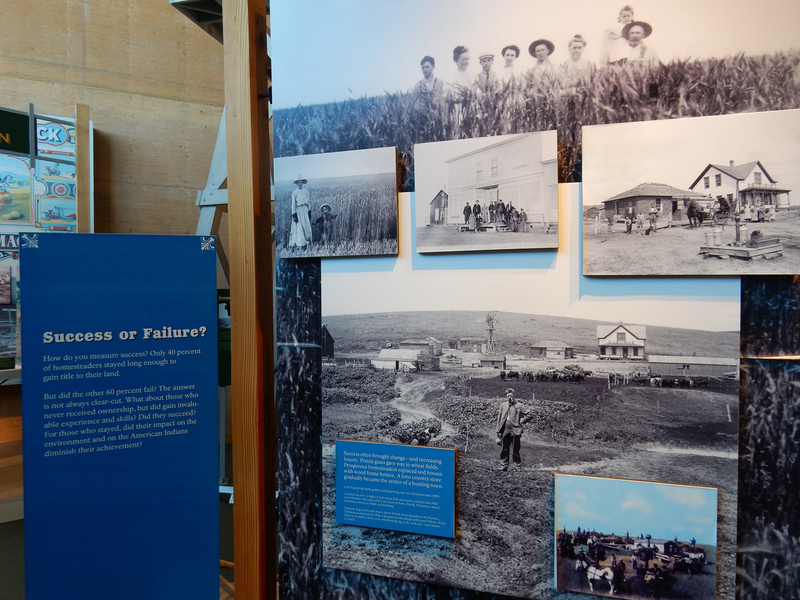 One more National Park Unit before we get home – Harry S. Truman National Historic Site in Independence MO! 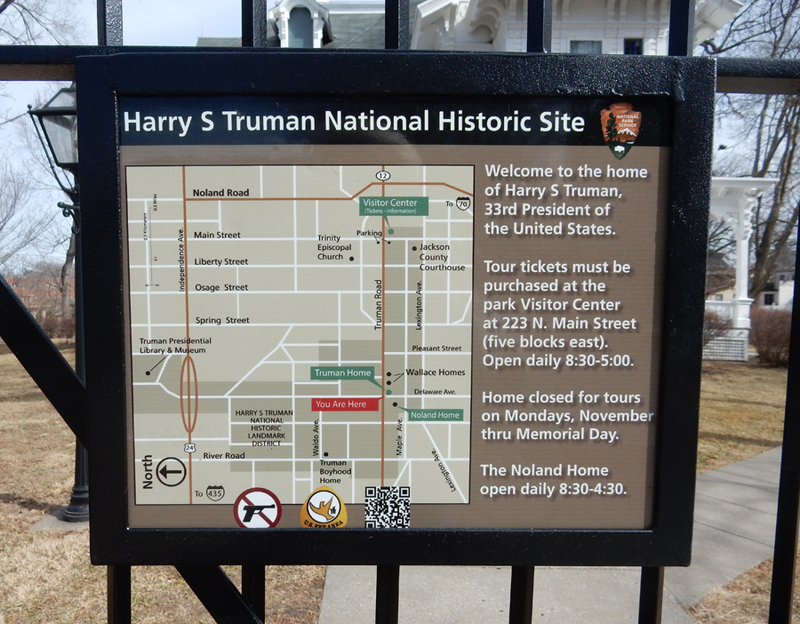 We first stopped at Truman’s Home and then went to the Visitor Center to purchase tour tickets. 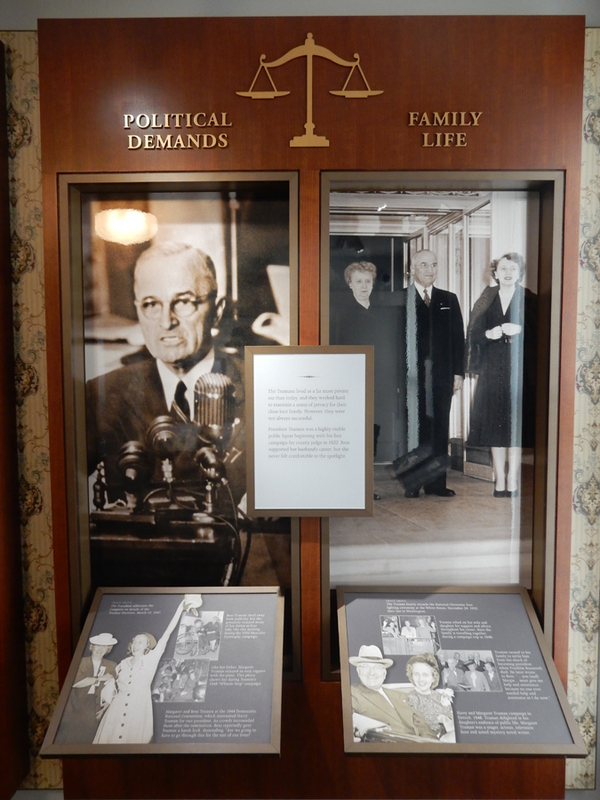 Vice-President Truman became President on the death of FDR in 1945. 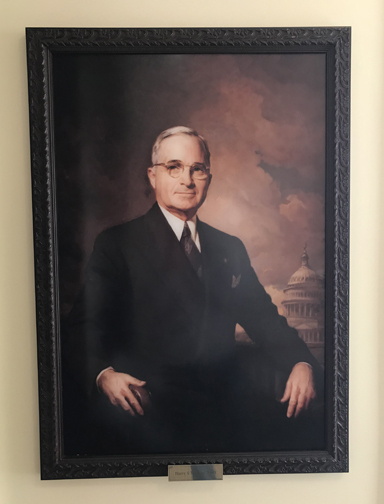 He finished that term and then was elected in his own right leaving office in 1953. 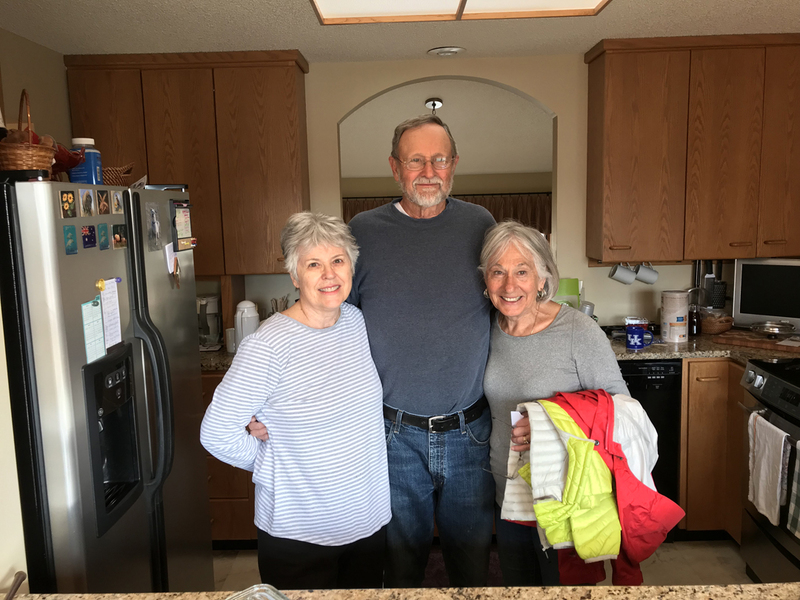 Start of home tour. 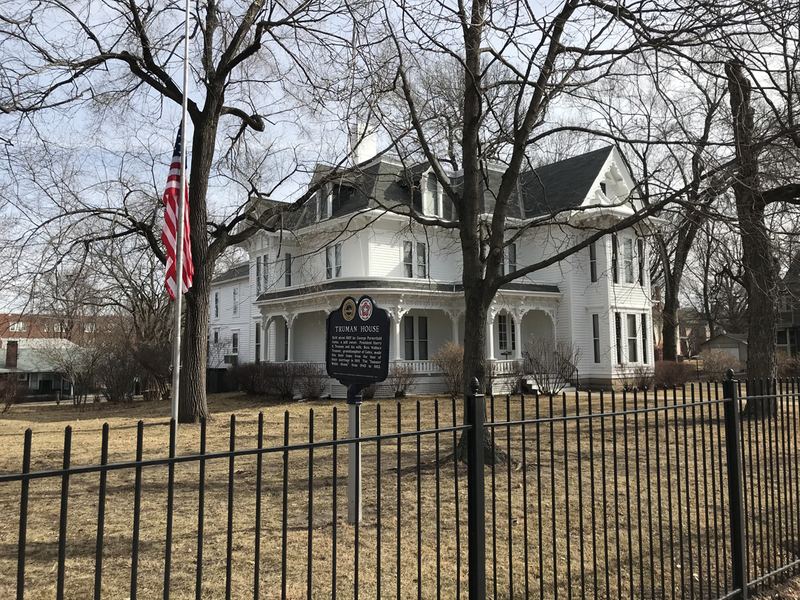 Bess Truman’s father, David Willock Wallace, committed suicide in 1903, she and her mother and brothers moved into the house with Bess’s grandparents, George and Elizabeth Gates. 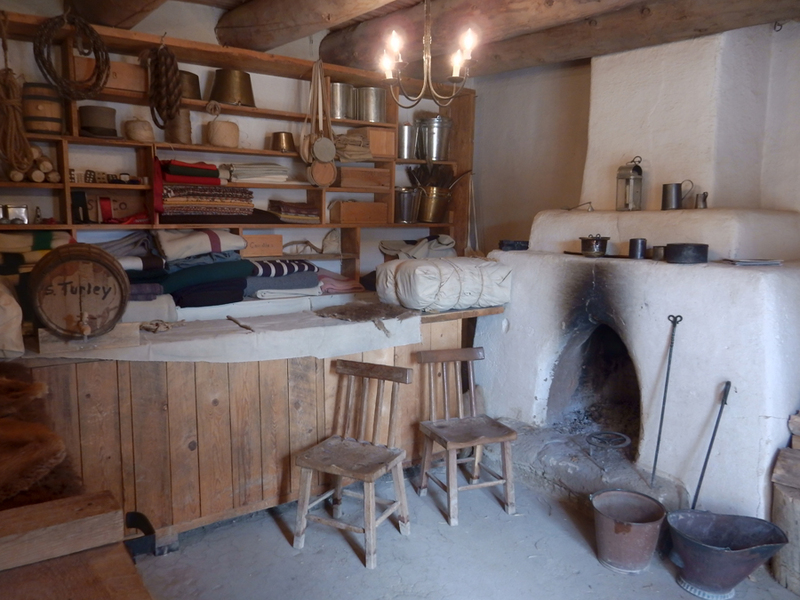 The home then became the Wallace Home where Bess lived with her mother and three brothers. 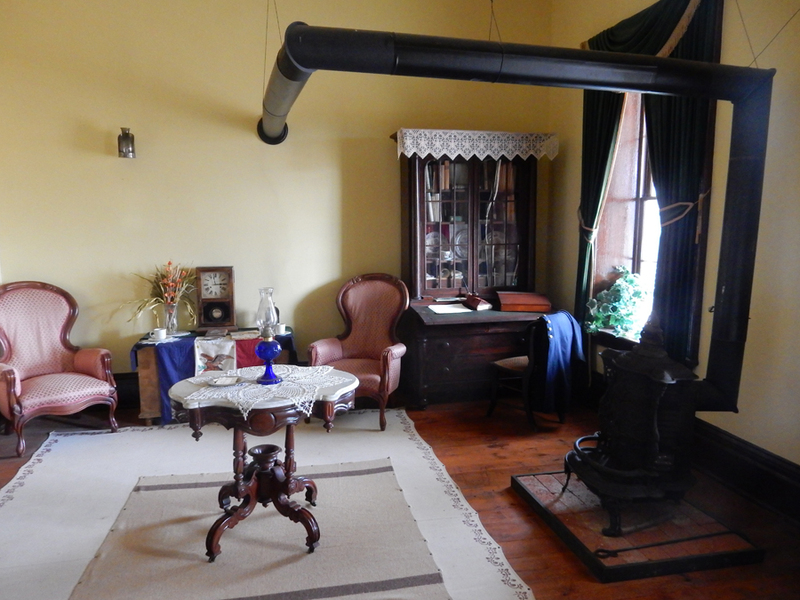 Harry moved in after he married Bess in 1919. 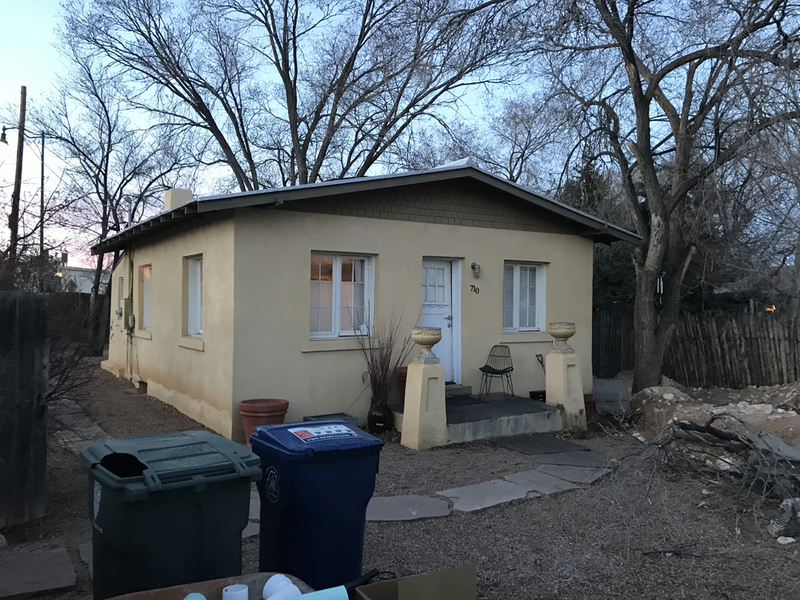 They live here for over 50 years. 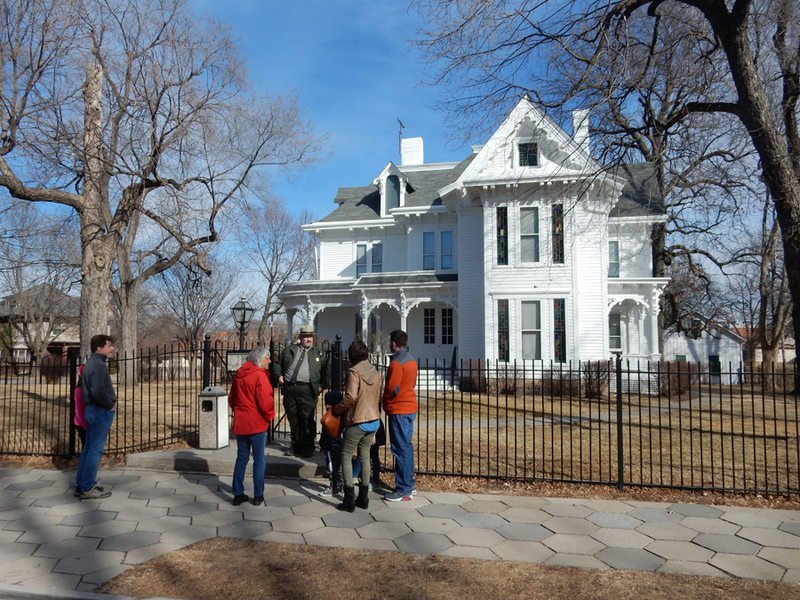 Harry often visited his relatives the Nolands who lived across the street from the Wallaces. 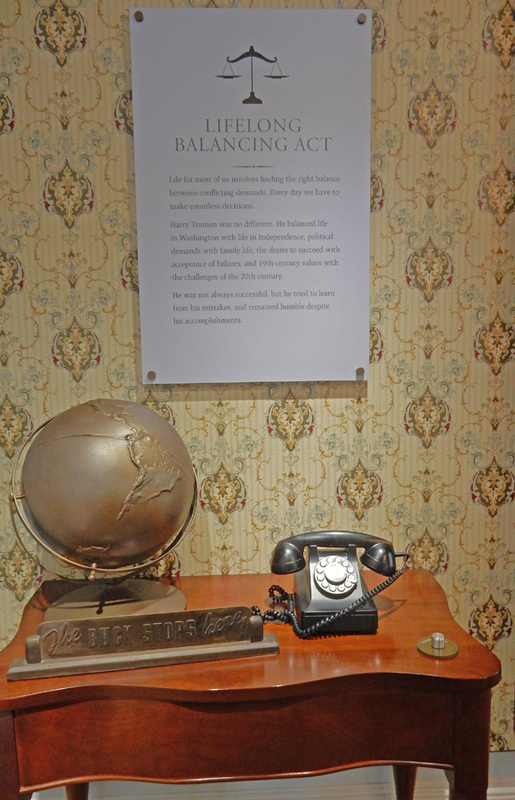 Harry met Bess when he returned a cake plate to the Wallace home in 1910. 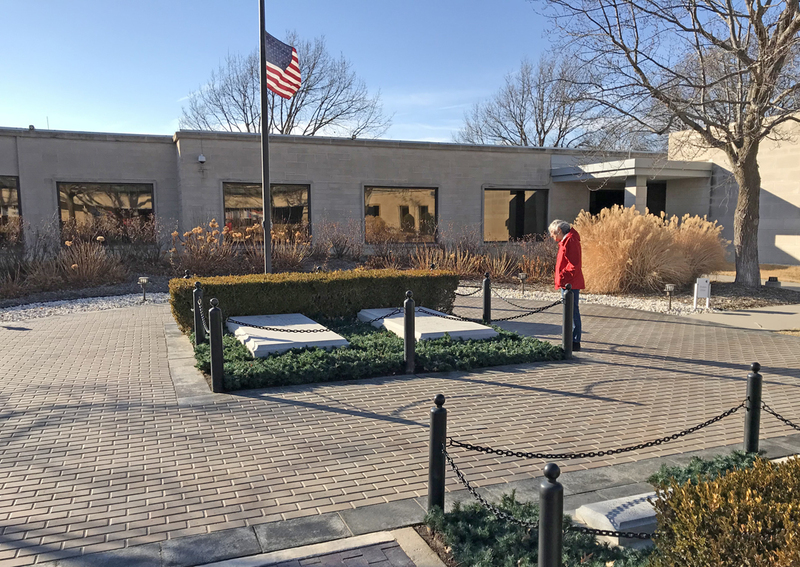 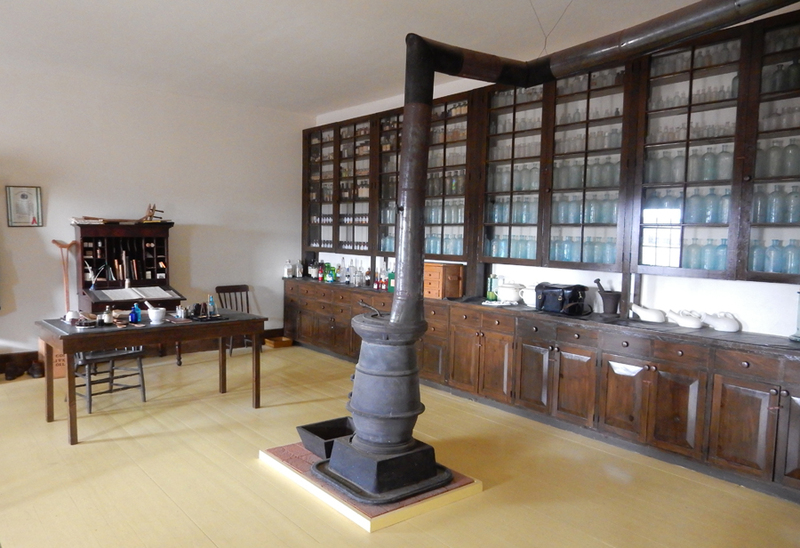 2/19 M – “President’s Day,” fitting since we had just visited a President’s Home and Library! 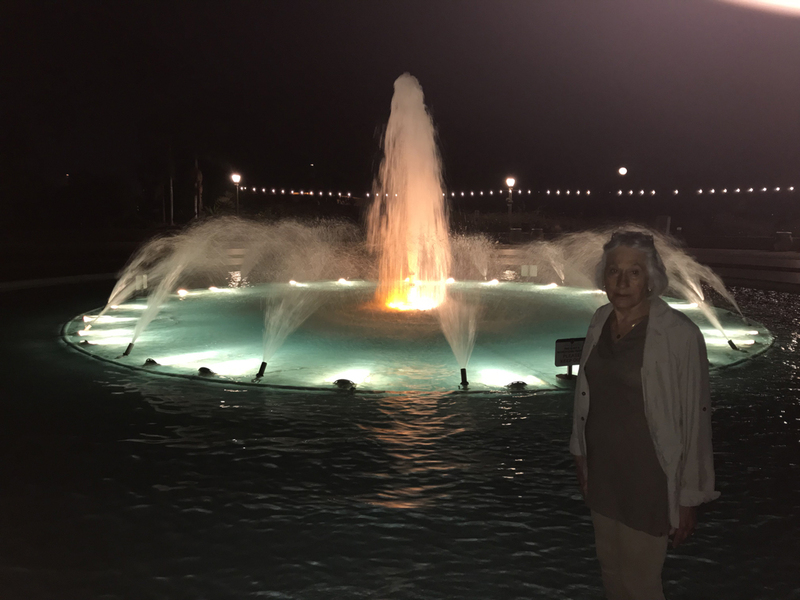 It was a 7.5hr drive to get home from Jefferson City but we were able to get there before dark. 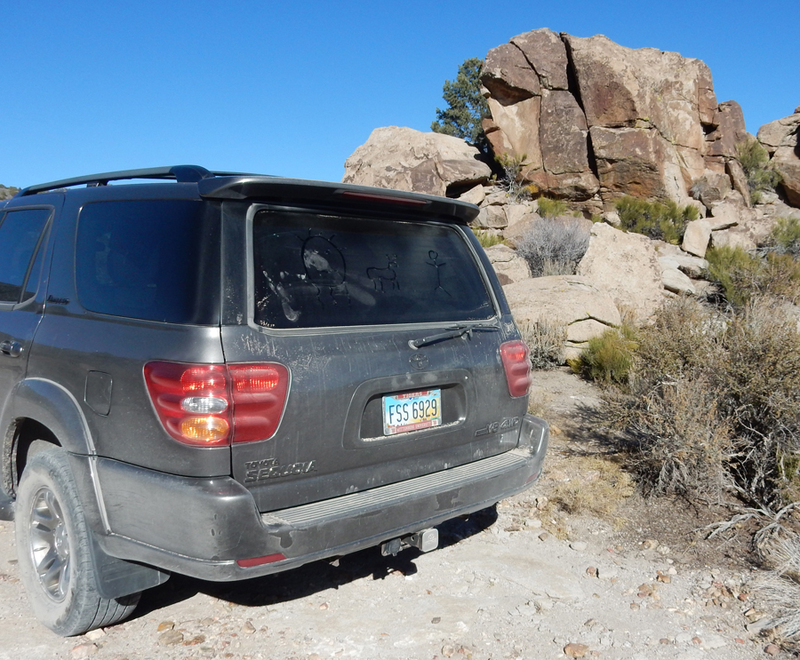 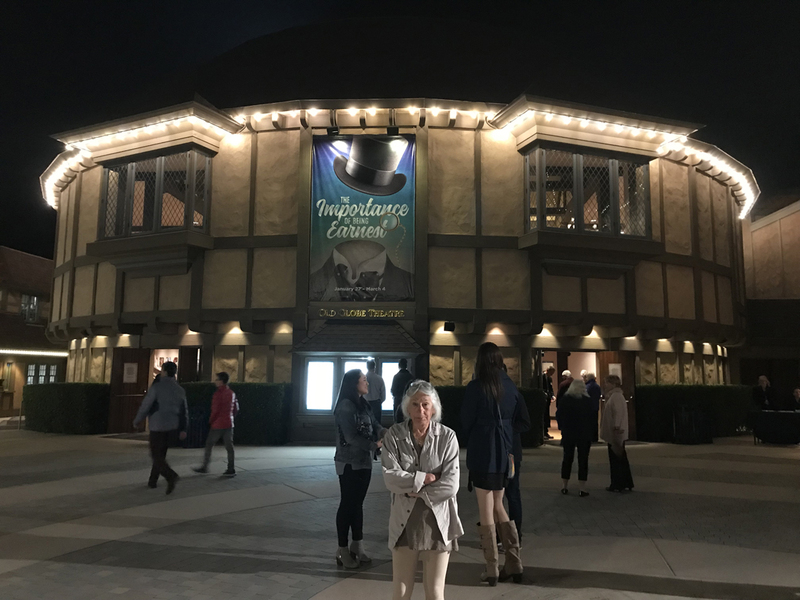 It was an enjoyable and successful five-week 8,500 mile road trip! 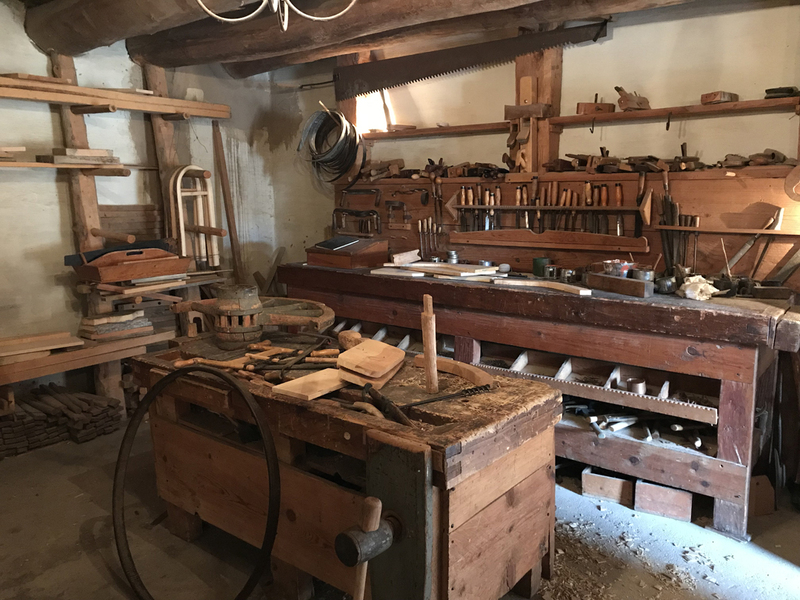 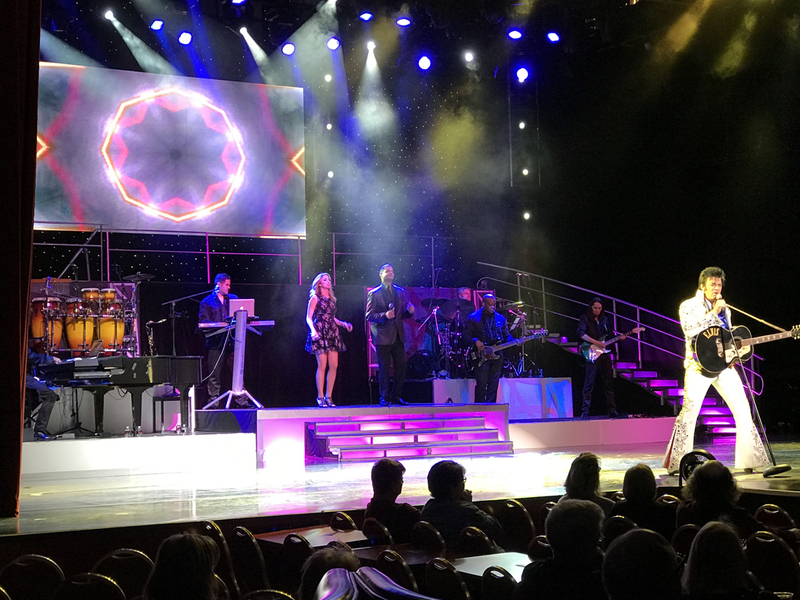 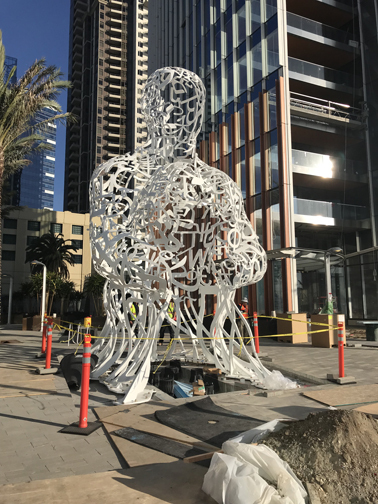 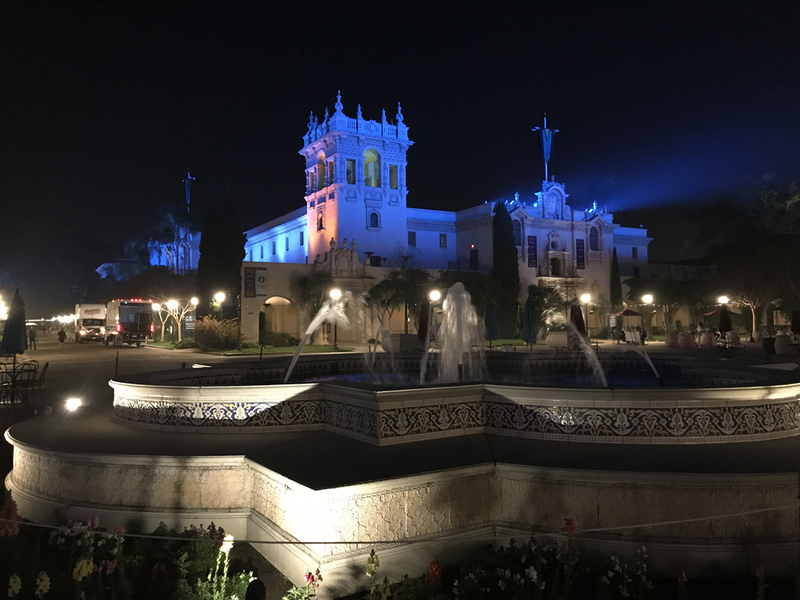 You are currently browsing the The Martin's Blog blog archives for February, 2018.